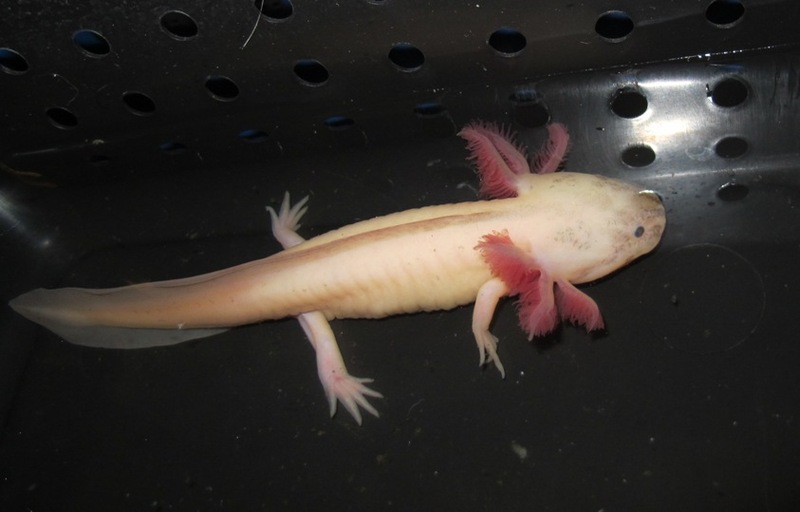 NOTE: This page is for individual axolotls where you get the exact one shown in the pictures. Due to time constraints, we don't always have anything available on this page. 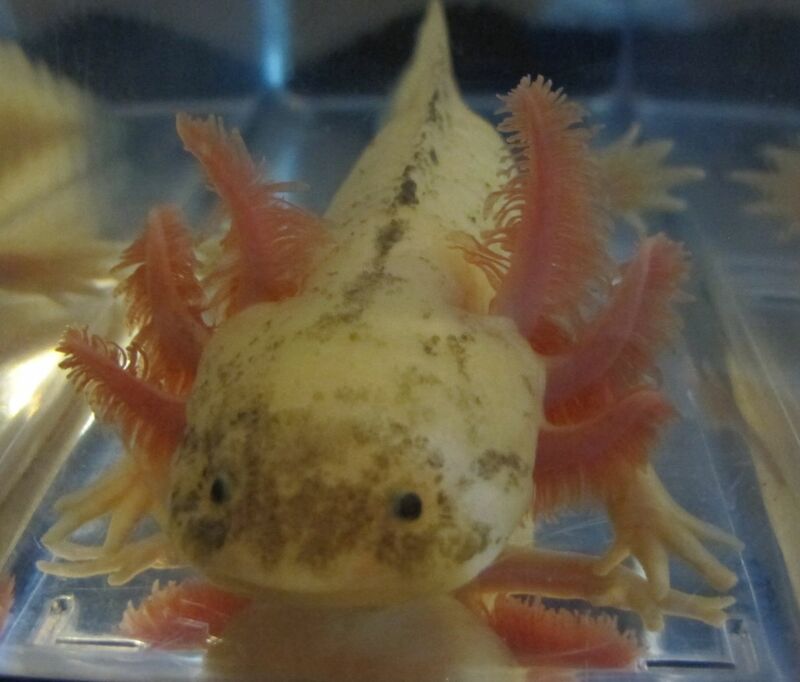 For regular-price axolotls, go to our "For Sale-Juveniles" page. 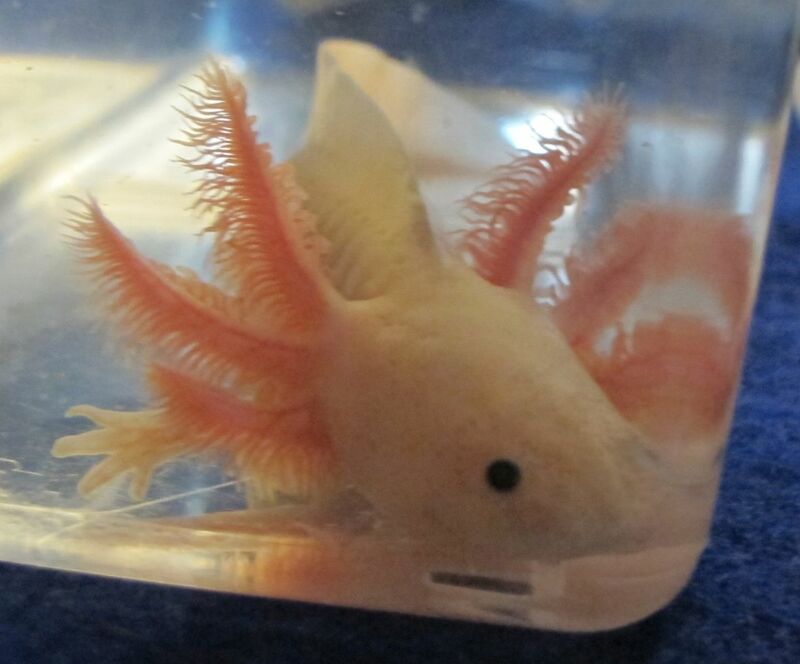 On that page, you pay for the size and color you want (from what's available) and we select the specimen to ship (no individual photos). Prices do not include shipping. 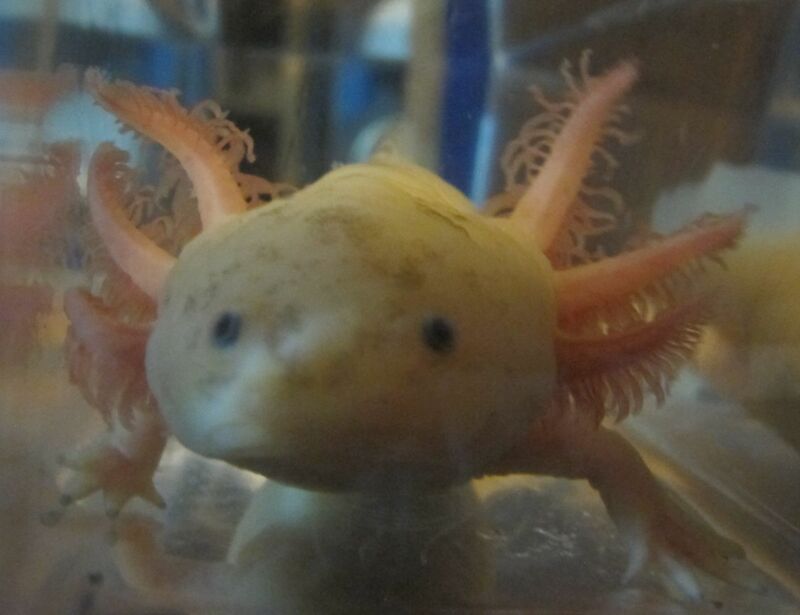 Shipping is $20 flat rate for any number of axolotls via USPS Priority Mail (usually 1-3 days). Shipping includes live-arrival guarantee and tracking number. Someone will be required to sign for the package. If no one will be available, let us know before we ship and we'll have your package held at your local post office for you to pick up. 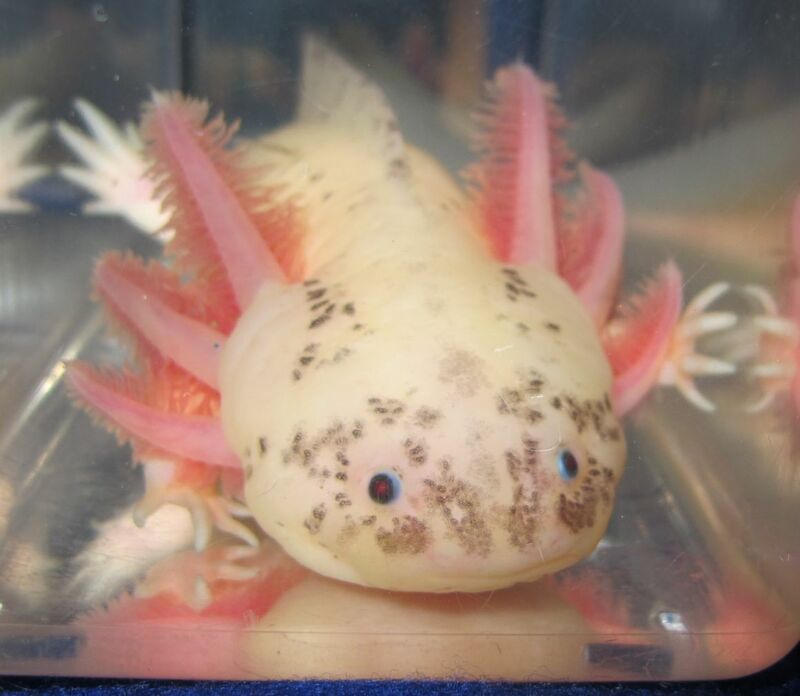 Note: all axolotls below this line have been sold. 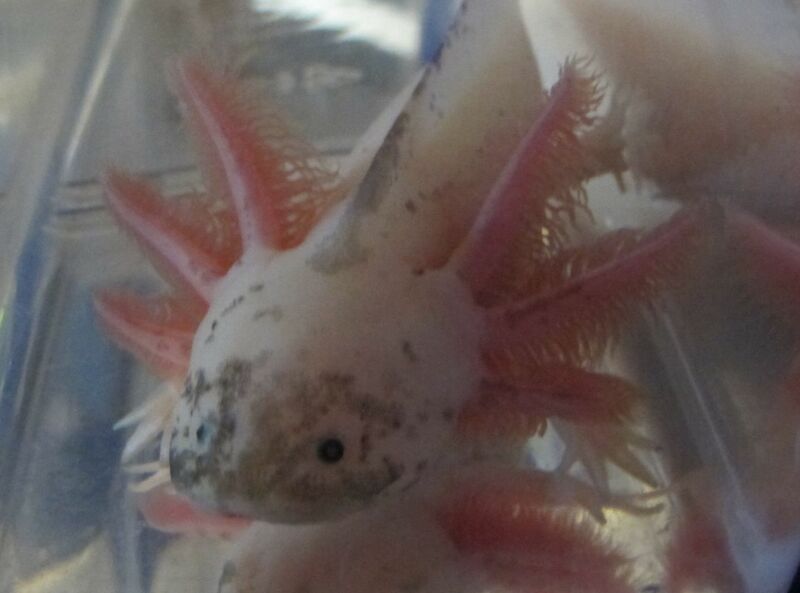 This leucistic has light speckling and nice gills. It's 7-8 inches long. It's too young to know what gender it is. A nice little split mosaic, approximately 4.5 inches long. Strange and interesting. It's too young to know what gender it is. A nice little split mosaic, approximately 4 inches long. Black marbled with lighter patches. It's too young to know what gender it is. A dark mosaic. 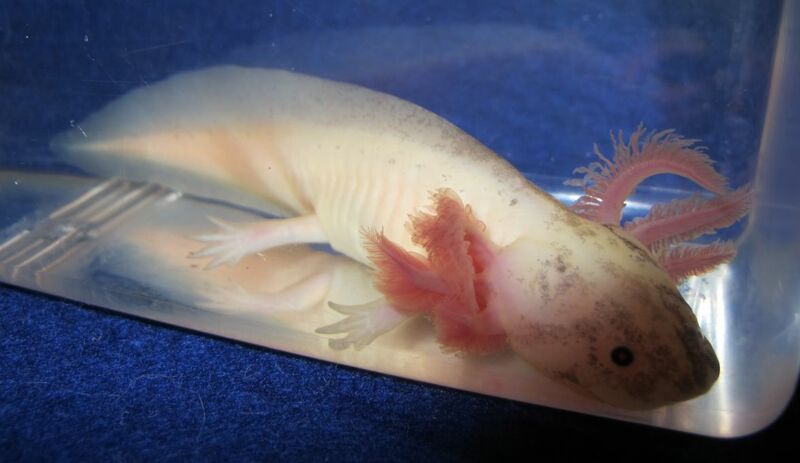 4.75 inches long. Black with lighter patches. It's too young to know what gender it is. A nice mosaic, 5.5 inches long. Gotta love the yellow spots mixed in with his marbling. It's too young to know what gender it is. 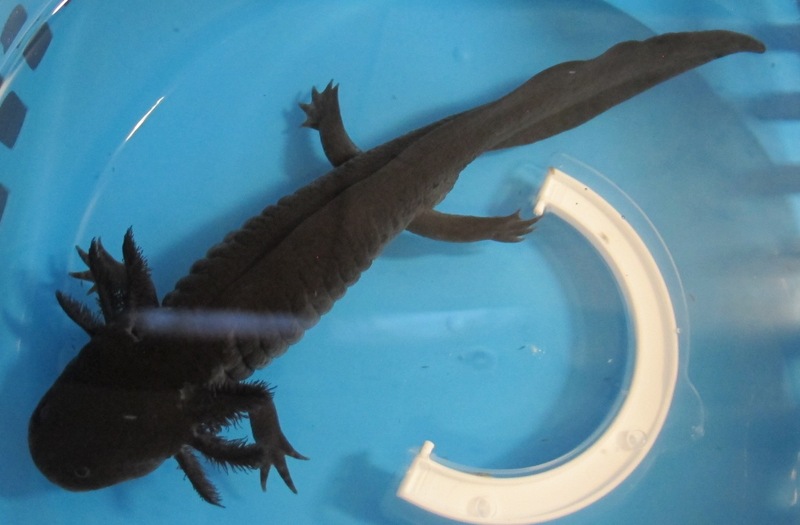 This black melanoid is 5-6 inches long. 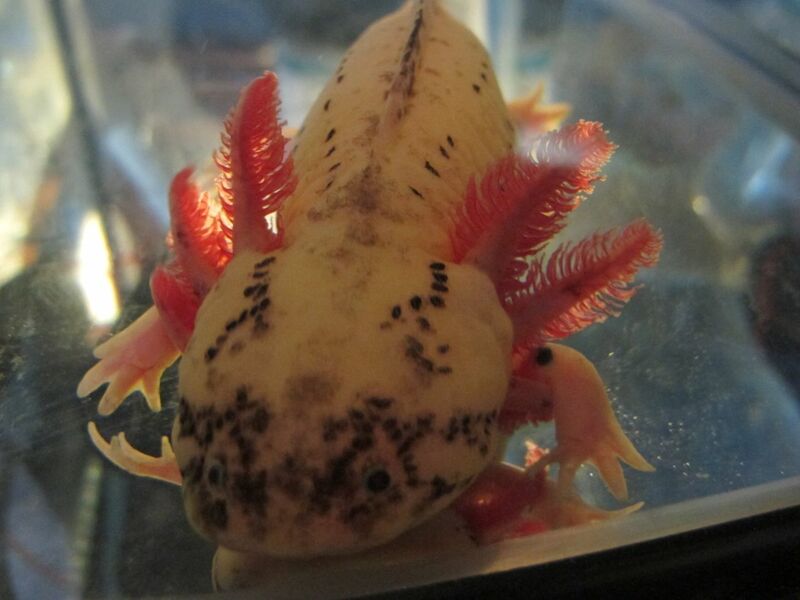 It has an interesting coloring/texture over its whole body. See the third picture above using a flash to show the coloring better. It's too young to know what gender it is. 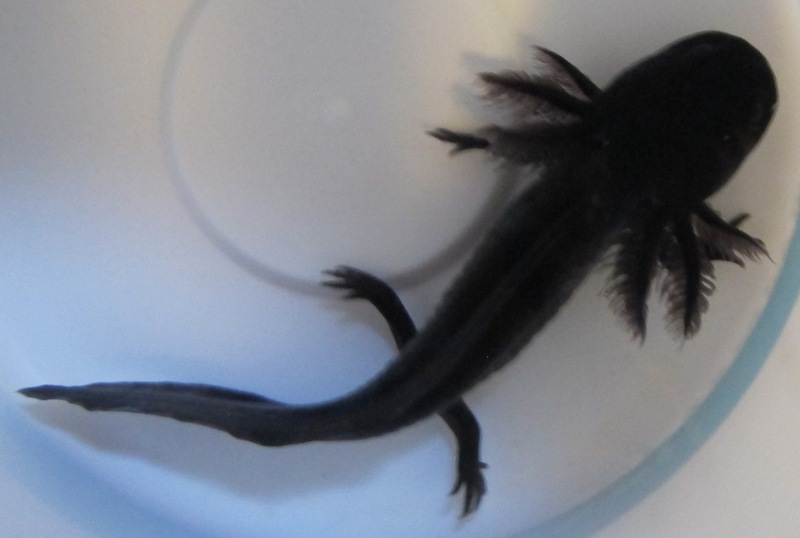 This is a 6-inch black melanoid. It has some mottling on it that's mostly noticeable from the sides. 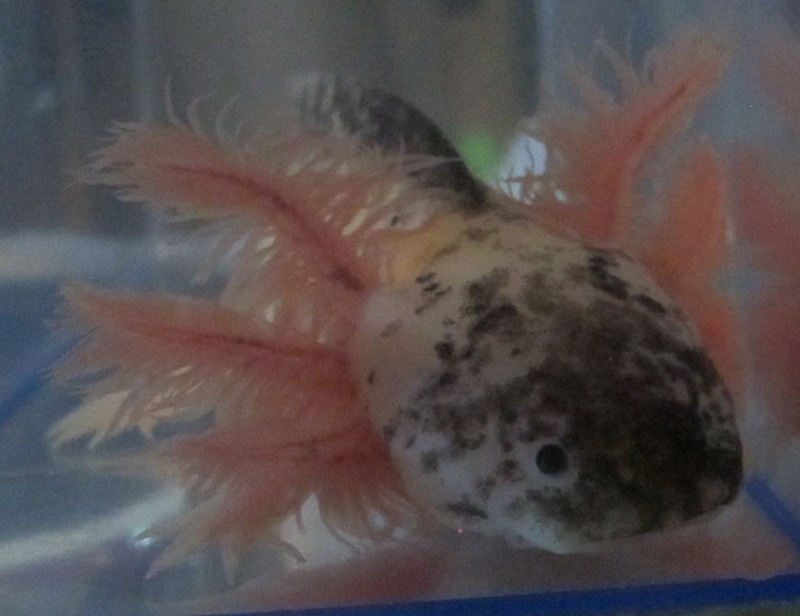 It will be interesting to see what this mottling looks like as the axolotl gets bigger. It's too young to know what gender it is. 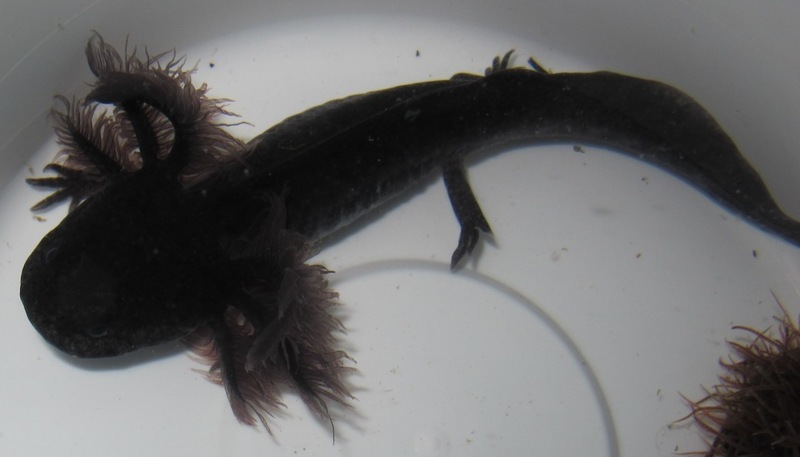 This black melanoid is 5-6 inches long. 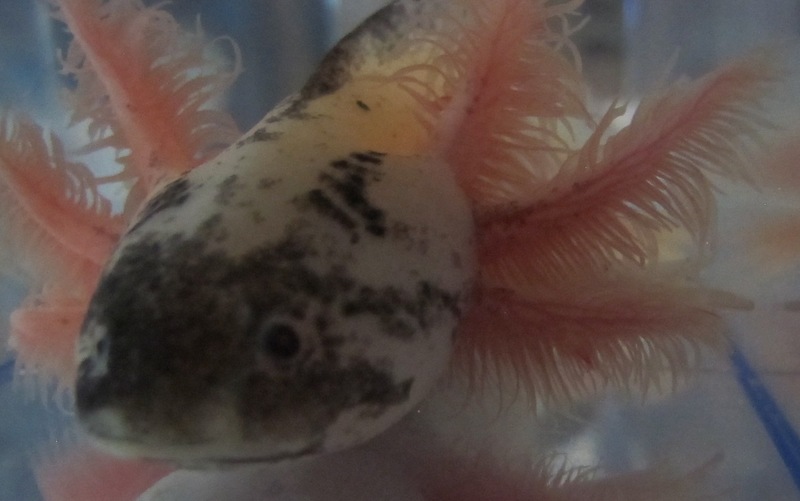 It has some patches of whitish-grayish coloring on its sides that are very interesting. That coloring has been there since it hatched. Not sure if it qualifies as a mosaic, but it's definitely an oddball. It's too young to know what gender it is. 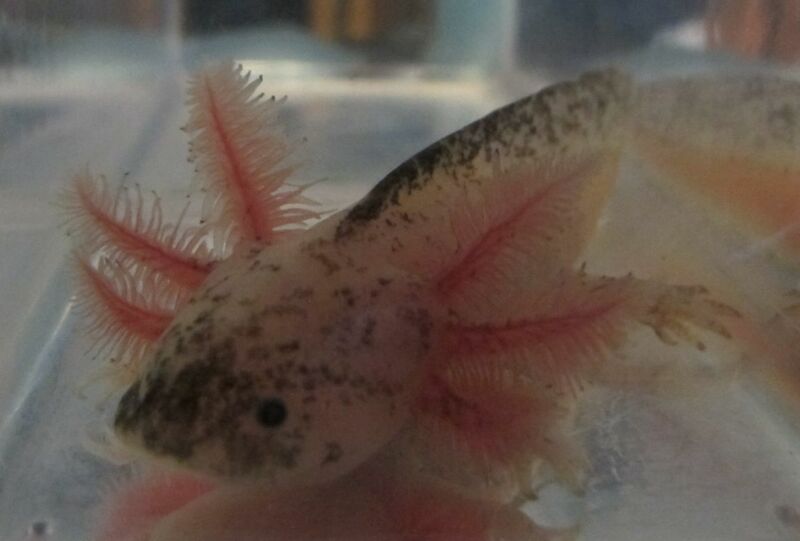 This split-mosaic axolotl is one of a kind! 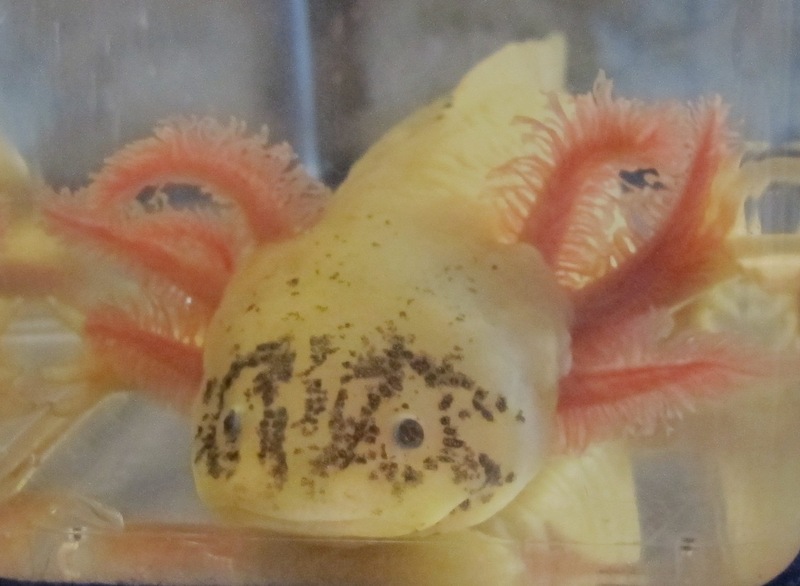 (They're sometimes called chimera.) 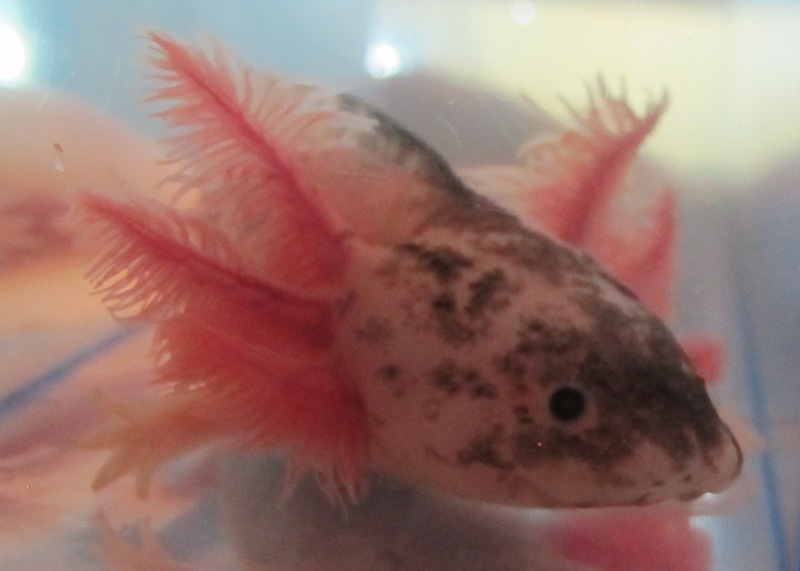 It's approximately four months old, approximately 5-1/2 inches long. It's too young to know what gender it is. As always, keep over black substrate to minimize fading of the speckles. This one was auctioned on our Facebook page. Auction ended on March 27, 2019. 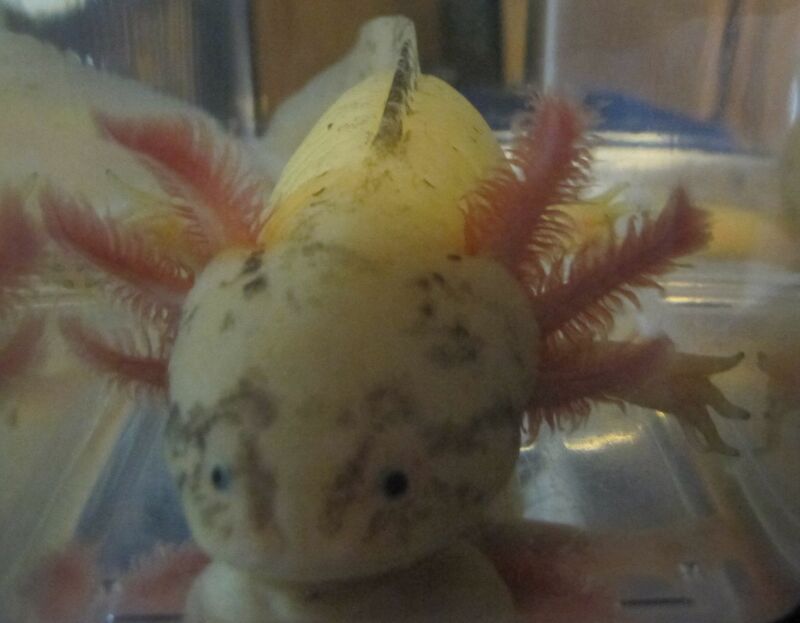 Click here to see a video clip of this axolotl. This listing is for one of the speckled leucistics shown above. You will get one of these, but you won't know which one (we choose for you)! 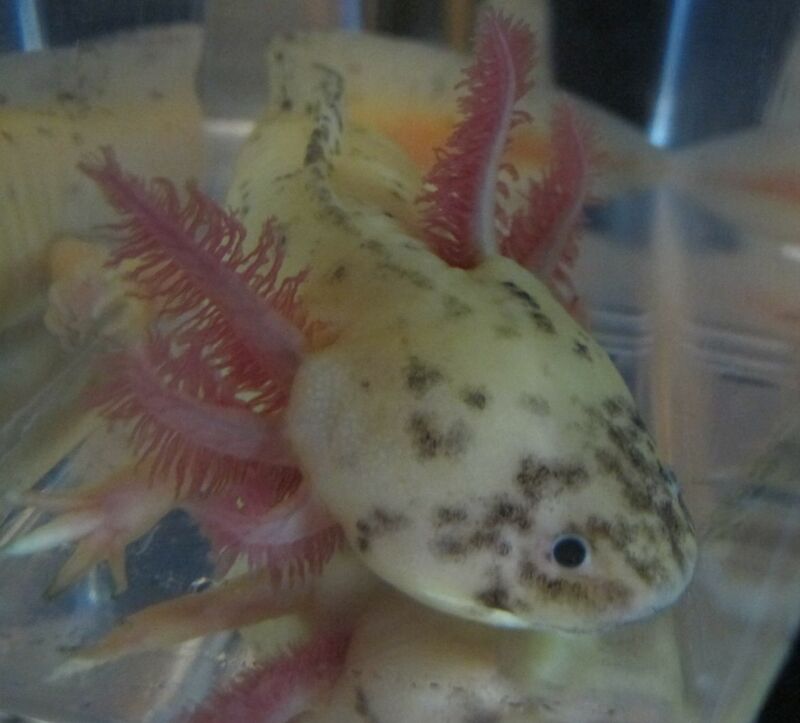 They're approximately 5 inches long, too young to know gender. As always, keep over black substrate to minimize fading of the speckles. 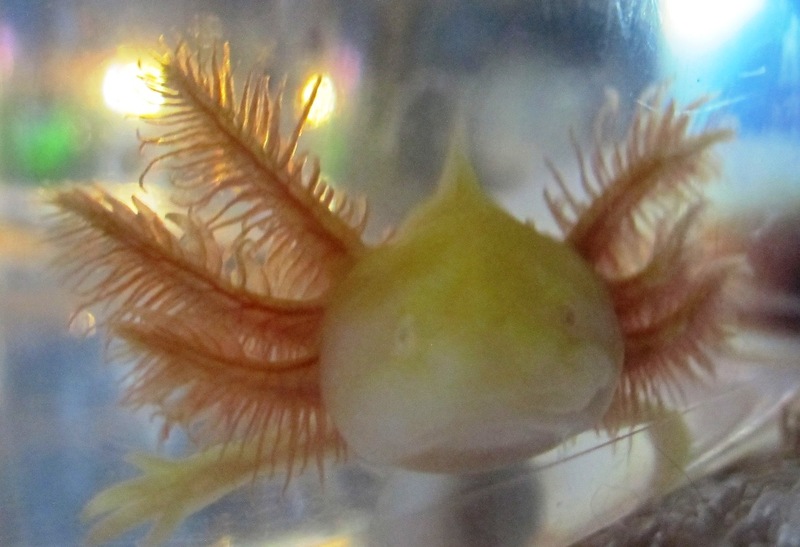 This is a gold albino. 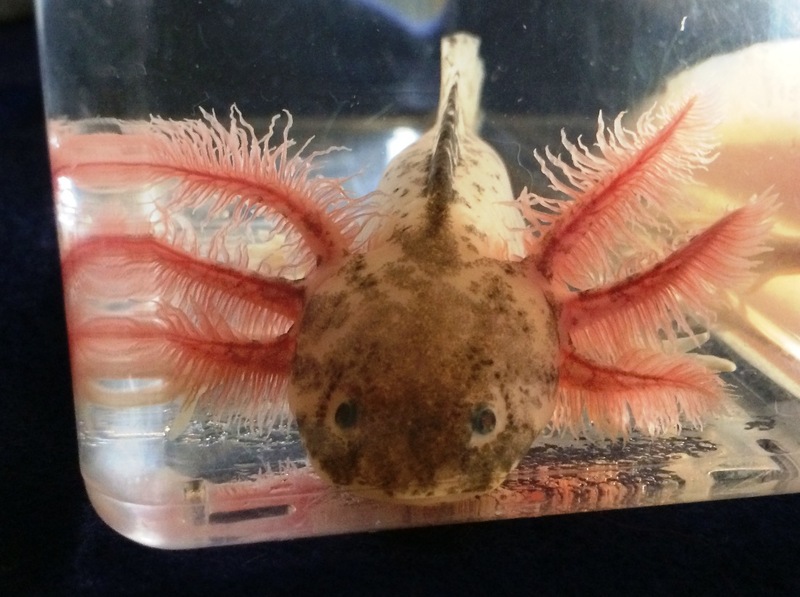 It has extra long gills. 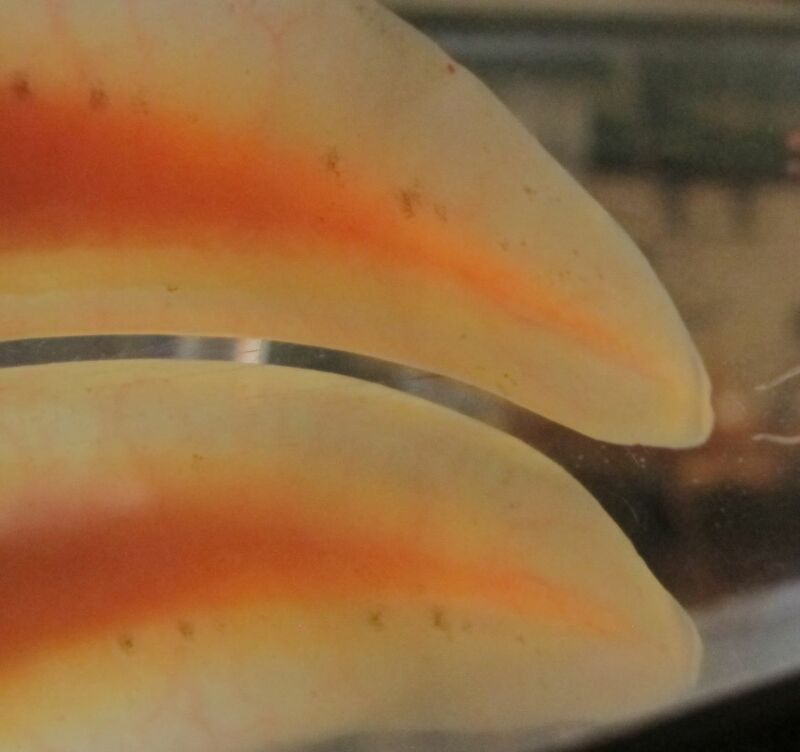 There are a few small notches in the tail fin (see pictures). It's 5-6 inches long. It's too young to know gender. It's too young to know gender. 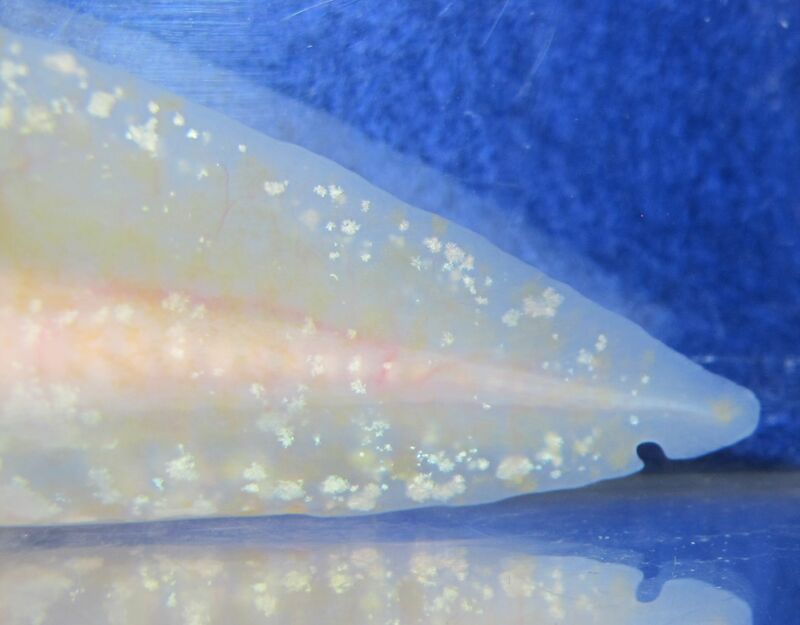 As always, keep over black substrate to minimize the speckles fading. 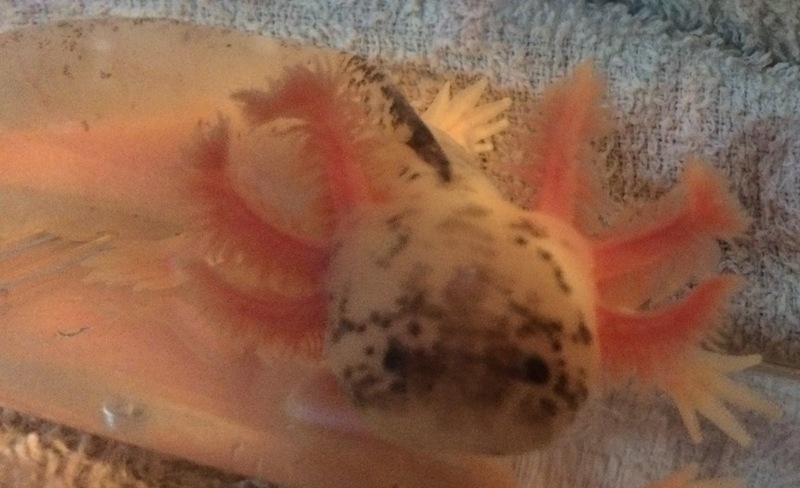 This is a 5-6" speckled leucistic. 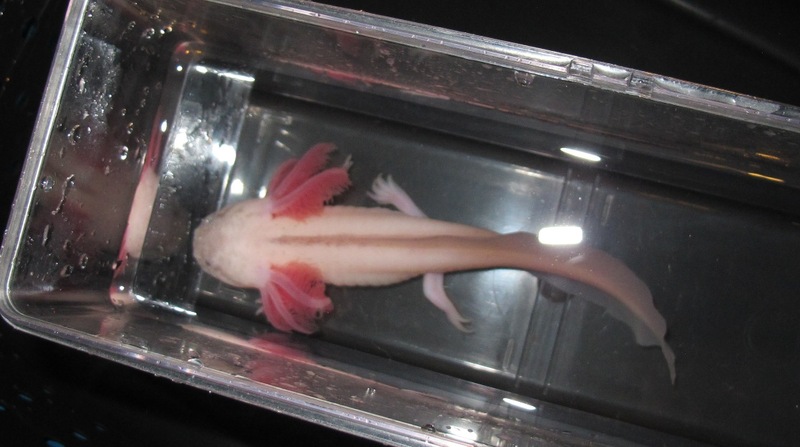 Unfortunately, it has some notches in its tail fin (see pictures). 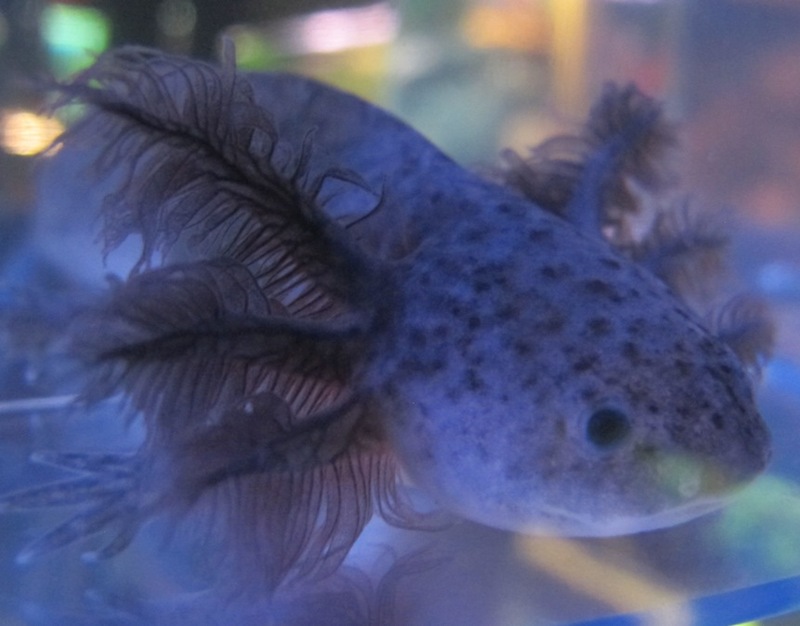 But what's super cool about it is how much speckling it has on its back legs (see pictures). No guarantee it will stay that way as it grows up, but if it does, it's going to be really unusual! 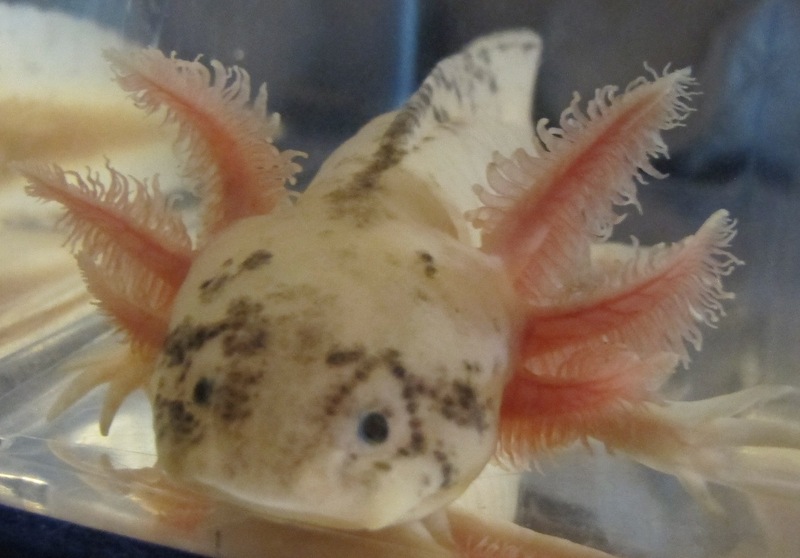 This is a speckled leucistic that's 4-5 inches long. It's too young to know gender. As always, keep over black substrate to minimize fading of the speckles. 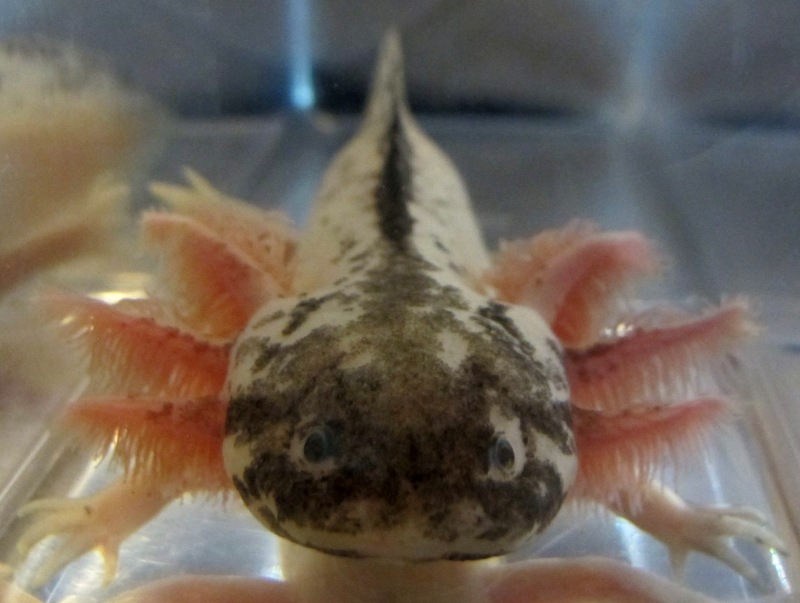 This is a speckled leucistic that's 4-5 inches long. 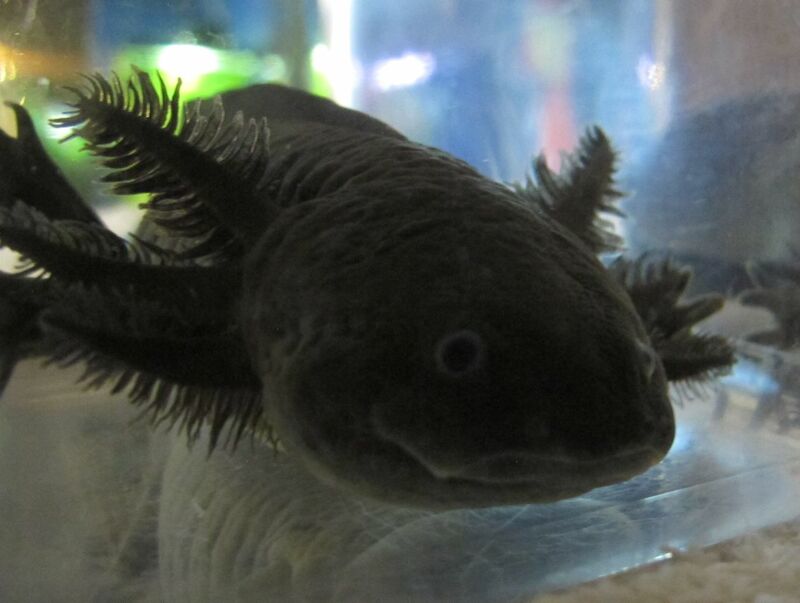 Nice gills and a dark face. It has several small notches in the tail fin. It's too young to know gender. As always, keep over black substrate to minimize fading of the speckles. 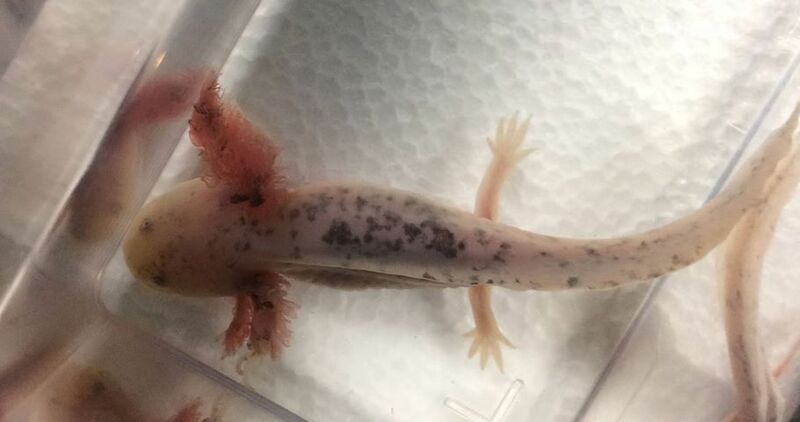 This is a speckled leucistic that's 5-6 inches long. 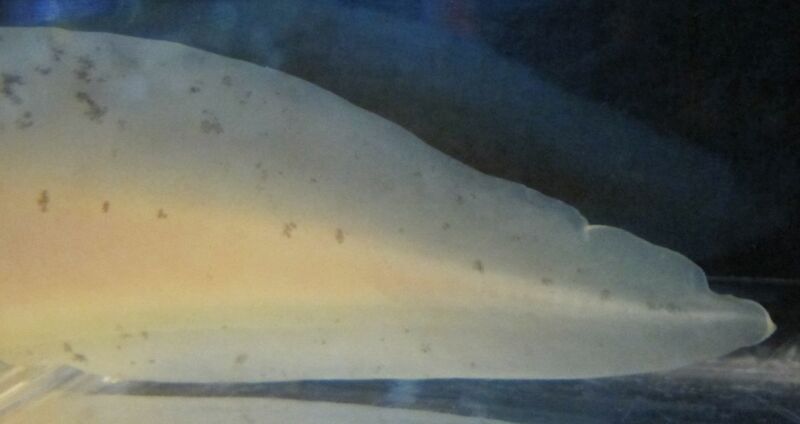 It has several small notches in the tail fin. It's too young to know gender. As always, keep over black substrate to minimize fading of the speckles. 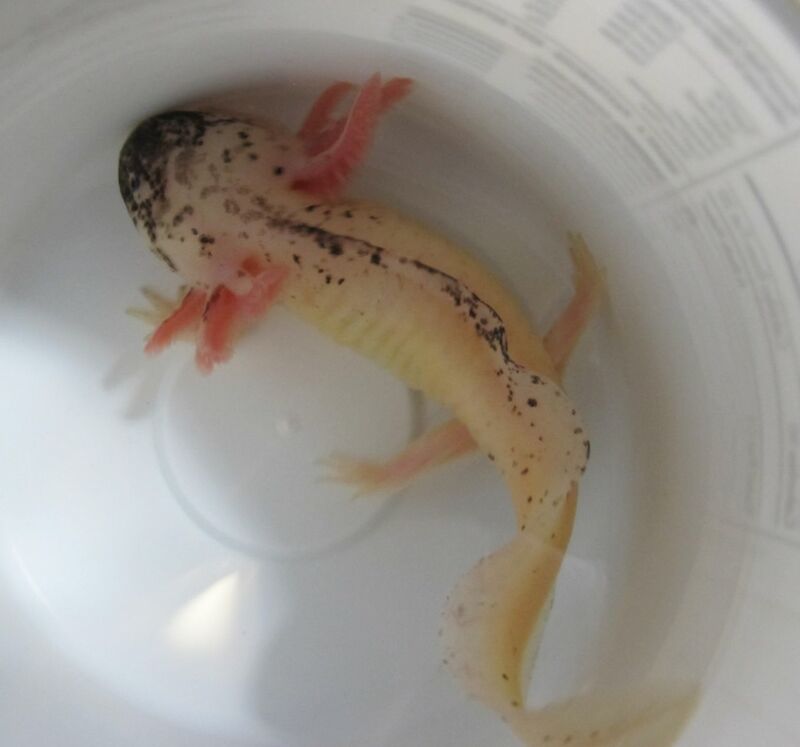 This is a speckled leucistic that's 5-6 inches long. It has a small notch in the top fin. It's too young to know gender. As always, keep over black substrate to minimize fading of the speckles. 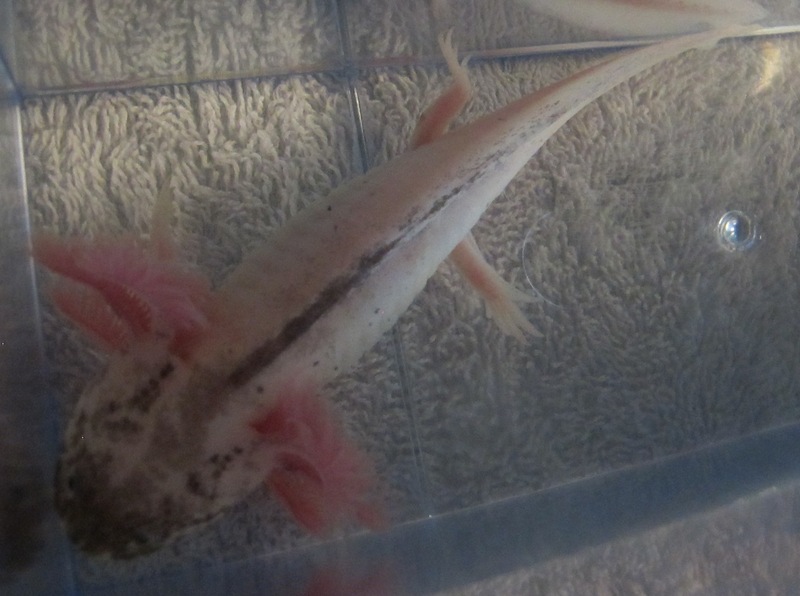 This is a speckled leucistic that's 5-6 inches long. 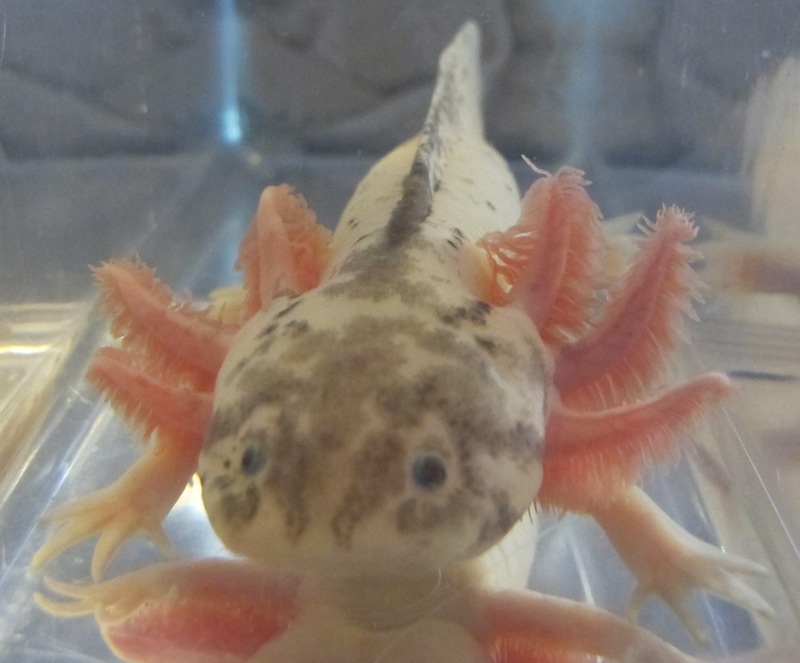 Nice gills and some speckling on its rear legs. It's too young to know gender. As always, keep over black substrate to minimize fading of the speckles. 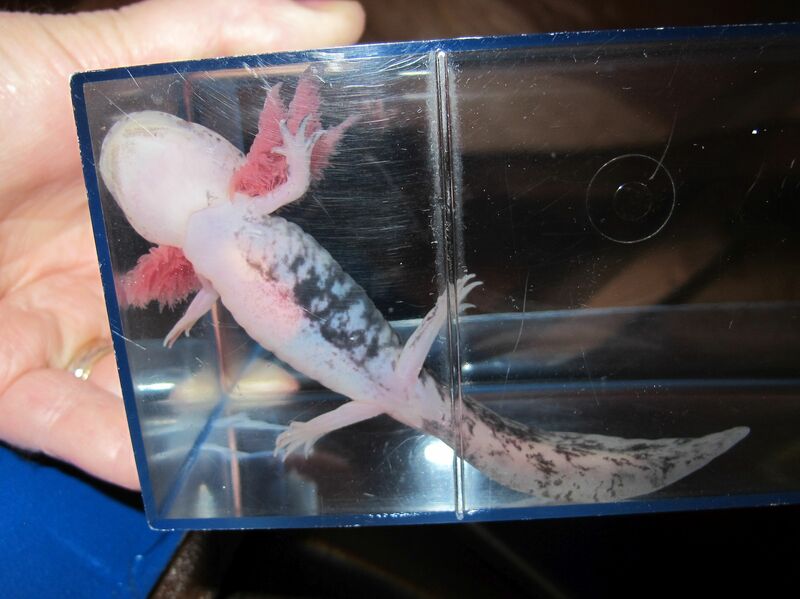 This listing is for one of the speckled leucistics shown above. You will get one of these, but you won't know which one (we choose for you)! 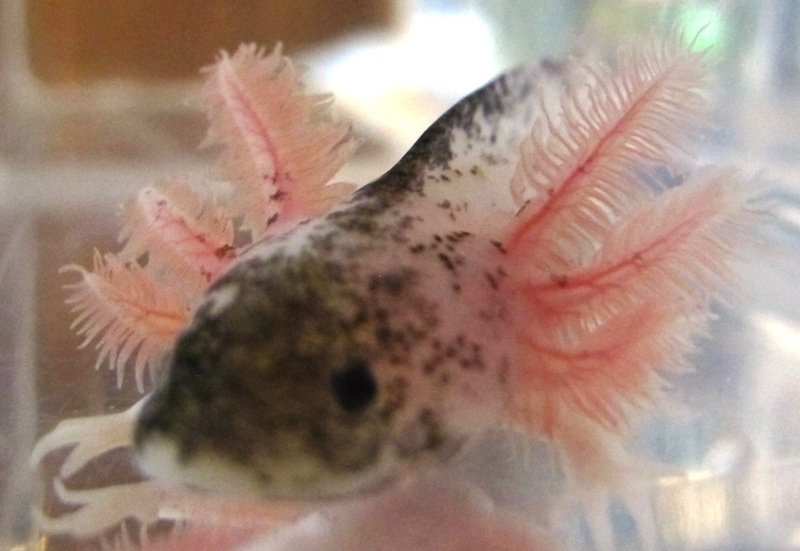 They're 4-5 inches long, too young to know gender. As always, keep over black substrate to minimize fading of the speckles. 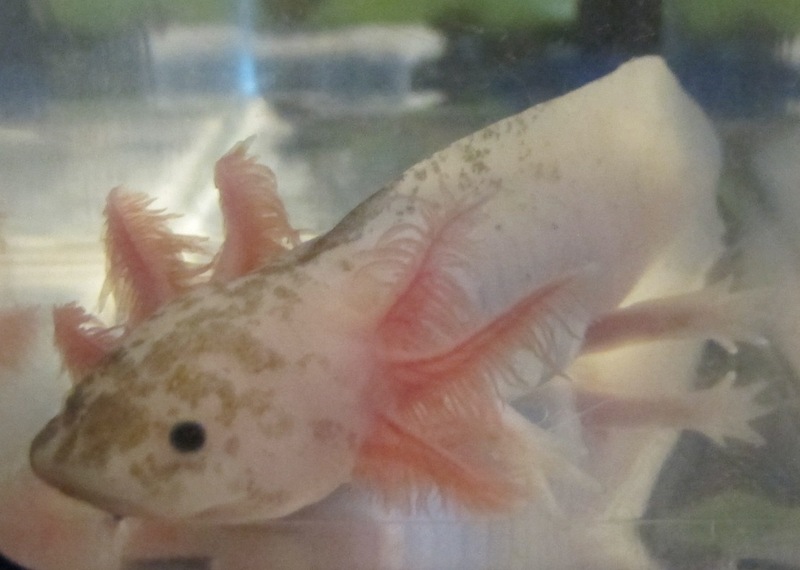 This leucistic is approximately 9 inches long. Has some grayish speckling. Gender is not guaranteed, but it looks male. 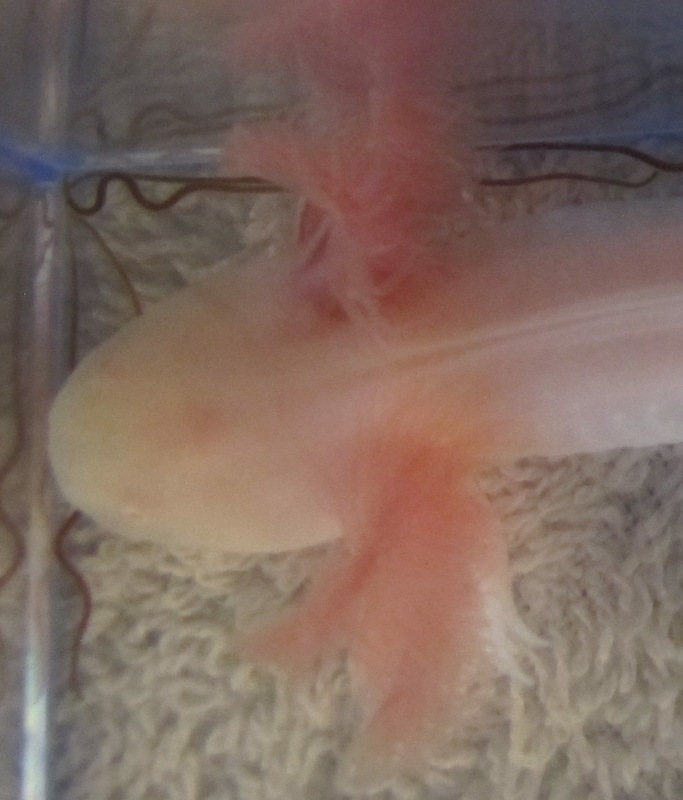 This white albino axolotl is 8-9 inches long. Looks male. 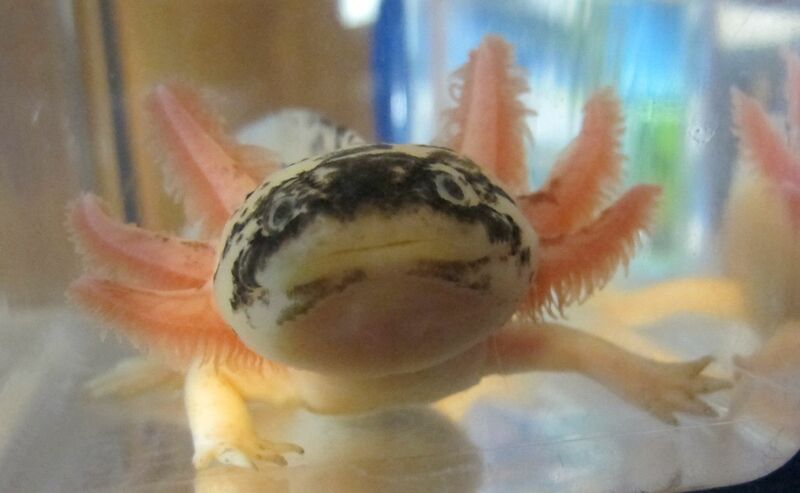 Nice gills. 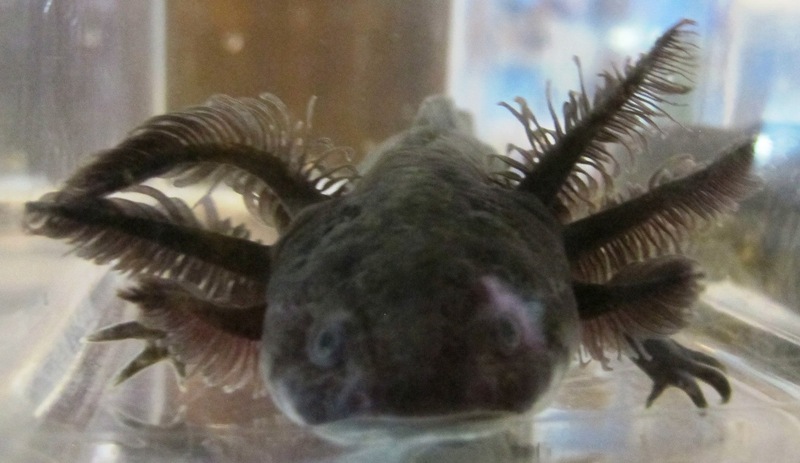 Price reduced because he has a "dip" in his top fin (see picture). 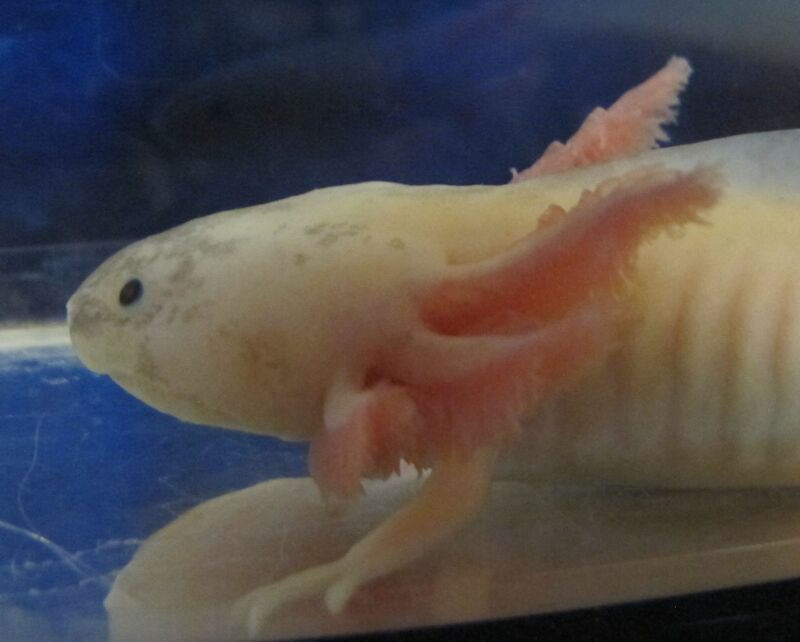 This axolotl is approximately 8.5 inches long. Too young to be sure, but possibly male. 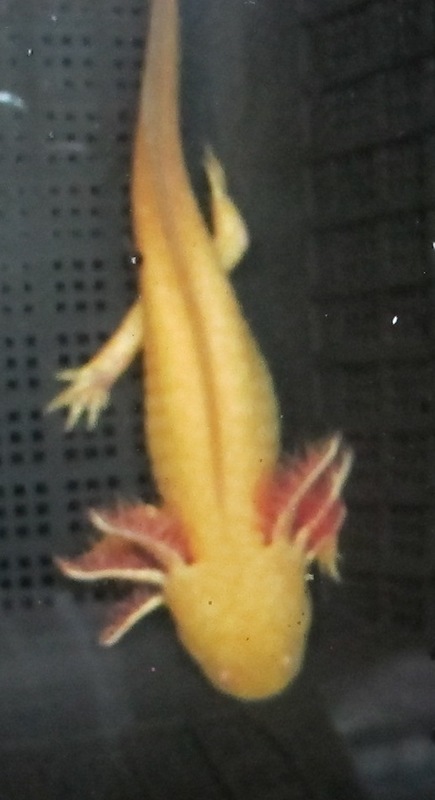 He has some lighter pigment markings here and there on his body, especially one near the end of his tail (see closeup above). 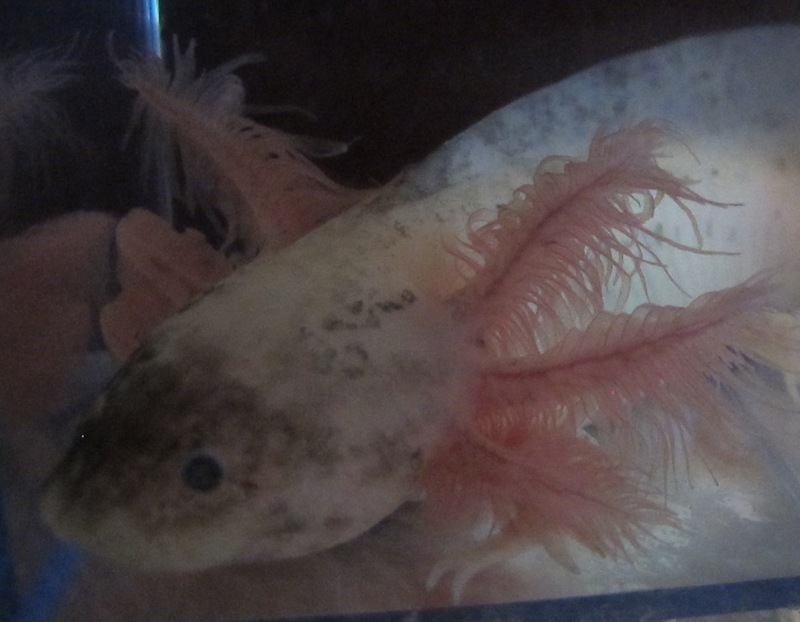 This leucistic is 8-9 inches long. Gender is not guaranteed, but it looks female. 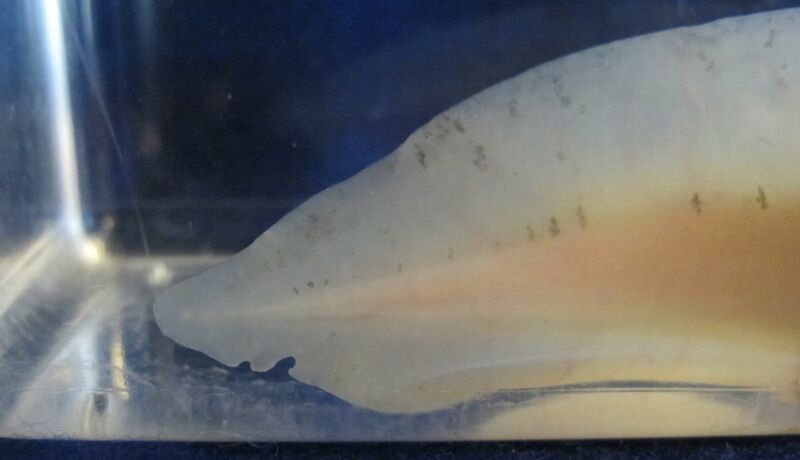 Price reduced because one gill is shorter than the others (uppermost gill on right side). 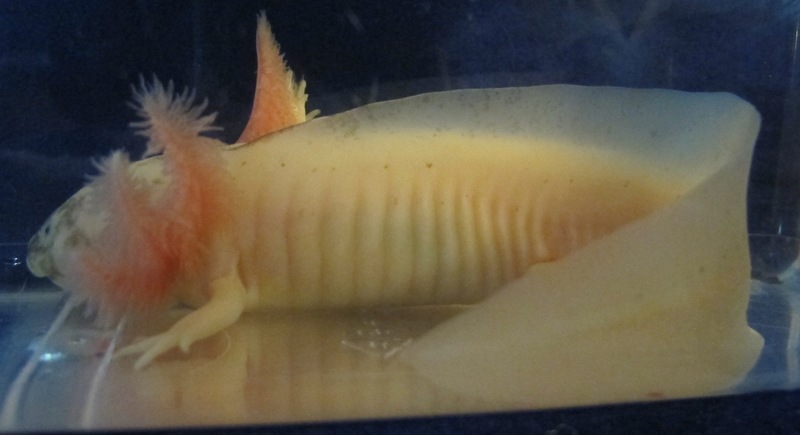 This axolotl is 8-9 inches long. 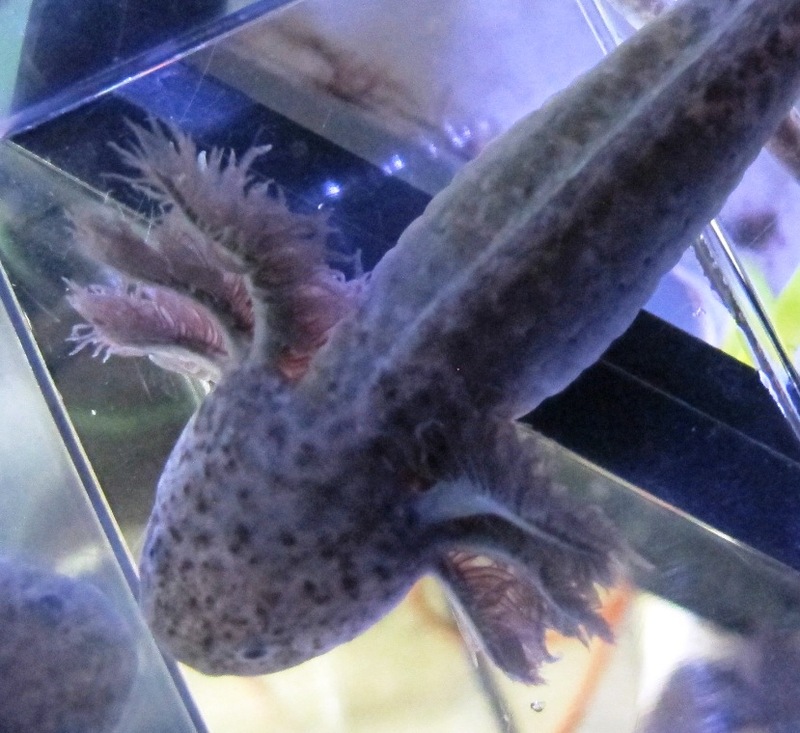 Light speckling and nice gills. 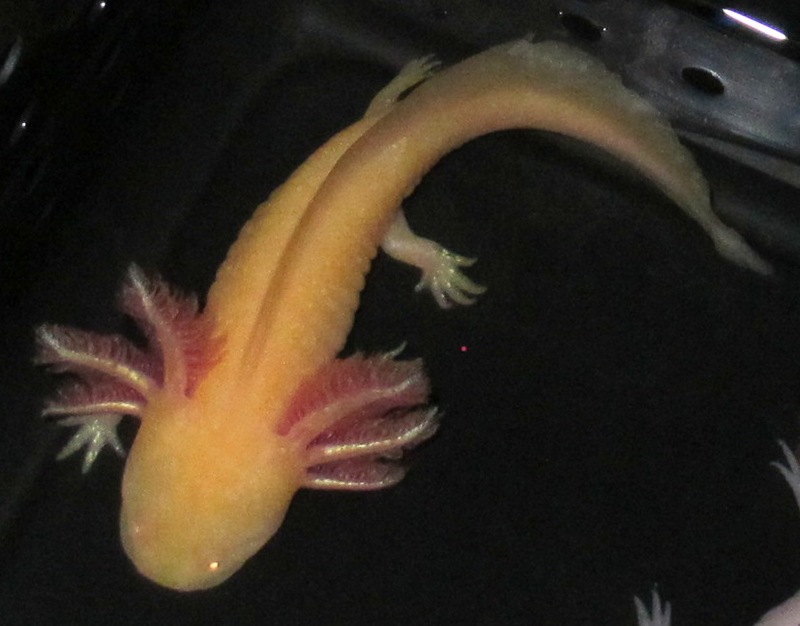 Full disclosure says there's a tiny sort of "pleat" at the very tip of the tail (see closeup). Looks male. 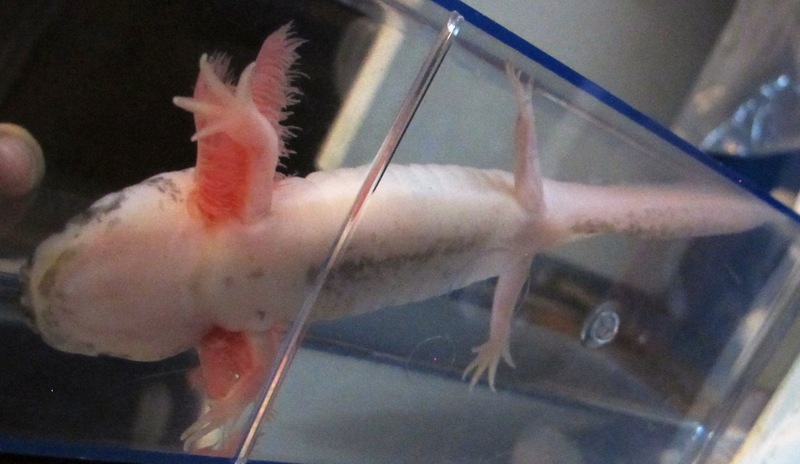 This axolotl is 8-9 inches long. 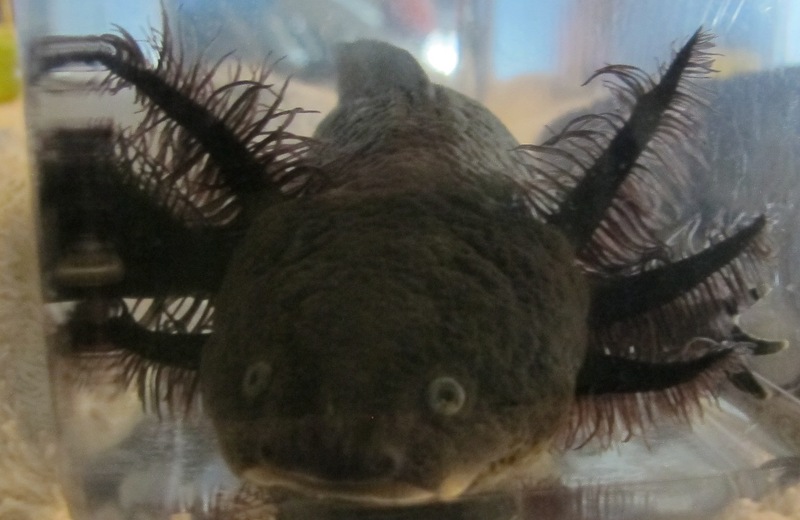 Nice dark face and beautiful gills, with some dots of color down his body. Looks male. 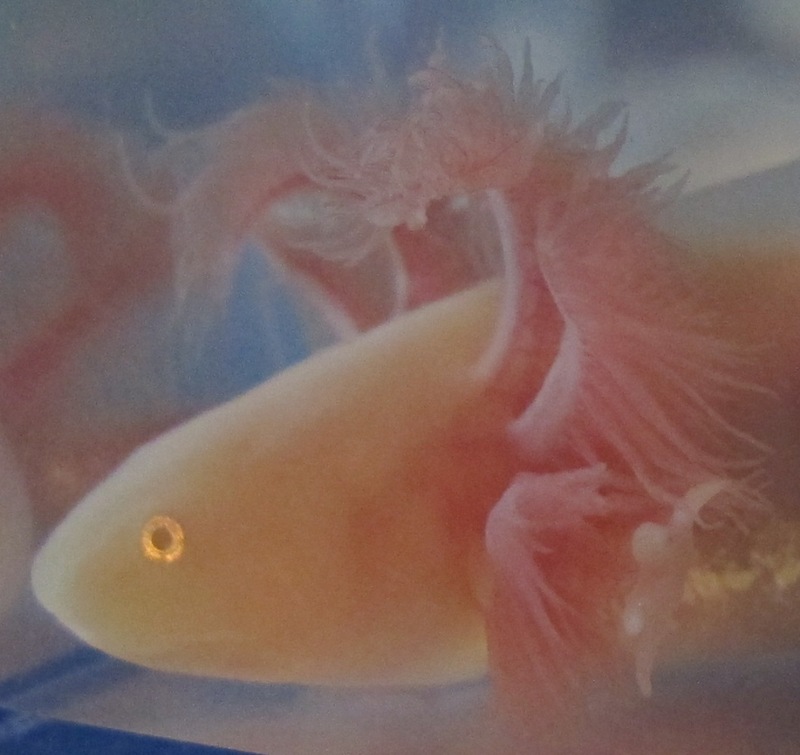 He also has a very tiny notch in the top of his tail fin. 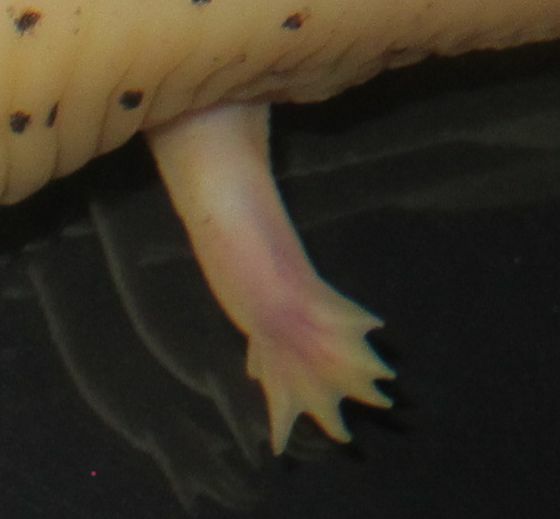 But the really odd thing about him is that not only are the toes on his rear feet shorter than normal, but he has an extra toe on his left rear foot (see picture above). Purists won't like this, but those of us who like the oddballs will think it's cool! 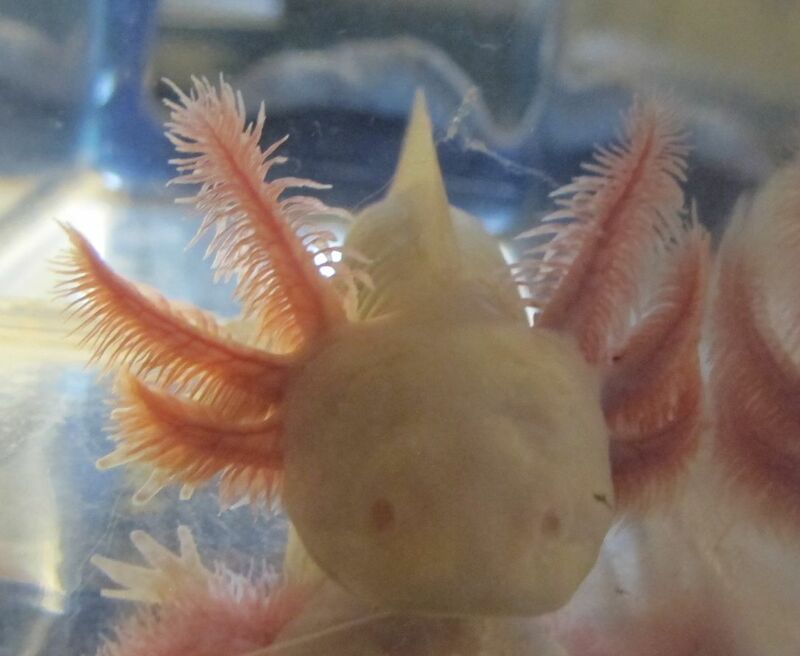 This axolotl is 8-9 inches long. Slightly yellowish tint. Looks male. Wouldn't hold still, so most of his pictures didn't turn out well. 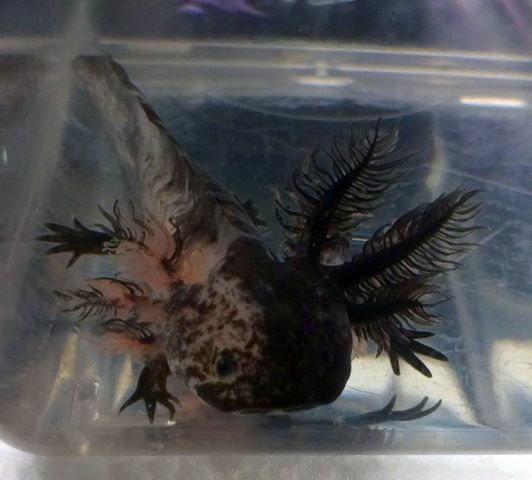 This axolotl is a dark wild type. 8.5 inches long. Too young to be sure, but looks female so far. Price reduced because she has a pretty good sized chunk missing from her tail (see picture), plus possibly the tiny tip of the tail is missing (she wouldn't hold still, so I couldn't get a better look). Other than that, healthy and a good eater. 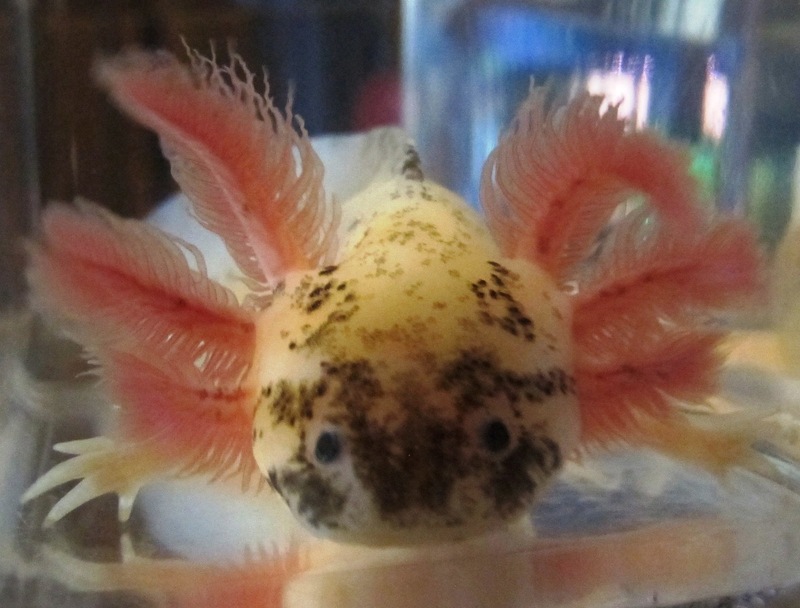 Nice gills. 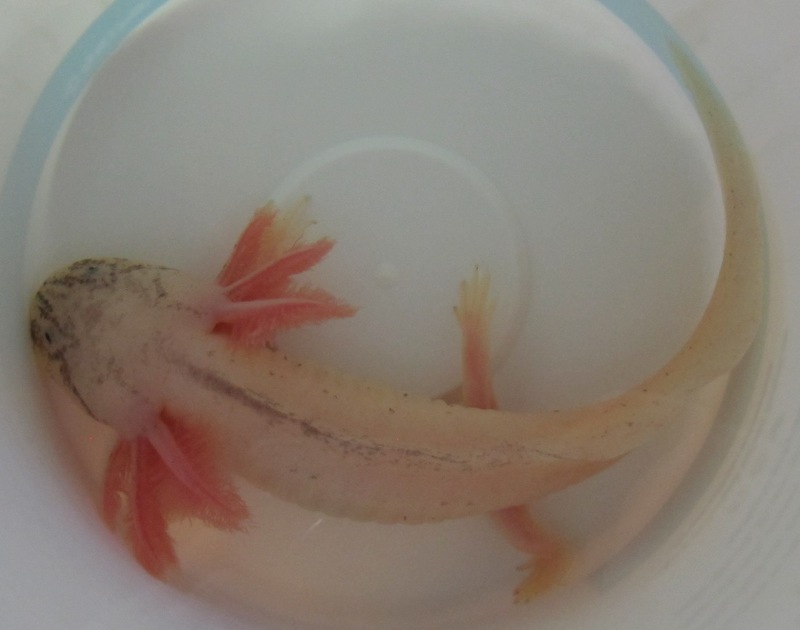 This one is 8-9 inches long, with a little bit of light speckling. 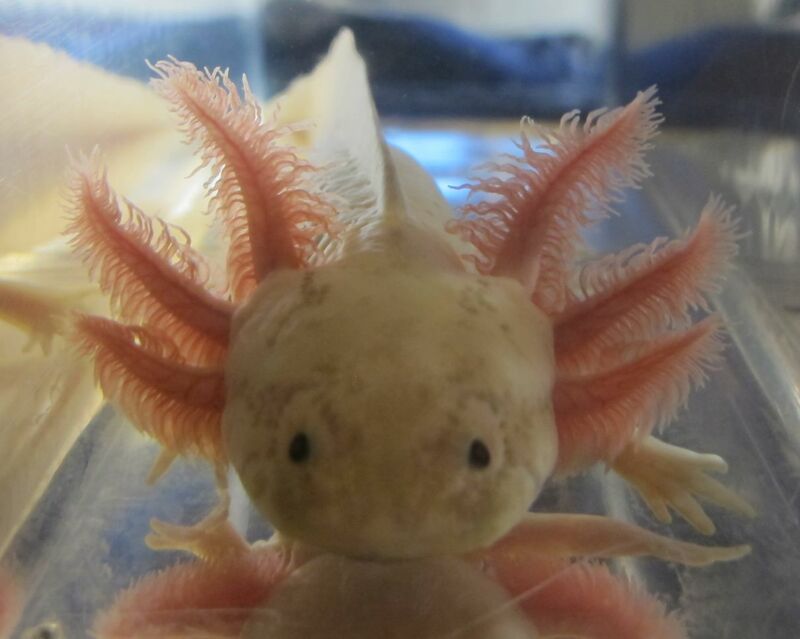 Nice gills. Looks male, but gender is not guaranteed. As always, keep over black substrate to minimize fading. This one is 8-9 inches long. Some speckling on the face and top fin. 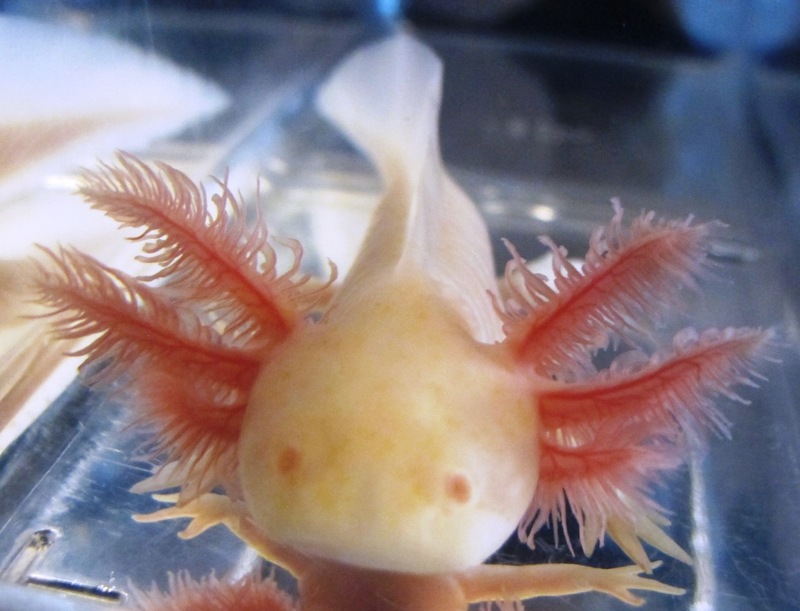 Nice gills. Possibly female, but gender is not guaranteed. As always, keep over black substrate to minimize fading. 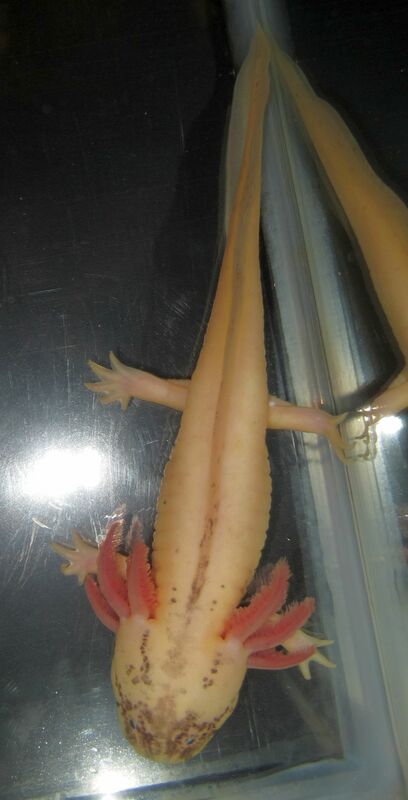 This one is 8-9 inches long. 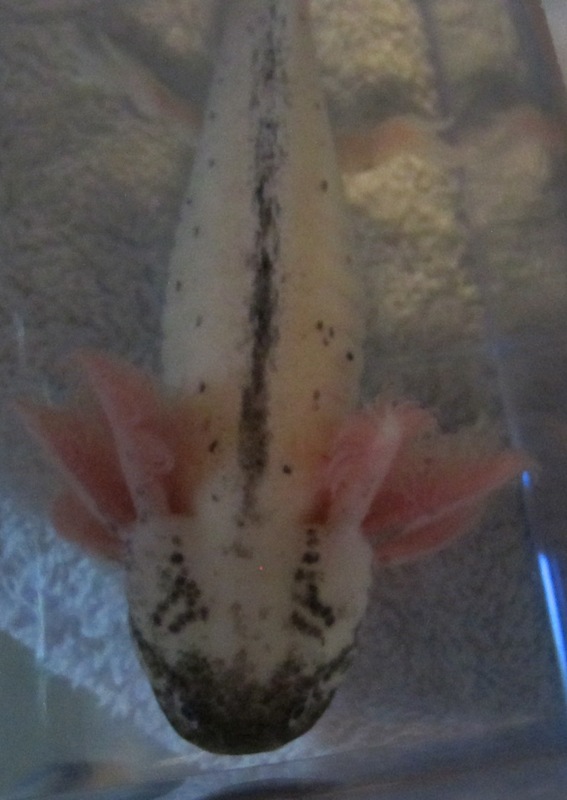 It has nice markings on the face and some speckling and light flecks all down the back and sides. Unfortunately, it has a tear in its tail. What's really cool about this one is it has a large black spot on its left front elbow (see picture). Like a black moon tattoo, lol. Possibly female, but gender is not guaranteed. As always, keep over black substrate to minimize fading. This one is 8-9 inches long. It has a nice dark face and some speckling down the back. Possibly female, but gender is not guaranteed. As always, keep over black substrate to minimize fading. 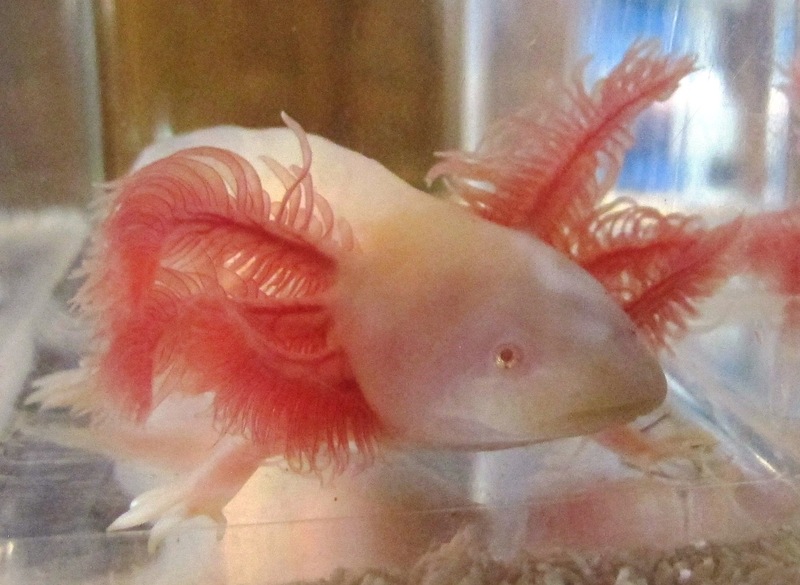 This albino is approximately 8 inches long. It's kind of a pale creamy color. 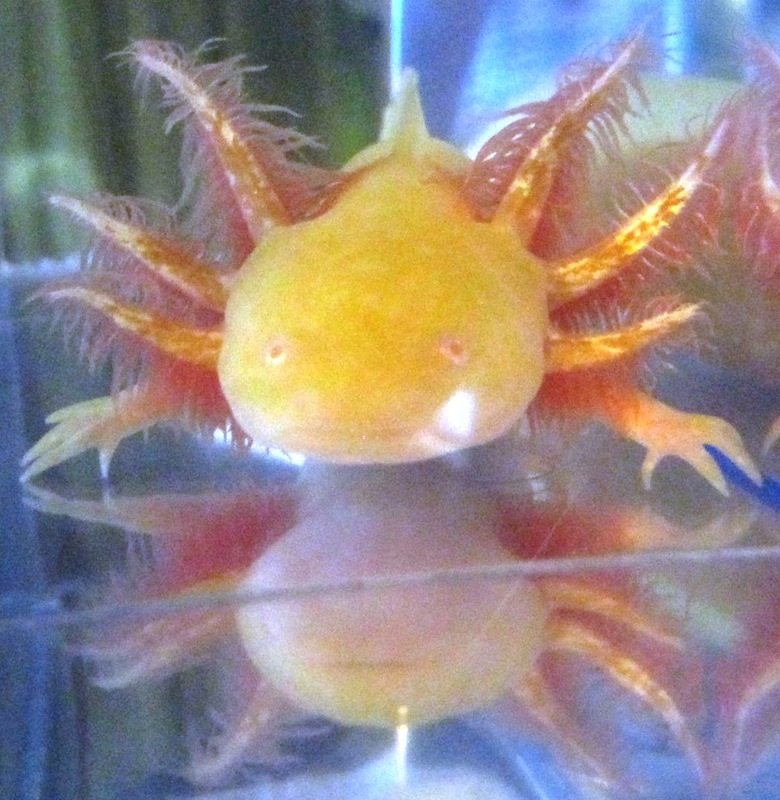 Long, beautiful gills. Gender unknown. This one is 8-9 inches long. Some speckling on the face and a little on the top fin. This one has a slightly yellow-ish tint to its color. Gender unknown. This one is approximately 9 inches long. Some speckling on the face and top fin, along with some small specks on the sides. This one has a slightly yellow-ish tint to its color. Gender is not guaranteed, but it looks like it might turn out to be male. 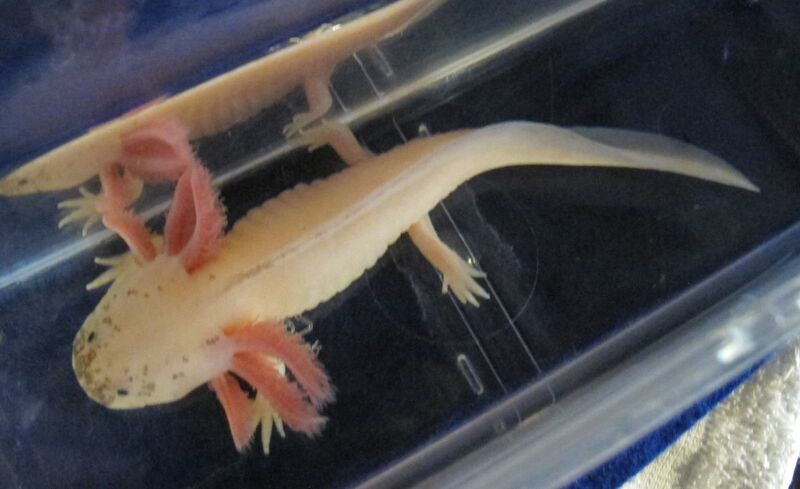 This albino is 8- 9 inches long. It's kind of a pale creamy color. Not quite white and not quite yellow. 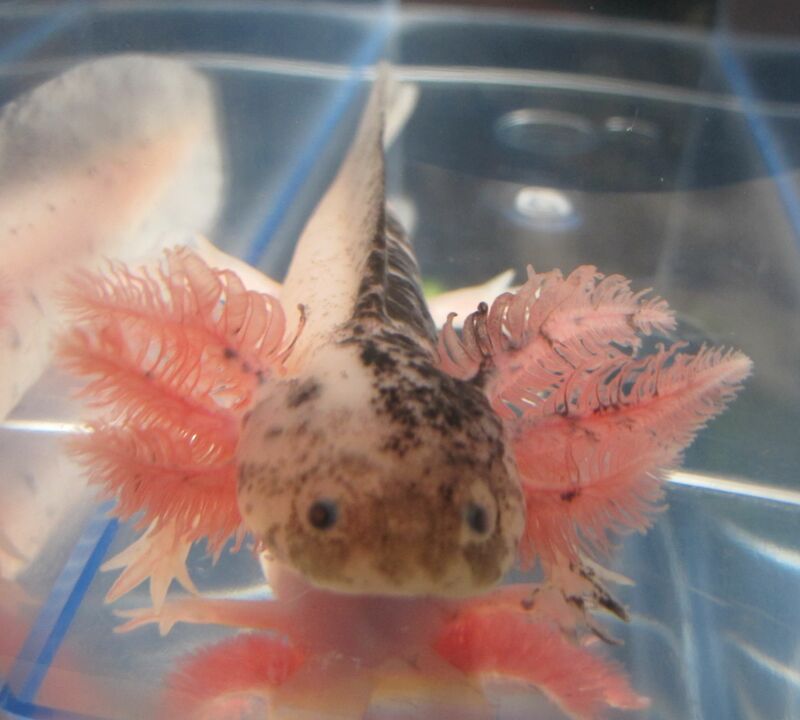 Gorgeous gills! Looks pretty hefty, but gender is unknown. 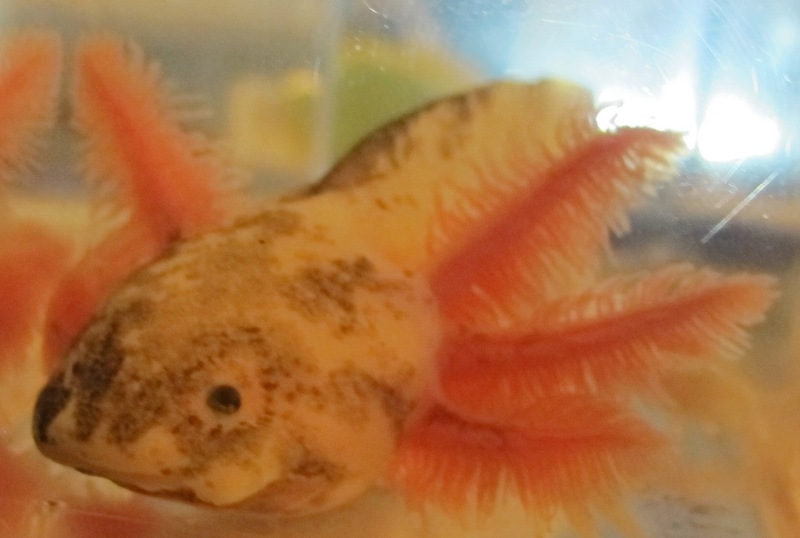 This beefy-looking axolotl is 9+ inches long. It has some nice speckling on the face and down the top fin. Gender is unknown, but if it's not female, then it's a male who really likes his chow. Look at that belly! 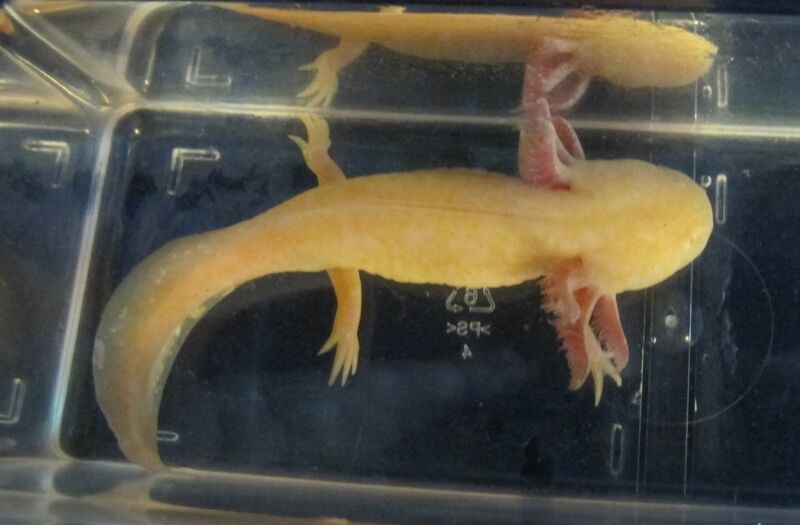 Its gills are extra long and beautiful. As always, keep over black substrate to minimize fading. 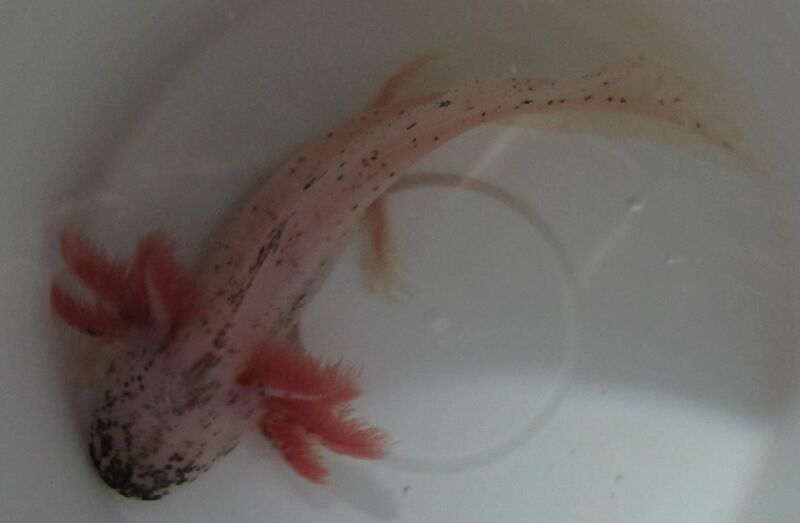 If you like fluffy gills, you might like this RLG speckled leucistic. 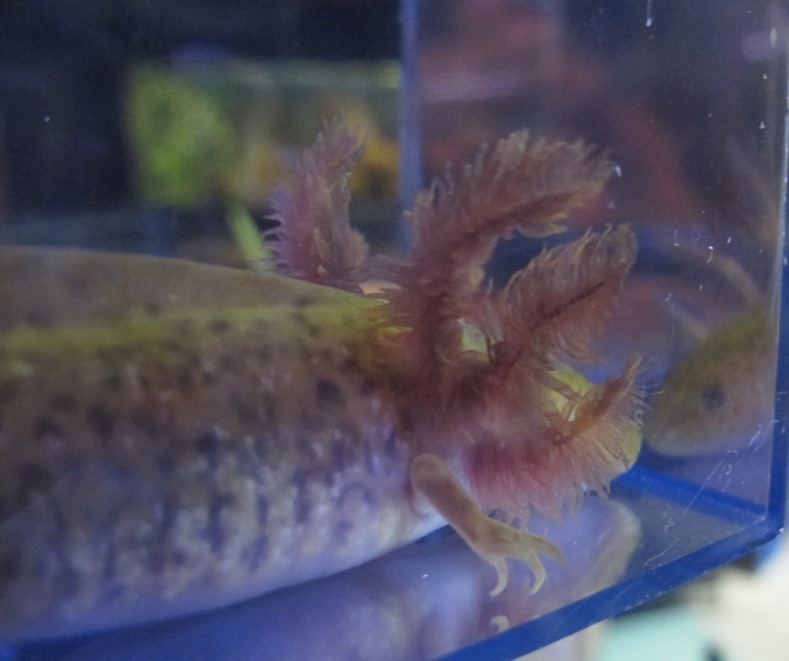 Its gills are extra long. 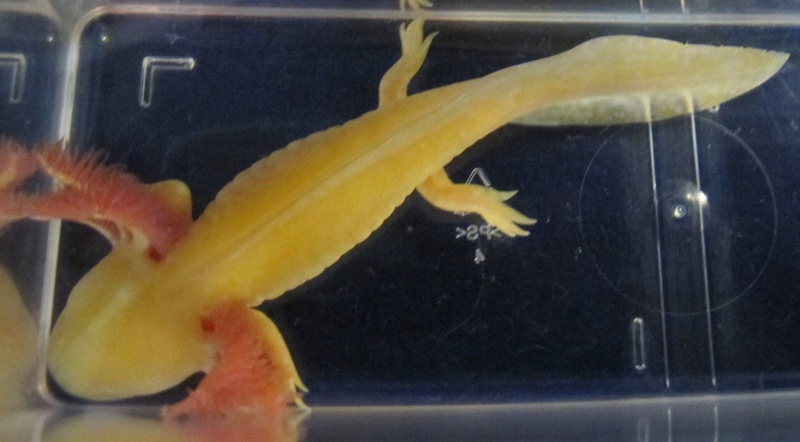 Length is 5-6 inches, gender is unknown. 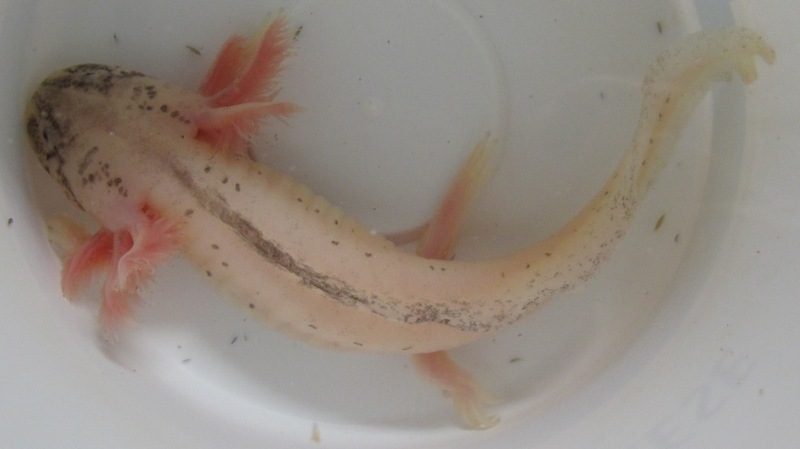 Here's a lightly-speckled leucistic, 7-8 inches long. Gender unknown. 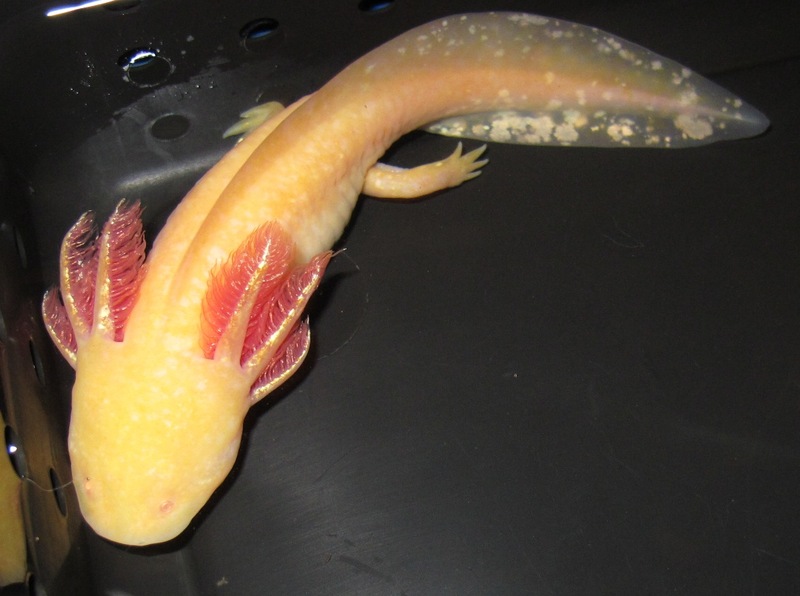 This is a very light-colored gold albino. When you zoom in with a camera or a magnifier, you can see there's a lot of white marbled in with the gold coloring. 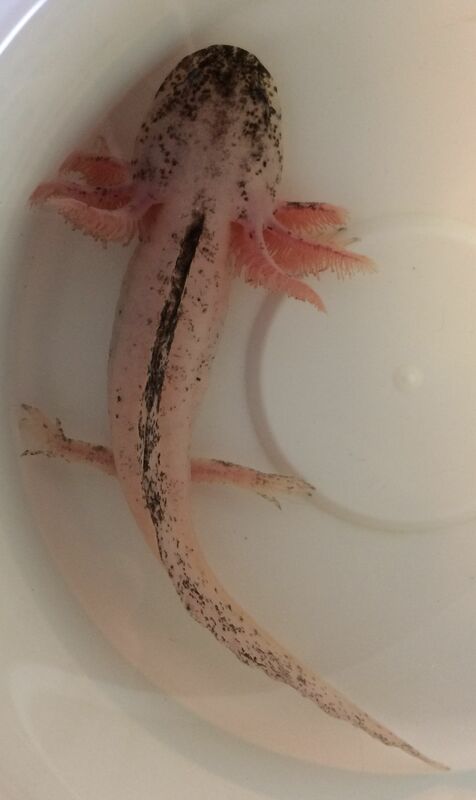 Approximately 6 inches long, gender unknown. 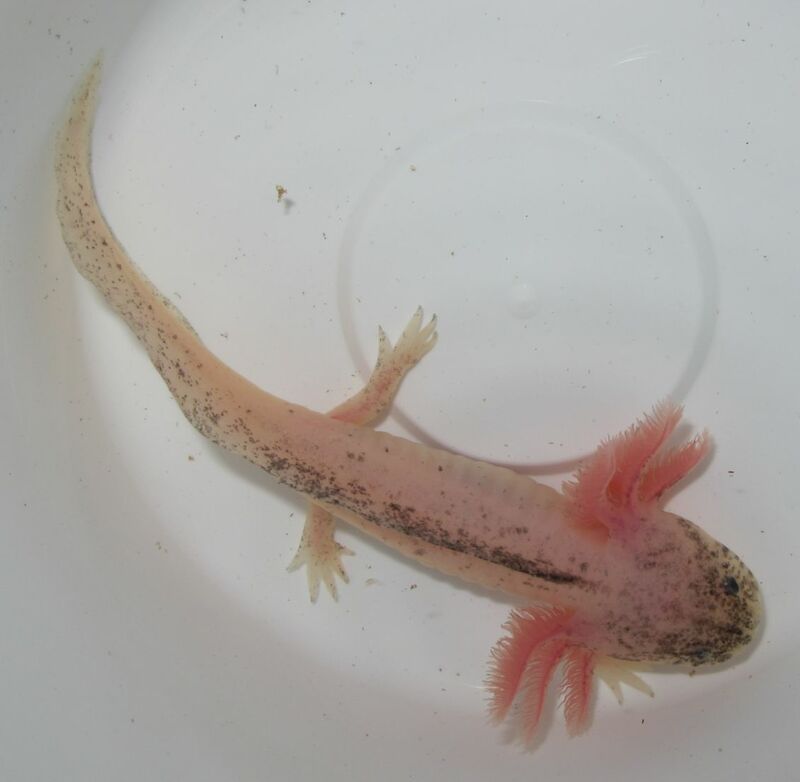 This is a lightly-speckled leucistic with extra long gills. 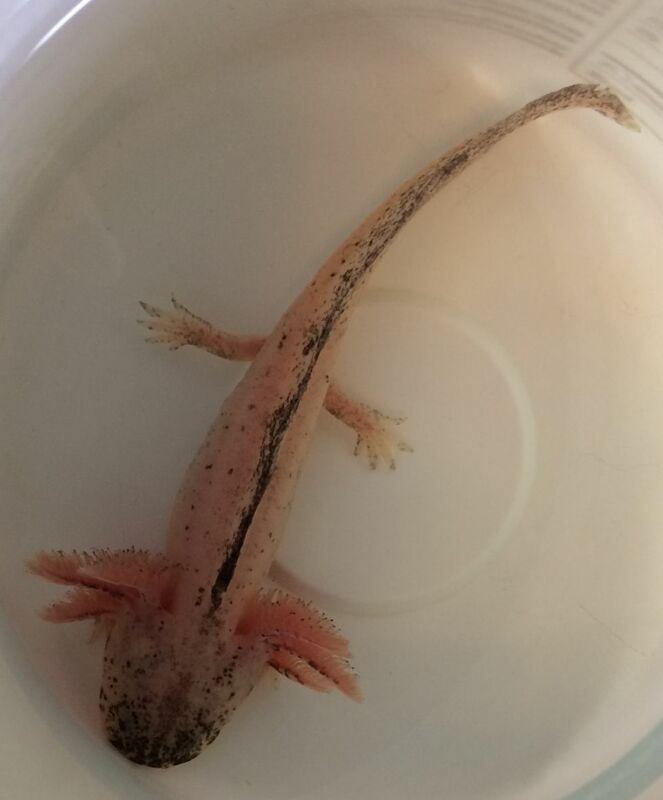 6-7 inches long, gender unknown. Price reduced because there's a small notch in the tail fin (see picture) and the gills are slightly longer on one side than on the other. 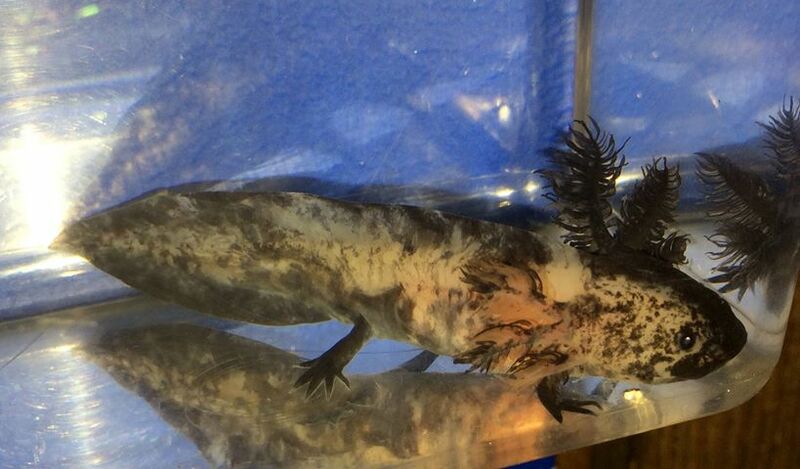 This is a black melanoid, 7-8 inches long. Price reduced because one gill is slightly shorter than the others. Gender unknown. 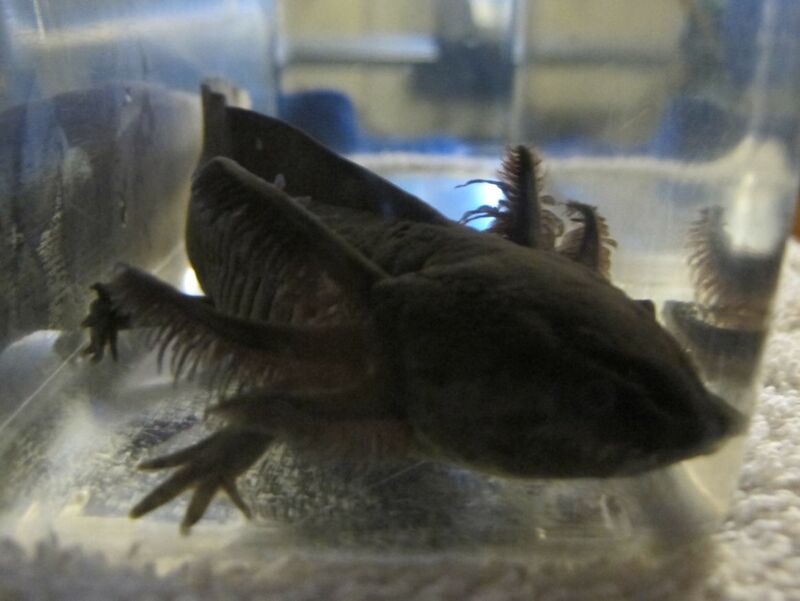 Keep over black substrate for darkest coloring. 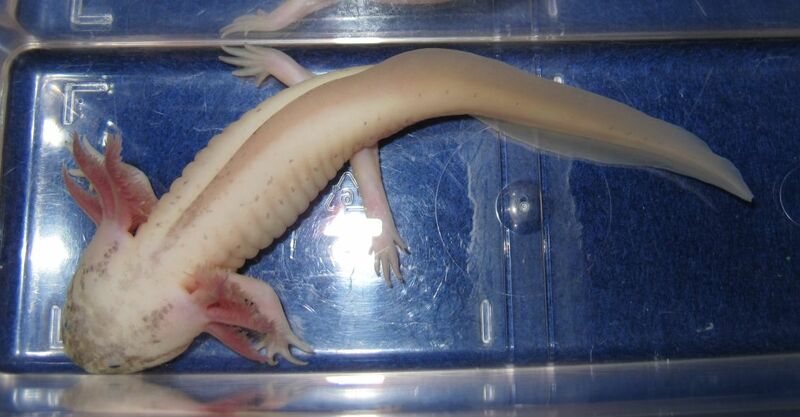 This leucistic is 7-8 inches long. 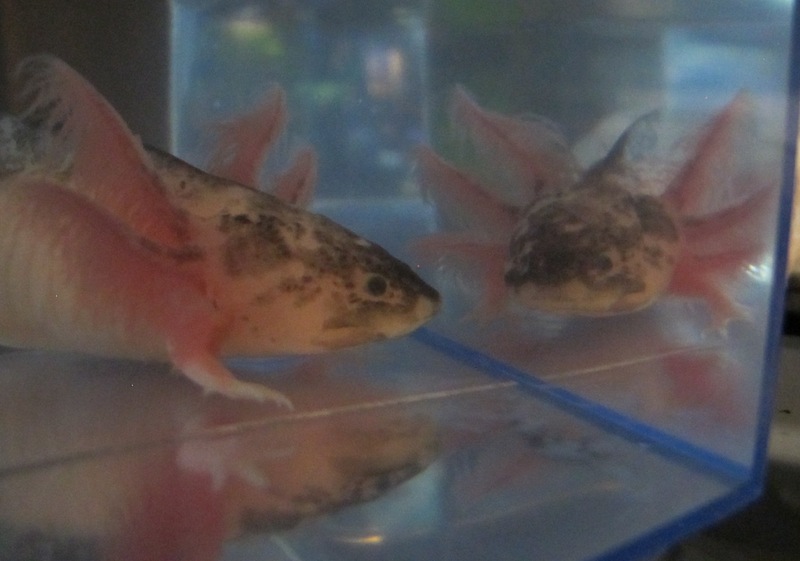 Some light speckling and long gills. 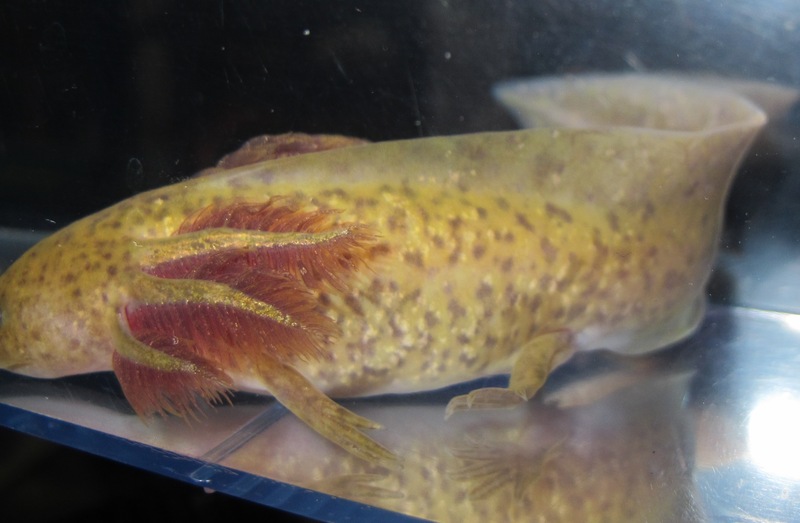 Gender not guaranteed, but looks like maybe a male. Price reduced because there's a notch in the lower tail fin (see picture). 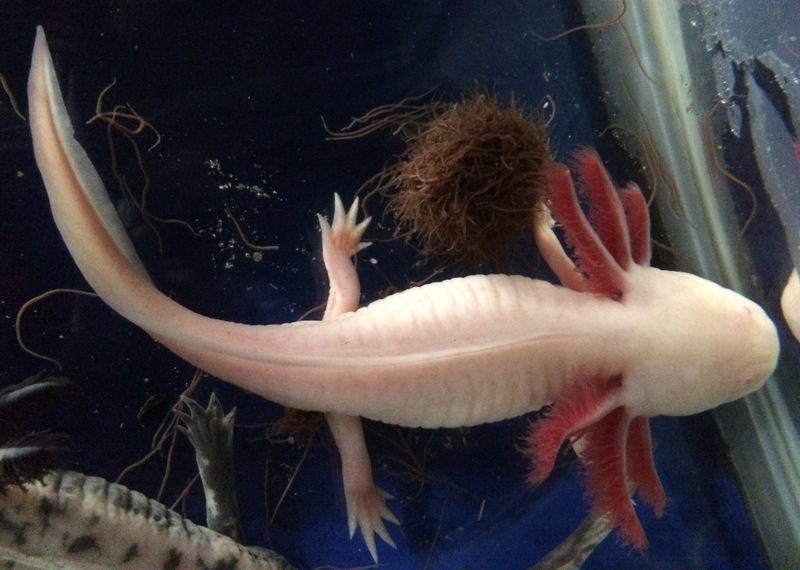 This leucistic is 8-9 inches long. He has a speckled face, plus some dark flecks down his back. Gender not guaranteed, but looks male. As always, keep over black substrate to minimize fading. 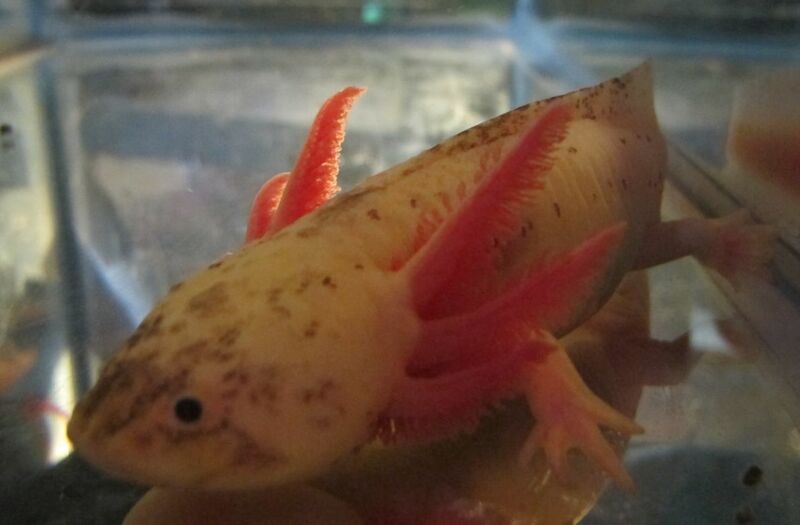 This leucistic has a little light speckling and is 8-9 inches long. Approximately one year old. Gender is not guaranteed, but looks like it's probably a male. 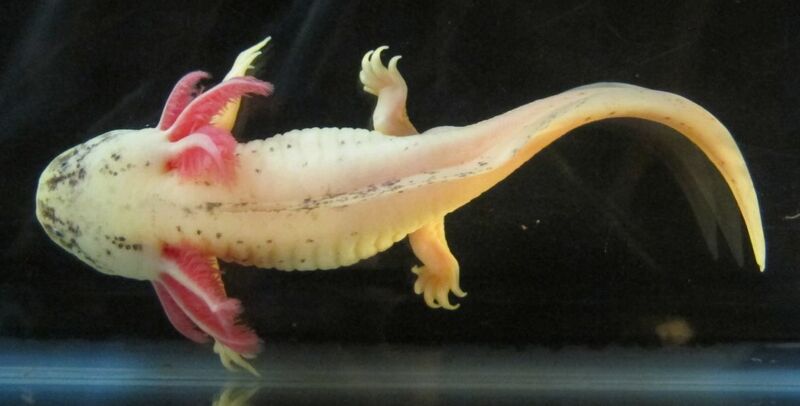 This is a wild type axolotl, length 8-9 inches. Gender unknown. 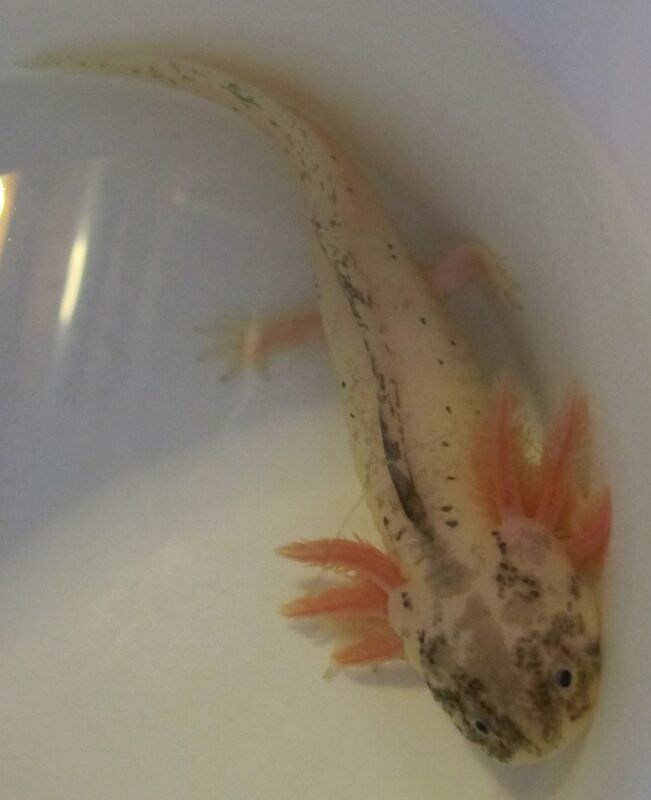 This leucistic has a little light speckling and is 8-9 inches long. 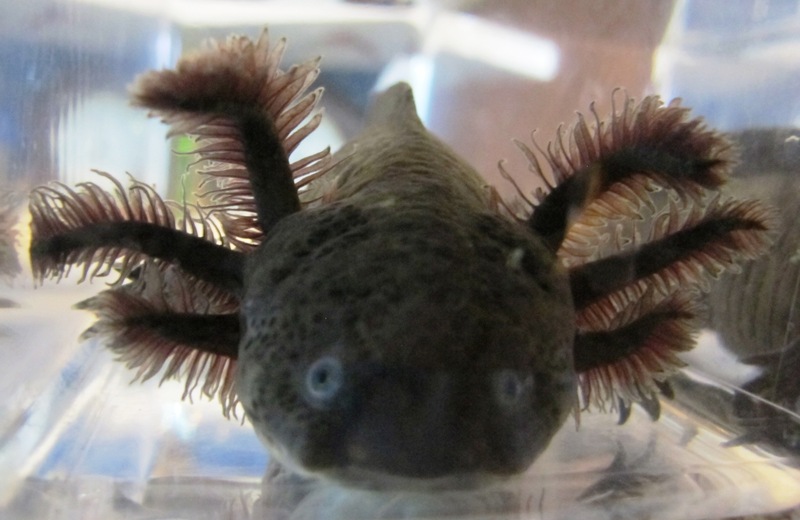 Nice gills. Approximately one year old. Gender is not guaranteed, but so far it looks female. Price reduced because there is at least one notch in the tail fin. 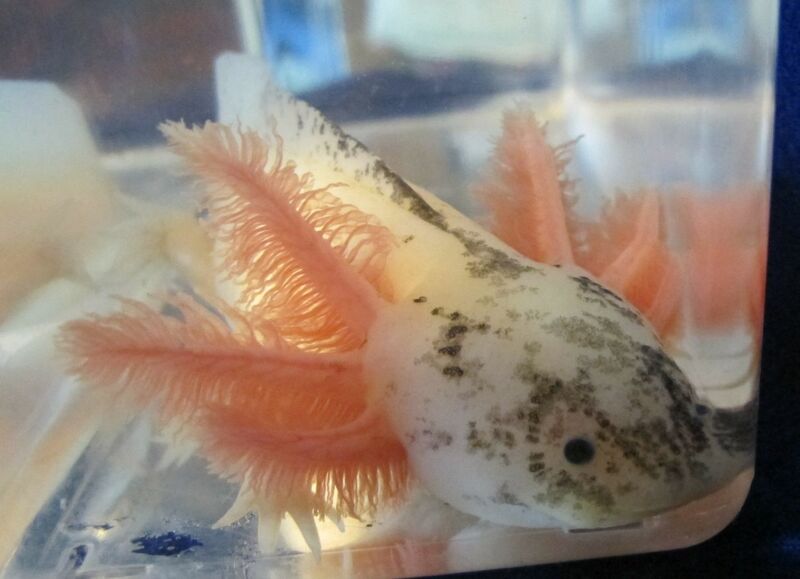 This leucistic might be right for someone looking for an axolotl that's a little bigger. It's approximately 9 inches long. Approximately one year old. Gender is not guaranteed, but looks like it might be male. Price reduced because there is a piece missing on the tail fin (see picture). 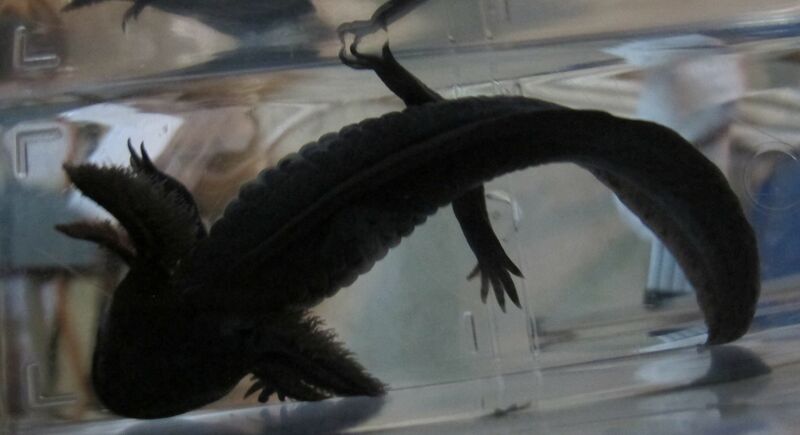 This is a black melanoid, 7-8 inches long. Gender not guaranteed, but looks like it's probably male. 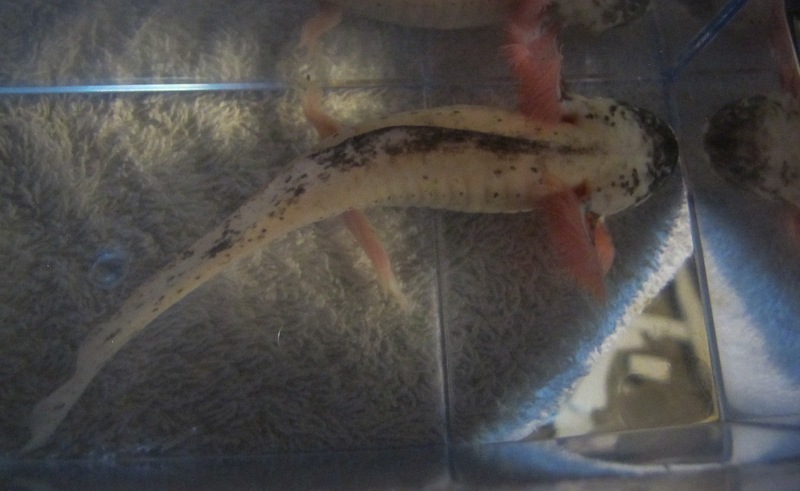 This leucistic is 6-7 inches long, with light speckling. 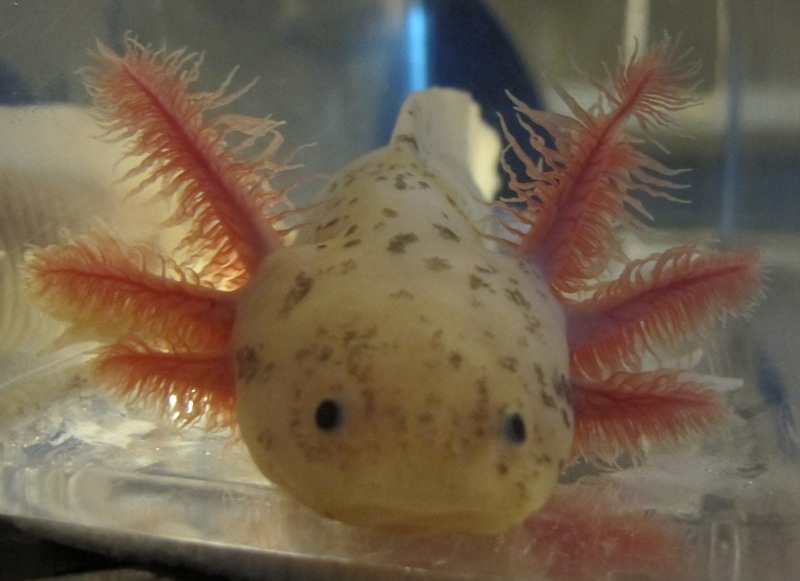 Long, pretty gills. As always, keep over black substrate to minimize fading. 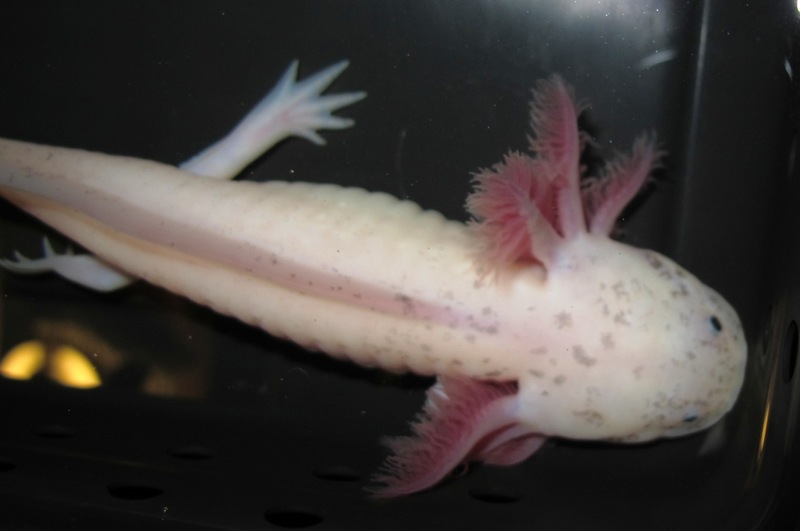 This leucistic is 7-8 inches long, with light speckling. 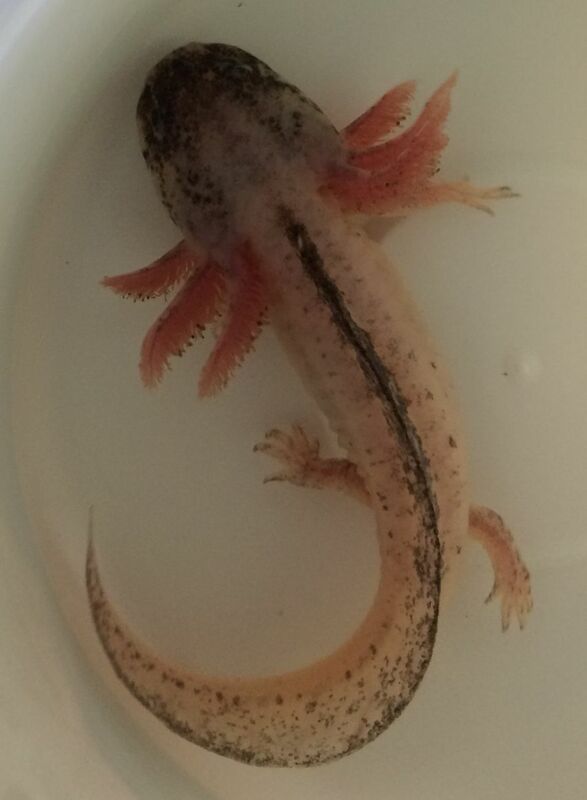 Long gills, gender unknown. As always, keep over black substrate to minimize fading. 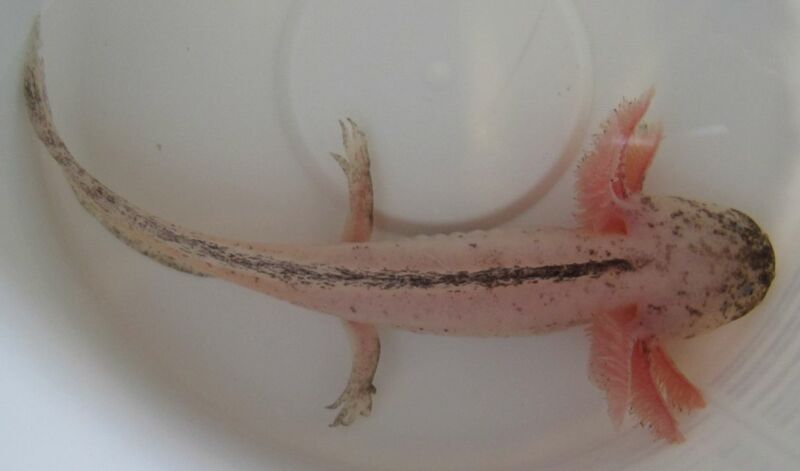 This is another pretty speckled leucistic, 6-7 inches long, with light speckling. 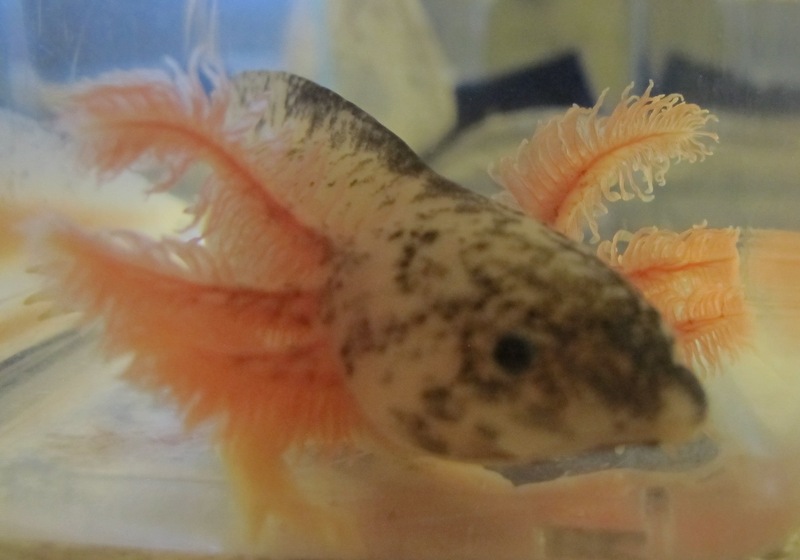 Long, pretty gills. As always, keep over black substrate to minimize fading. 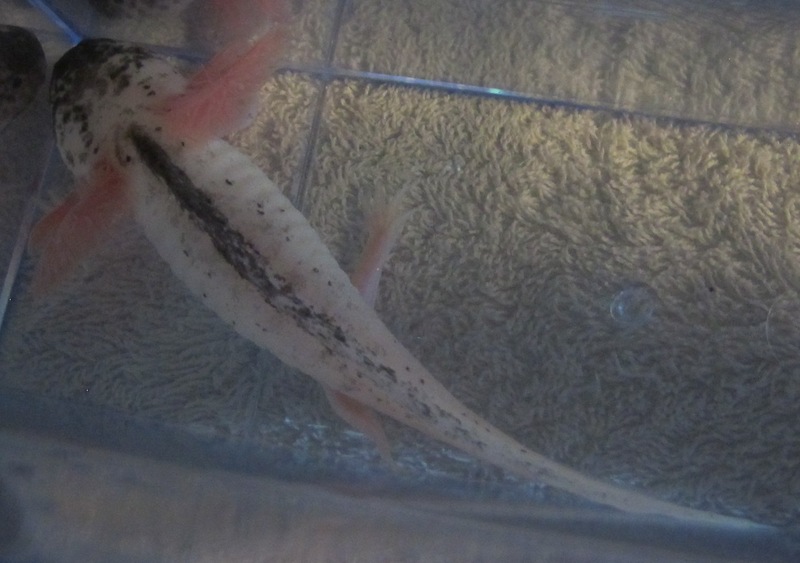 This is a pretty speckled leucistic, 6-7 inches long, with light speckling. 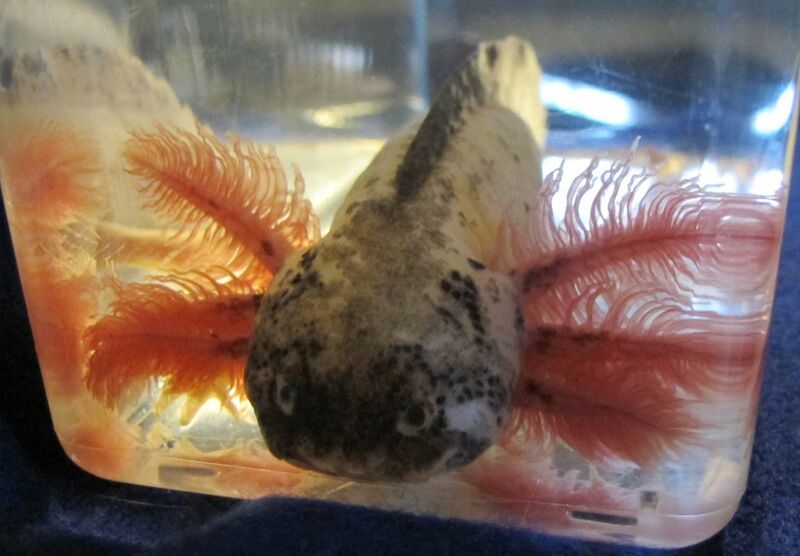 Long, pretty gills. As always, keep over black substrate to minimize fading. 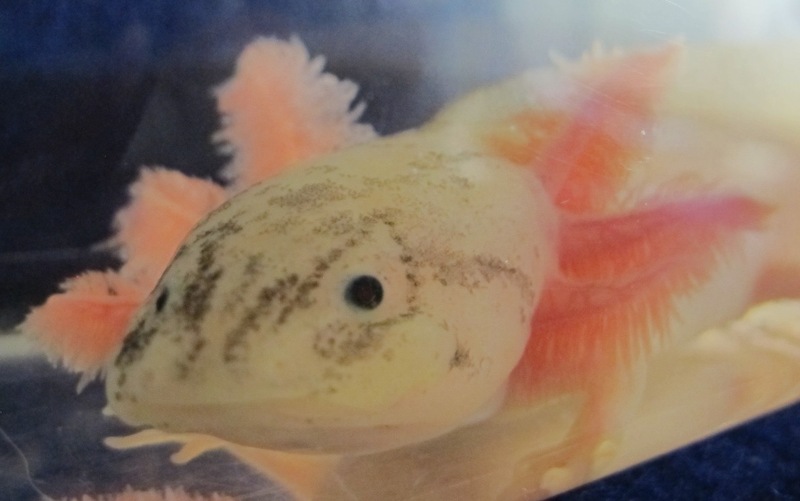 This is a large leucistic (8-9 inches) with light speckling. 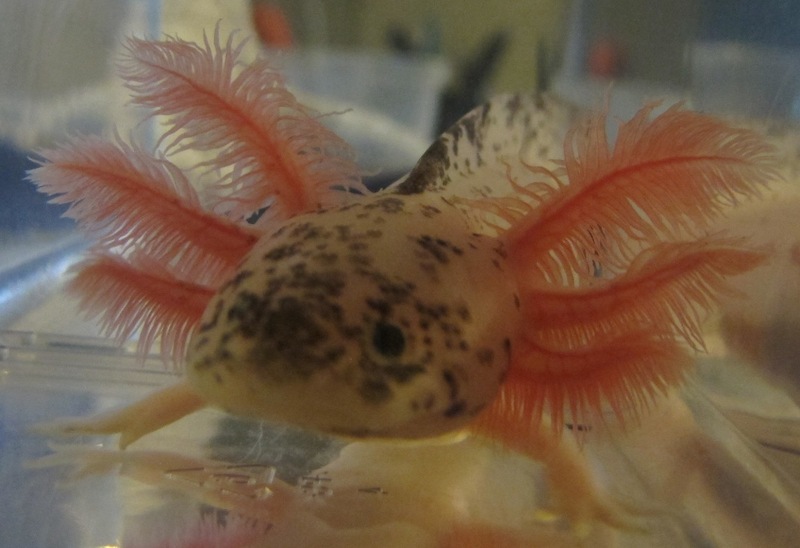 Long, pretty gills. 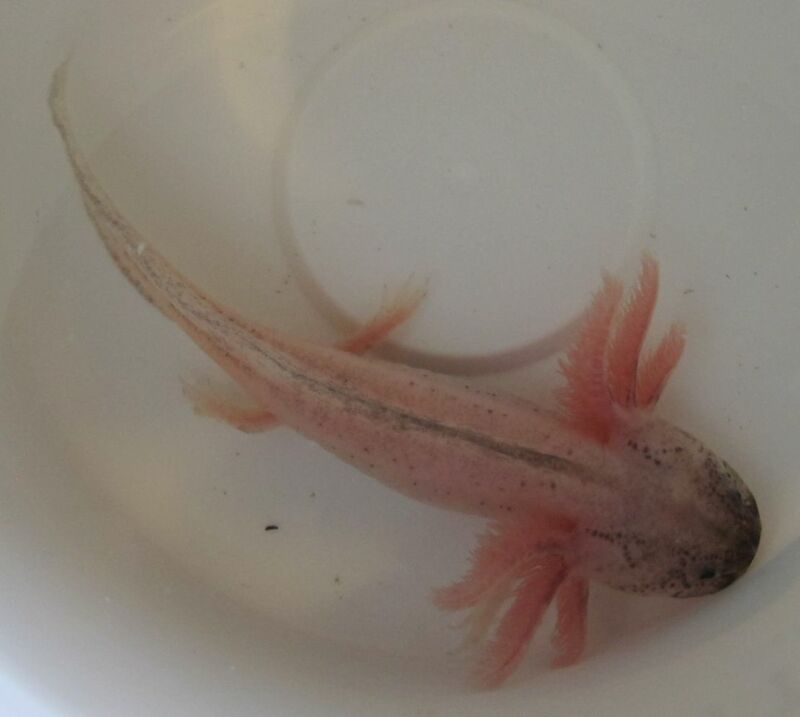 Gender unknown, but looks female so far. Price reduced because there's a small notch in the tail fin. As always, keep over black substrate to minimize fading. What can I say about this beauty? 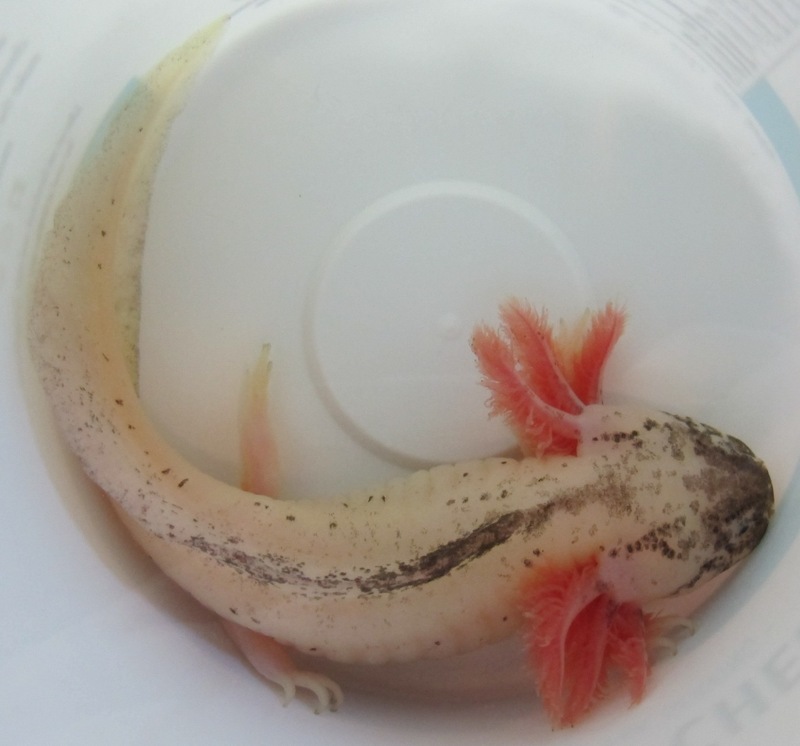 He/she is a large leucistic (8-9 inches) with nice speckling and very lovely long gills. Gender unknown. As always, keep over black substrate to minimize fading. 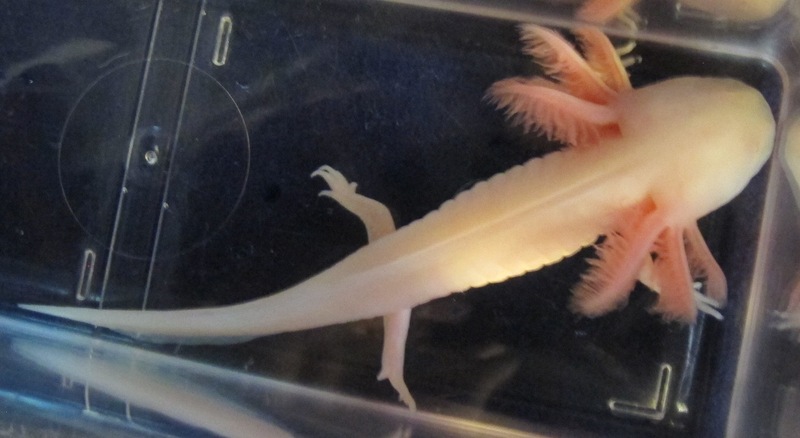 This white albino is 5-6 inches long and has extra-long beautiful gills. Gender unknown. 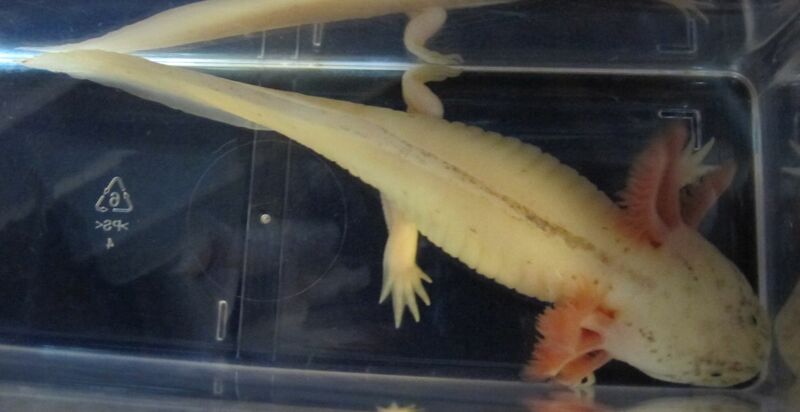 This leucistic is 5-6 inches long. Looks like he/she might end up with a little bit of speckling. 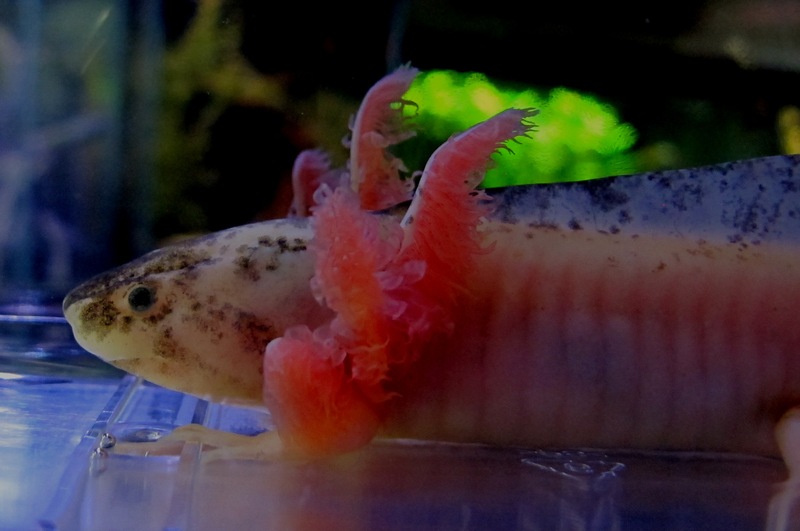 These pictures were taken with him housed over a white substrate. 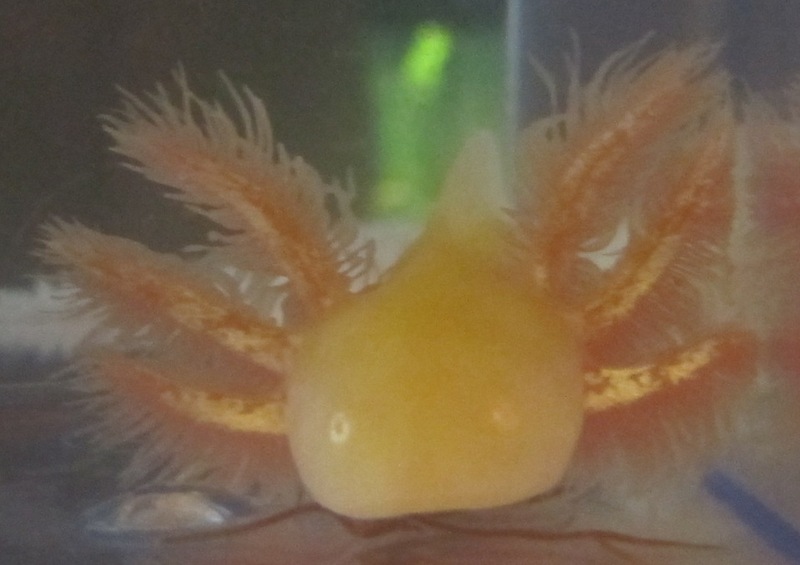 A bonus is very nice gills! Gender unknown. 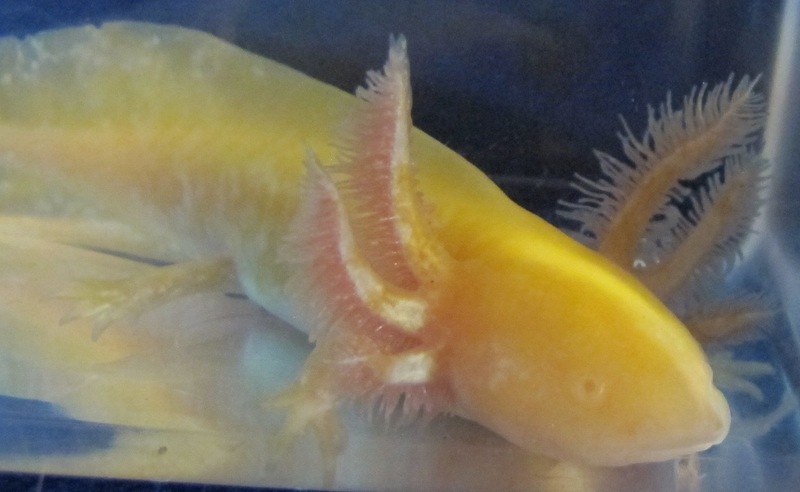 This gold albino is 5-6 inches long. When you zoom in, you can see there's some white marbled in with the gold coloring. The gills are lovely. Price reduced because there are some small notches on the top edge of the tail fin. 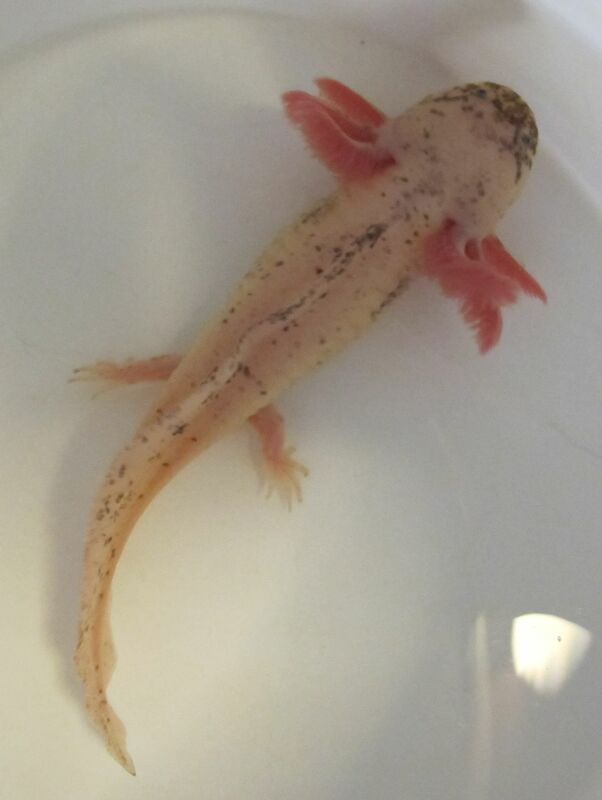 (see picture) Gender unknown. This leucistic has some nice speckling. Length is 7-8 inches. Gender unknown. Price reduced because there are a couple of tears in the tail fin (see picture). As always, keep over a black substrate to minimize fading. 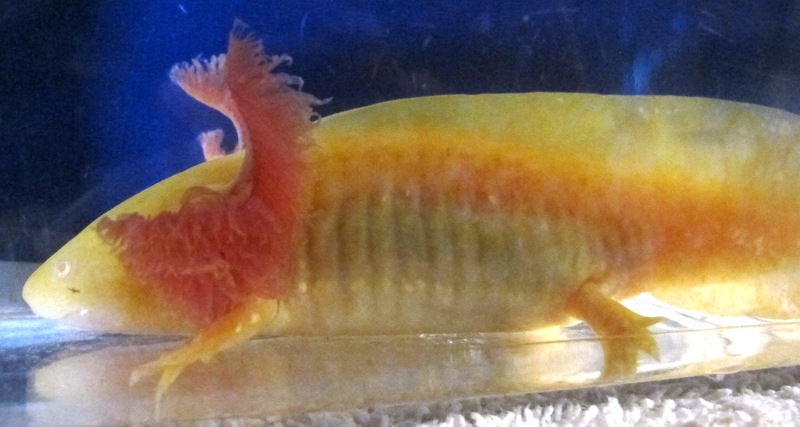 This little beauty is 6-7 inches long. 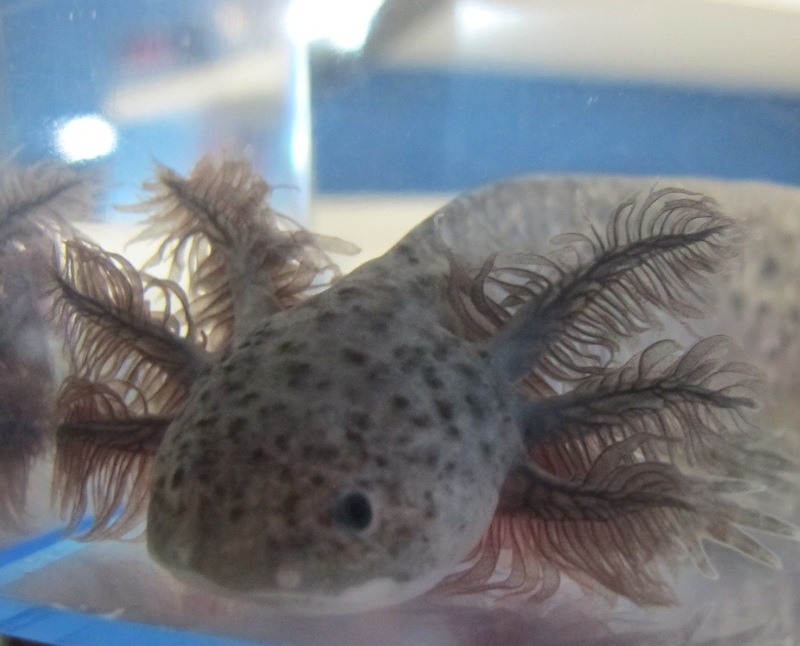 He has very nice speckling and beautiful gills. There's even some smudging under his chin - cute! He's too young to know gender for sure. As always, keep over a black substrate to minimize fading. 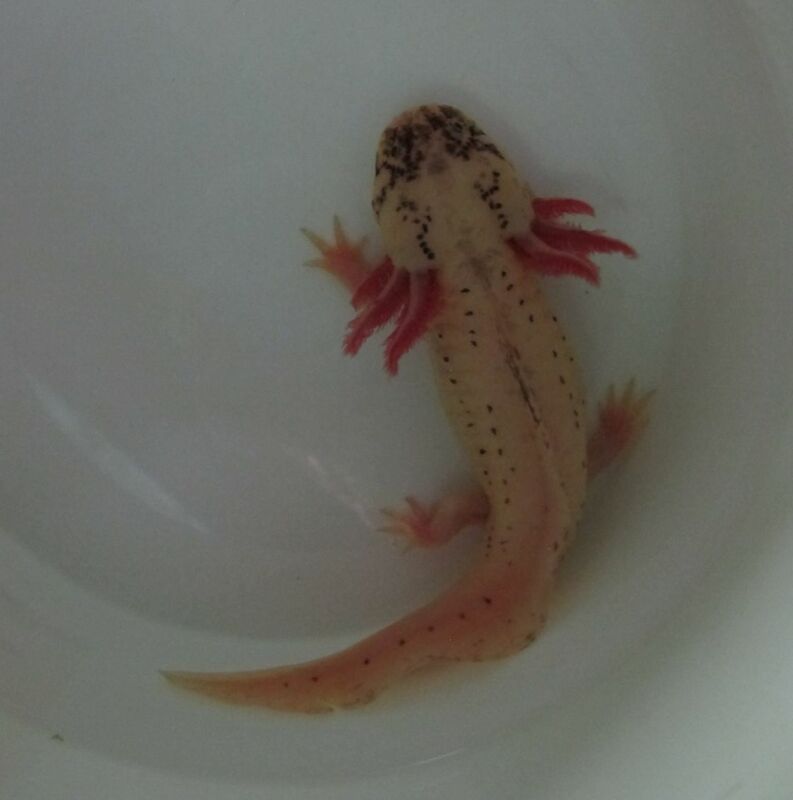 Another nice gold albino. Length is 7-8 inches. Too young to know gender for sure. This leucistic has very nice speckling on his/her face and body. 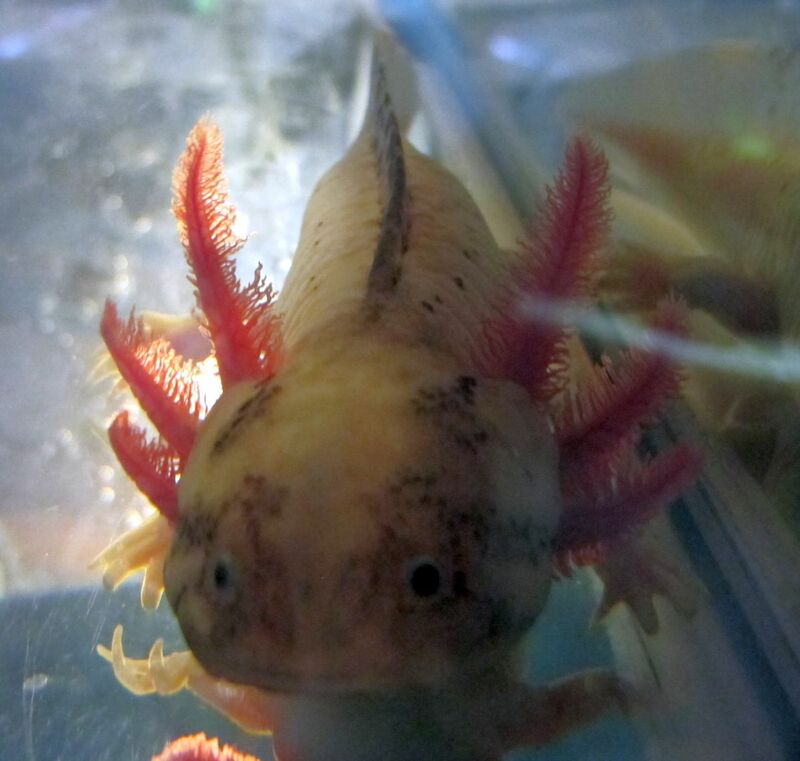 Plus very nice gills! Length is approximately 7 inches. Too young to know gender for sure. 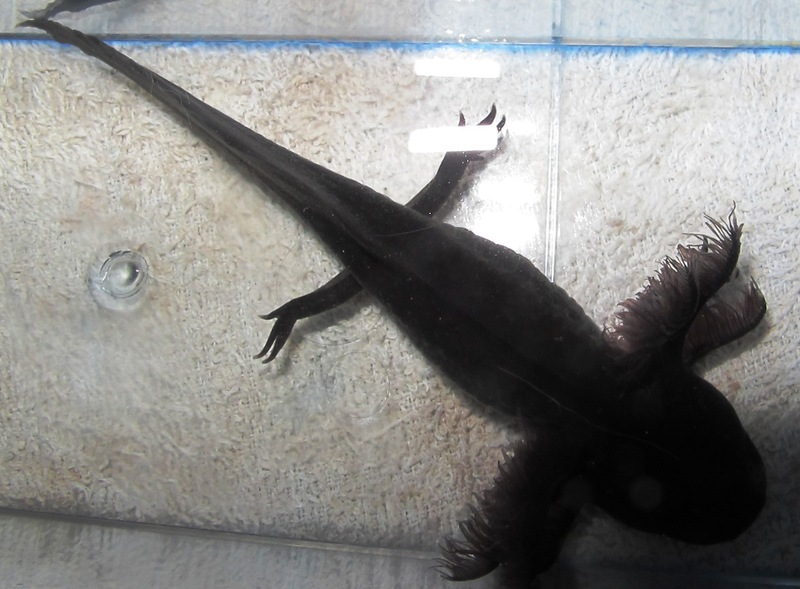 As always, keep over black substrate to avoid fading. 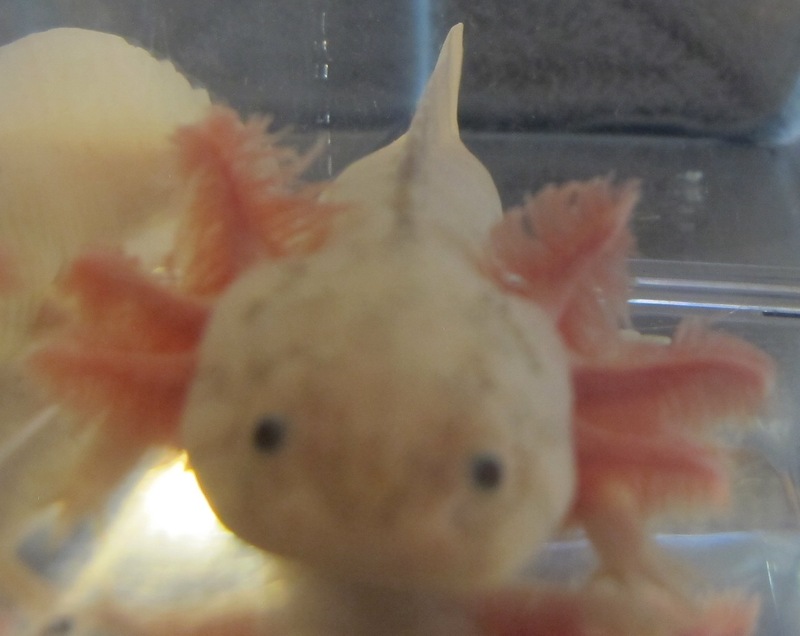 This leucistic has grayish speckling on his/her face and body. 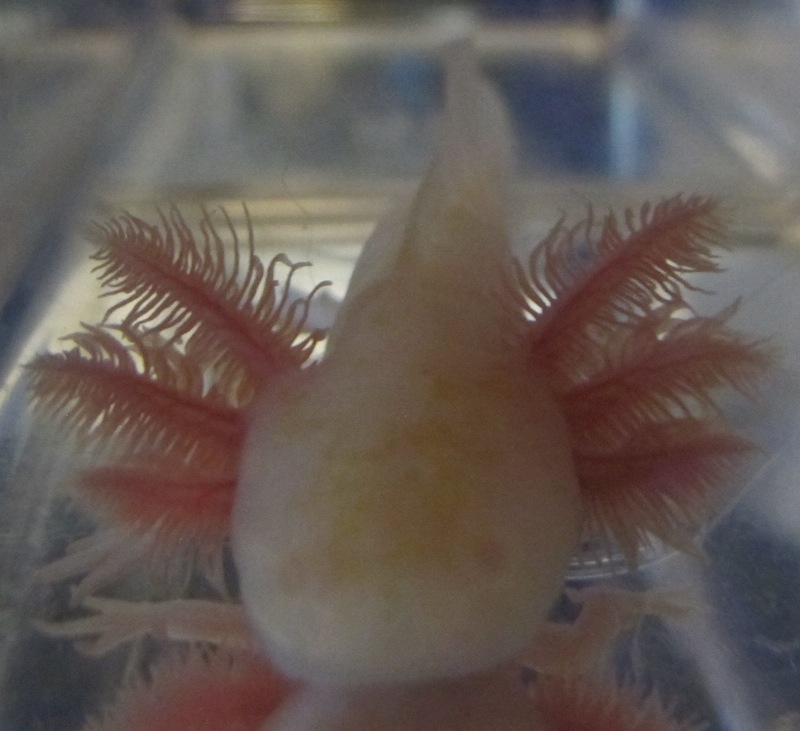 Plus very nice gills! Length is approximately 7-8 inches. No guarantee on gender, but looking female at this point. Keep over black substrate to maximize speckling. 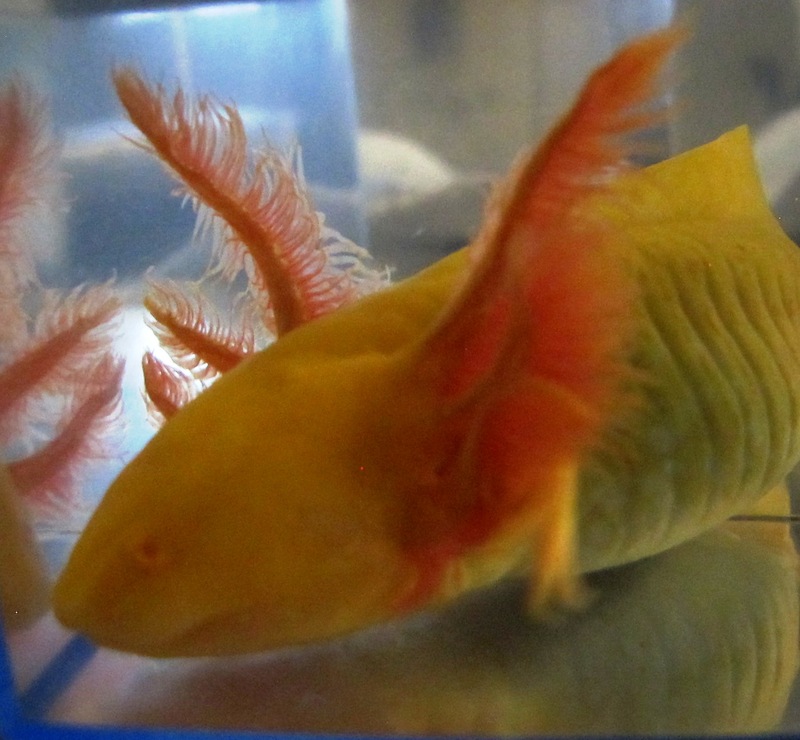 Here's another pretty golden albino. 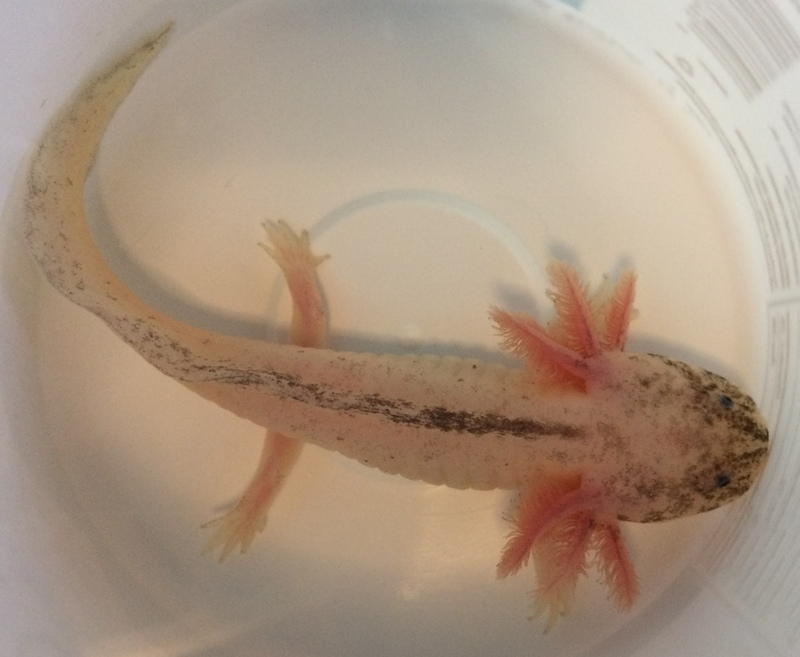 It's 6-7 inches long, and too young to know what gender it is. Price reduced because there's a notch in the tail (see picture). 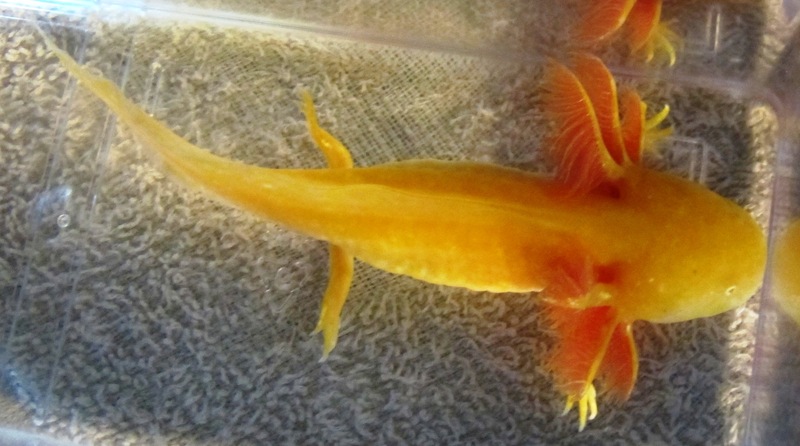 This pretty golden albino is 7-8 inches long. It's too young to know what gender it is. 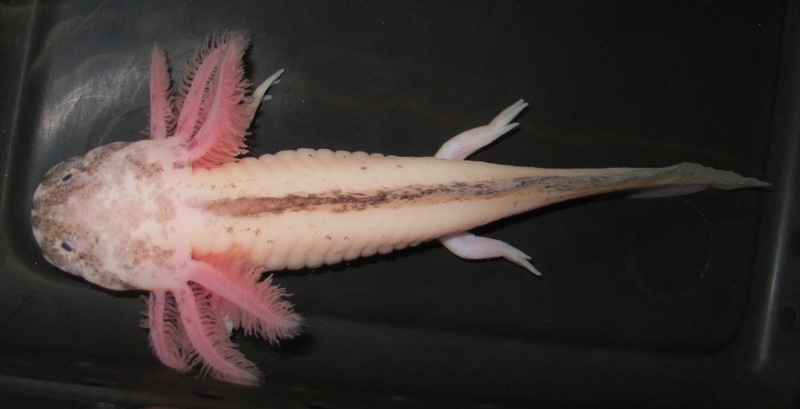 This beauty is 5-6 inches long. Beautiful gills and nice speckling. As always, keep over dark substrate to minimize fading. 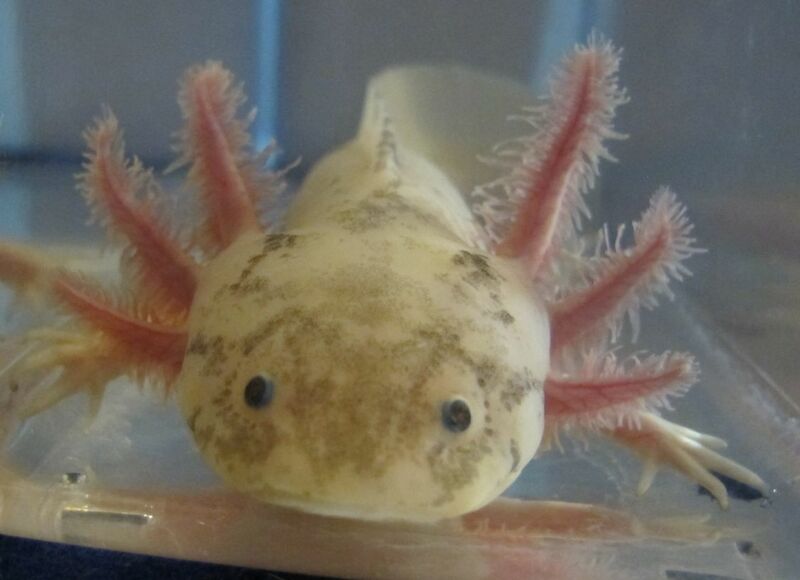 This cutie is 5-6 inches long. Beautiful gills and nice speckling. As always, keep over dark substrate to minimize fading. 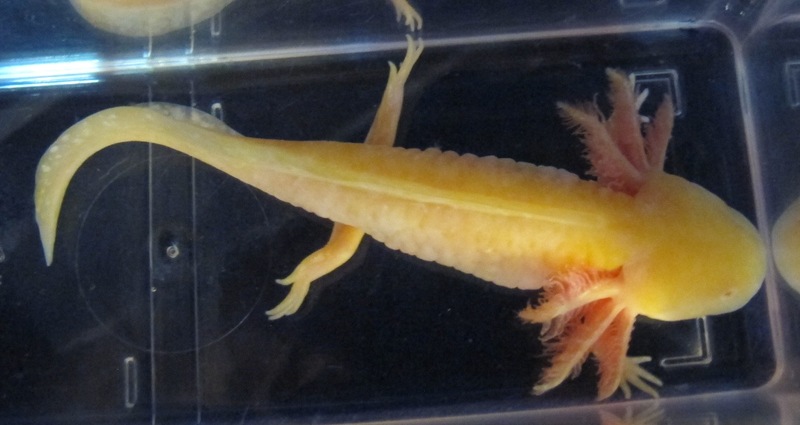 This gold albino is approximately 8 inches long. 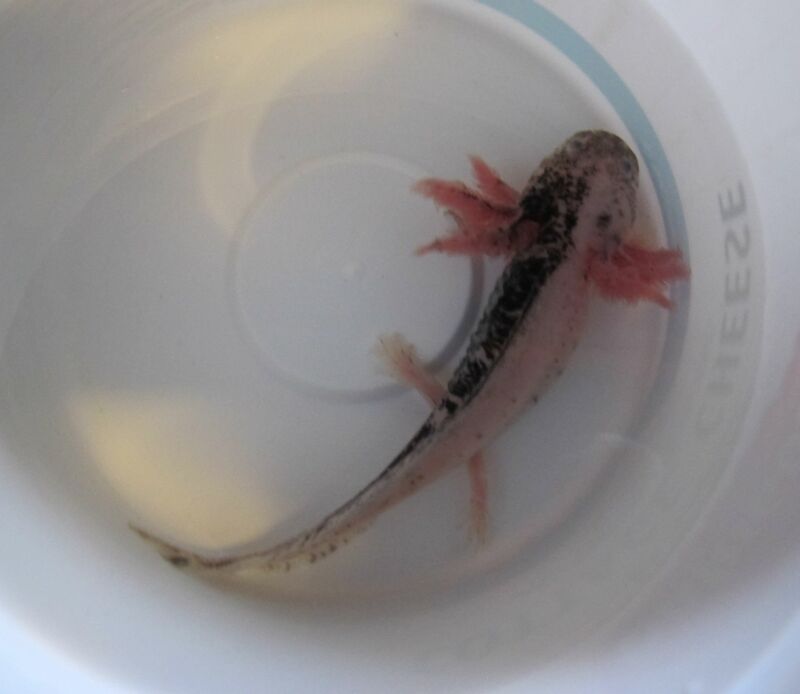 Looks female so far, but he or she is not quite old enough be positive. 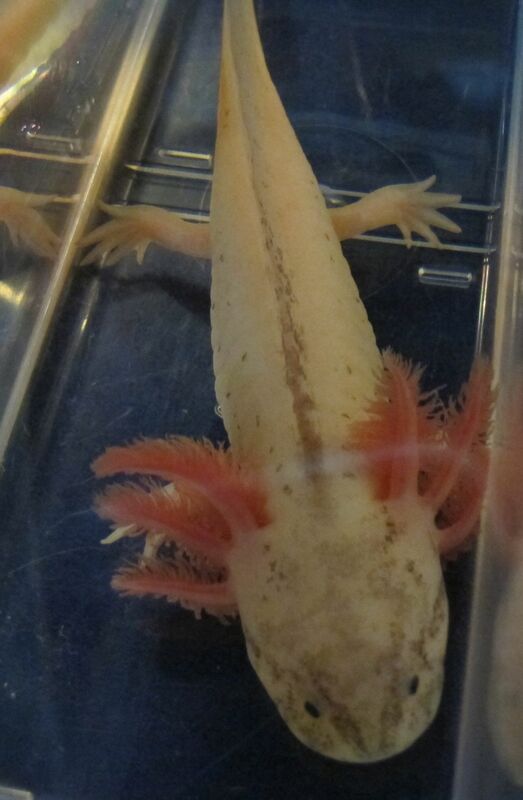 This one has a few extra "fingers" on some of the gills (see pictures). If you're a purist, you won't like those extra "forks," but if you prefer the oddballs, you might. 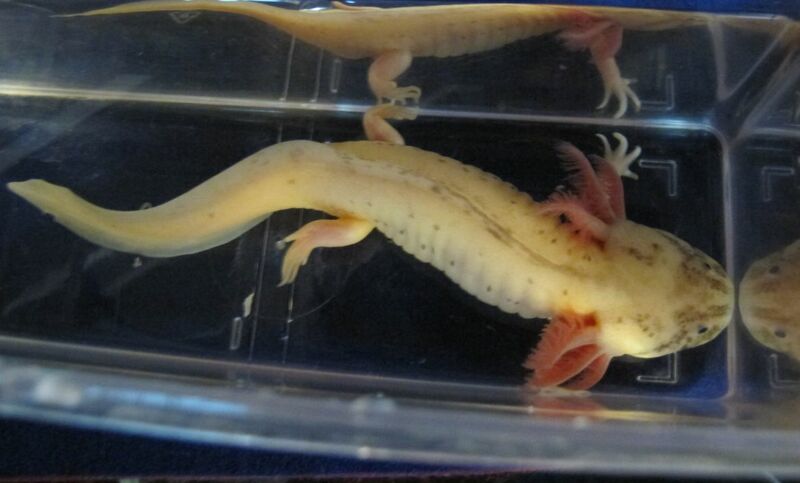 This gold albino is 7-8 inches long. 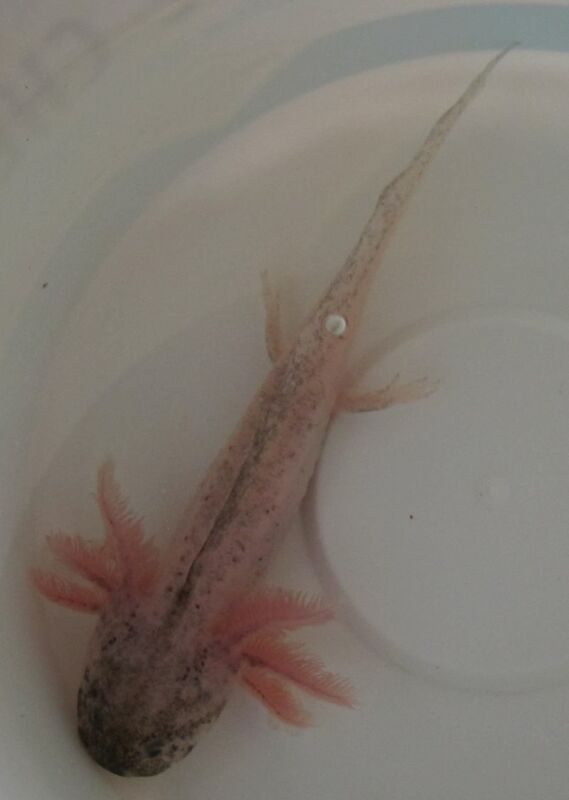 Looks female so far, but he or she is not quite old enough be positive. Appears to be a light gold color and if you zoom in, you see there's a lot of white mixed in with the gold. 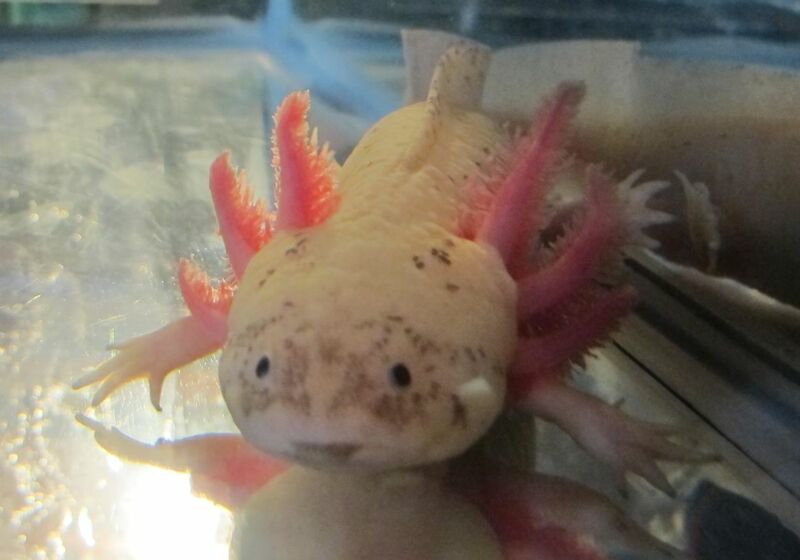 The gills are very nice. Price reduced because the tail is ragged near the end (see pictures). This speckled leucistic is 7-8 inches long. Gender is unknown. He/she has some nice speckling on face, back, sides, etc. Plus a bit of smudgy gray on the belly. Price reduced because the tail fin is a little imperfect near the end (see pictures). 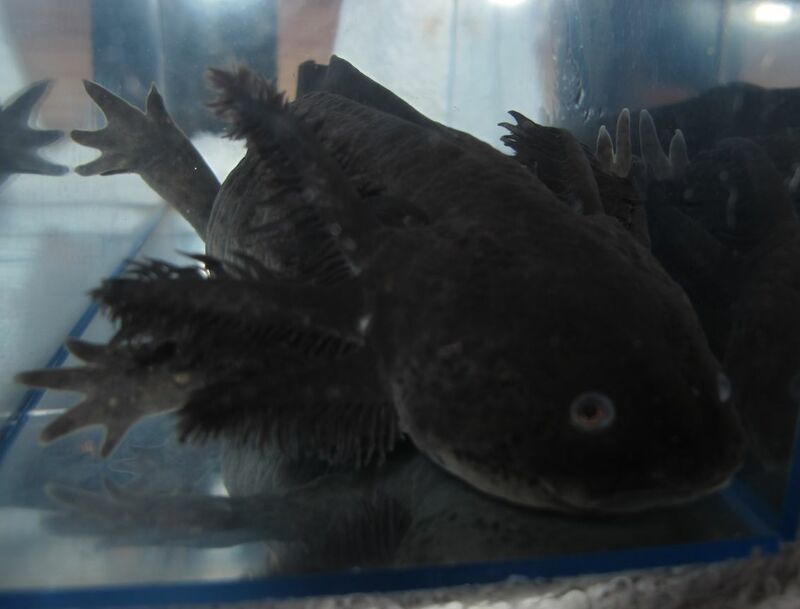 As always, keep over black substrate for the darkest coloring. 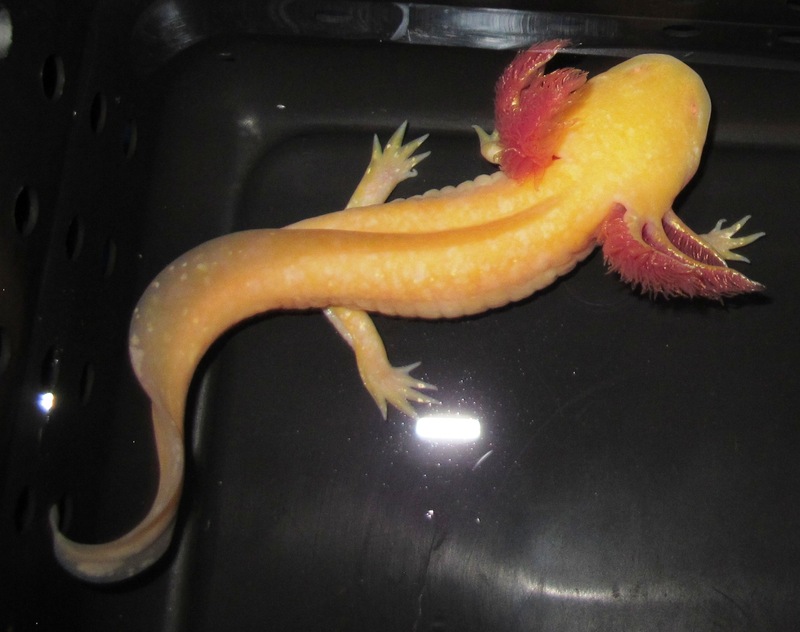 This gold albino is 8-9 inches long. 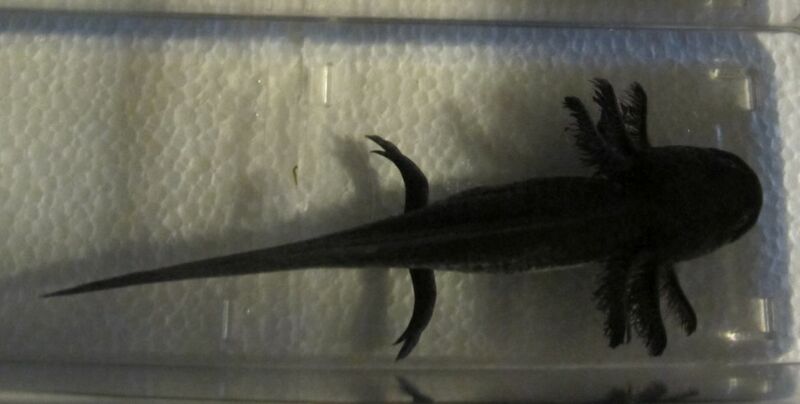 Looks female so far, and at this size hopefully that's a good guess, but he or she is not quite old enough be positive. Since he/she hasn't spawned yet, gender is not guaranteed. Kind of an interesting gold and white marbled coloring. 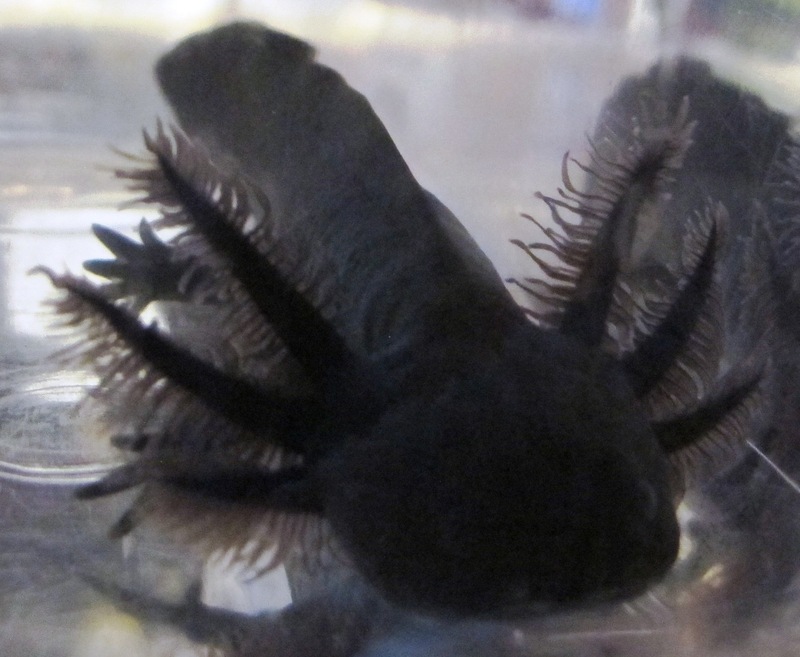 This RLG melanoid is black on top and is black and gray on the sides. It has gray areas that spread up the sides. I couldn't get the pictures to show this. 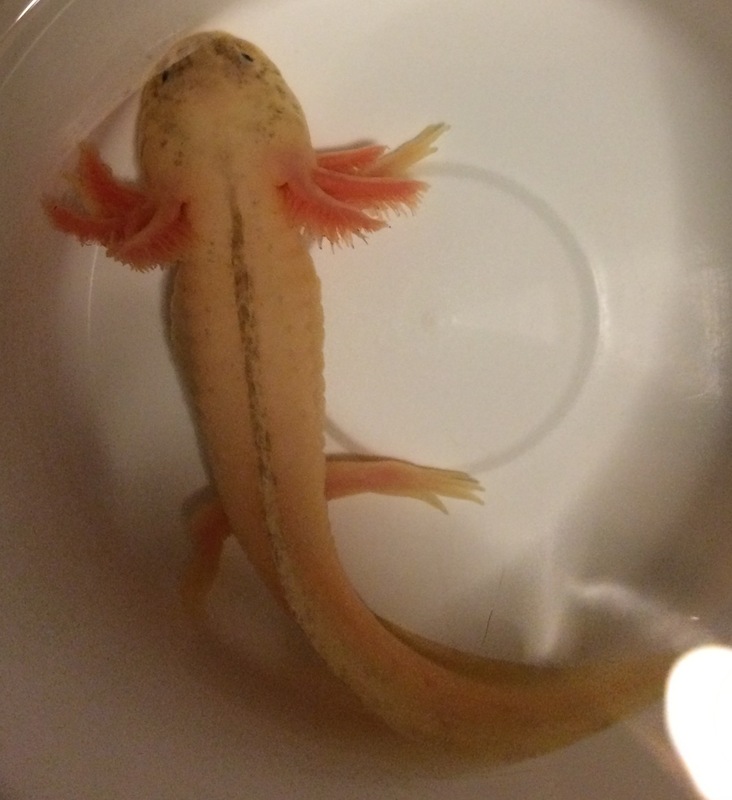 It's 7-8 inches long and looks female so far, but too young to be sure. Price reduced because it also has a couple of notches on the tail fin. 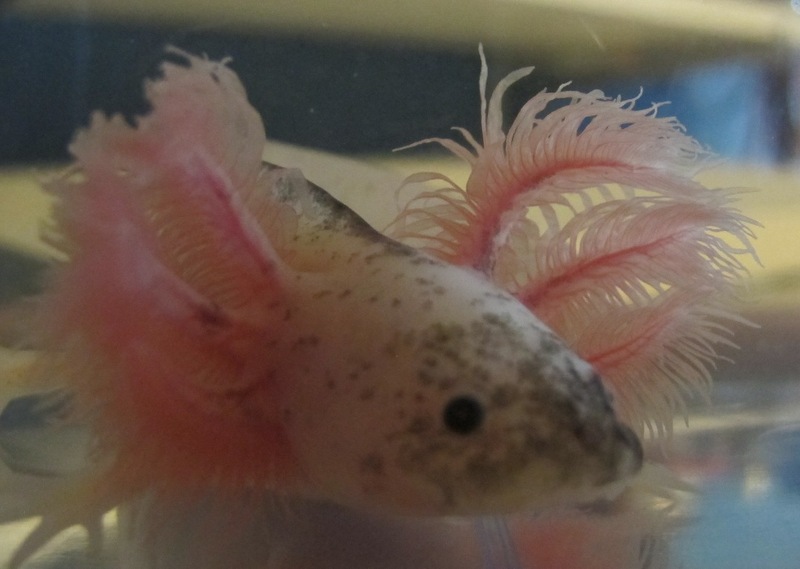 The gills are long and lovely. As always, keep over black substrate for the darkest color. 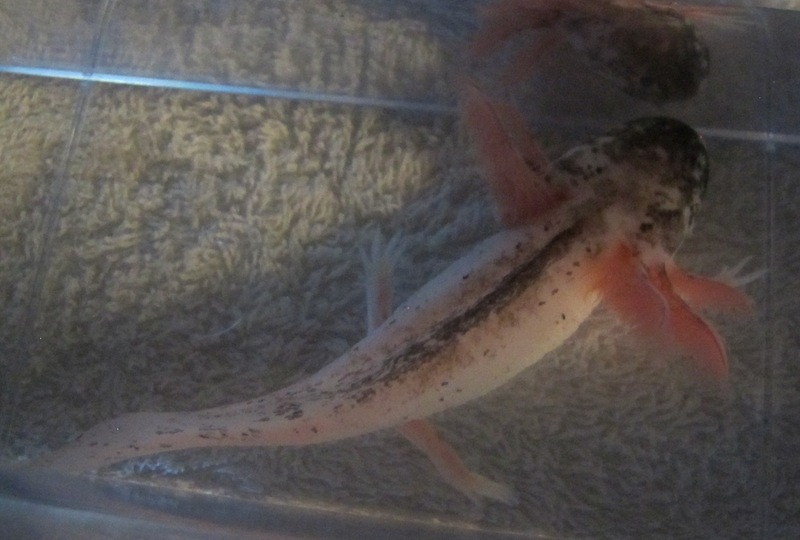 This speckled leucistic has just a little color on the face and top fin and is 7-8 inches long. Possibly female, but too young to be sure. As always, keep over black substrate for the best speckling. This is a nice speckled leucistic, 7-8 inches long. As always, keep over black substrate for the best speckling. 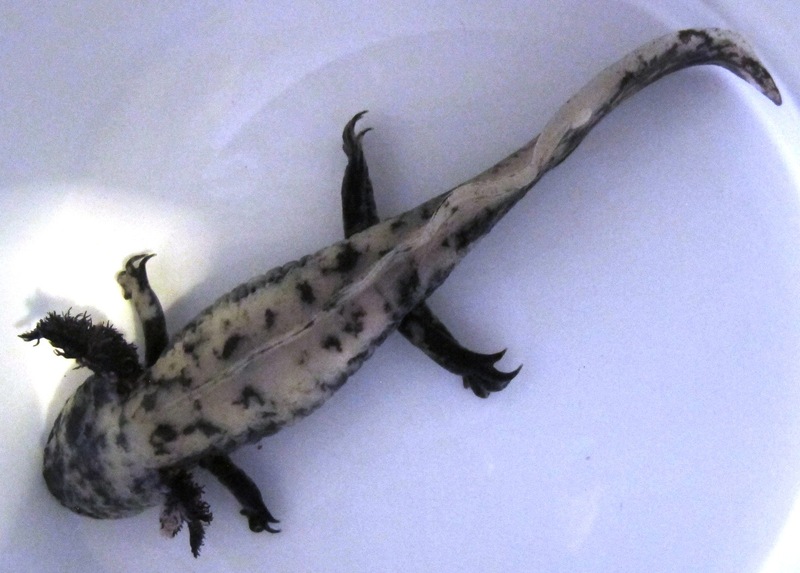 This lightly speckled leucistic is about 7 inches long. 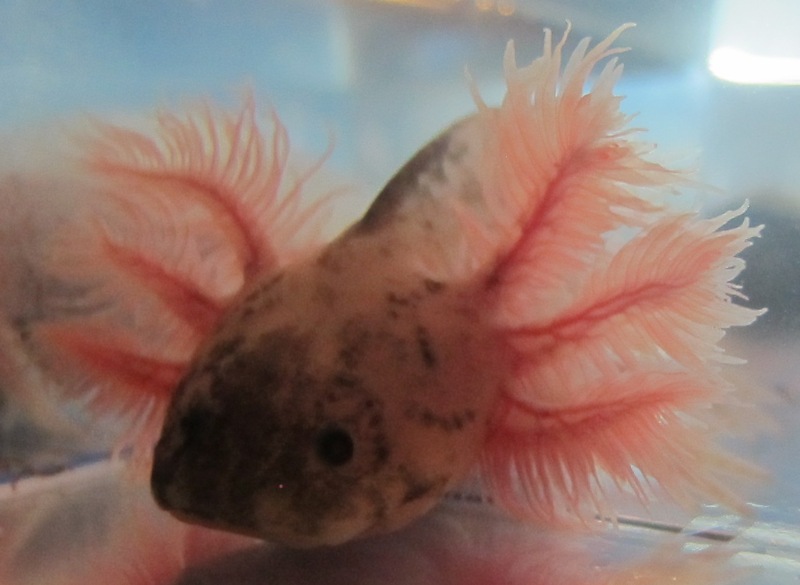 Nice gills. 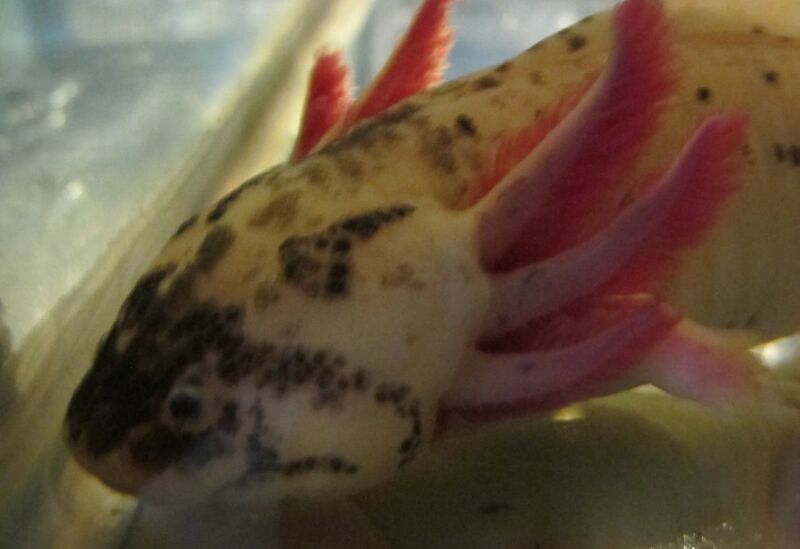 Price reduced because he/she has a chunk missing out of his tail fin. As always, keep over black substrate for the best speckling. 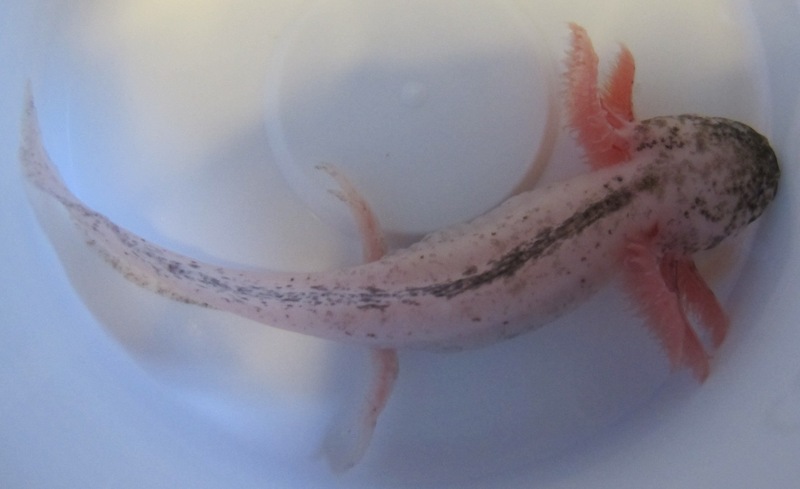 This beautiful speckled leucistic is 7-8 inches long. Possibly female, but too young to be sure. As always, keep over black substrate for the best speckling. 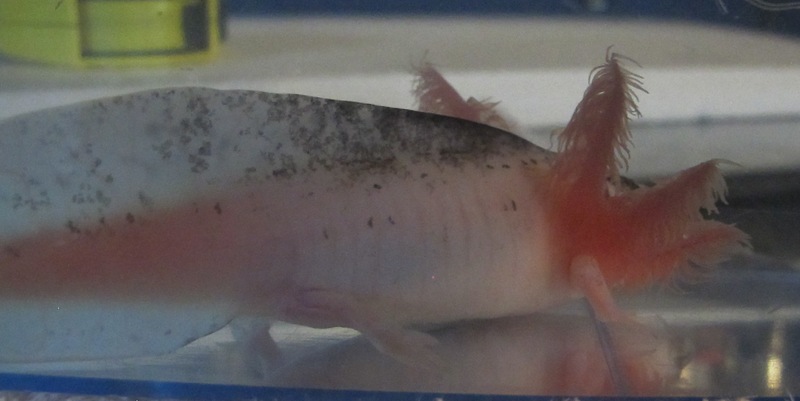 This leucistic is 7-8 inches long. As always, keep over black substrate for the best speckling. 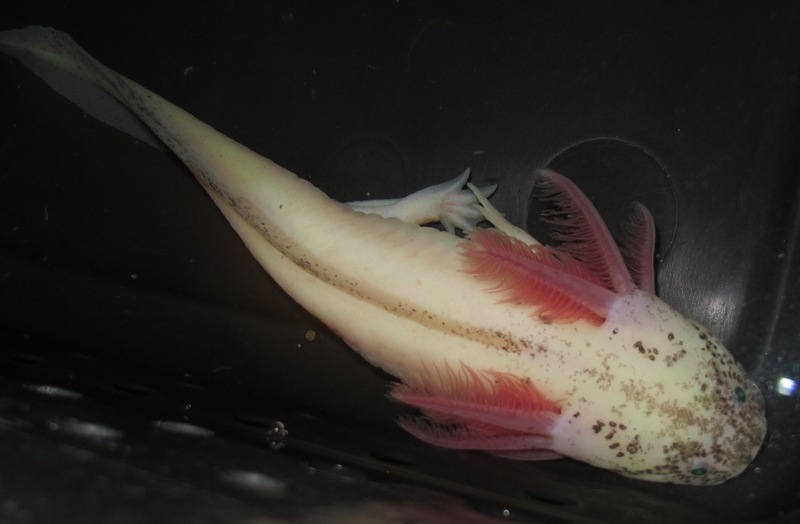 This leucistic is approximately 8 inches long. Possibly female, but too young to be sure. 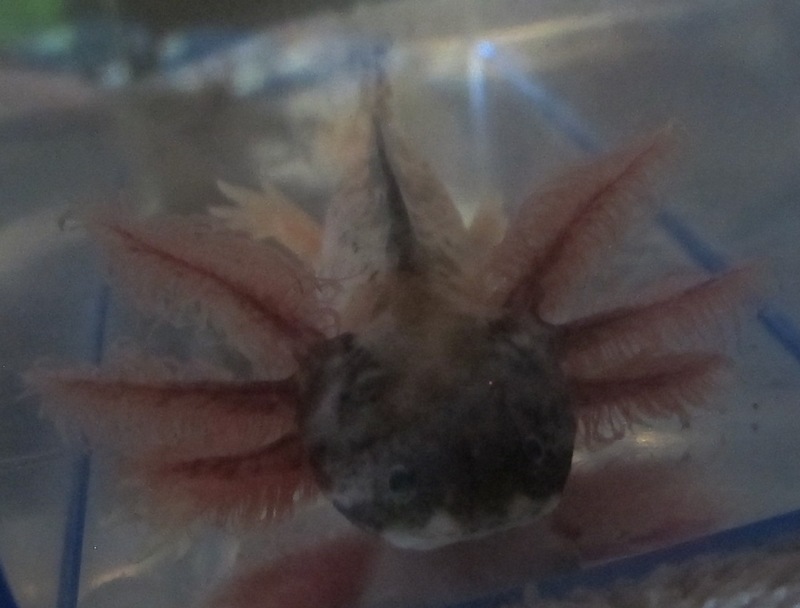 It doesn't have very much speckling, but the gills are nice. Price reduced because the end of the tail is ragged. As always, keep over black substrate for the best speckling. 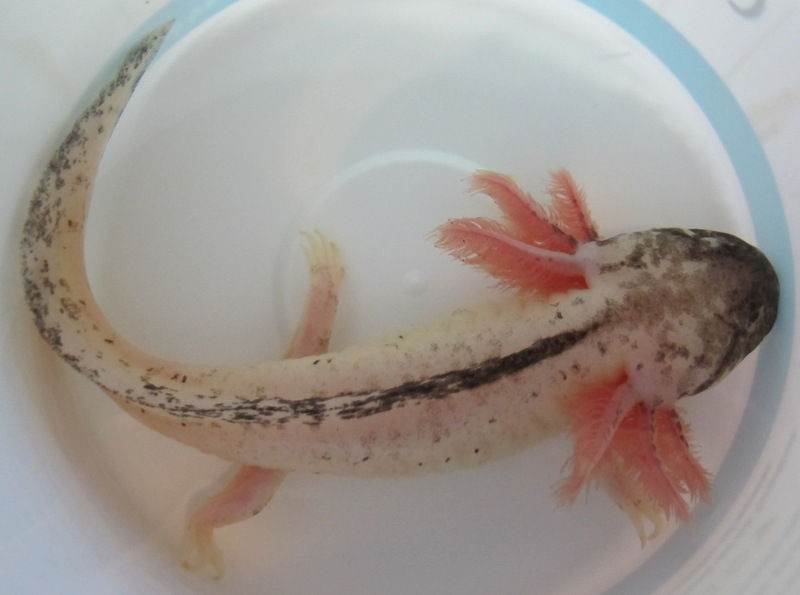 This lightly speckled leucistic is about 7 inches long. 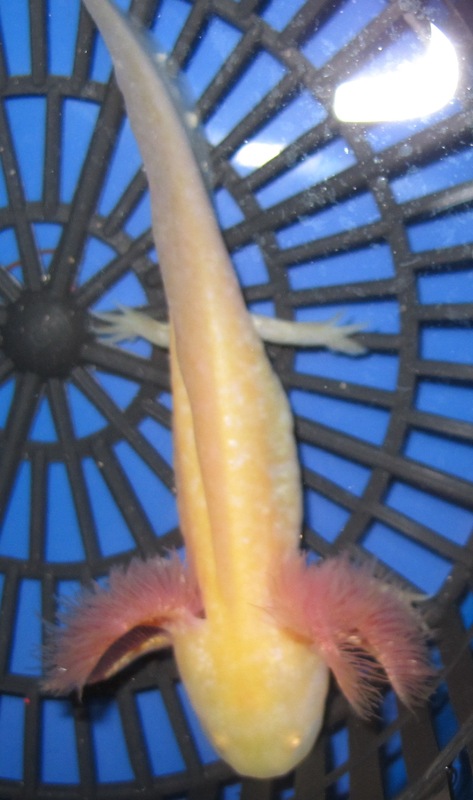 Gills are nice, but not quite even on both sides. As always, keep over black substrate for the best speckling. 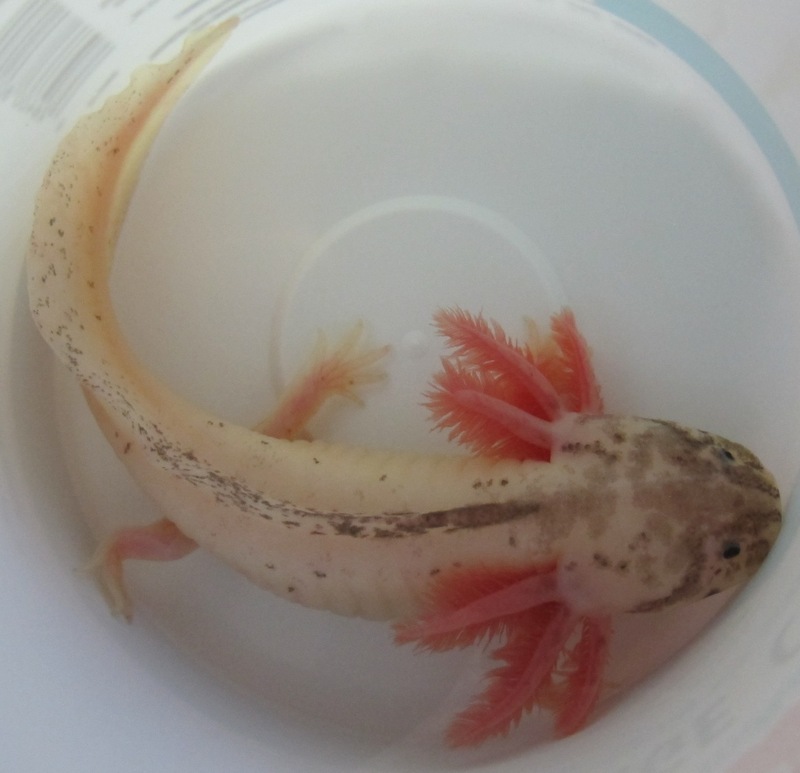 This unusual guy is a male mosaic that occurred naturally in one of our spawns. He's being auctioned on our Facebook page. Auction ended 3-23-18. 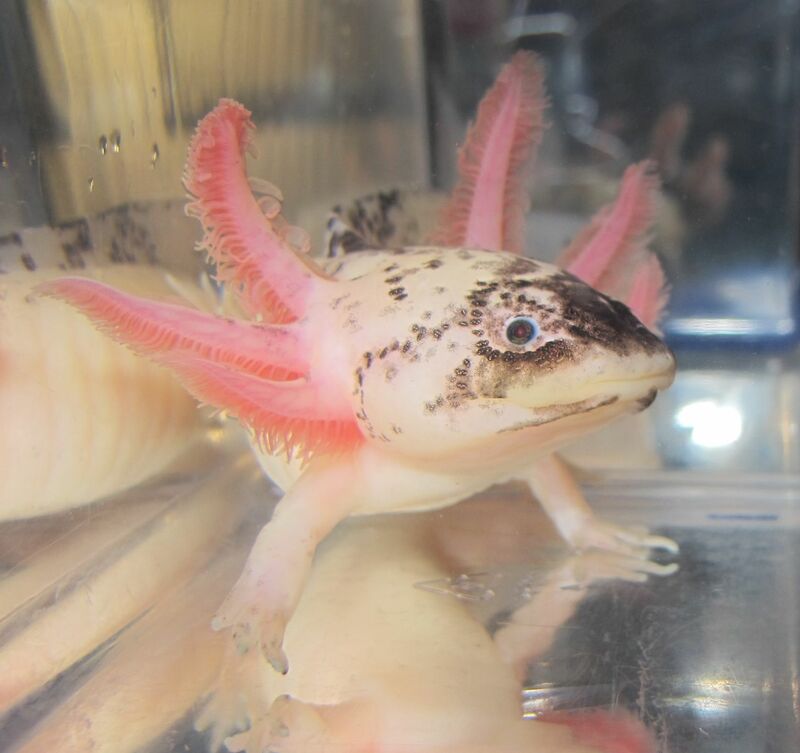 I know we're biased here, but we think this leucistic is lovely. Not only are the gills beautiful, but there's speckling in lots of interesting places. 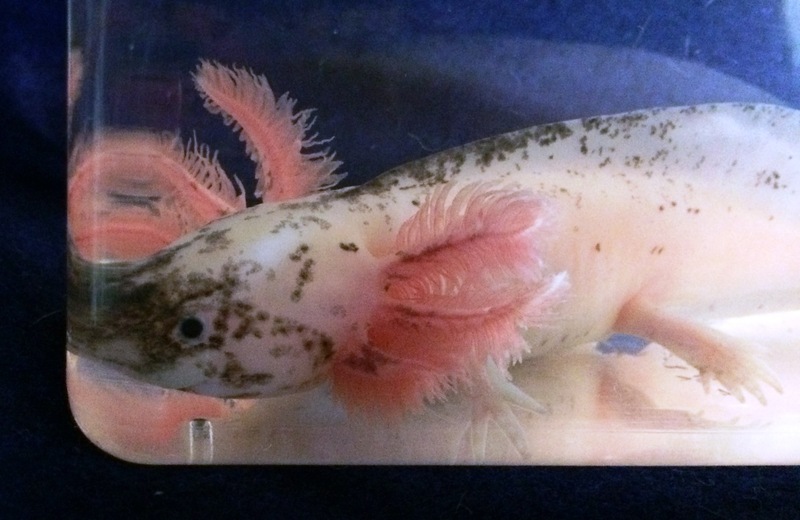 The face, of course, and all down the edge of the top and bottom fins, dark marks on the gill stalks, speckles on the legs, and even a gray, smudgy belly. 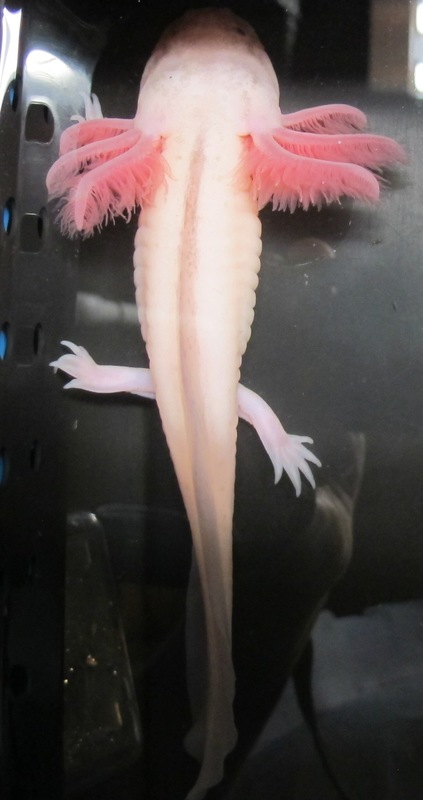 The only issue is some notches in the tail (see pictures). Length is 7-8 inches. Looks female so far, but not old enough to be sure. 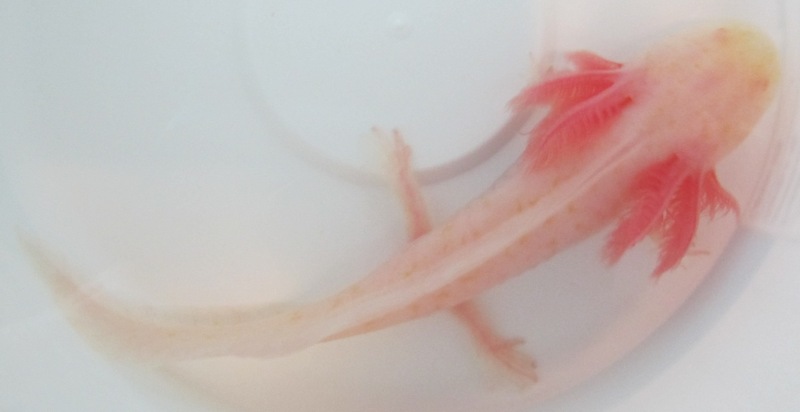 This leucistic has light speckling on the face and top fin. He/she is 6-7 inches long. 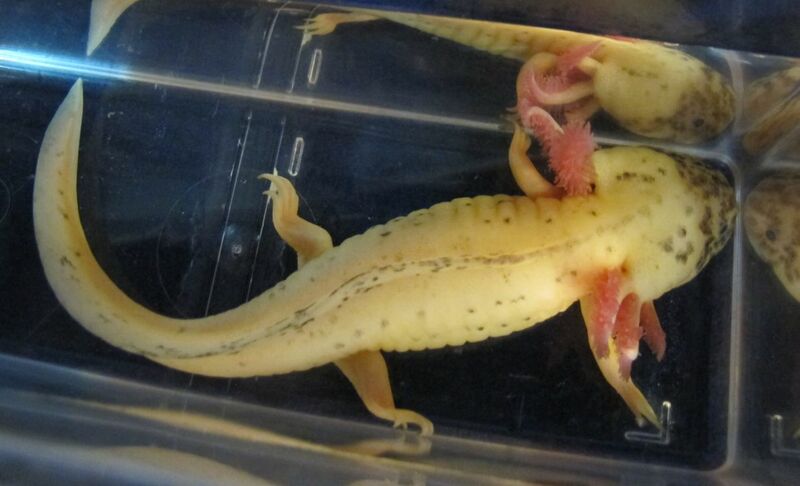 As always, the speckling might fade if he's kept over a light-colored substrate (see Colors page). 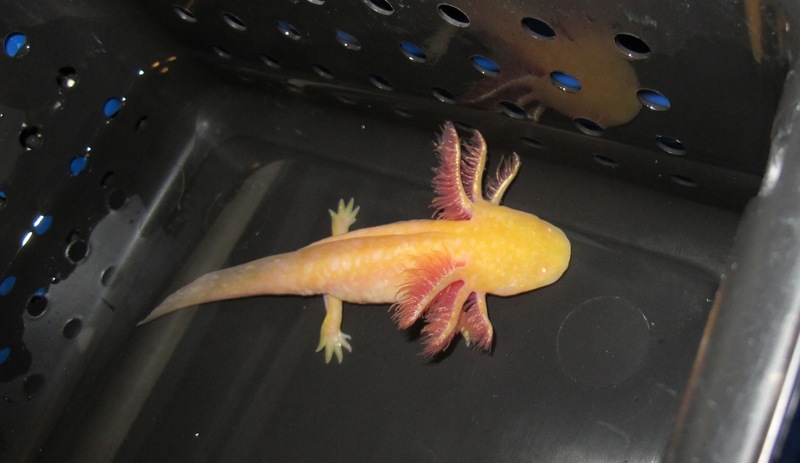 This gold albino is a medium gold color, 6-7 inches long. 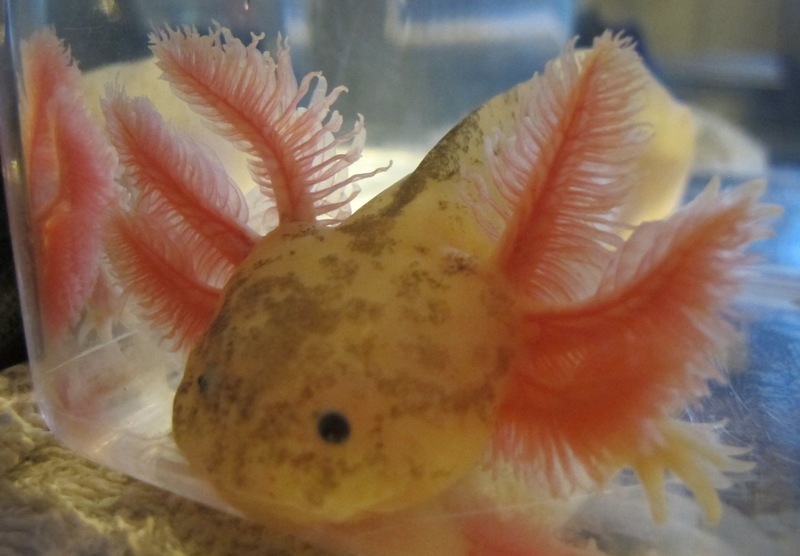 It has fabulous long, shiny gills. Price is reduced because the tail is a bit ragged. 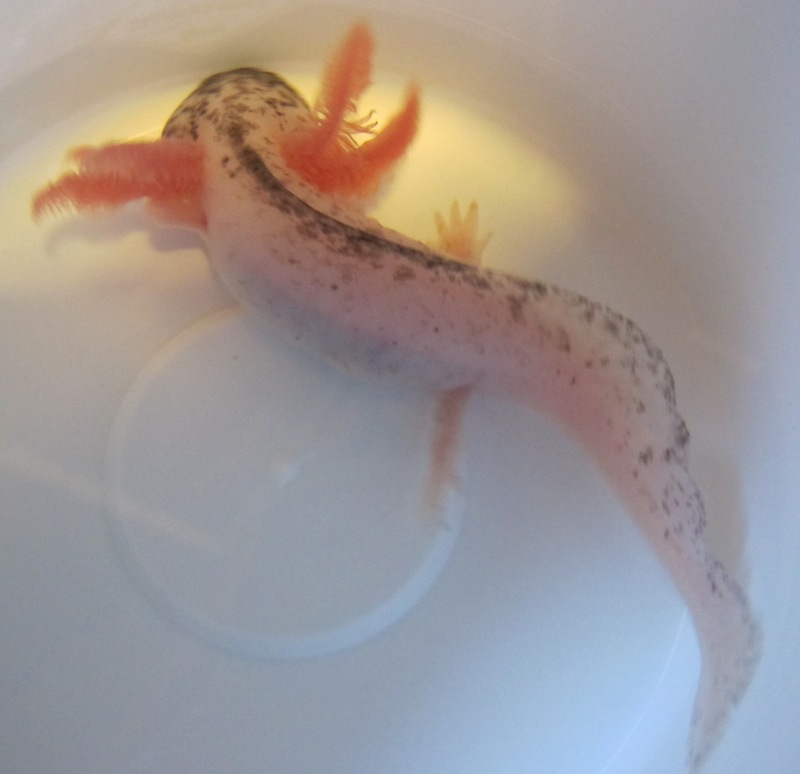 This leucistic has a lightly speckled "snout" and a little bit of smudging on the tail. He/she is a beefy 9 inches long. 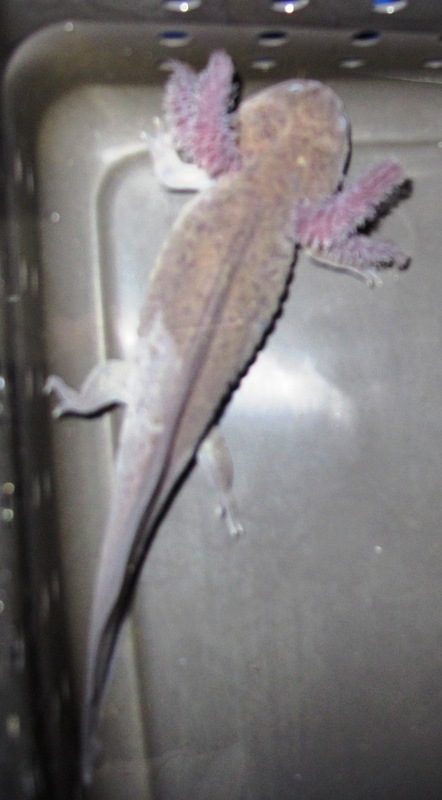 As always, the speckling might fade if he's kept over a light-colored substrate (see Colors page). 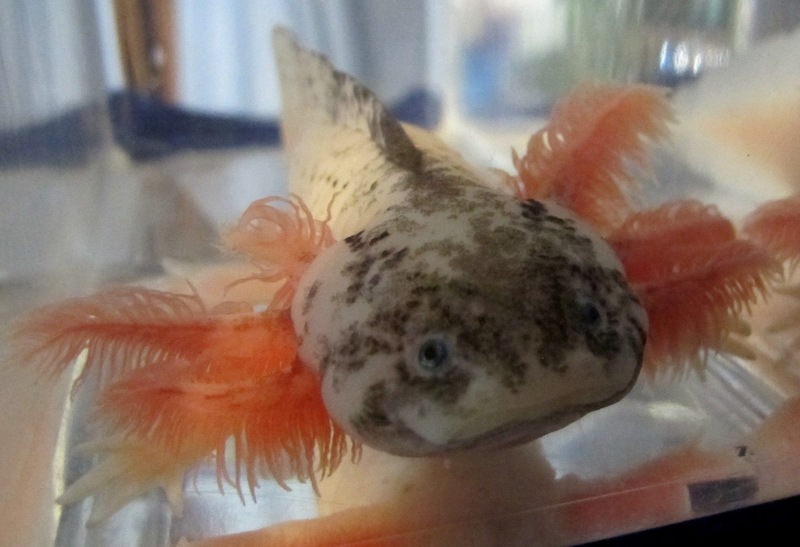 This leucistic has light speckling on the face and top fin. He/she is 6-7 inches long. Price is reduced because there is a notch in the tail fin. As always, the speckling might fade if he's kept over a light-colored substrate (see Colors page). 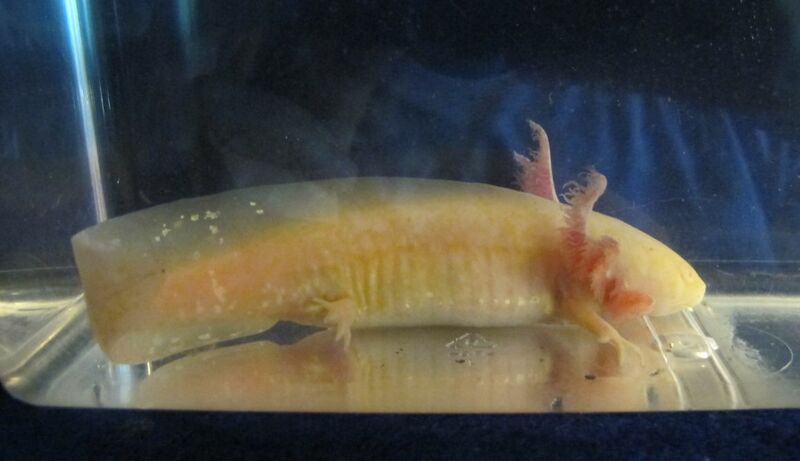 This is an albino, 4-5 inches long. I'm calling it gold, but it's a rather pale gold. If you zoom in with a camera or a magnifier, you can see there's a certain amount of small white areas mixed in with the gold. 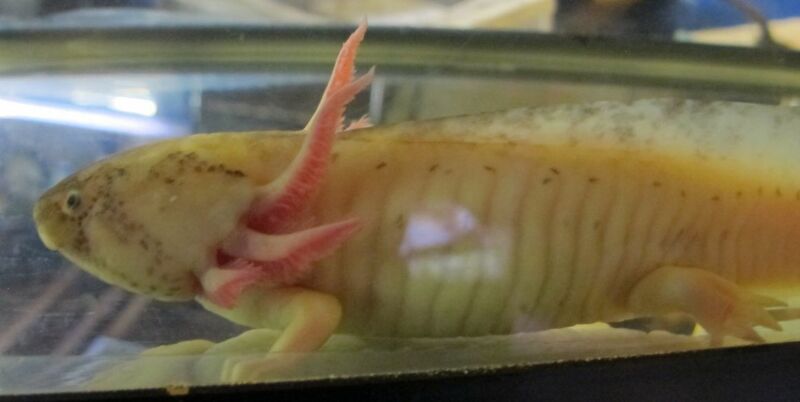 This is an albino, 4-5 inches long. I'm calling it white, but it has kind of a creamy-yellowish look to it. If you zoom in with a camera or a magnifier, you can see some small yellow spots on it. This is your basic black. 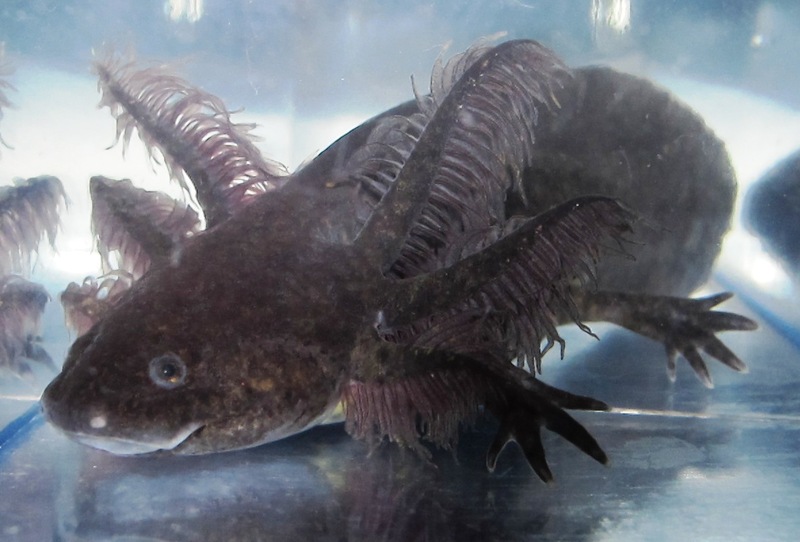 Black melanoid, that is. Approximately 4-5 inches long. Please refer to our Colors page to make sure you understand that it may fade in color if kept over a light substrate. 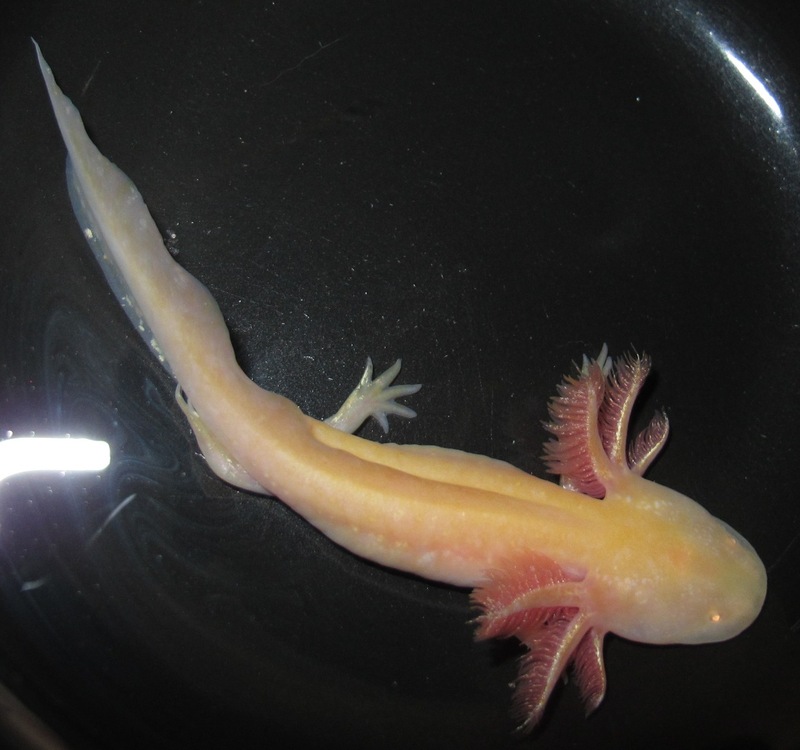 Once it's an adult, it won't be quite as affected by the color of the substrate. This one is housed over black. 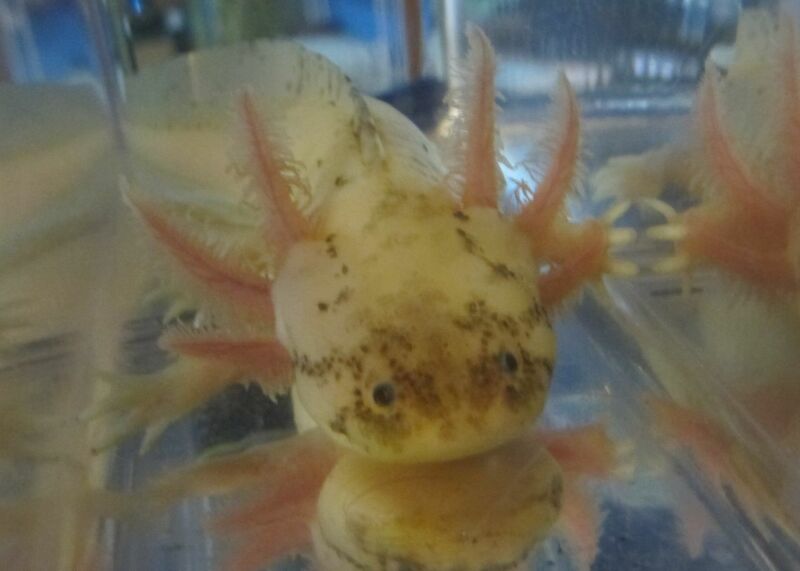 This albino can't decide if he wants to be gold or white. He/she is 5-6 inches long. I'm calling it gold, but it has kind of a creamy/pale yellowish look to it. If you zoom in with a camera or a magnifier, you can see that it has a lot of white marbled in with the gold. If you like oddballs, you might like this one. Interesting rather than flashy. Price reduced because the tail is a bit ragged. 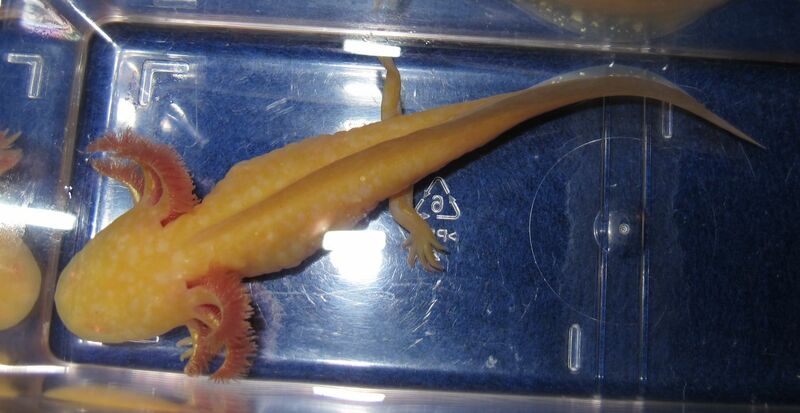 This is a pretty gold albino, approximately 5 inches long. 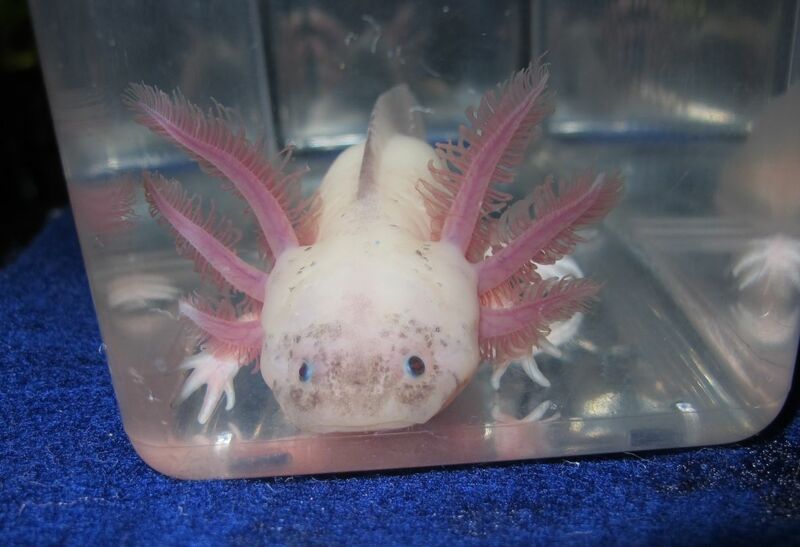 It has gorgeous long gills that are extra shiny. 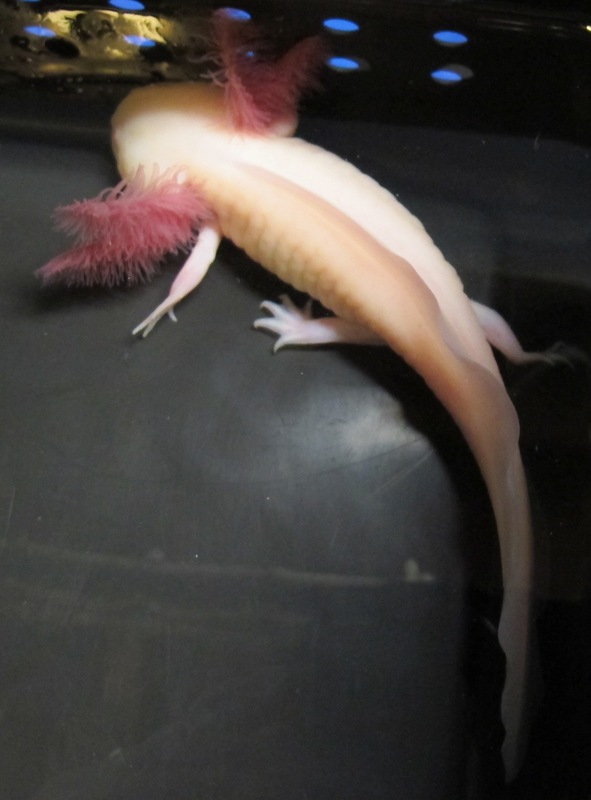 Unfortunately, it has a ragged tail (see pictures). 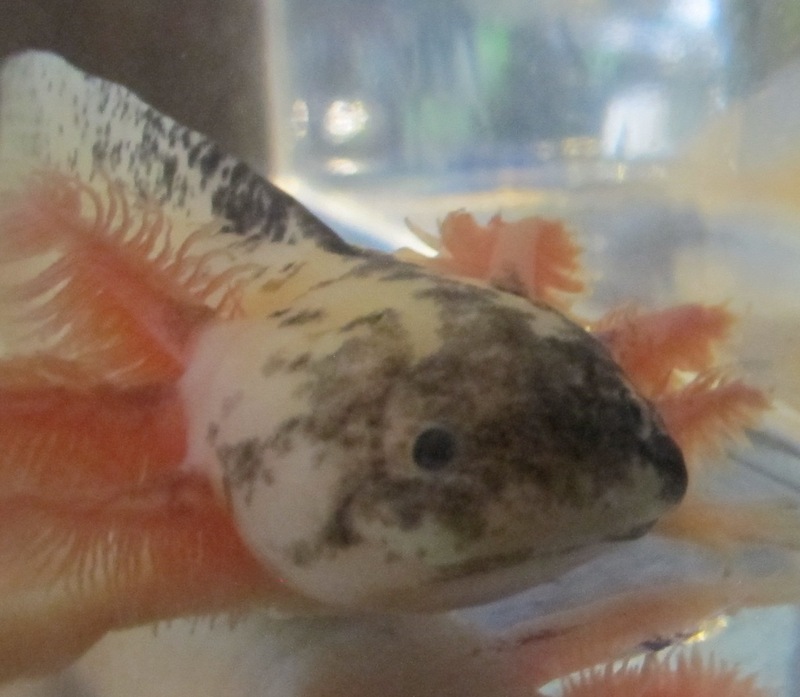 This leucistic has light gray speckling and is 6-7 inches long. Price is reduced because there's a notch in the tail. 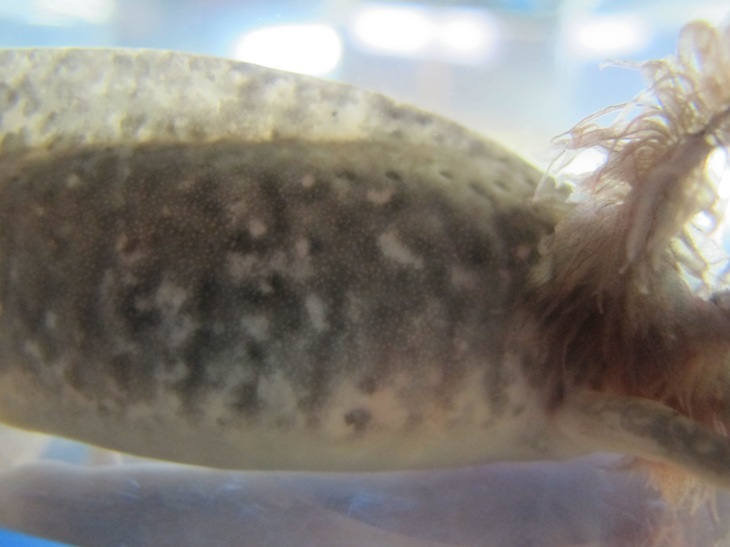 As always, if you put it over a light-colored substrate, the speckling will fade. This one is currently housed over black. 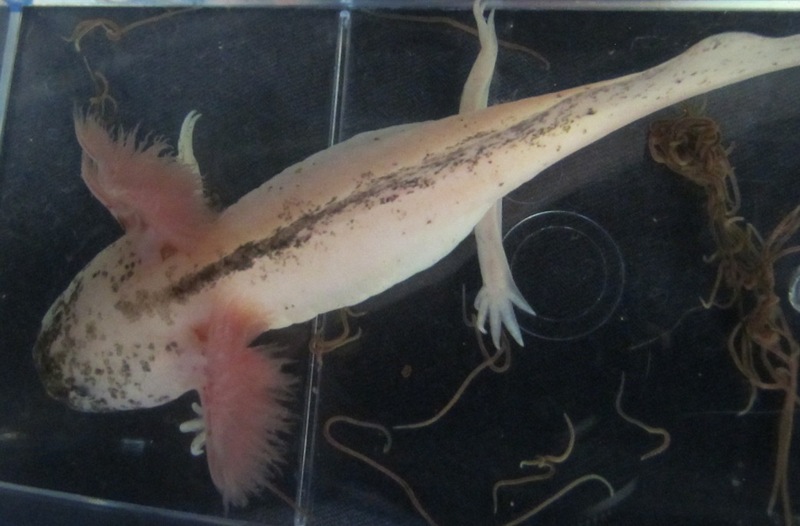 This leucistic has light speckling and nice gills. He/she is 7-8 inches long. 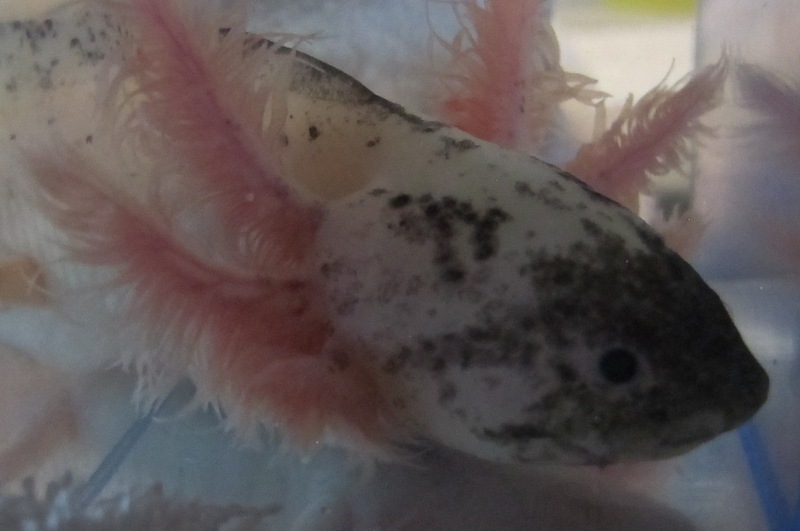 As always, if you put it over a light-colored substrate, the speckling will fade. This one is currently housed over black. 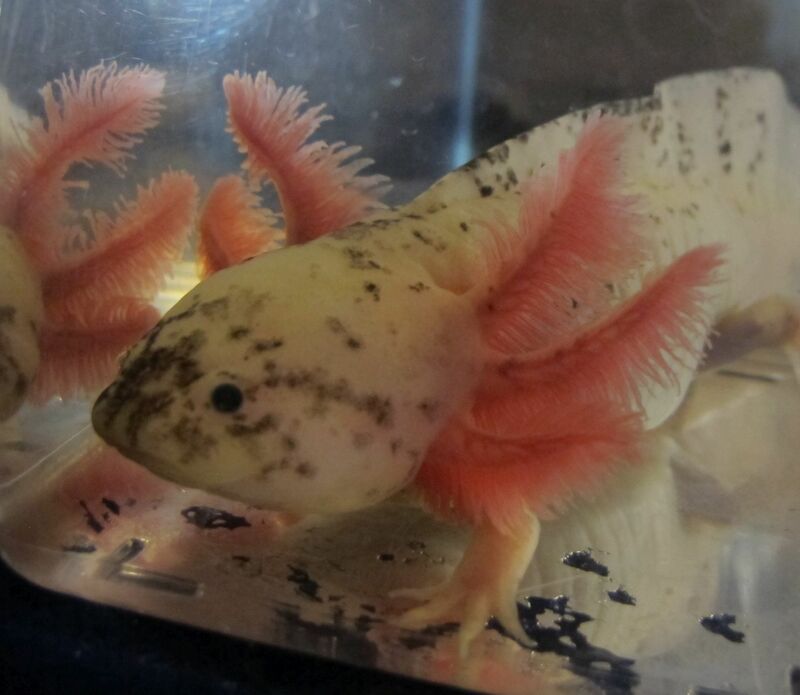 This leucistic has light speckling and is 6-7 inches long. As always keep over black substrate to maximize the speckling. This leucistic is barely speckled. It's approximately 6 inches long. Price is reduced because the tail is a little ragged. 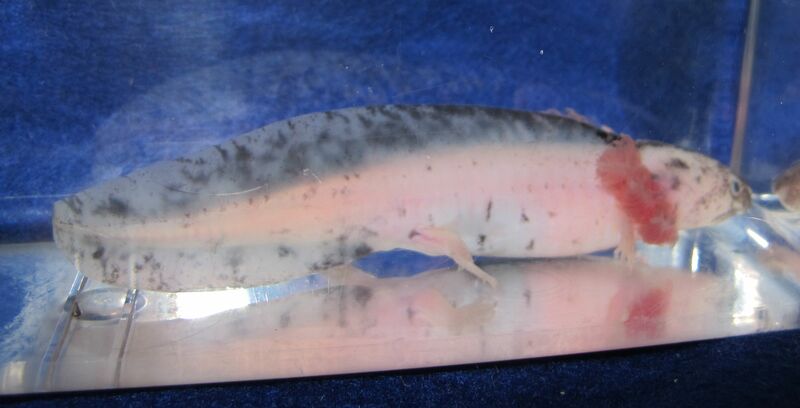 As always, if you put it over a light-colored substrate, the speckling will fade. This one is currently housed over black. This is a very beautiful speckled leucistic. 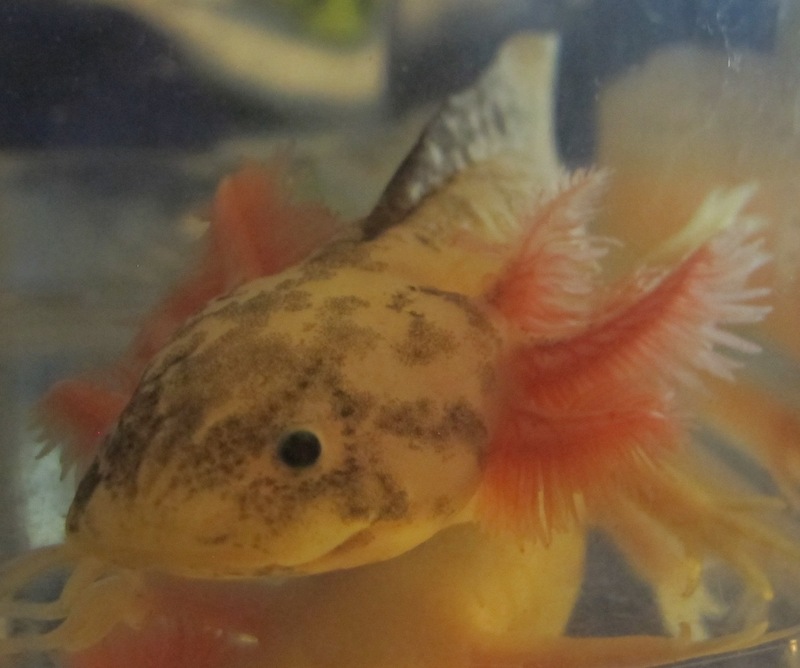 He/she is 7-8 inches long and has a great face and a speckled top fin. 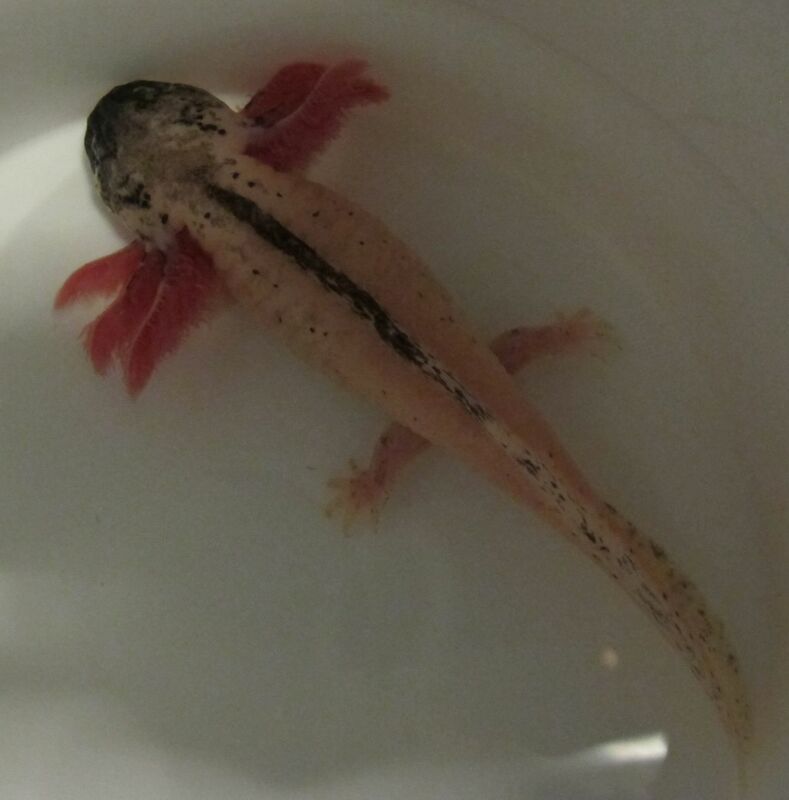 He also has black flecks on his sides and tail. 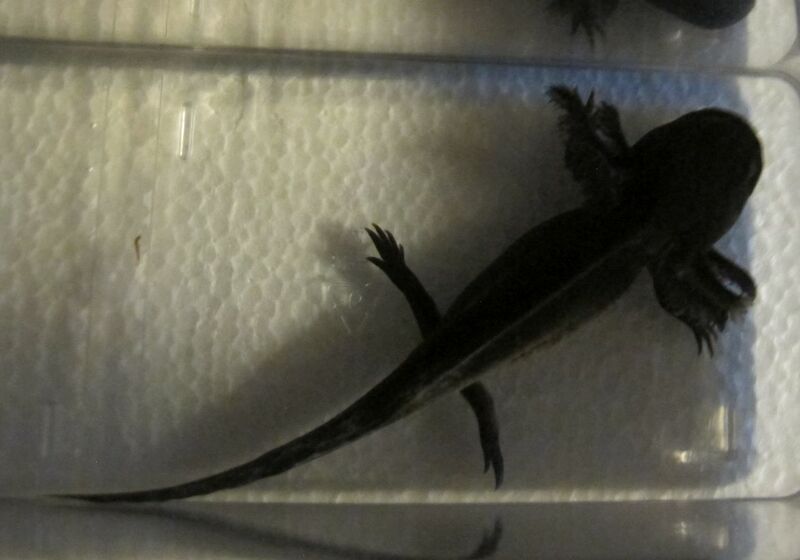 Price is reduced because there are a couple of notches in the tail fin and one of the gills is short (see pictures). 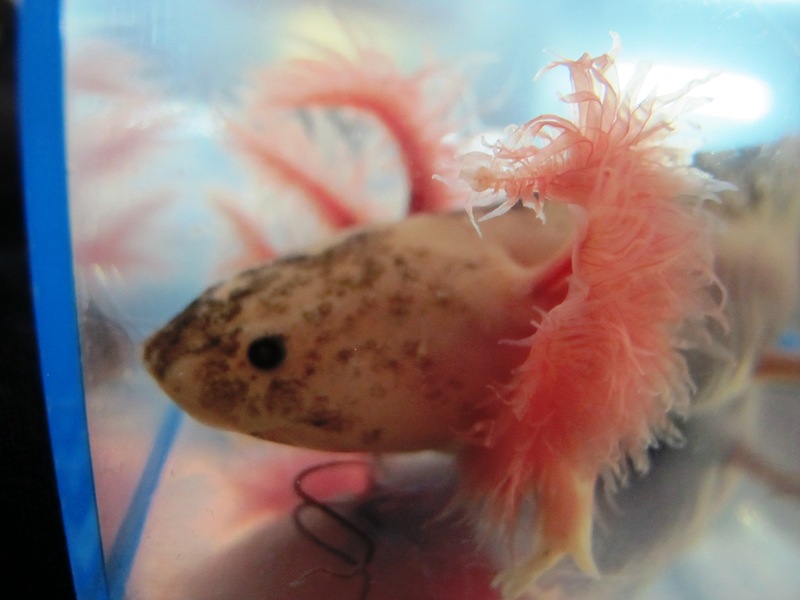 As always, if you put it over a light-colored substrate, the speckling will fade. This one is currently housed over black. 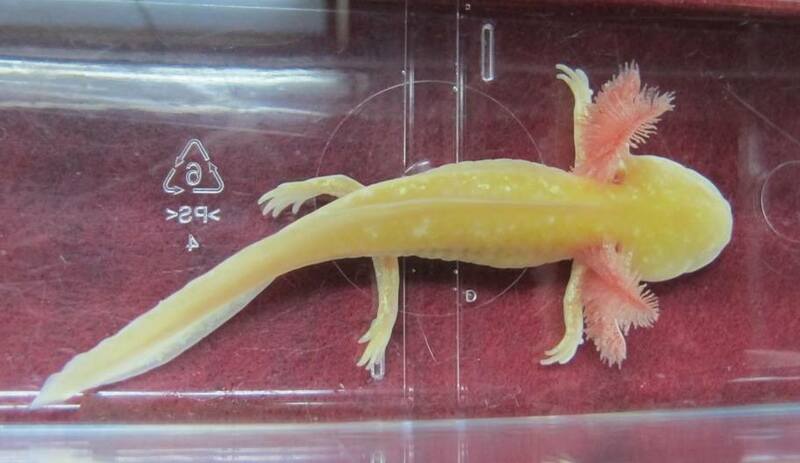 This is an albino, 4 inches long. I'm calling it white, but it has kind of a creamy-yellowish look to it. If you zoom in with a camera or a magnifier, you can see some small yellow spots on it. 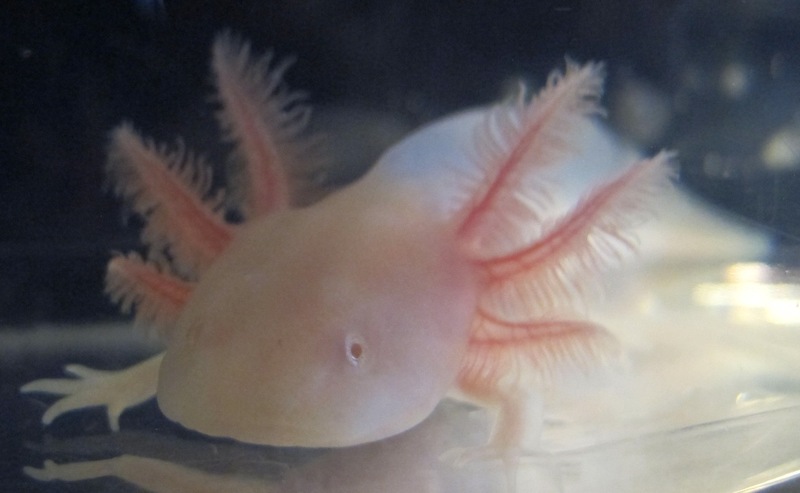 This is an albino, approximately 5 inches. I'm calling it white, but it has kind of a creamy-yellowish look to it. If you zoom in with a camera or a magnifier, you can see some small yellow patches on it. It will be interesting to see what this one looks like as an adult. 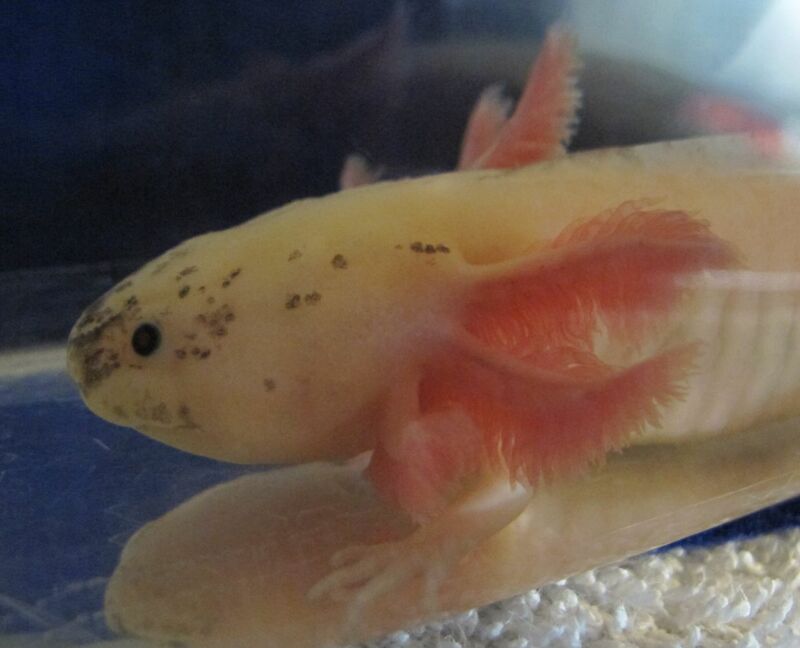 This is an albino, approximately 4 inches. I'm calling it white, but it has kind of a creamy-yellowish look to it. If you zoom in with a camera or a magnifier, you can see some small yellow patches on it. Interesting rather than flashy. 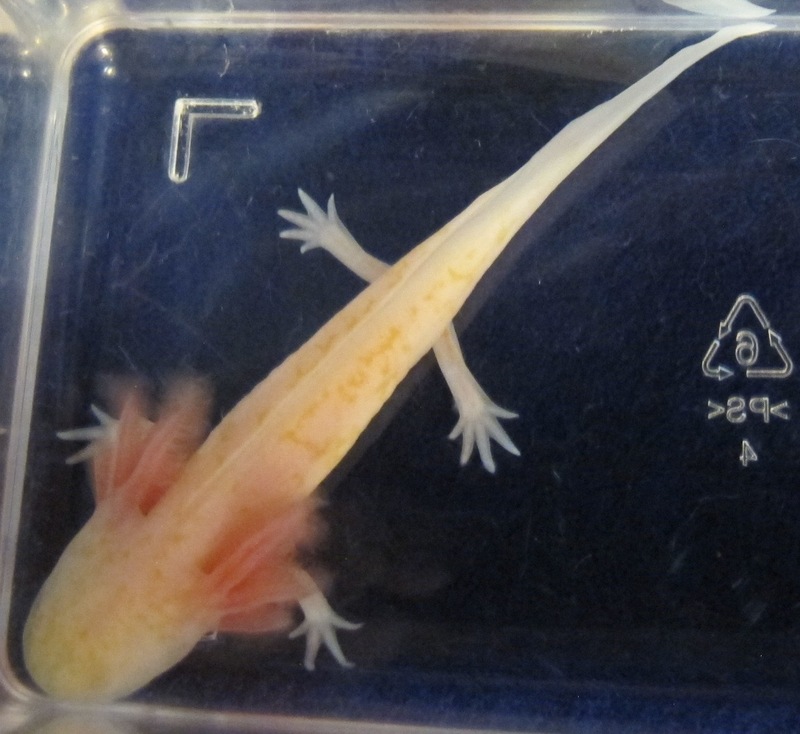 Here's a pretty little RLG albino. I'm calling it white, but it has kind of a creamy-yellowish look to it, especially the face. If you zoom in with a camera or a magnifier, you can see some small yellow spots on it. 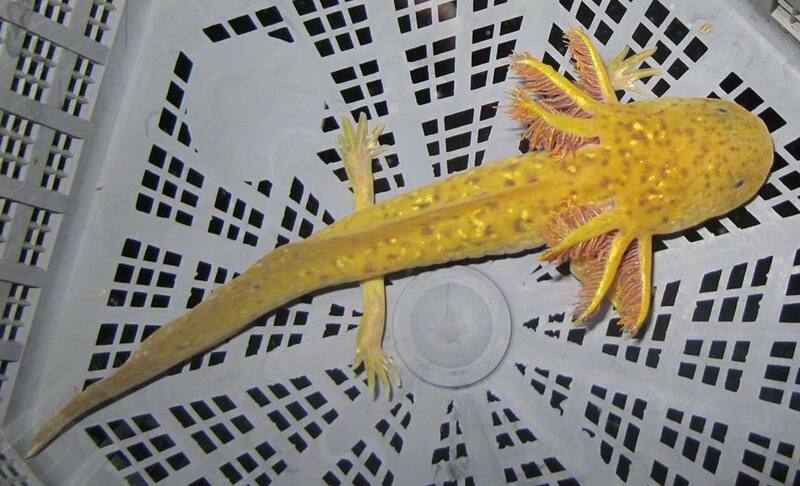 It's 5-6 long and has gorgeous gills. Here's another nice speckled leucistic. 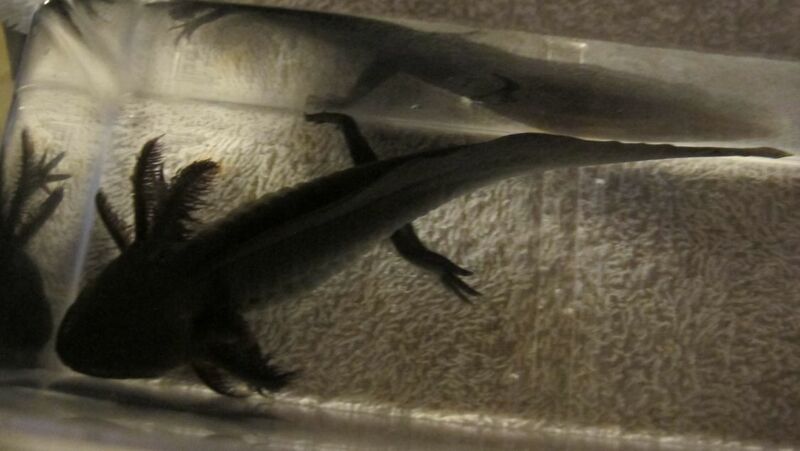 He/she is 7-8 inches long with a dark face. Light speckles run down the top and bottom of the tail fin. As always, if you put it over a light-colored substrate, the speckling will fade. This one is currently housed over black. Here's a nice little speckled leucistic. 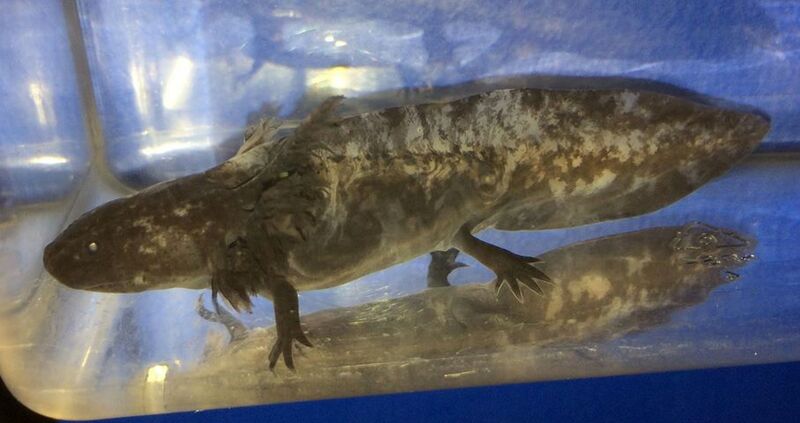 Approximately 7 inches long. Price is reduced because the tail is a little ragged. As always, if you put it over a light-colored substrate, the speckling will fade. This one is currently housed over black. This is a gorgeous speckled leucistic. He/she is 7-8 inches long with lots of dark. 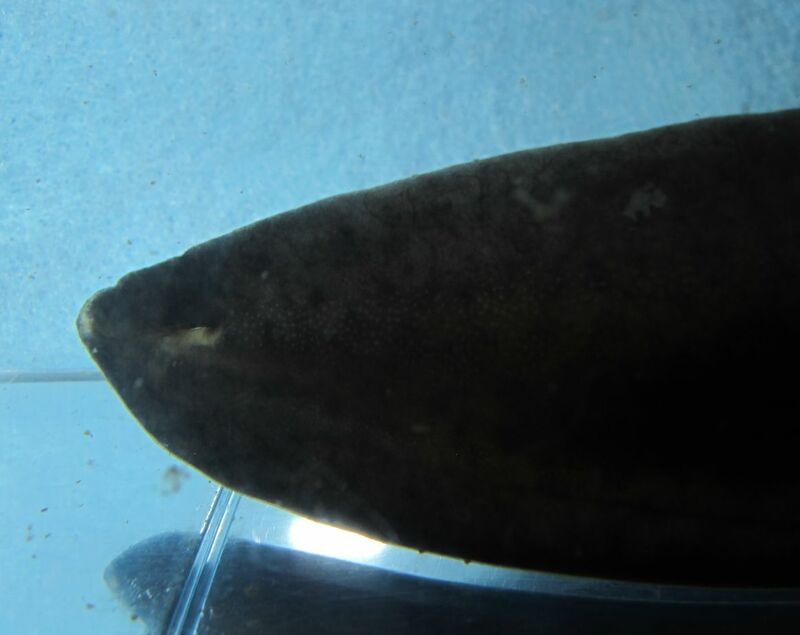 Dark face, dark markings down the top of the tail fin, dark markings down the bottom of the tail fin, dark flecks on the sides, and even (if you look closely) some dark specks on the legs. As always, if you put it over a light-colored substrate, the speckling will fade. It would be a shame to let this one fade! This one is currently housed over black. 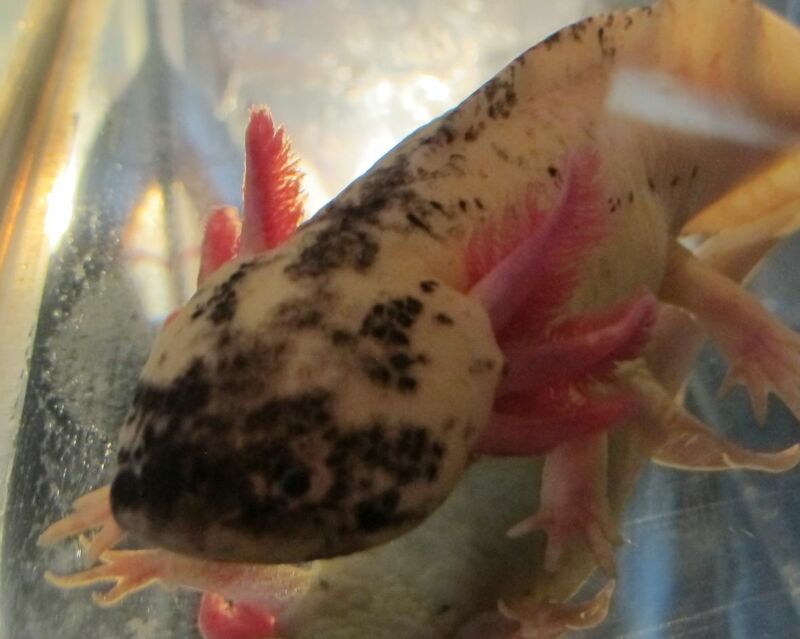 This leucistic has light speckling. 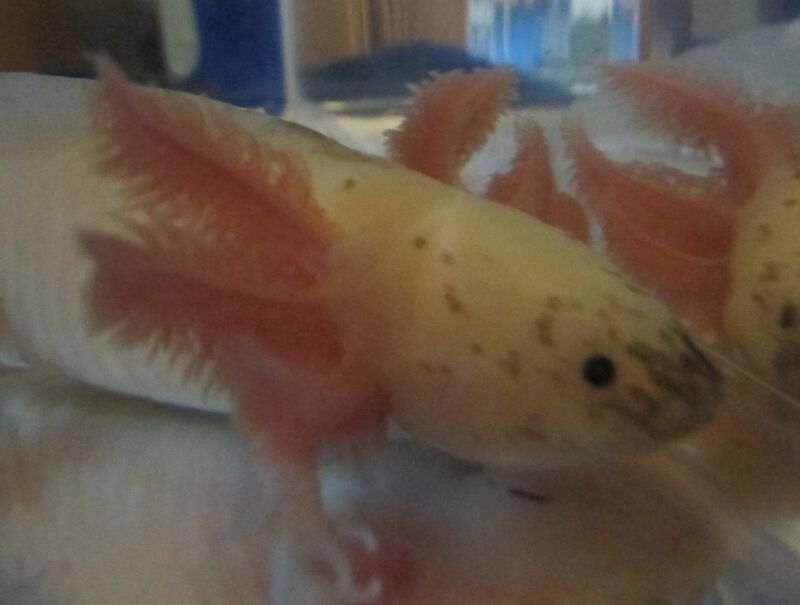 The gills are nice, but not completely even on both sides. He/she is just over 6 inches long. As always, if you put it over a light-colored substrate, the speckling will fade. This one is currently housed over black. The speckling on this leucistic is light -more gray than black. 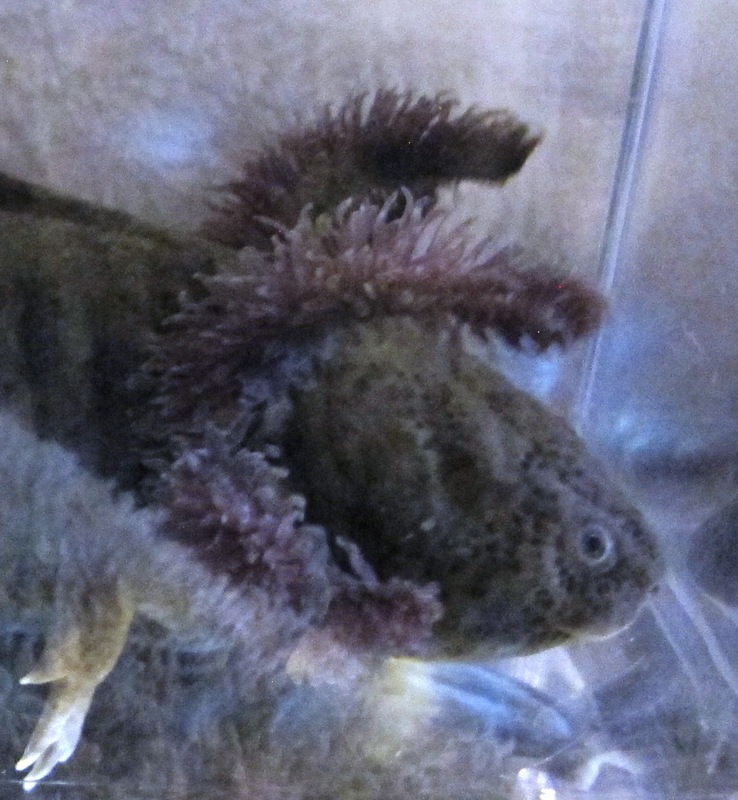 It has nice fluffy gills and is about 7 inches long. As always, if you put it over a light-colored substrate, the speckling will fade. This one is currently housed over black. 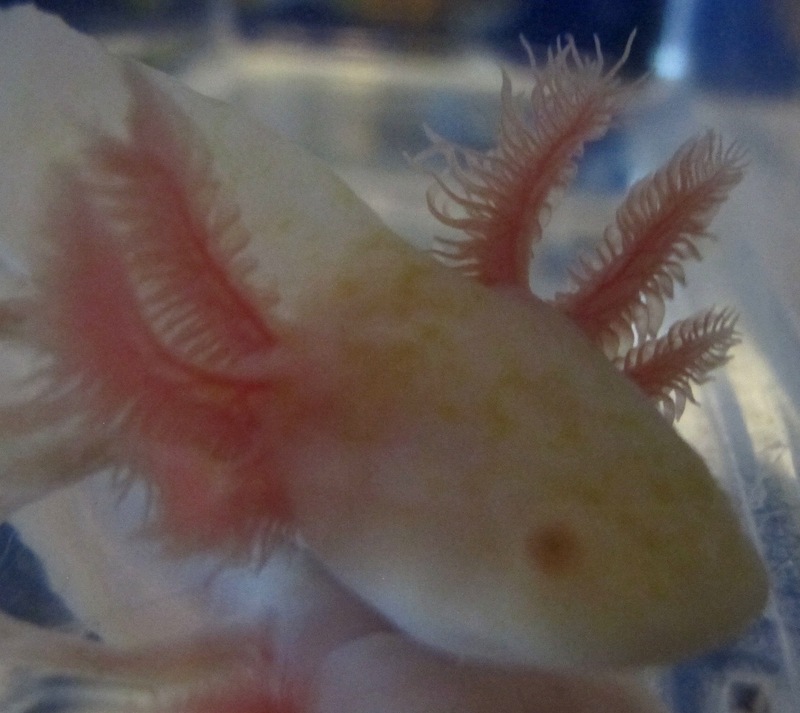 This leucistic has some light speckling, but it's the gills that are the most eye-catching. 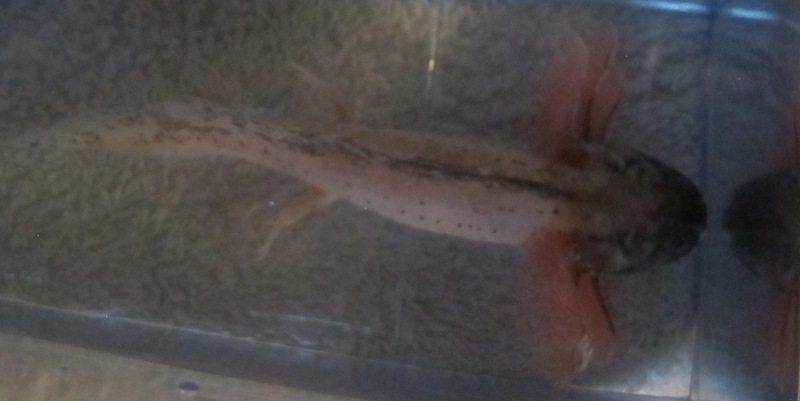 It's approximately 7.5 inches long (gender unknown). 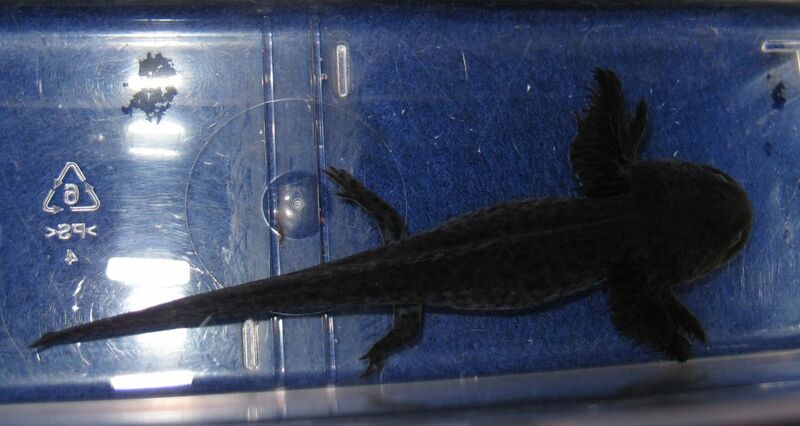 As always, if you put it over a light-colored substrate, the black speckling will fade. This one is currently housed over black. 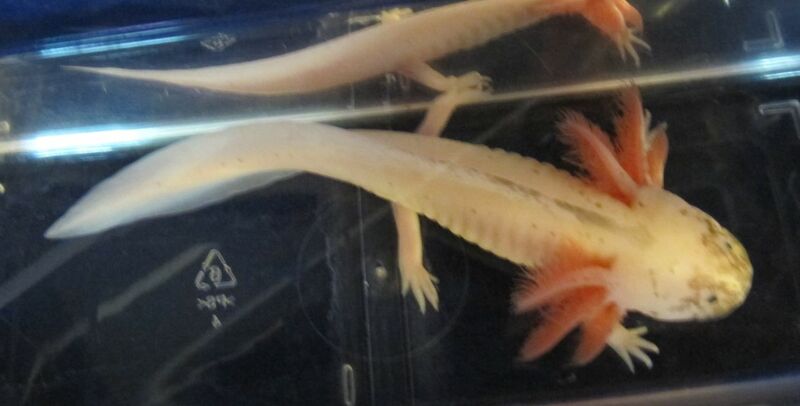 This leucistic is 6-7 inches long. It has light speckling all the way down its top fin. Price is reduced because the gills are not even on both sides. As always, keep it over black substrate to maximize the speckling. If you put it over a light substrate, the speckling will fade. 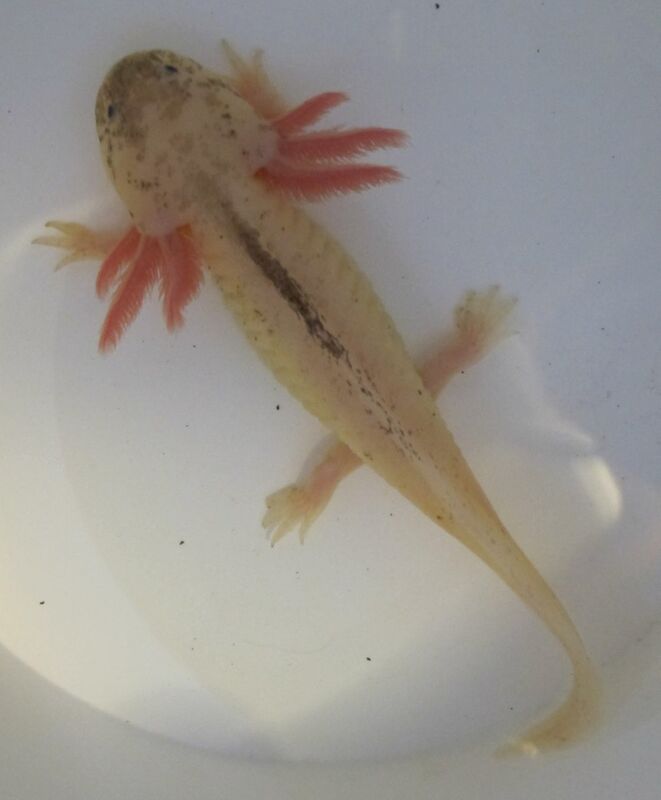 This is a cute little gold albino with lots of iridophores on the body and very shiny gills. Approximately 4.5-5 inches long. Here's a nice little black melanoid. 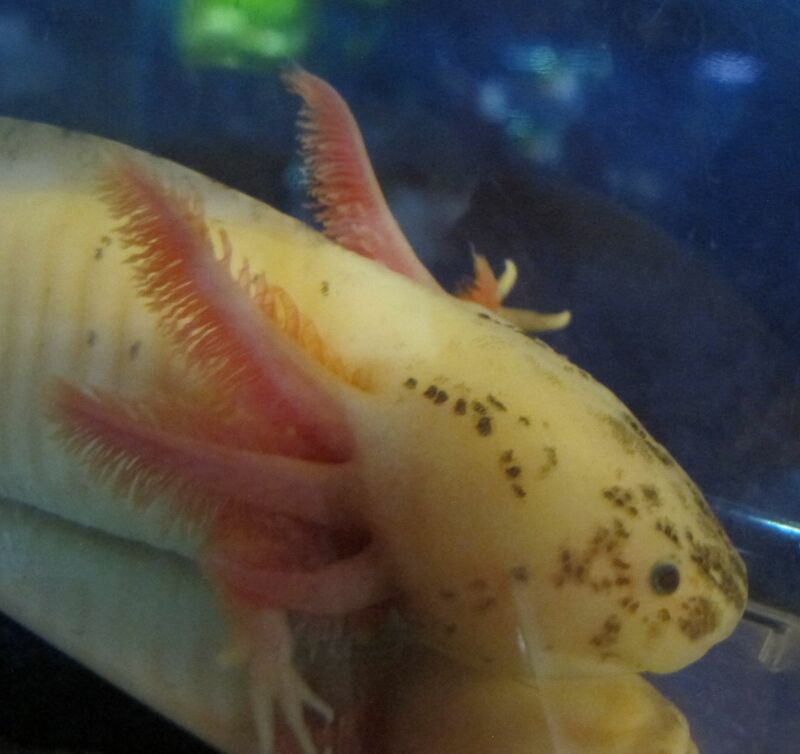 Approximately 6 inches long. 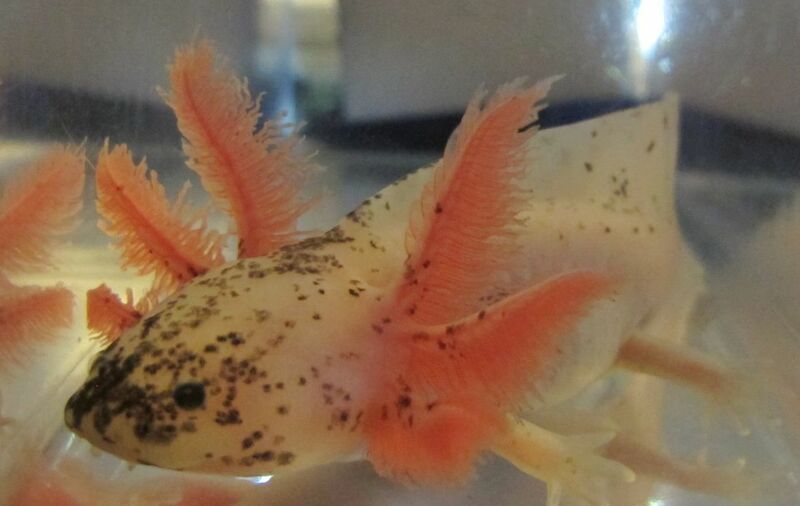 He/she has nice fluffy gills. As always, keep it over a black substrate if you want it to stay dark like this (see Colors page for more info.). 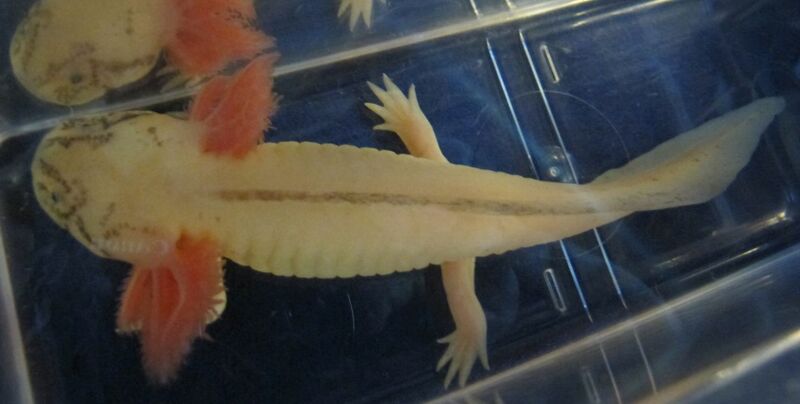 Beautiful gills on this white albino. He/she is about 6 inches long. 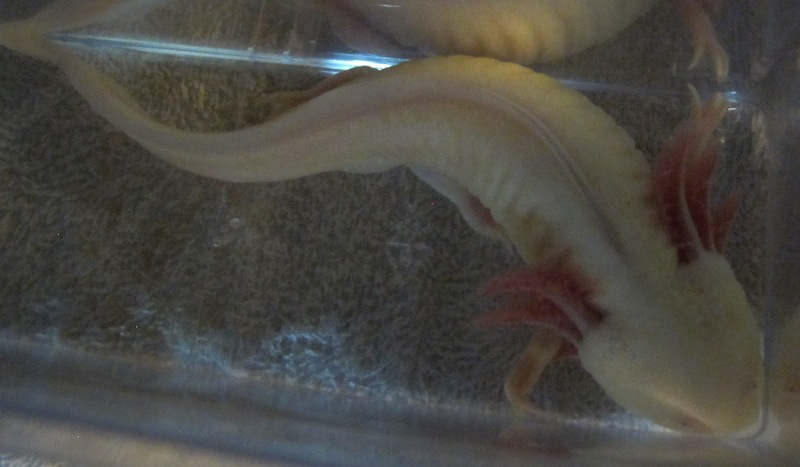 This white albino is approximately 7 inches long. 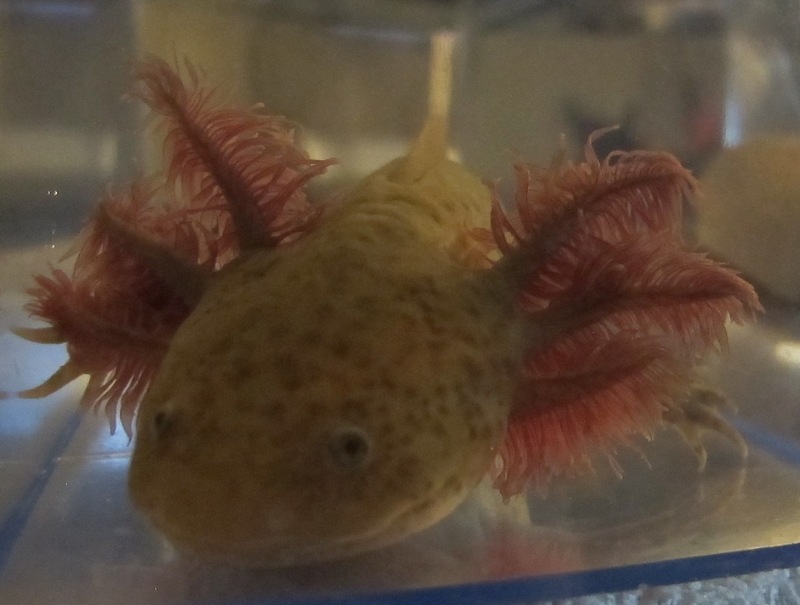 Price reduced because his/her tail is a bit torn, but look at that beautiful face! 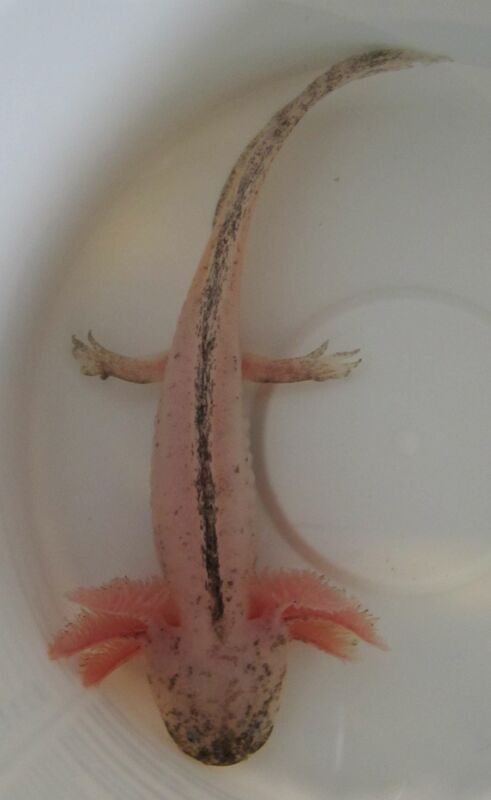 This leucistic has some nice speckling and is approximately 6 inches long. As always keep over black substrate to maximize the speckling. 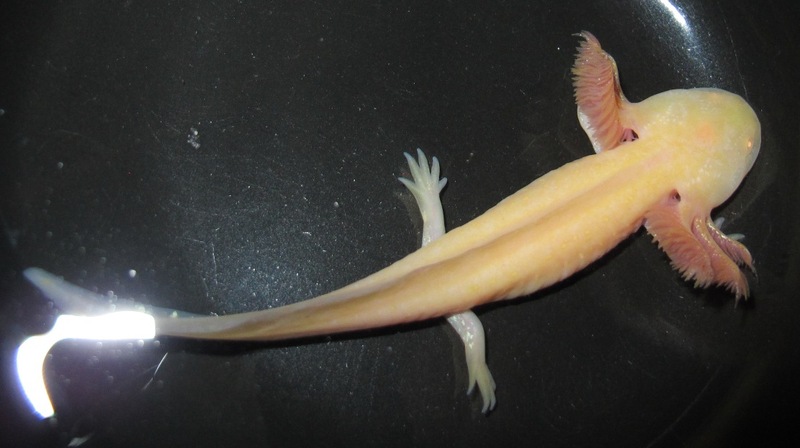 This gold albino is approximately 6 inches long. 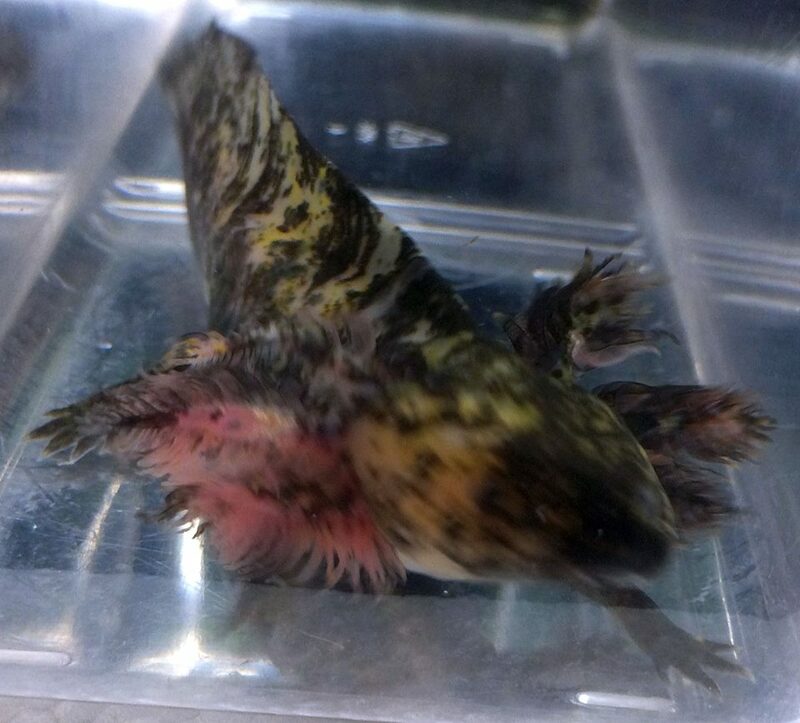 He/she has a nice strong gold color. Price is reduced because he tore a piece out of his tail fin. 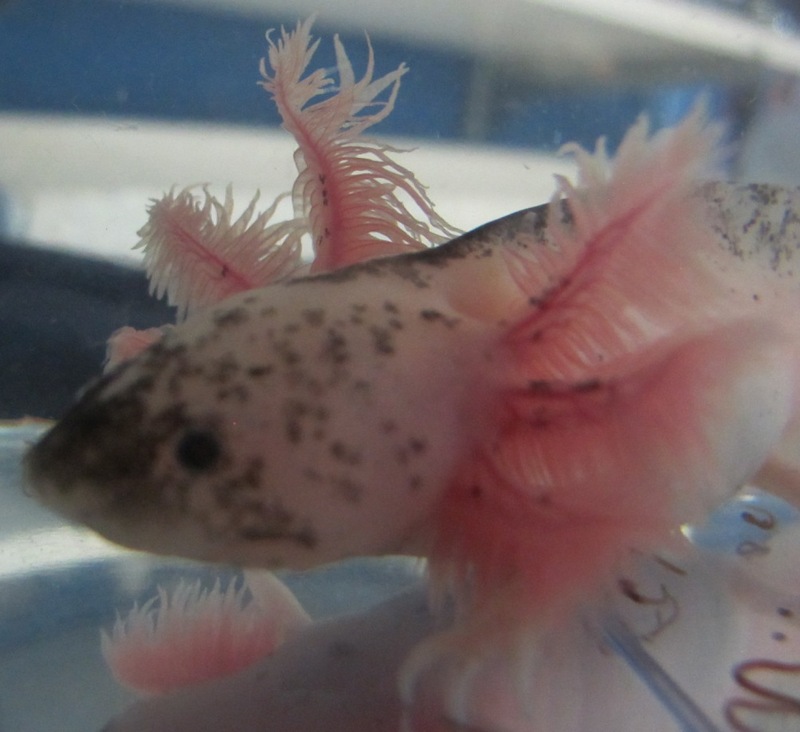 This speckled leucistic has some notches in his tail (see pictures). He/she also has some light speckling on the face and back. Approximate size is 6-7 inches. As always, keep over a dark substrate if you don't want the speckling to fade. 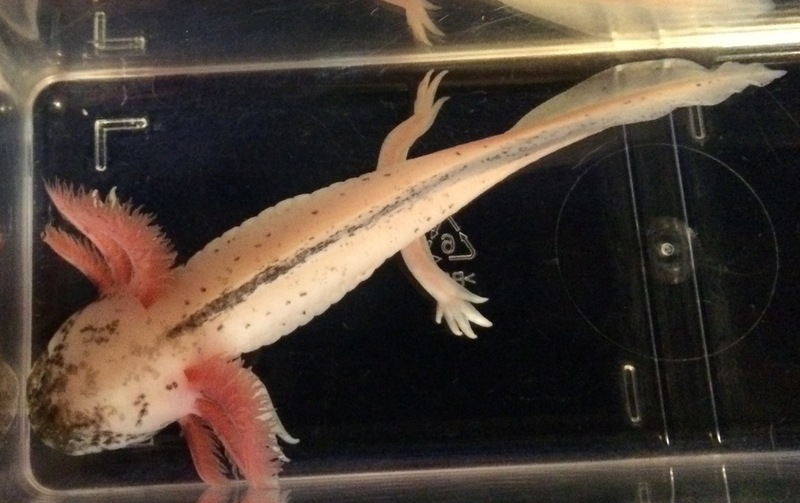 For your viewing pleasure - here's an attractive speckled leucistic that's approximately 7 inches long. 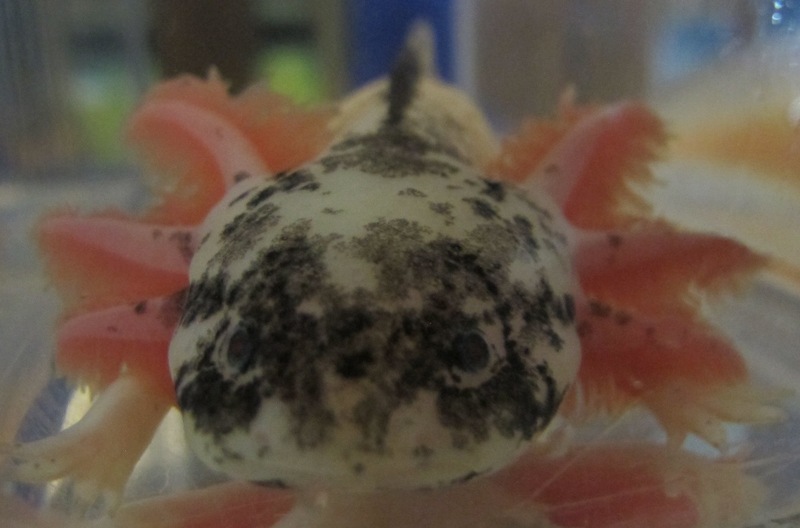 As always, if you put it over a light-colored substrate, the black speckling will fade. This one is currently housed over black. 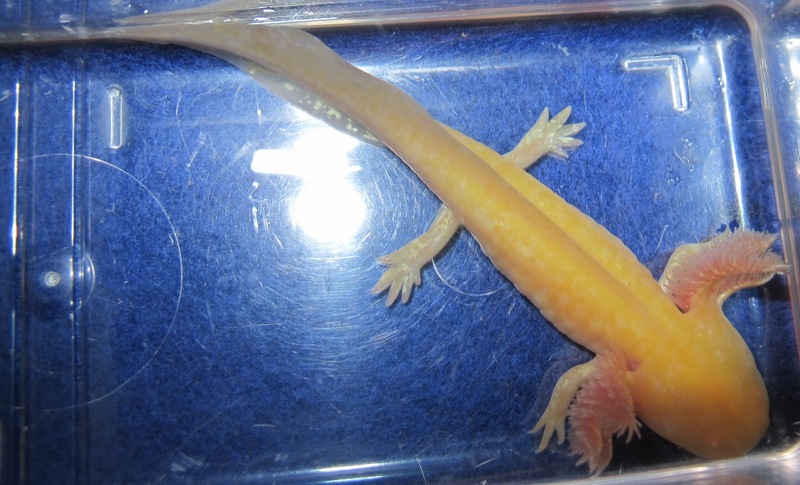 Here's a nice little gold albino that's approximately 5 inches long. 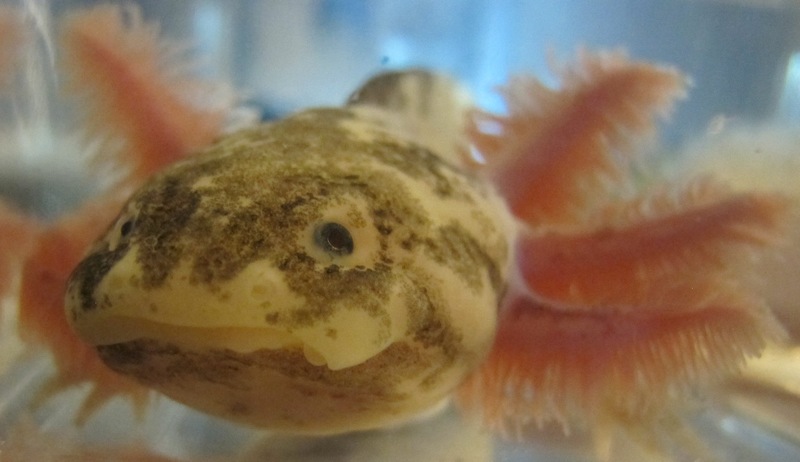 This leucistic has light speckling and nice gills. Price is marked down because his/her tail is a bit ragged. 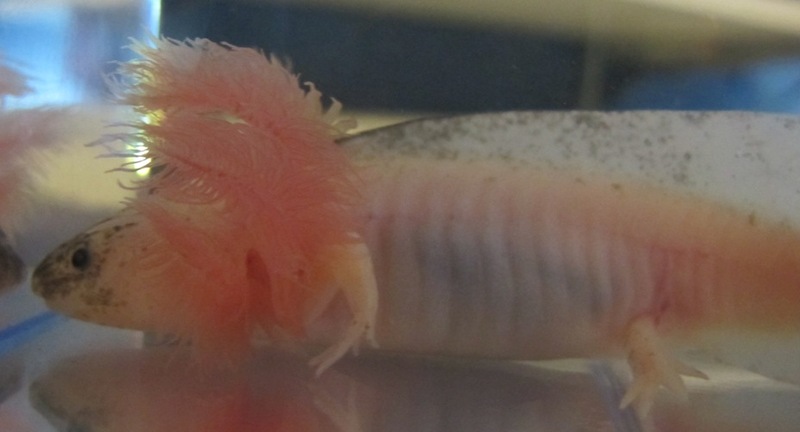 He/she is approximately 6 inches long. As always, if you put it over a light-colored substrate, the speckling will fade. Here's a very nicely speckled leucistic. It's approximately 7 inches long. 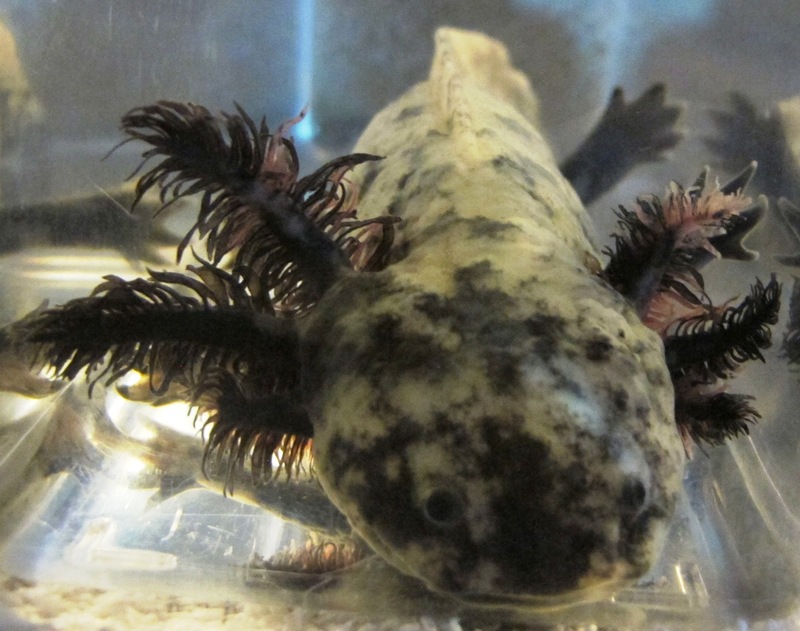 As always, if you put it over a light-colored substrate, the black speckling will fade. This one is currently housed over black. This leucistic has some nice speckling. 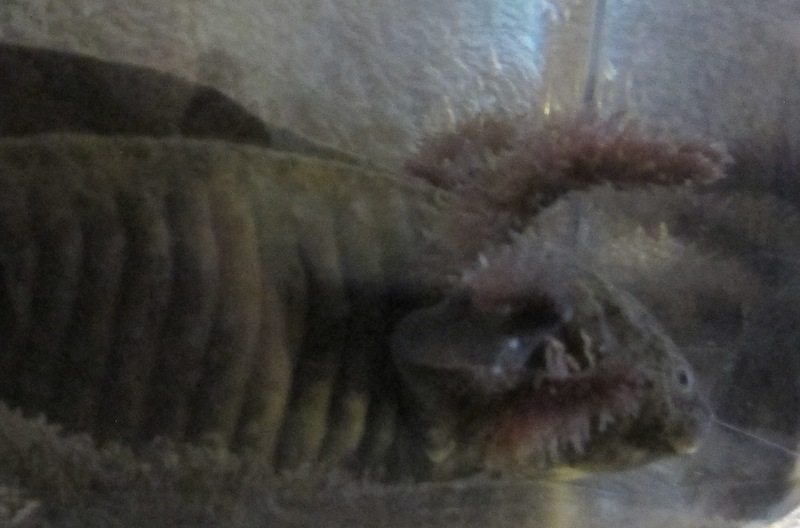 The gills are not even on both sides of its head (see the pictures). It's about 6.5 inches long. As always, if you put it over a light-colored substrate, the speckling will fade. This one is currently housed over black. 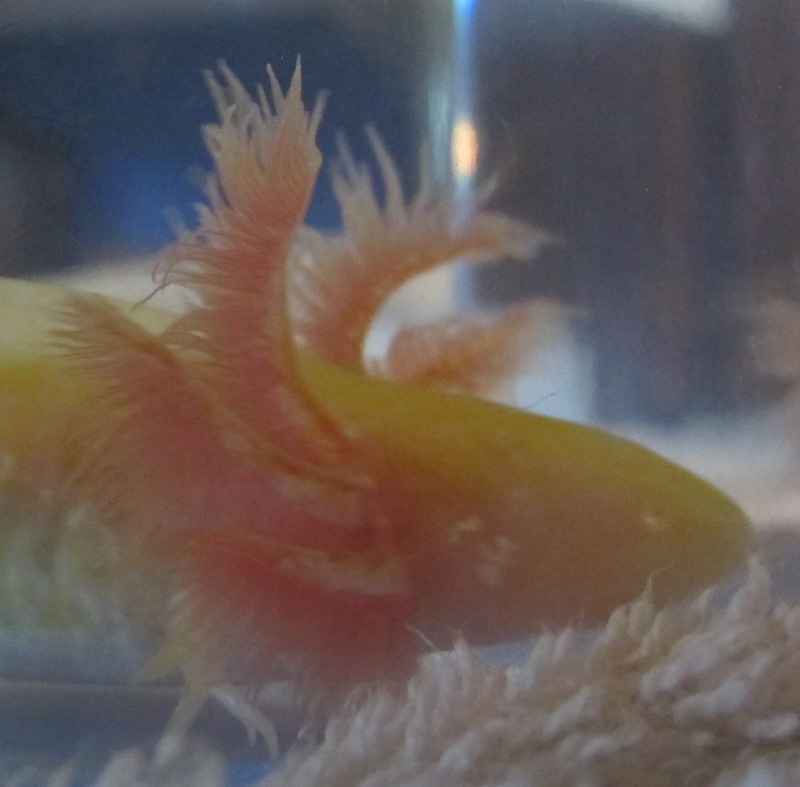 This pretty little gold albino is approximately 5 inches long. 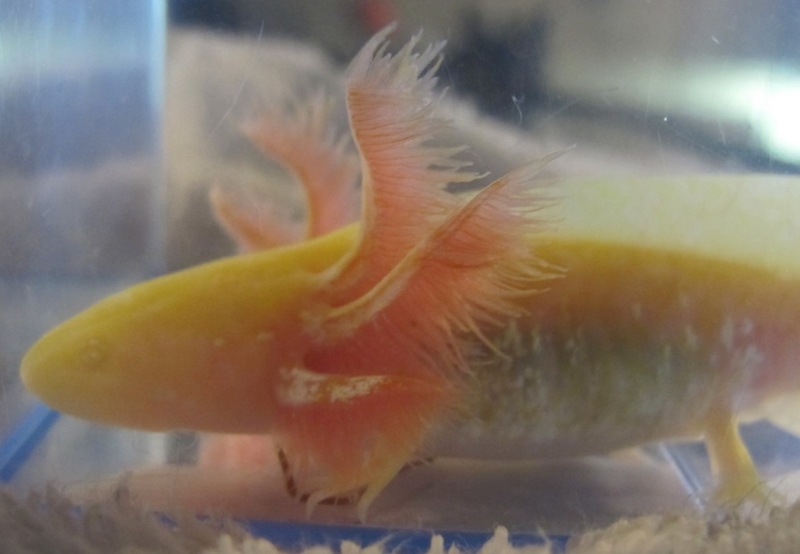 This gold albino is approximately 5 inches long. 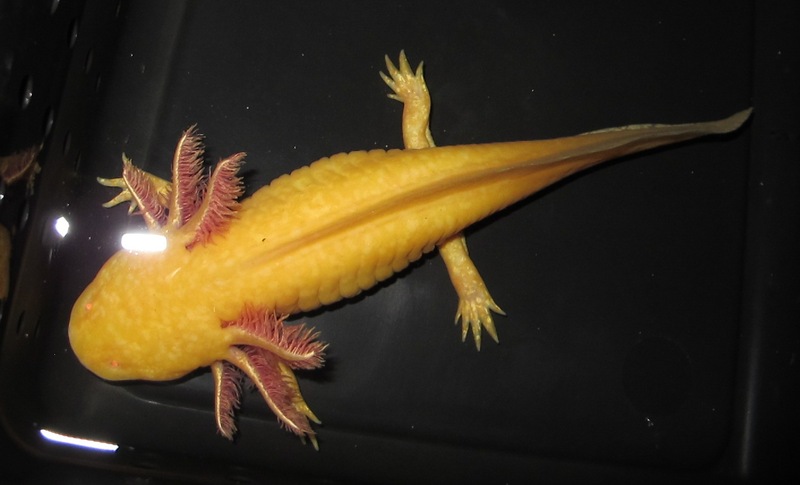 Nice gills and a medium gold color. Very pretty. 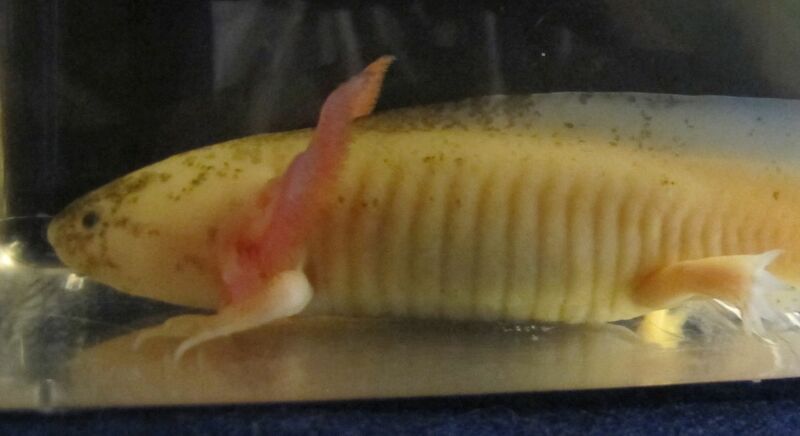 This gold albino is approximately 5 inches long. 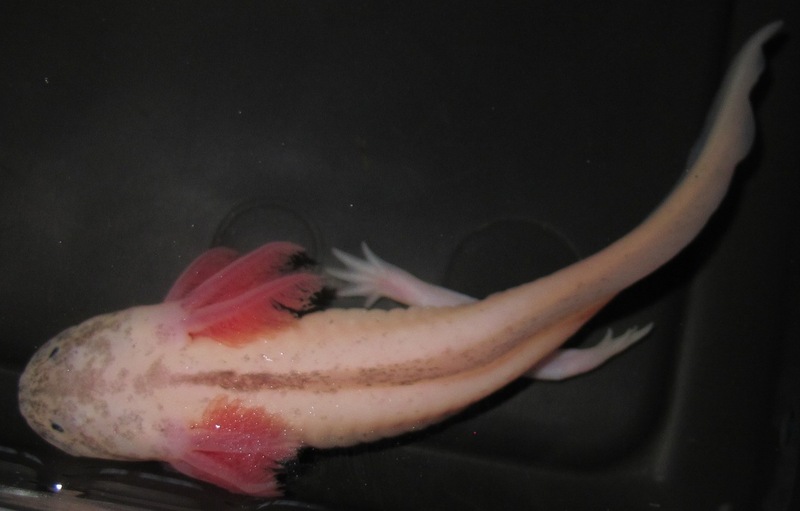 The tail fin is a little bit ragged, but maybe you'll forgive him/her when you see the gills, which are extra-long and shiny! 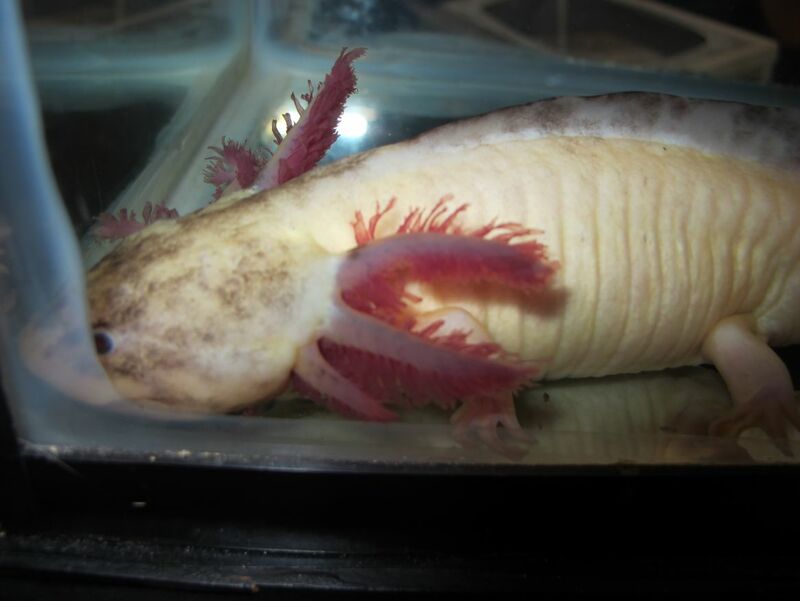 This leucistic is approximately 6 inches long. 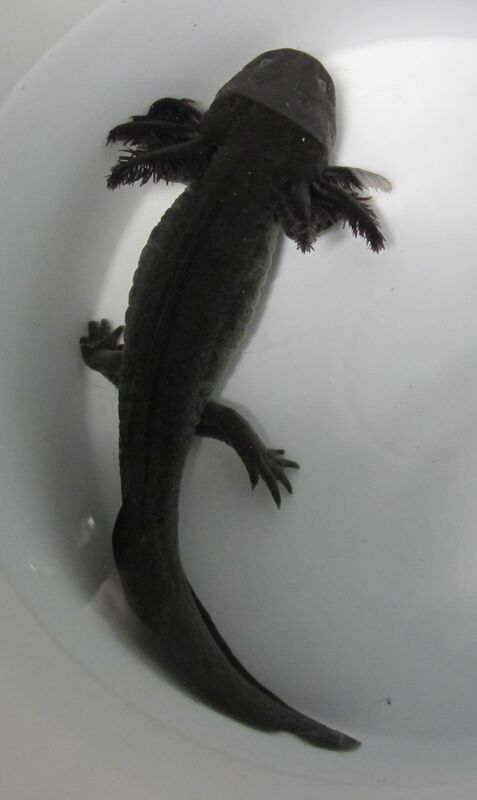 Nice gills and some light speckling. As always, the specklng will fade if you keep it over a light substrate. This speckled leucistic is just under 6 inches long. 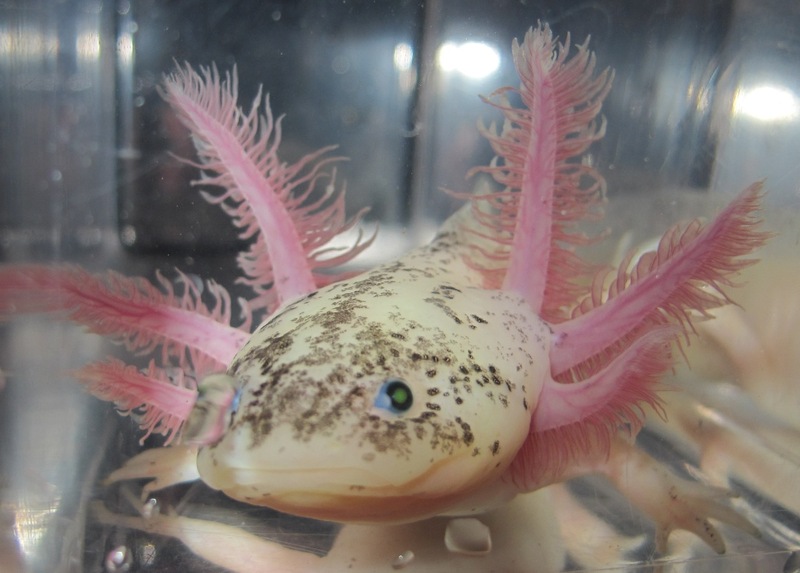 It has very nice gills and speckling. As always, keep it over a dark substrate if you don't want the speckling to fade. 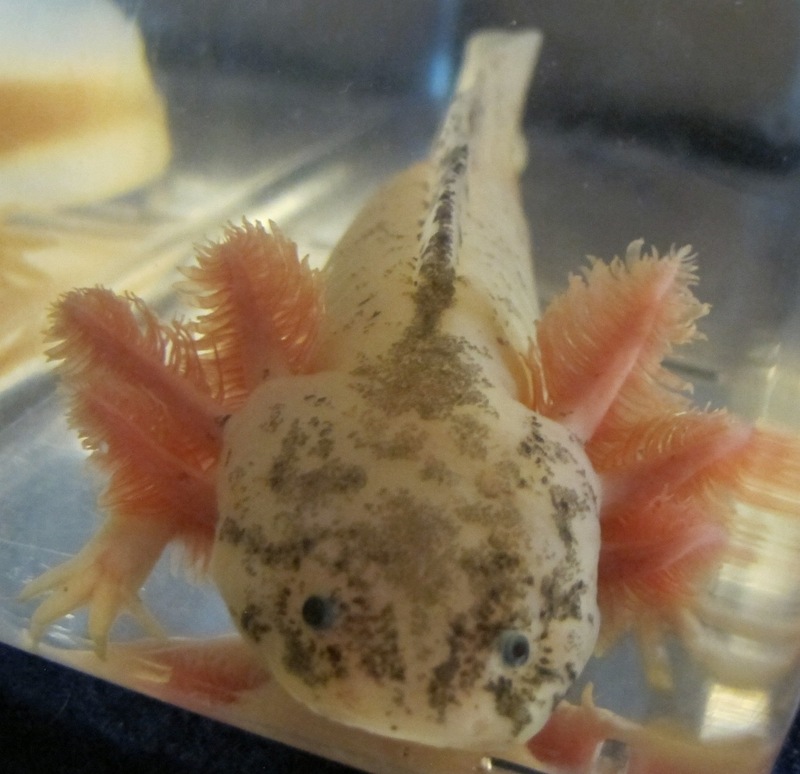 This one is currently housed over a black substrate. 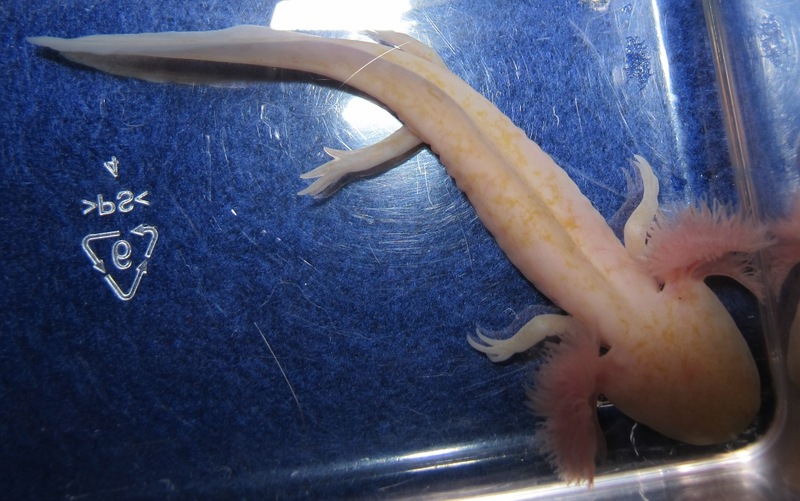 This leucistic is approximately 7 inches long. The speckling is very light. 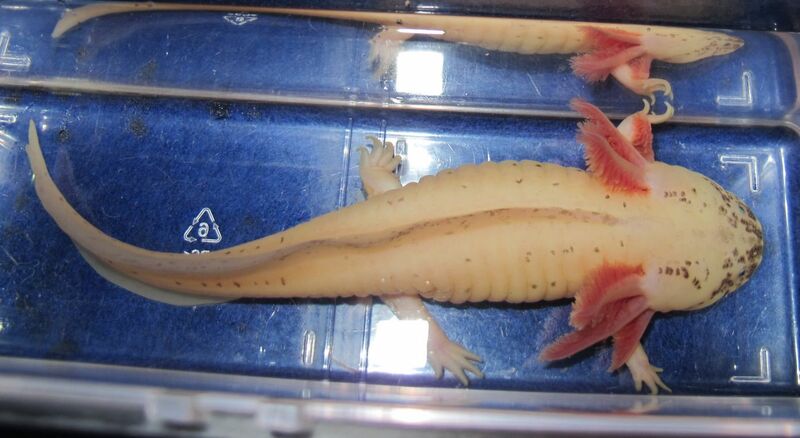 What's really nice is the extra long gills. As always, the specklng will fade if you keep it over a light substrate. 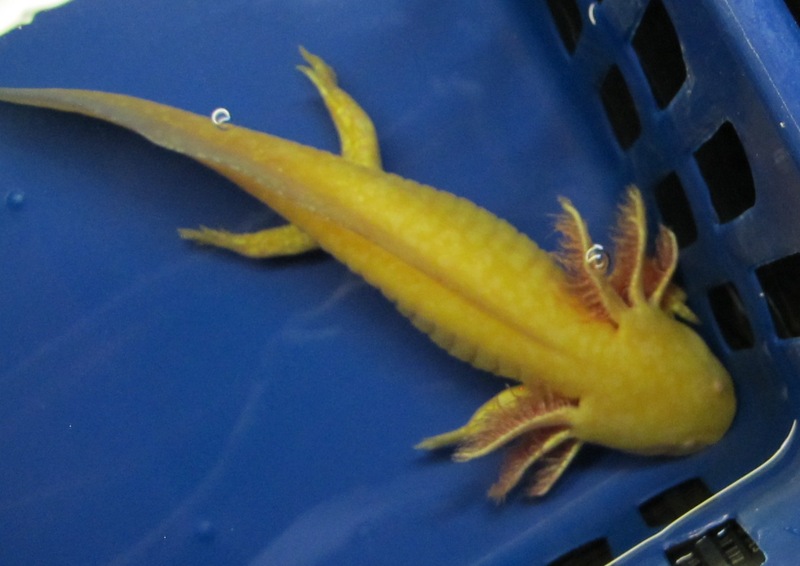 Here's a nice gold albino with beautiful gills and lots of shine. It's approximately 6 inches long. 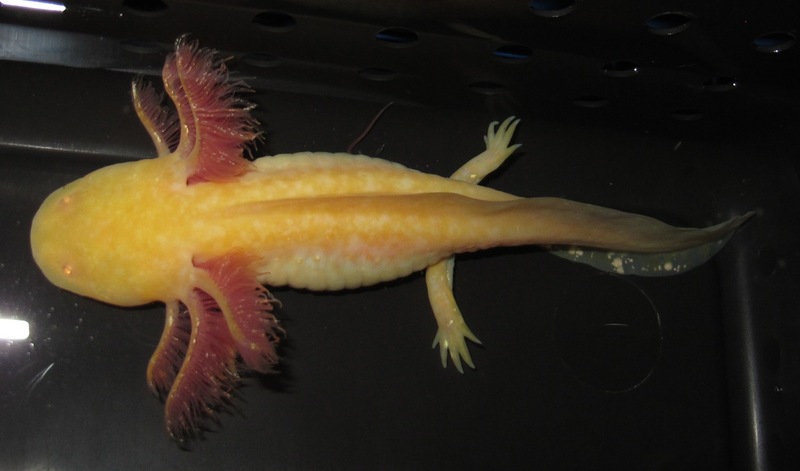 Just to give you some choices, here's another that's approximately 6 inches long with long gills and some speckling. As always, keep it over a dark substrate if you don't want the speckling to fade. 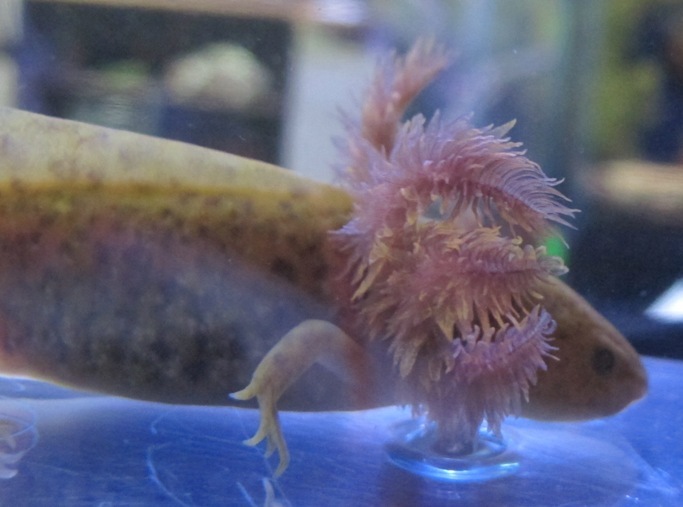 This one is currently housed over a black substrate. This one is approximately 6 inches long. 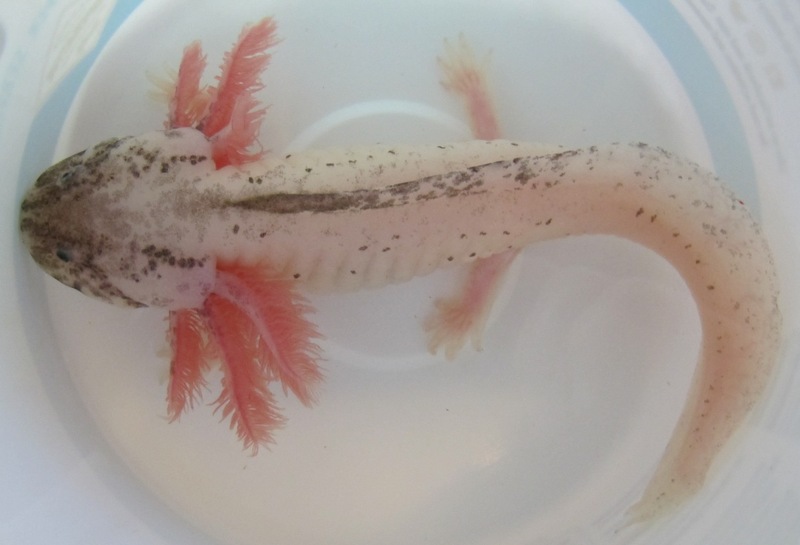 and has a nice combination of long gills and some speckling. As always, keep it over a dark substrate if you don't want the speckling to fade. 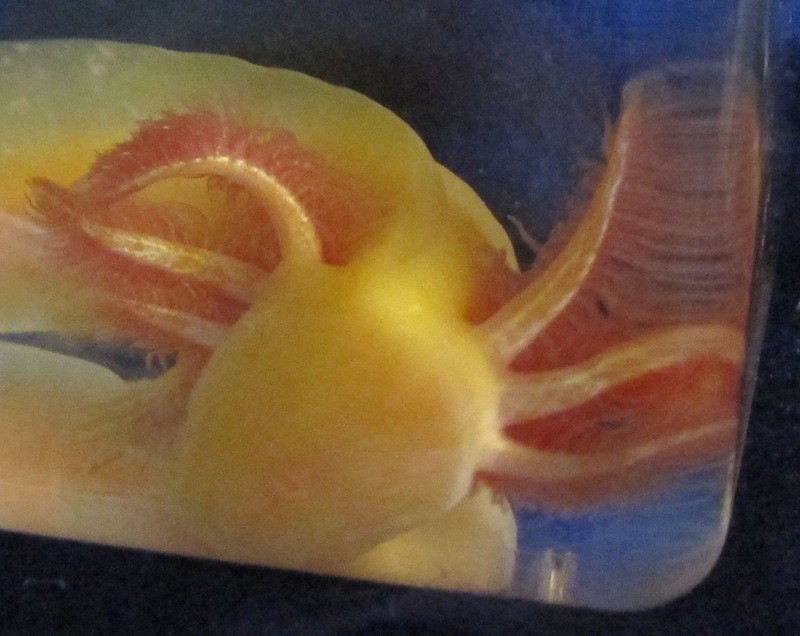 This one is currently housed over a black substrate. Are we allowed to have favorites? 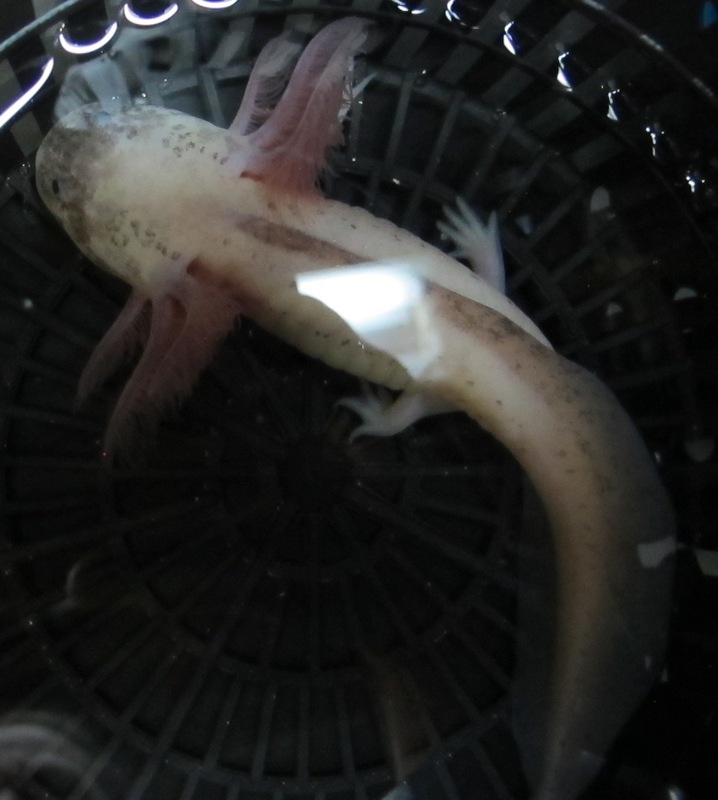 This speckled leucistic has especially nice gills - extra long, with a bit of dark color up the center. This one is approximately 6 inches long. As always,keep it over a dark substrate if you don't want the speckling to fade. 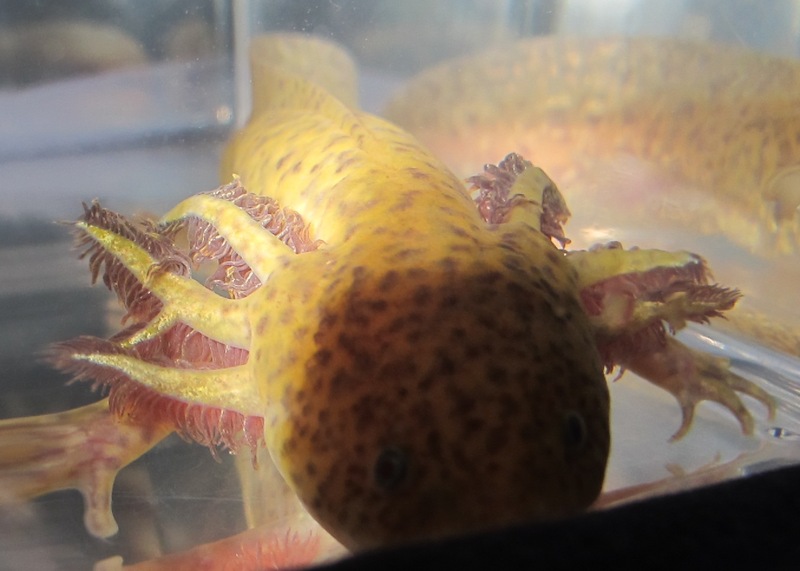 This one is currently housed over a black substrate. 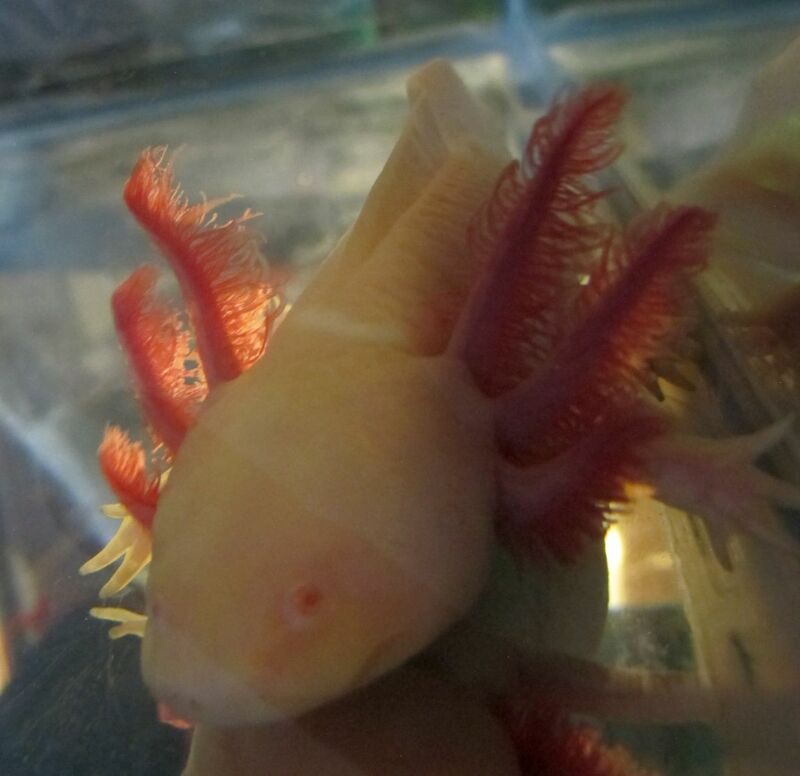 This gold albino is 4-5" inches long and has amazing gills. Kind of a medium-light gold in color. 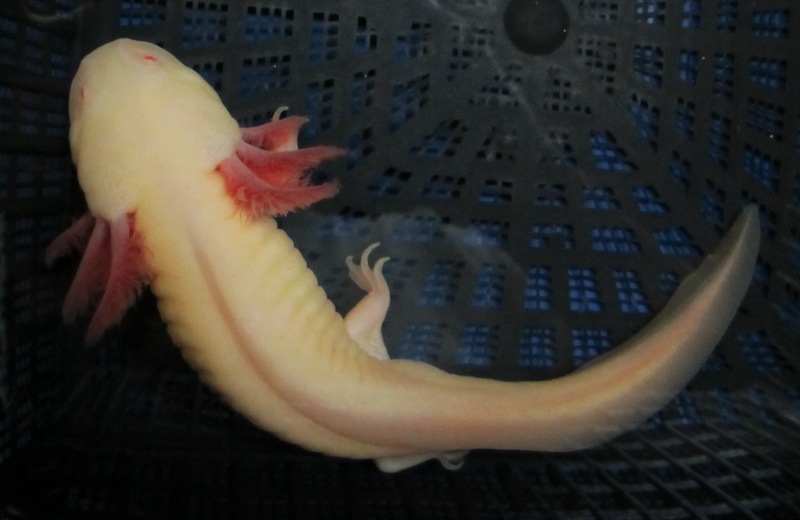 This is a young leucistic with beautiful gills and some dark markings. 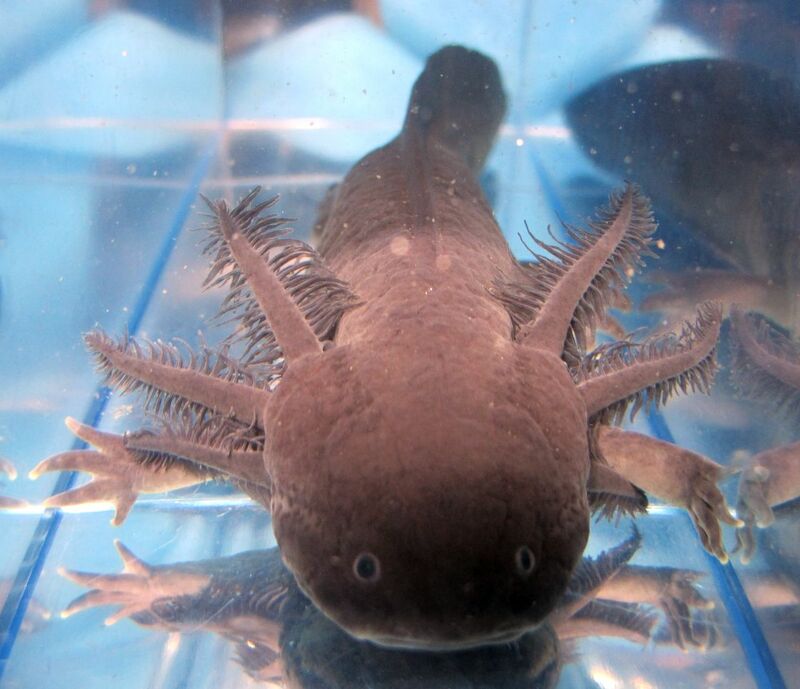 No guarantee what it will look like as it grows up, but keep it over black substrate if you want the best chance of it keeping its markings. If you put it over a light substrate, it will fade. 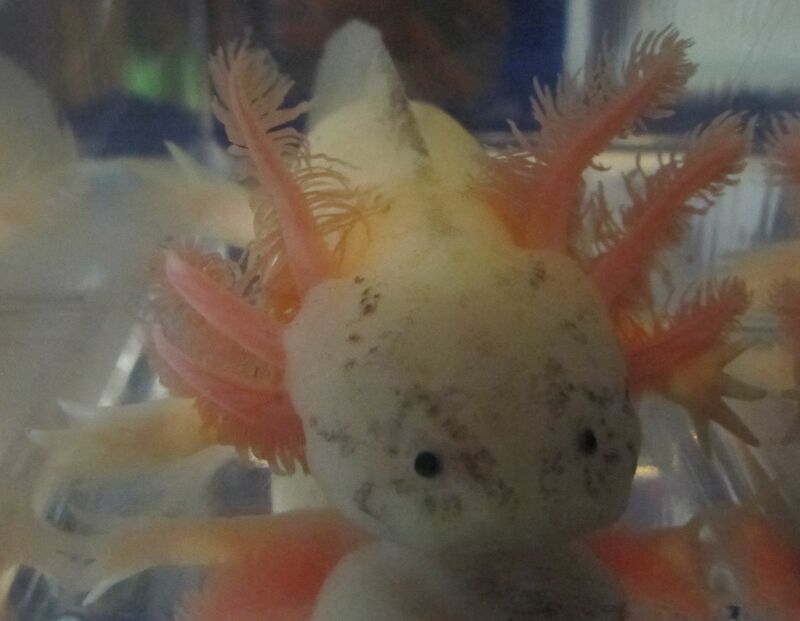 This white albino is 4-5" inches long Cute! 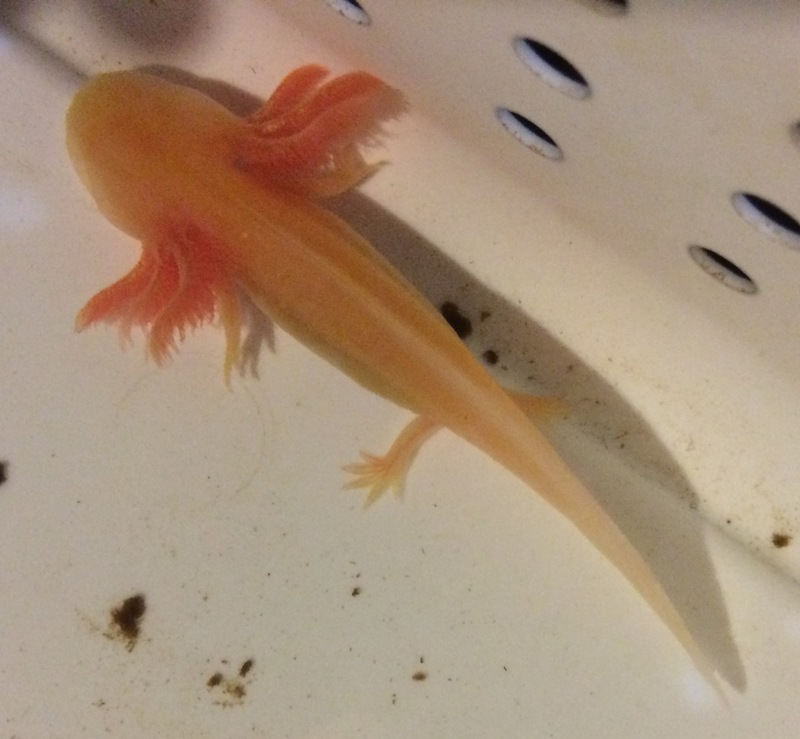 This gold albino is 9+ inches long and almost a year old. 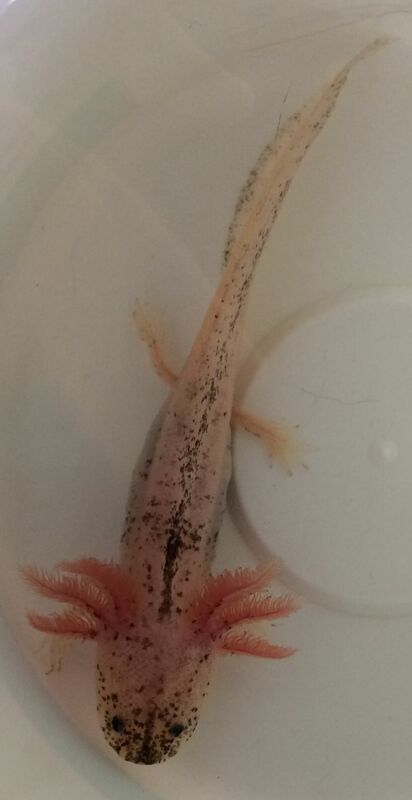 Definitely looks female, but hasn't spawned yet so can't guarantee it. But at this age and size, it's very likely. She's also GFP. 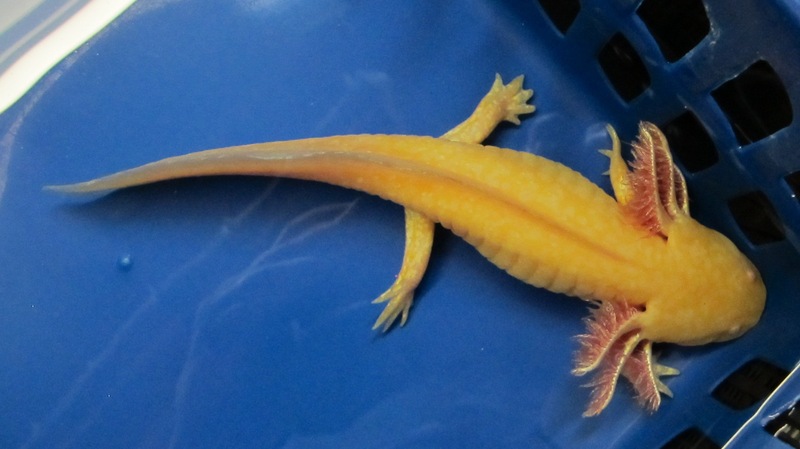 This is a nice looking GFP gold albino. 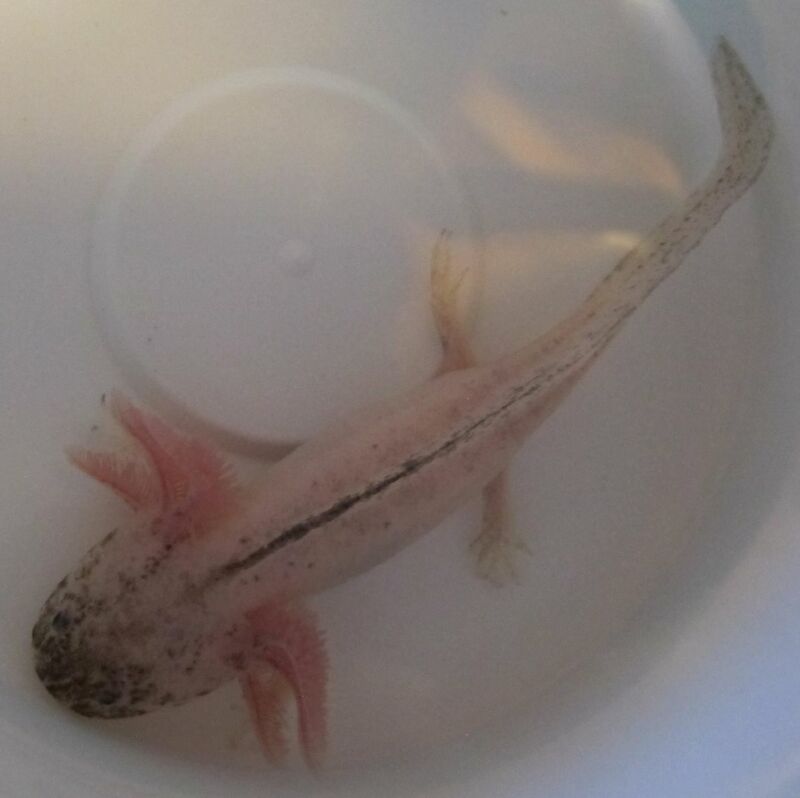 7-8 inches long, gender unknown. 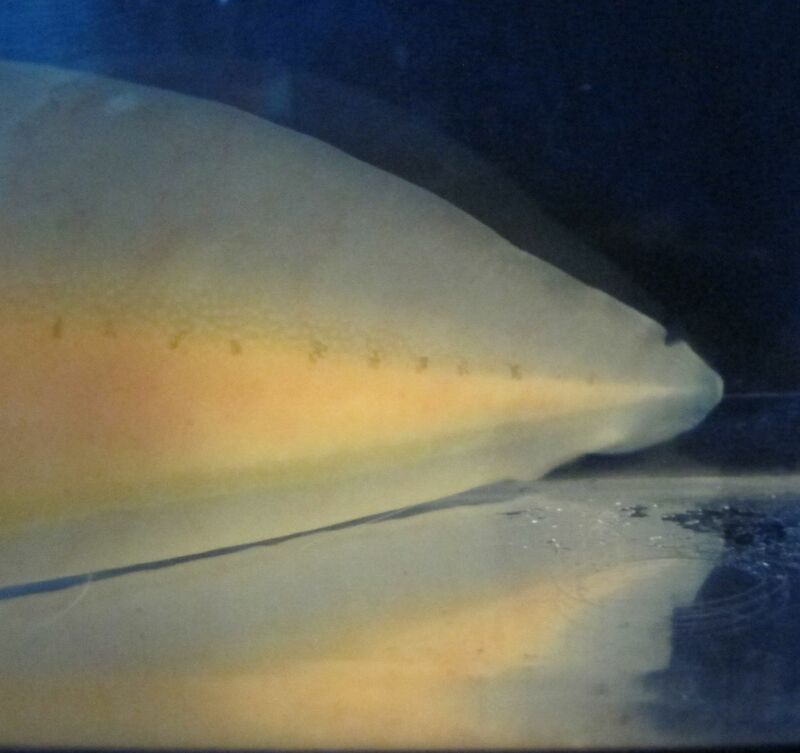 This is a nice looking GFP leucistic with some speckling. 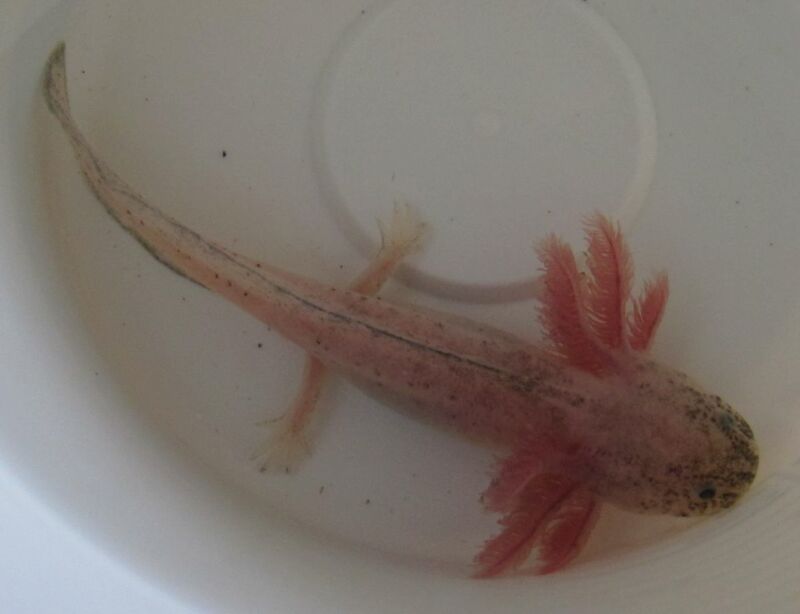 7-8 inches long, gender unknown. 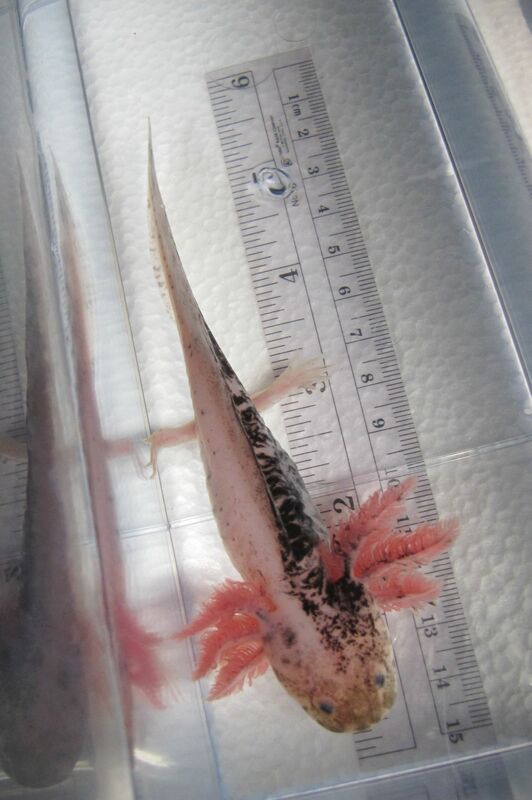 This is a 6-7 inch wild type with the added bonus of RLG and GFP. 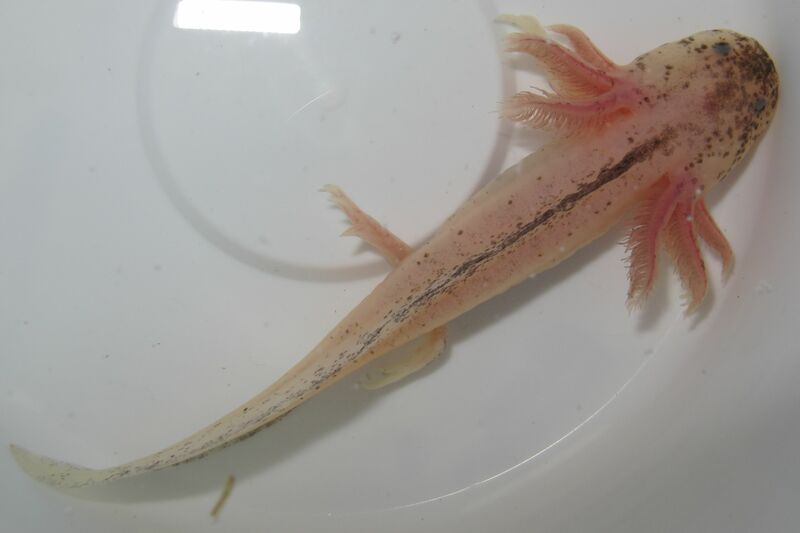 If you like extra-long gills, you might like this cute little (6-7 inches) speckled leucistic with both RLG and GFP. 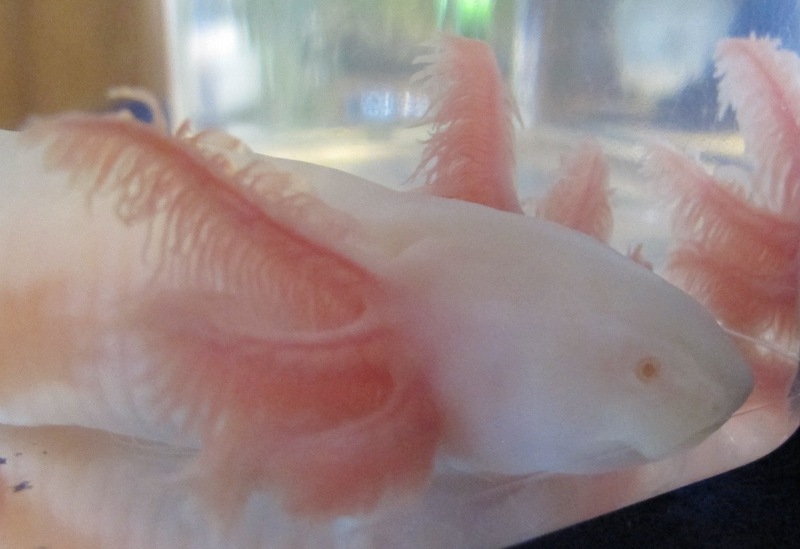 If you like don't like extra-long gills, you won't like this amazing leucistic. 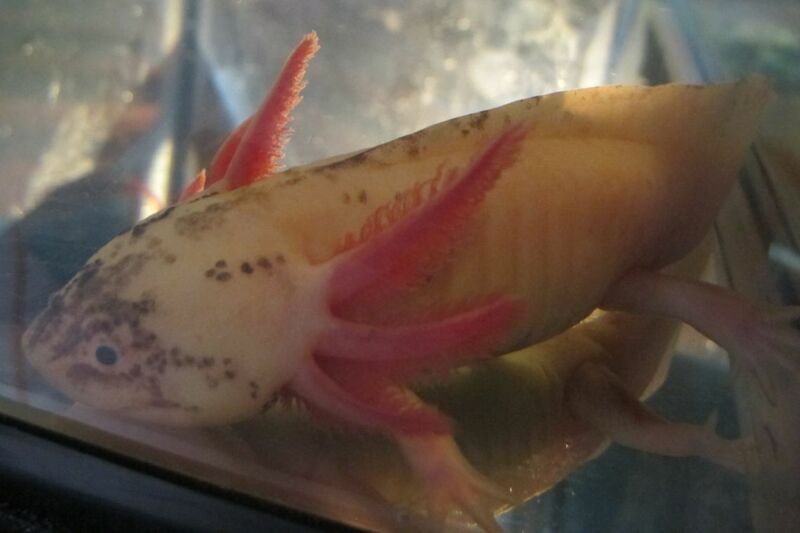 Approximately 7 inches long. 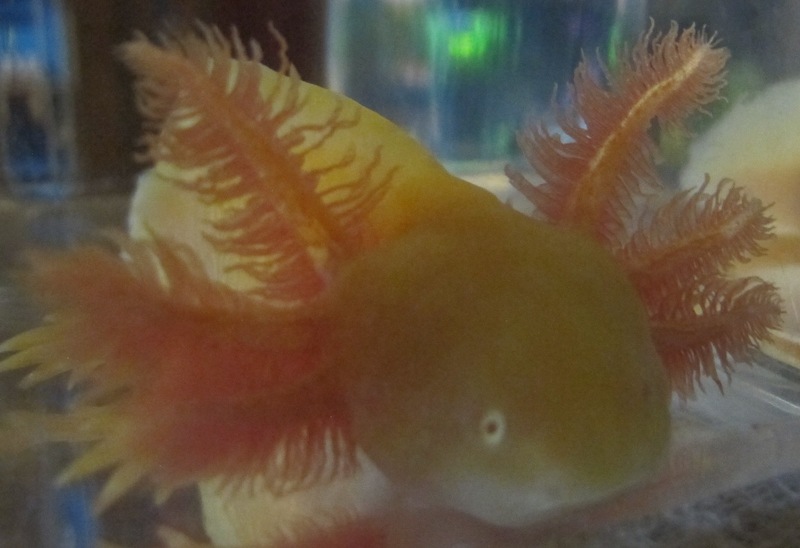 He/she is RLG and GFP. Nothing flashy about this guy, but he's big! 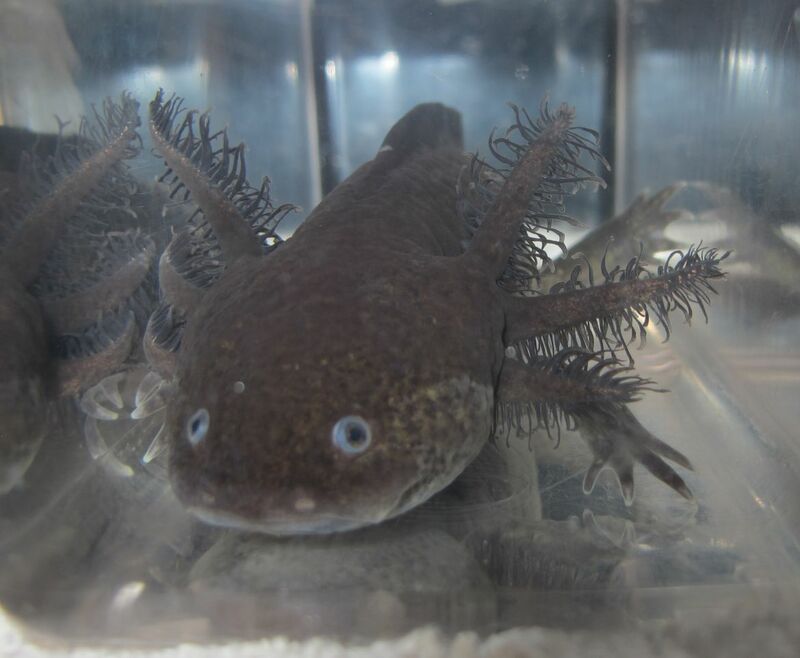 9 inches, black melanoid, male. 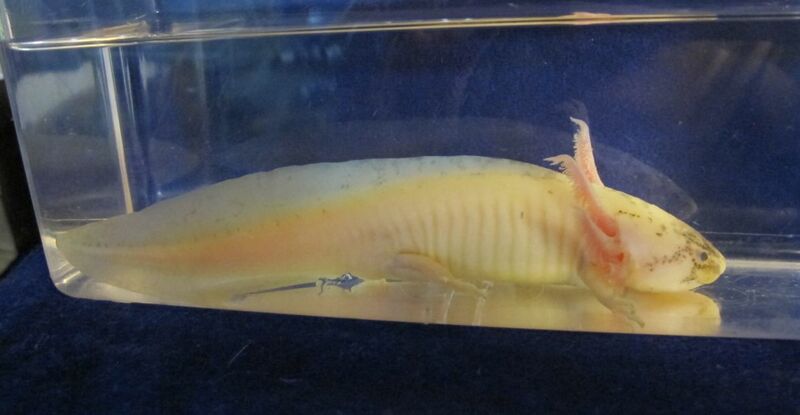 This gold albino is 7-8 inches long. 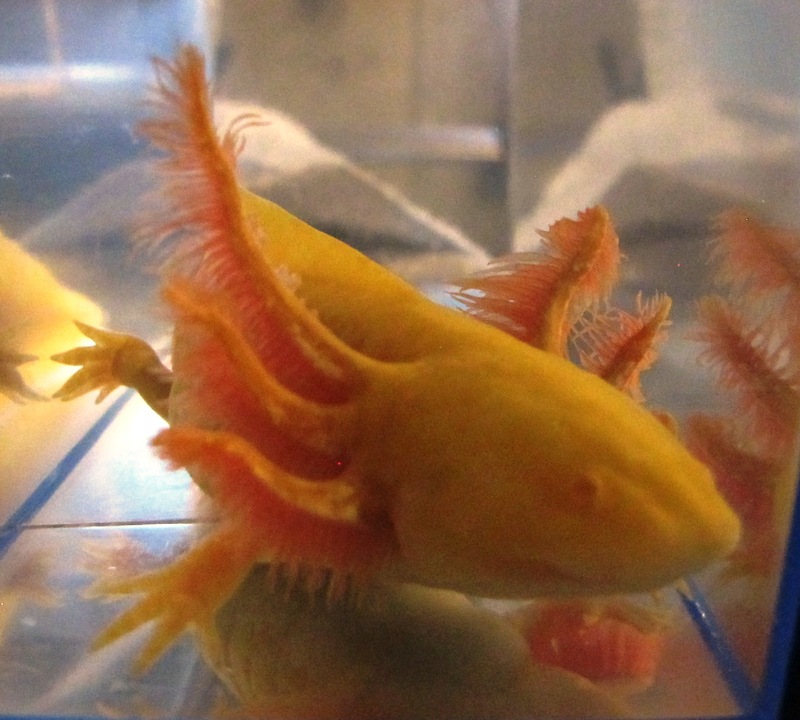 He/she is also RLG and GFP. 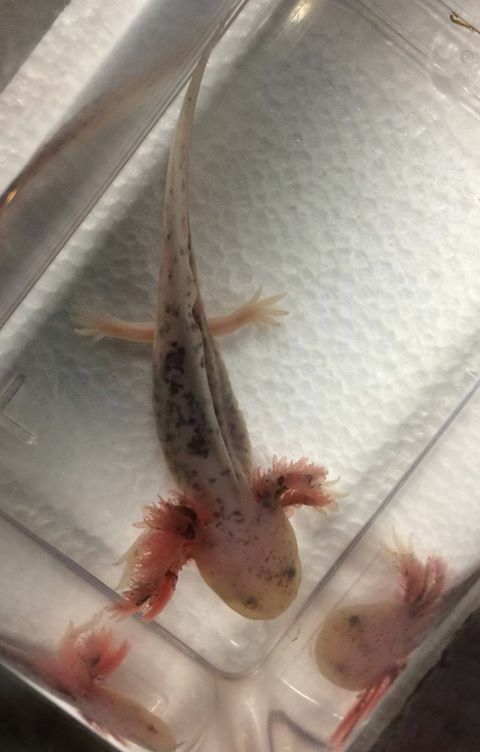 Nice chunky look - possibly female? 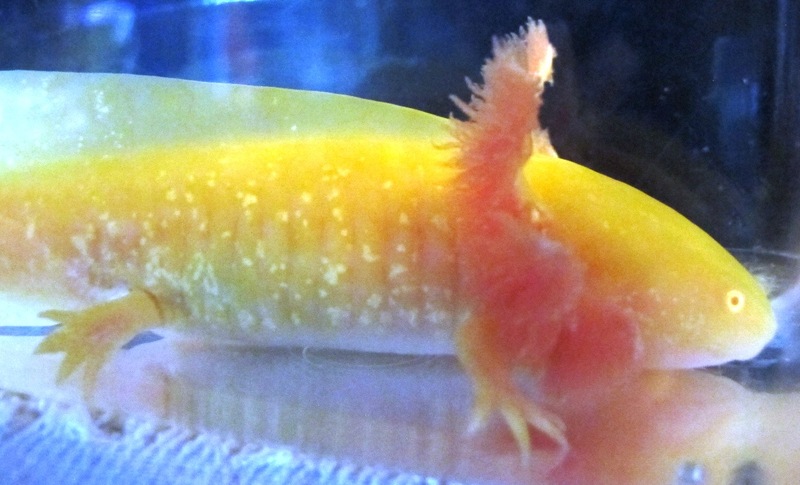 This gold albino is 7-8 inches long. 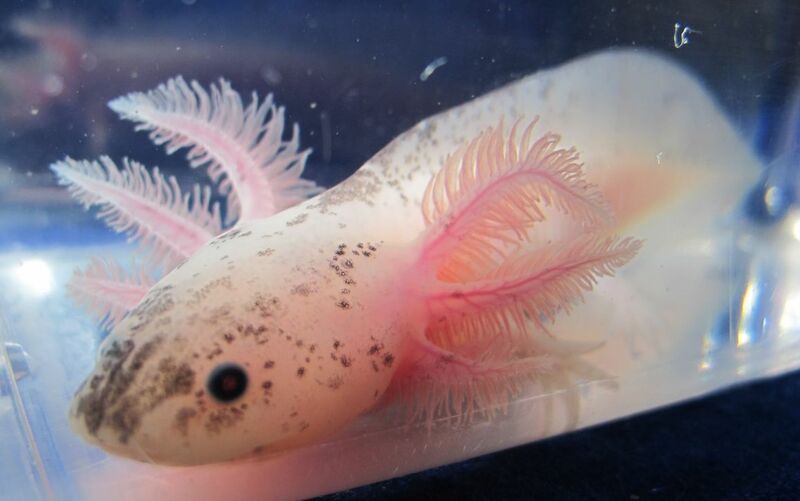 I can't guarantee gender because he/she is too young, but to my eye this looks female. 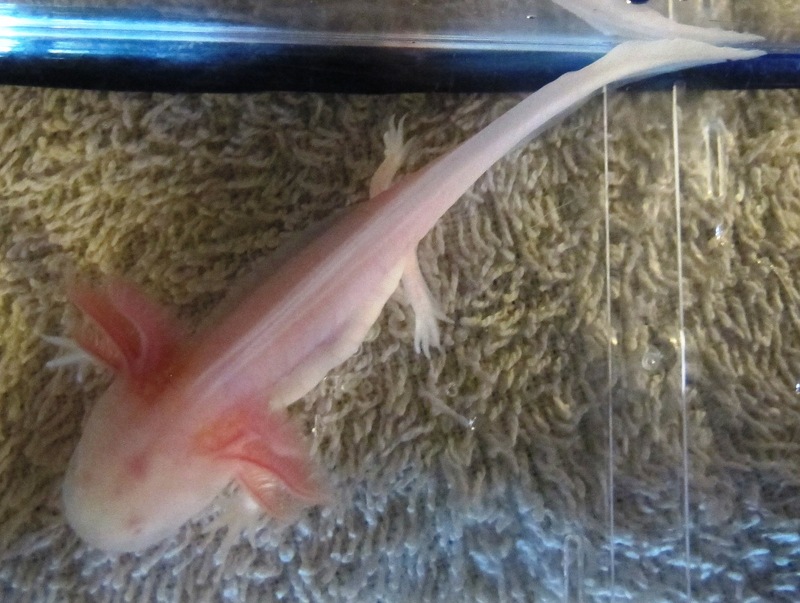 This 6-7 inch leucistic has a lot going for him/her. RLG plus GFP plus speckled! Approximately 5 months old. 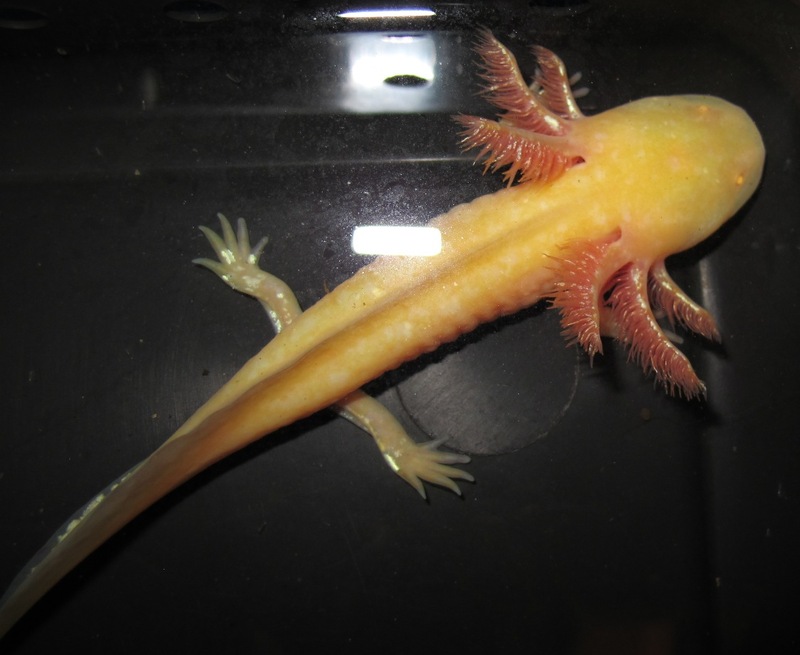 Who can resist this perky little GFP gold albino? 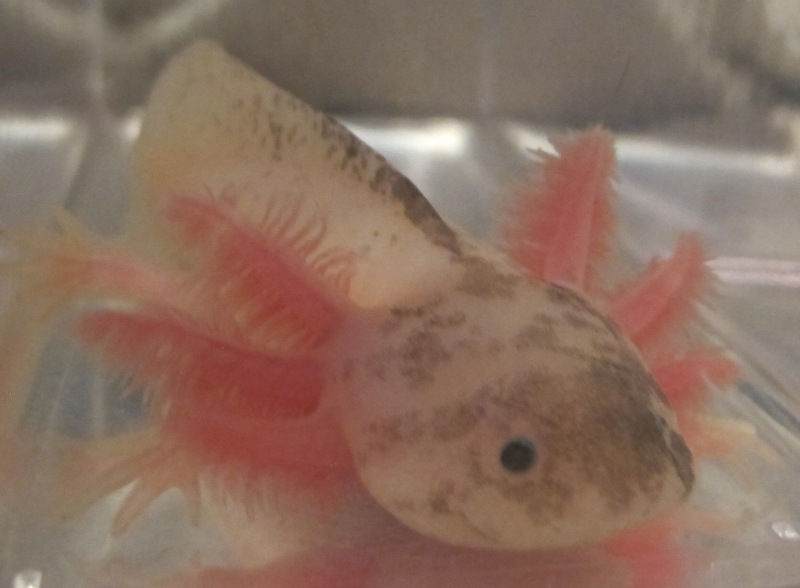 Just over 5 inches long, and about 3 months old, so gender unknown. Just a fun little squirt waiting for someone to raise him/her up into a big guy! 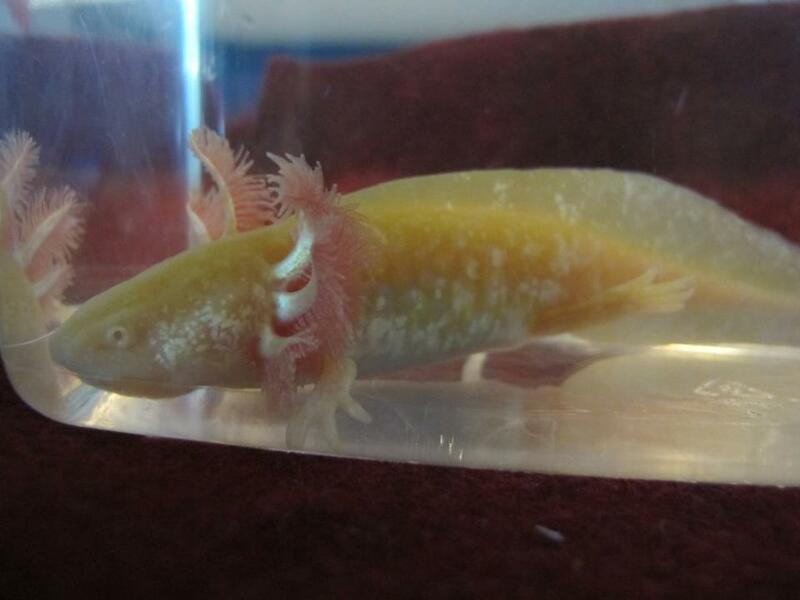 Want a lovely RLG-GFP gold albino? This one is just the ticket. 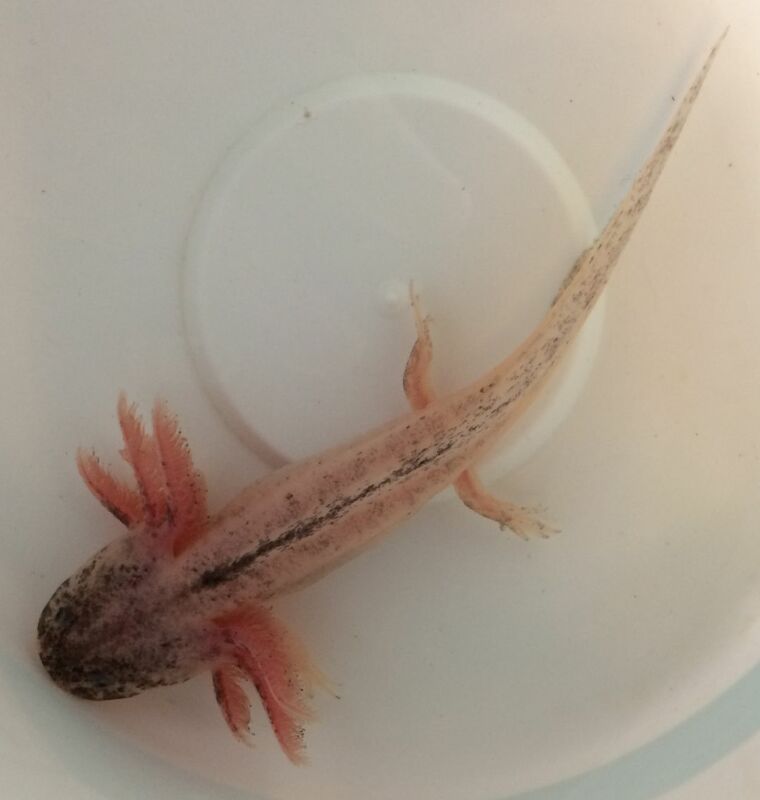 Just over 6 inches long, gender unknown. A real looker. 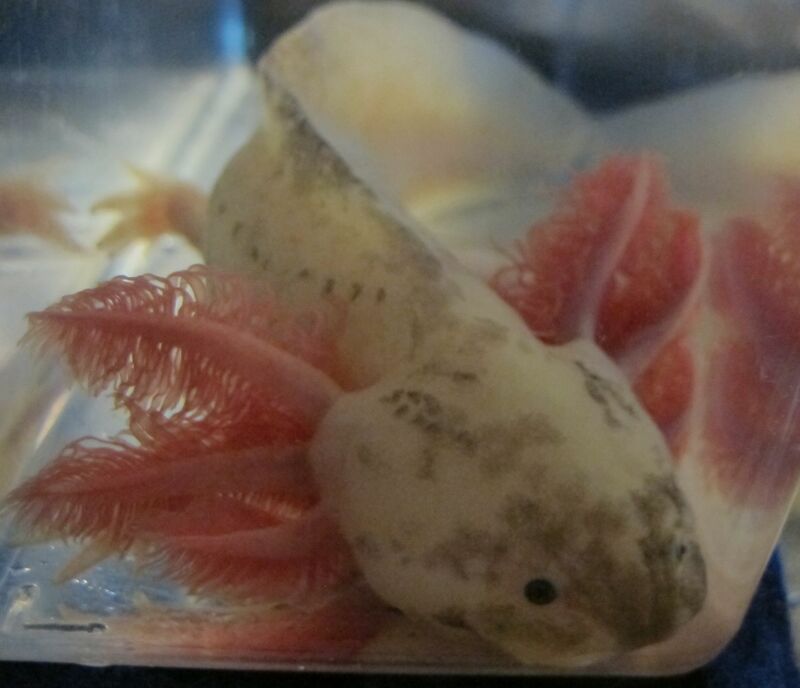 This is another nice choice for an RLG White albino, 5-6 inches long, gender unknown. Pretty and graceful. 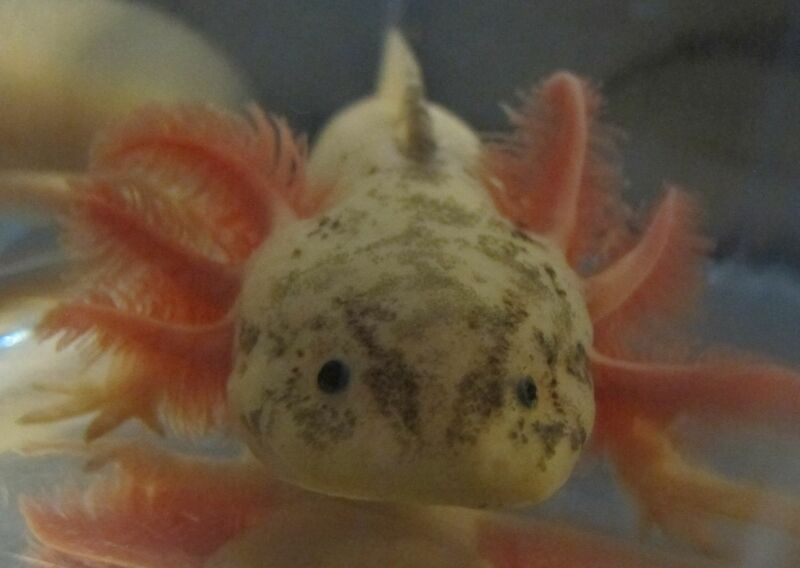 This guy has freckles! 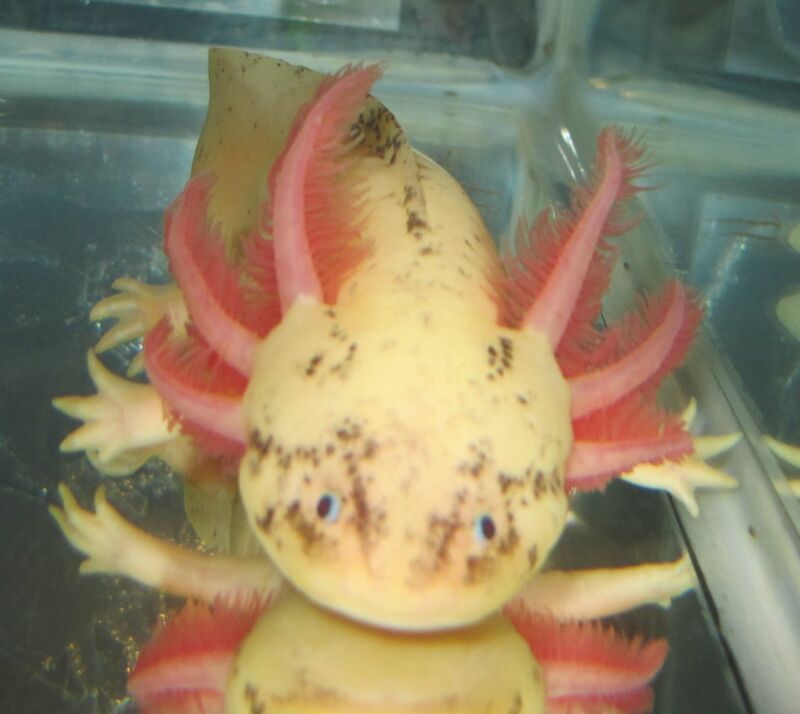 Mostly on his face, but a few on his body.Nice gills as well. 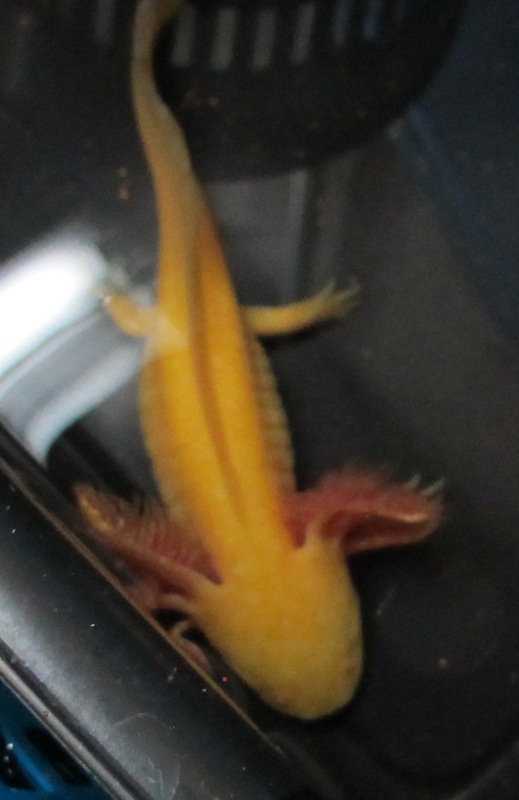 He/she is just over 7 inches long, gender unknown, but possibly male. 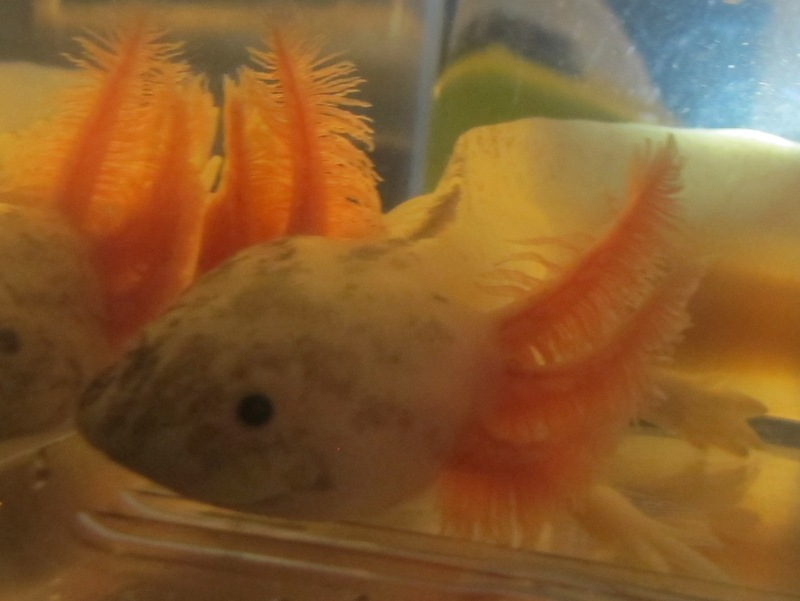 The freckles may fade over time, especially if you don't keep him over a dark substrate. 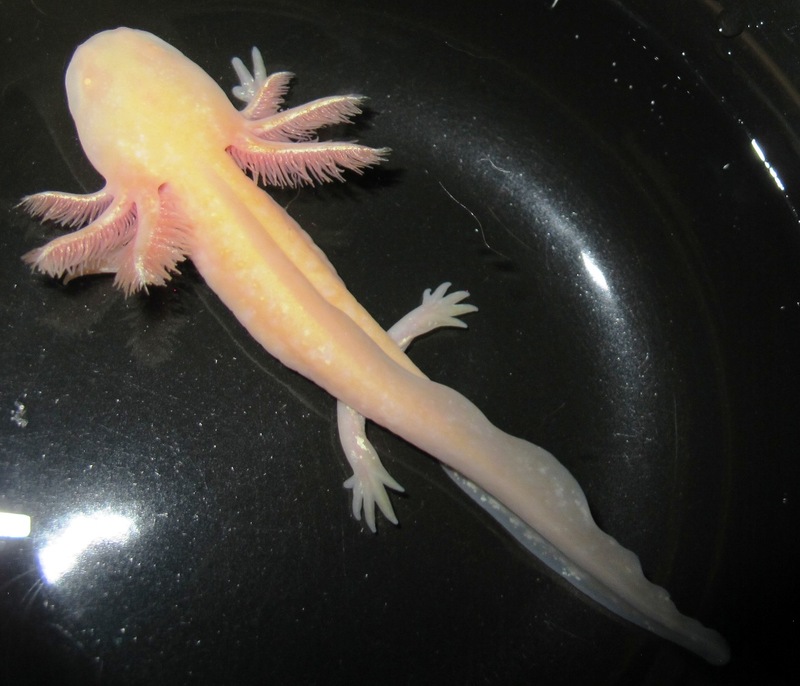 These pictures were taken with him housed over a black substrate. 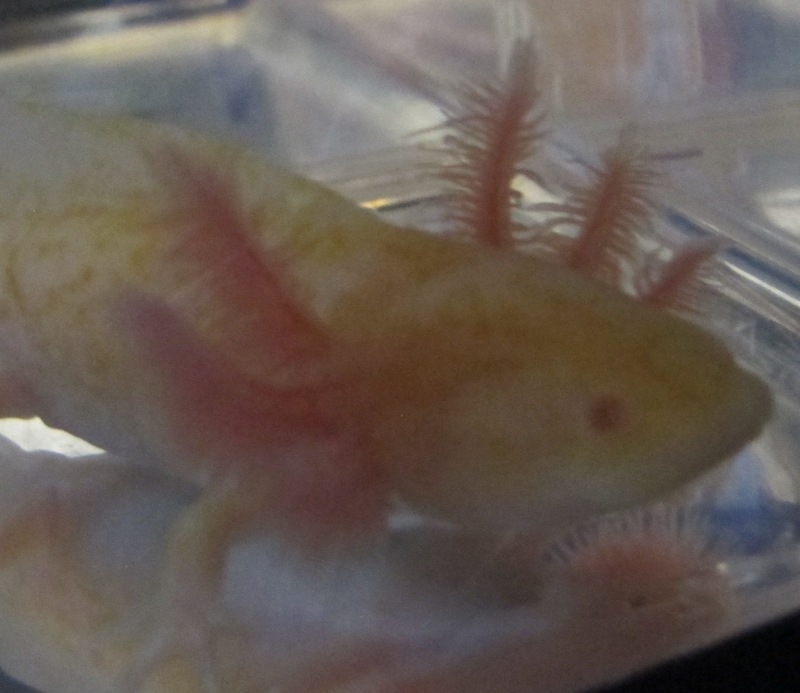 It's a cliche, but pictures really don't do justice to this gorgeous RLG gold albino. 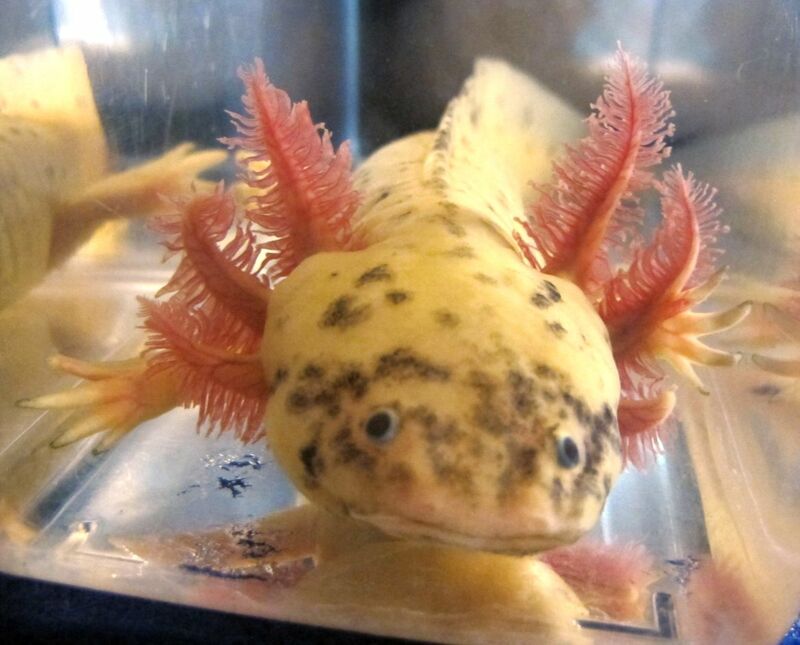 5-6 inches long and sporting a nice fluffy mane of gills. 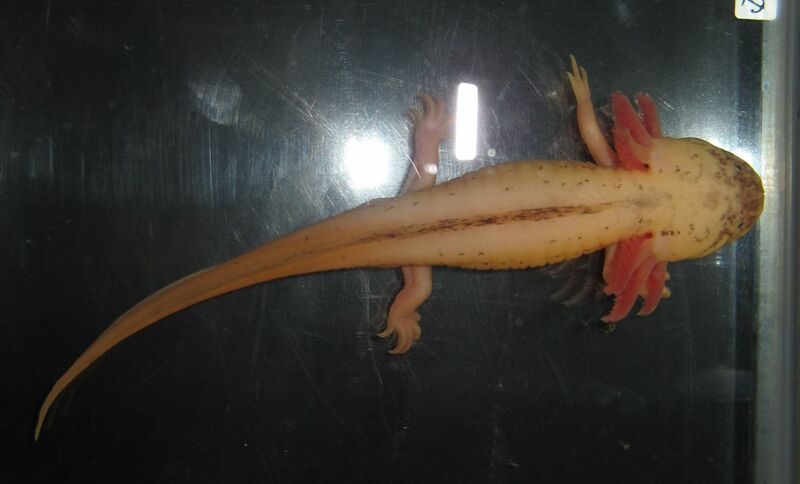 Here's a nice GFP wild type, 7 inches long. Gender unknown. 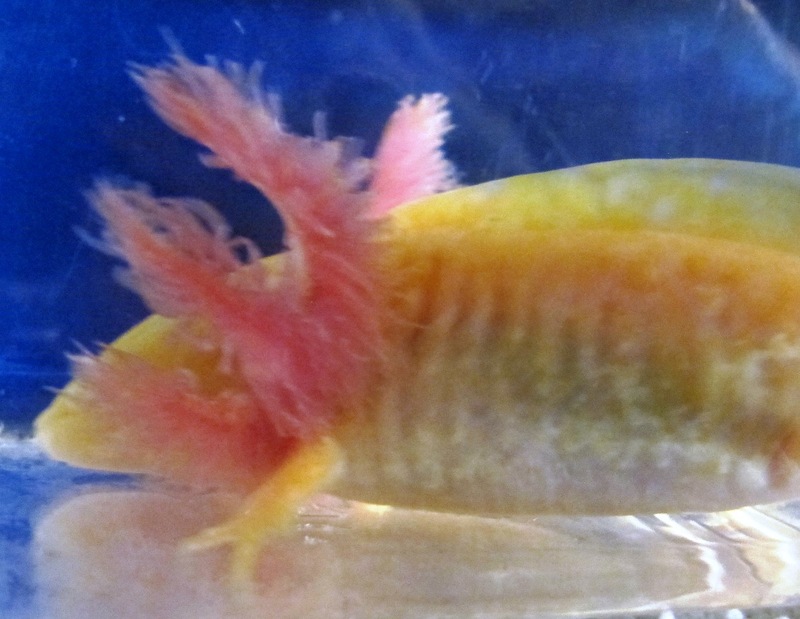 This is a pretty little GFP gold albino. 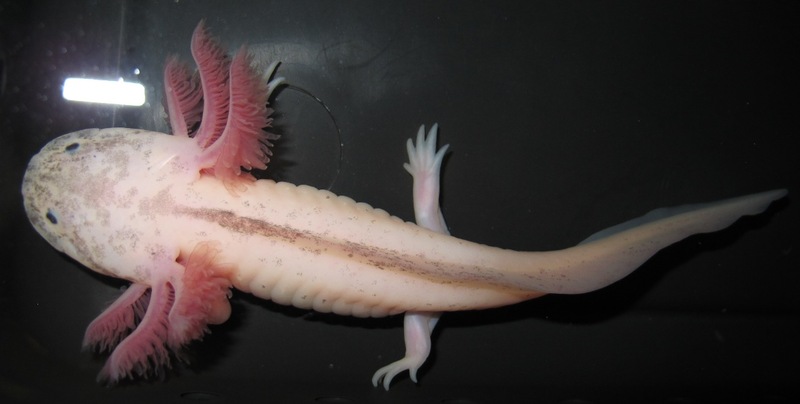 5.5 inches long, with very nice gills. The pictures show how it looks under different room lighting. Sorry, no picture of it under blacklight. RLG, anyone? This one is 5 inches long. And it's GFP as well. Cool! Pretty, pretty, pretty! 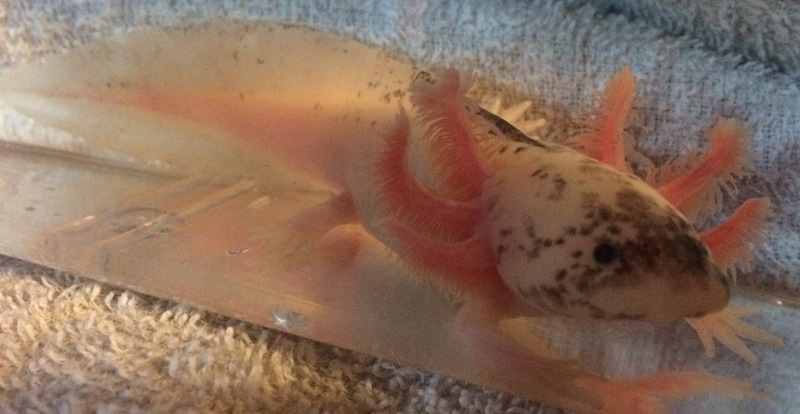 This white albino is 8 inches long and appears to be male. 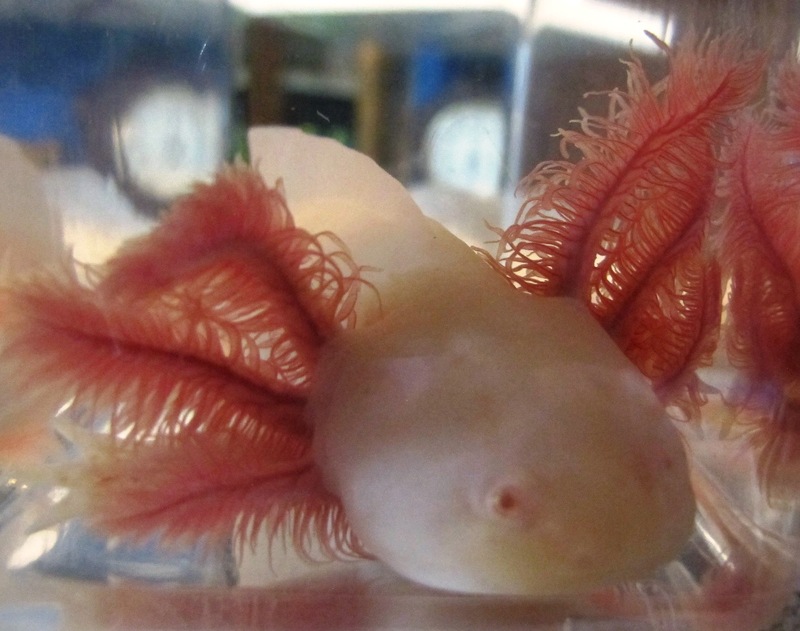 Super nice gills and just overall gorgeous. Approximately 10 months old. 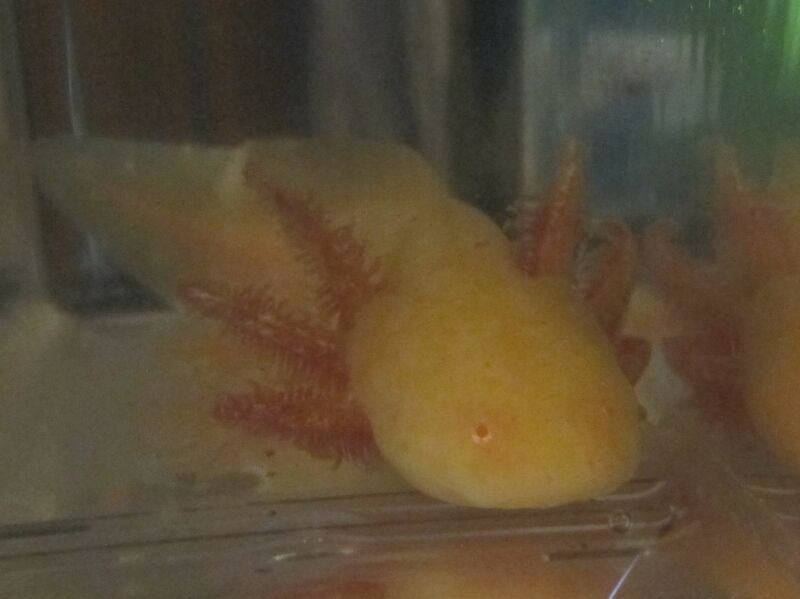 This pretty albino is a light gold in color and has very nice gills. 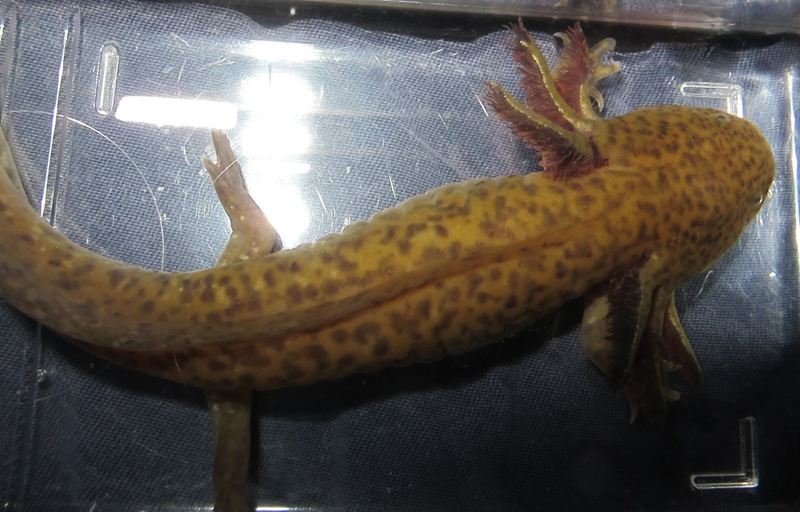 Approximately 7 inches long, 9 months old. Gender unknown. 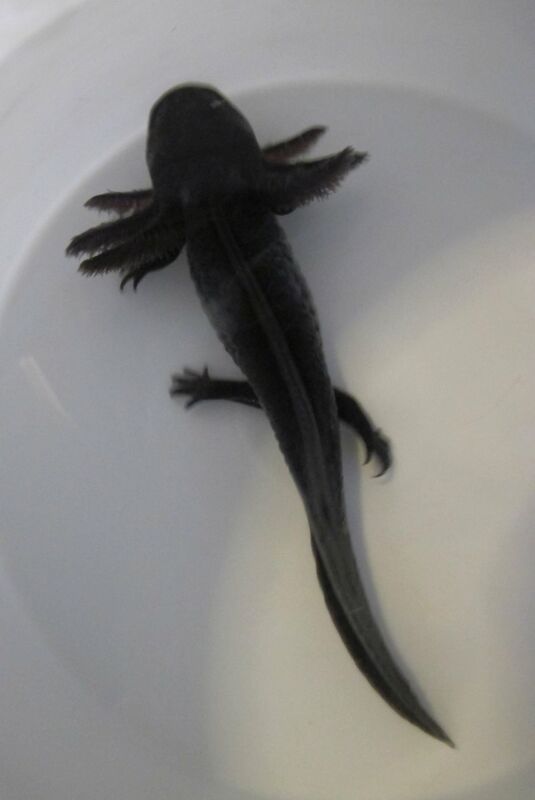 This black melanoid is approximately 8.75 inches long, 10 months old. 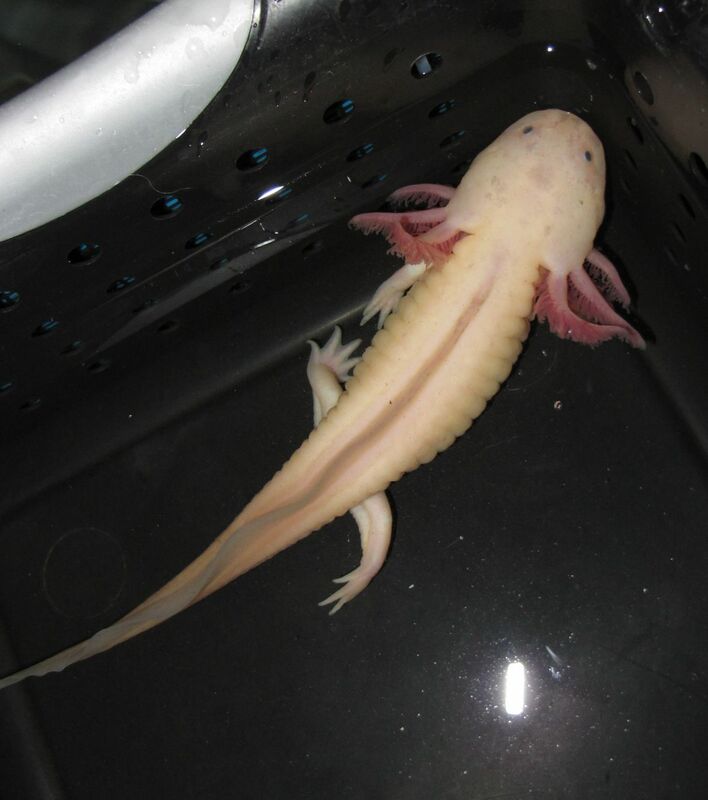 It's pretty beefy and so far it looks female, but no guarantee on gender. Please be aware that the color may change, especially if you don't keep it over a dark substrate (see Colors page). 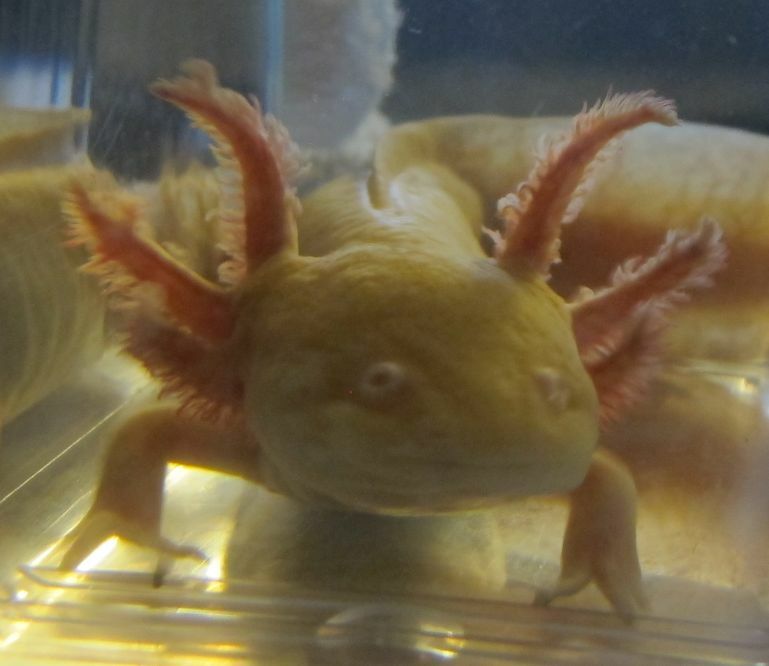 A beautiful golden albino, 11 months old, 9 inches. Gender is not guaranteed, but it looks female. A nice choice for someone wanting a larger specimen. 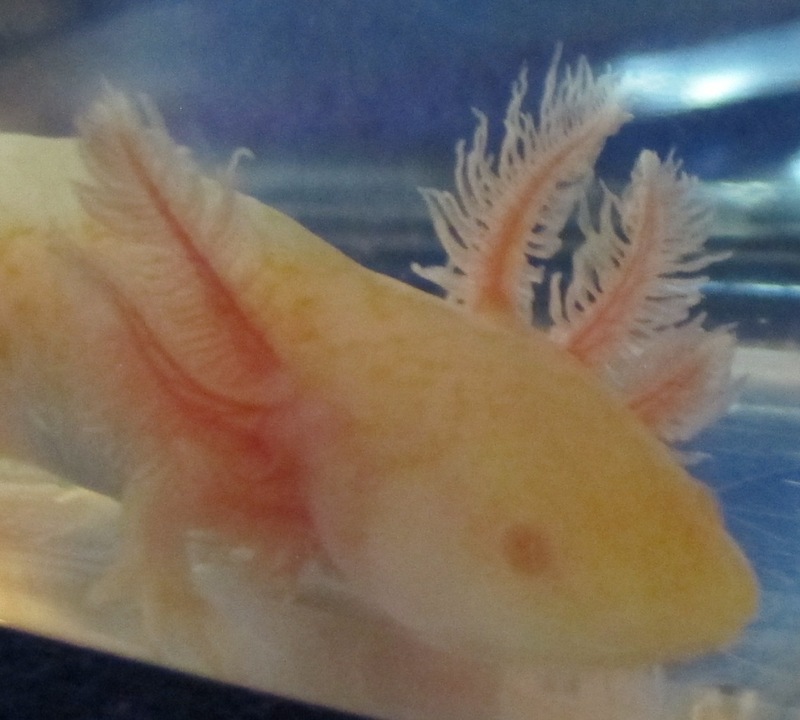 This male albino is approximately 8.5 inches. About 10 months old. He's a very pale, cream color. Color depends on lighting. My favorite is the bright color in the first picture. He looks good on black! 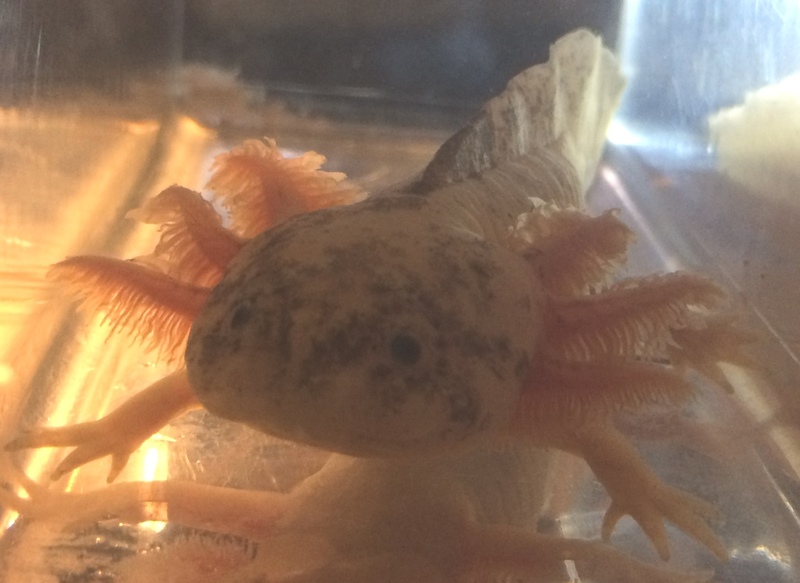 Approximately 8 inches, not sure of gender, about 10 months old. As the pictures show, color looks a bit different depending on the lighting. Basically a medium gold color. 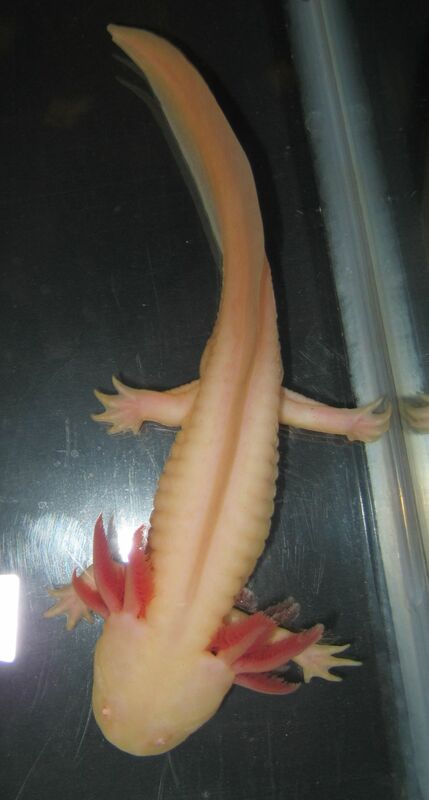 But it's the gills that are the real attention getter - extra long and beautifully proportioned. 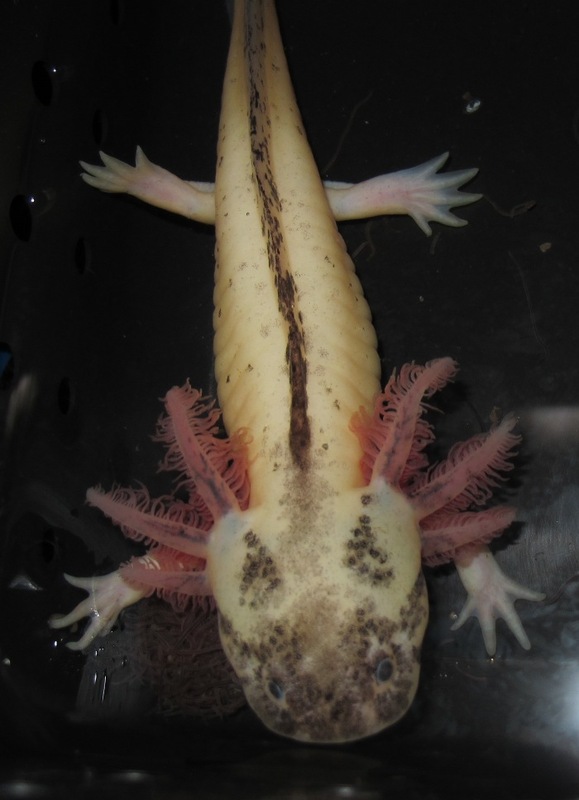 This one is 7-3/4 inches long but still a juvenile at only 8 months old. Beautiful coloring! More pictures coming soon. 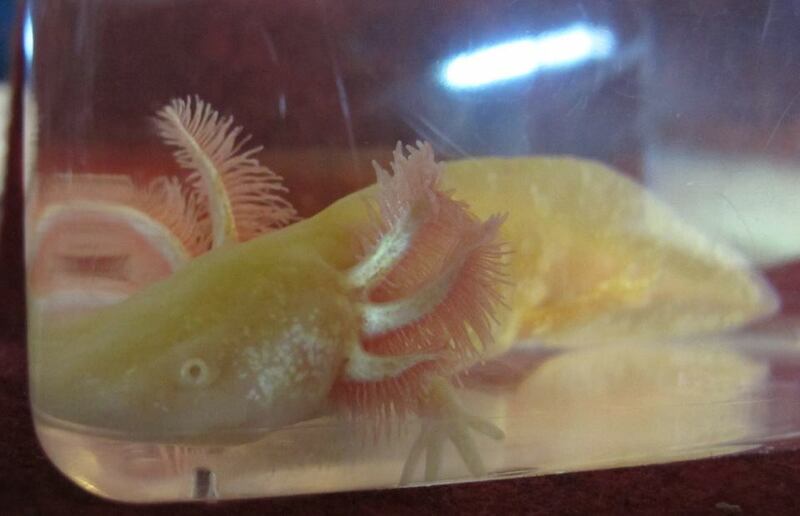 This beautiful golden albino has a nice medium gold color, plenty of sparkle, and super nice gills! 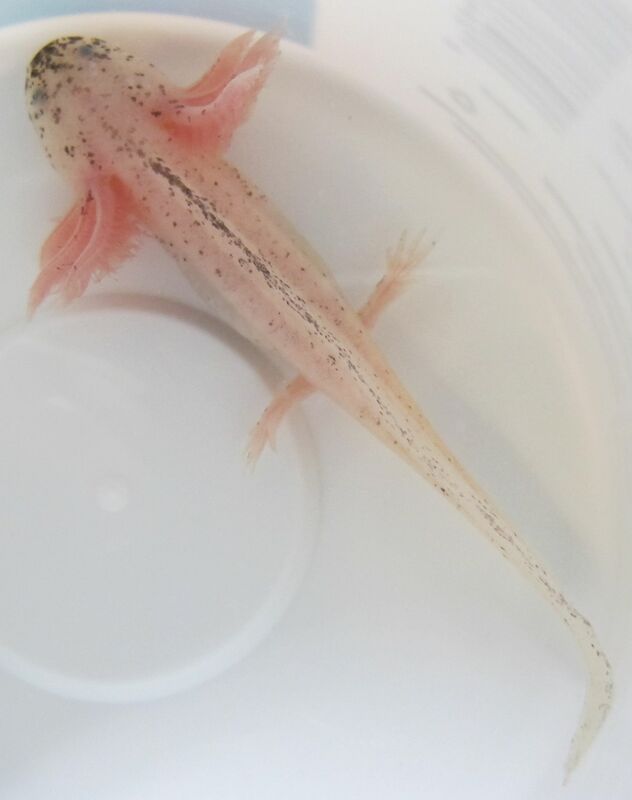 She's 7 inches long and although I won't guarantee gender, I do believe it's probably a female. Gorgeous! 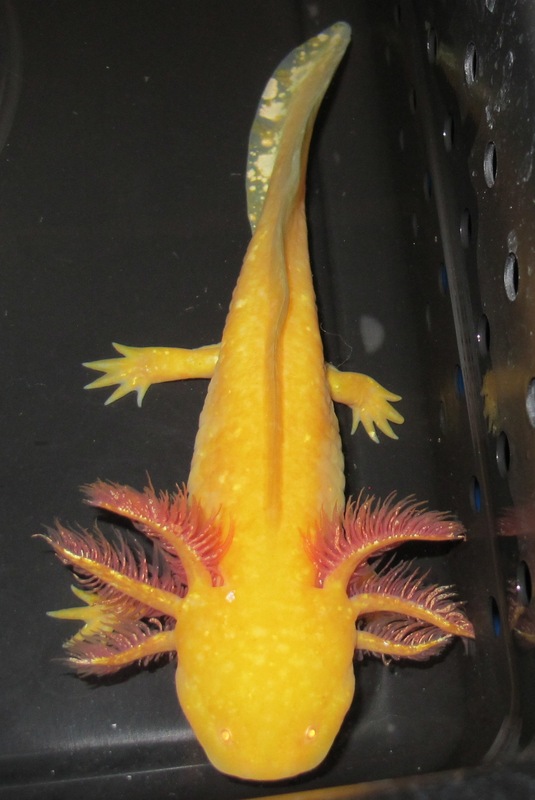 This juvenile is 5.5 inches. 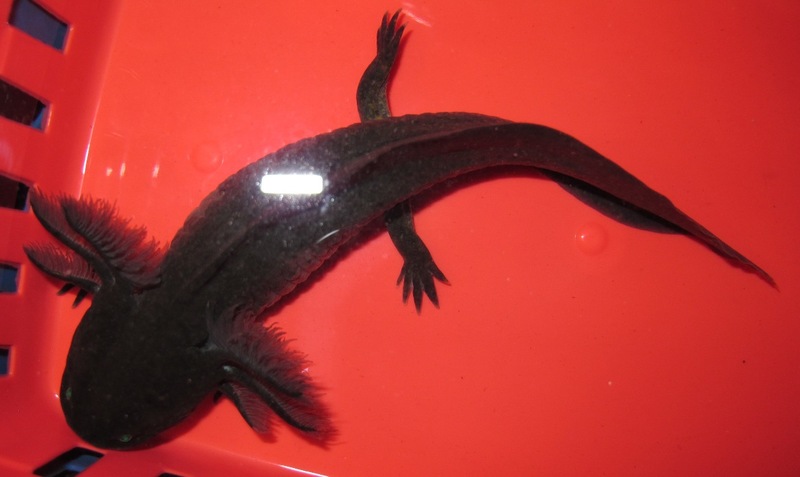 With a nice black mudpack on its face and beautifully long gills, this one is going to grow up sweet! 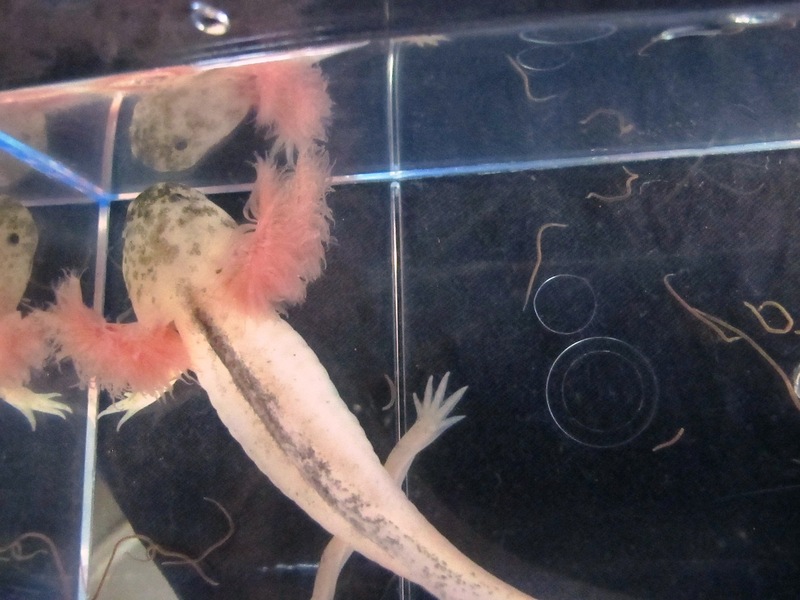 As always, keep it over a dark substrate to maintain the black markings. 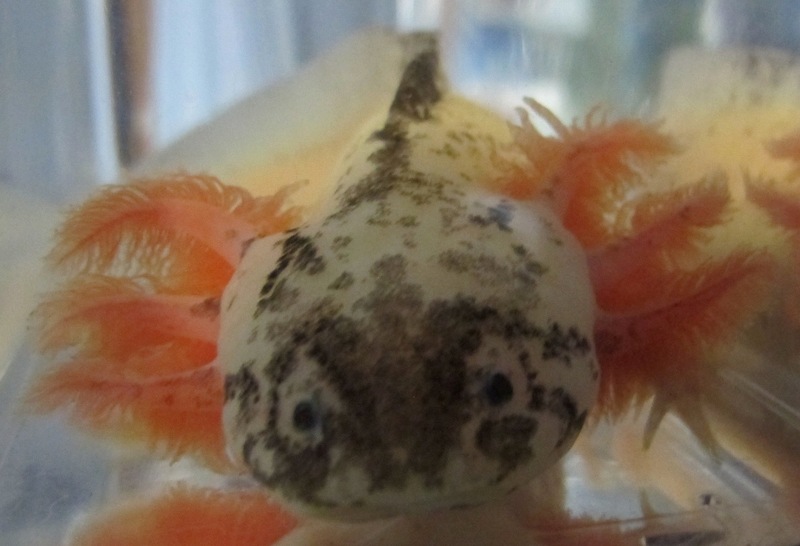 If housed over a light substrate, you'll see a lot less black. Wow, I can't believe the war paint on the face of this 7 inch juvenile! He has it on both cheeks, plus he has nice black on top. And even a tiny bit of black on the lowest edge of the bottom fin! 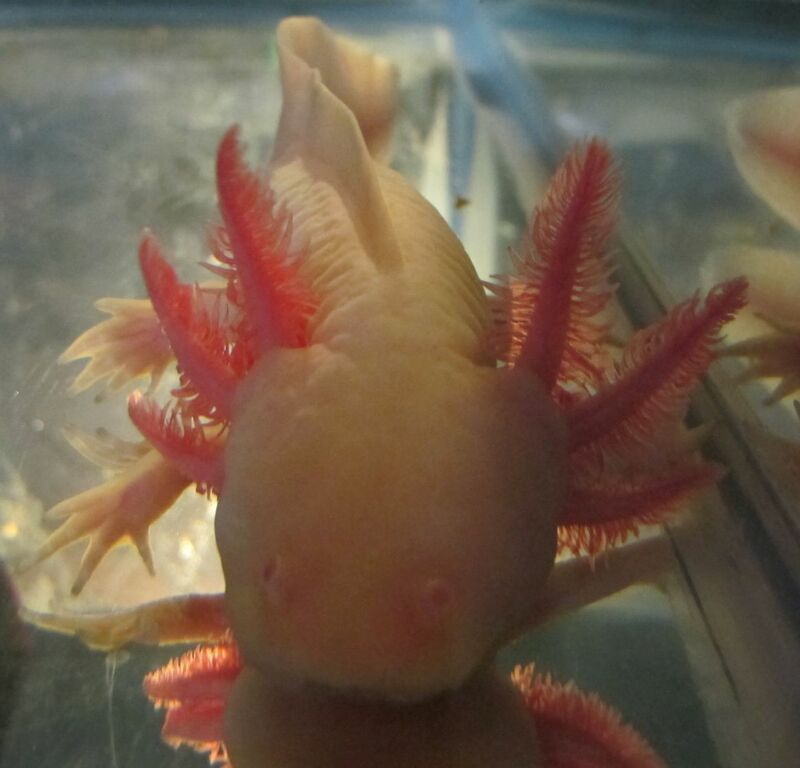 And if that weren't enough, he also has very nice gills and some interesting black spots on his sides. 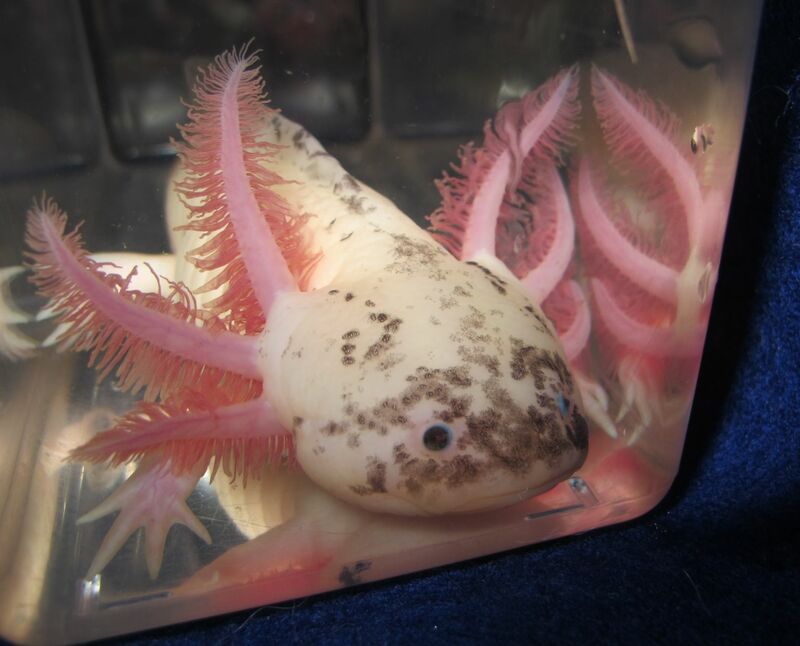 As always, keep this axolotl over a dark substrate to maximize the dark markings. 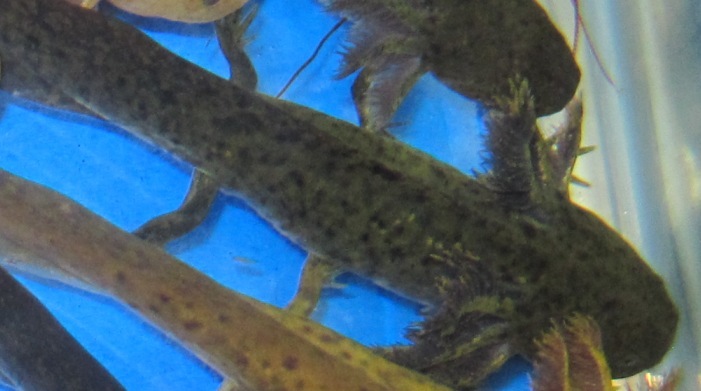 When kept over a light substrate, the markings will probably fade somewhat. 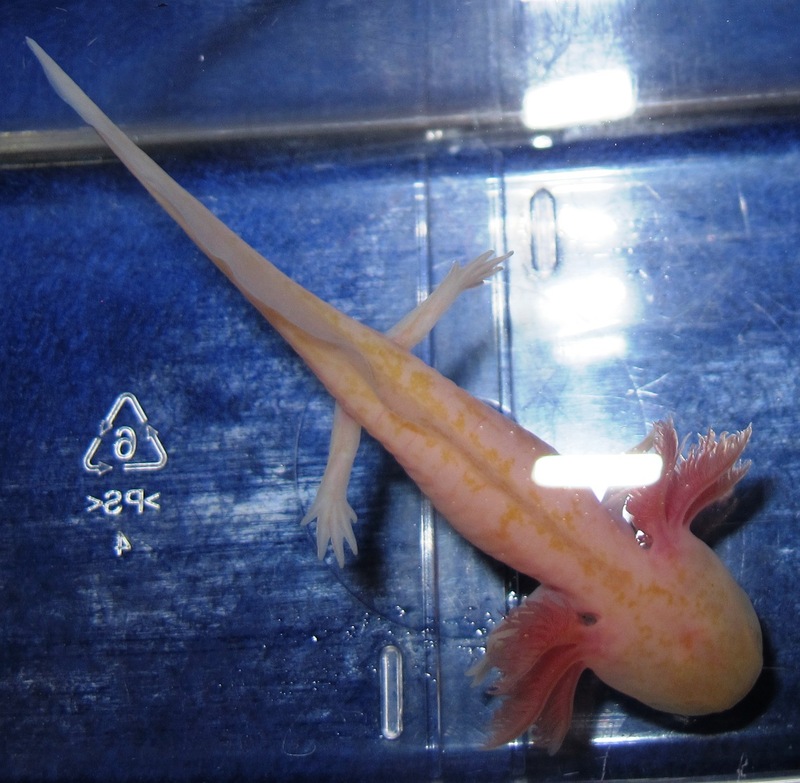 These pictures were taken with the axolotl housed over a black substrate. What can I say? A nice little speckled leucistic, approximately 6 inches in length. 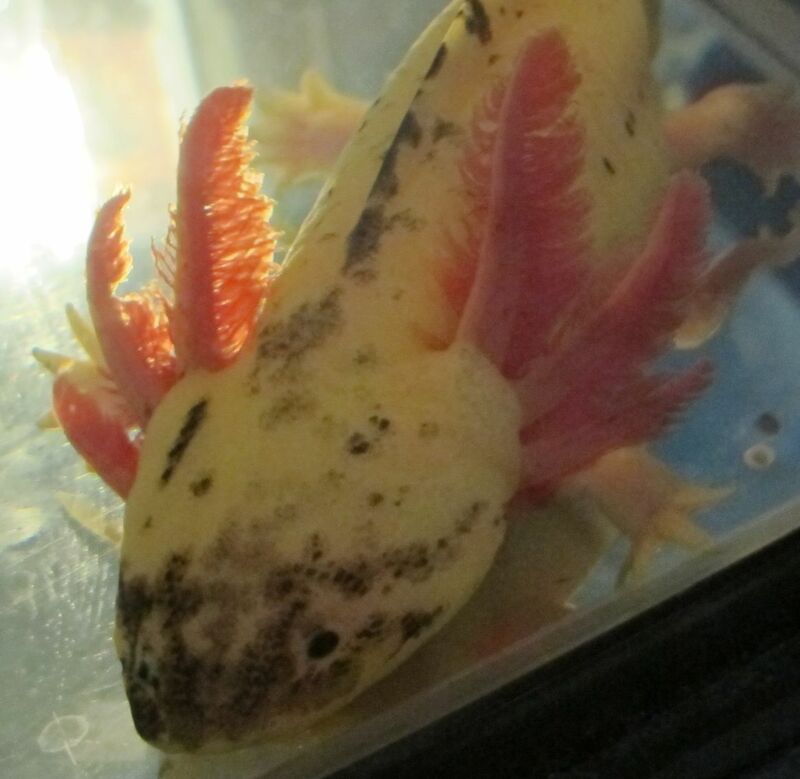 As always, keep it over a dark substrate to maintain the dark markings? Stunning gills from every angle! Here's a really lovely RLG wild type. 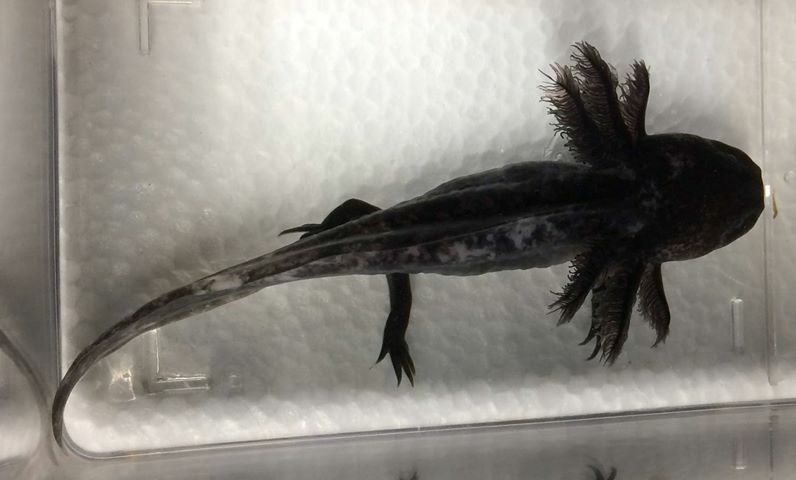 5 inches long, very dark in color. The gills are really outstanding. 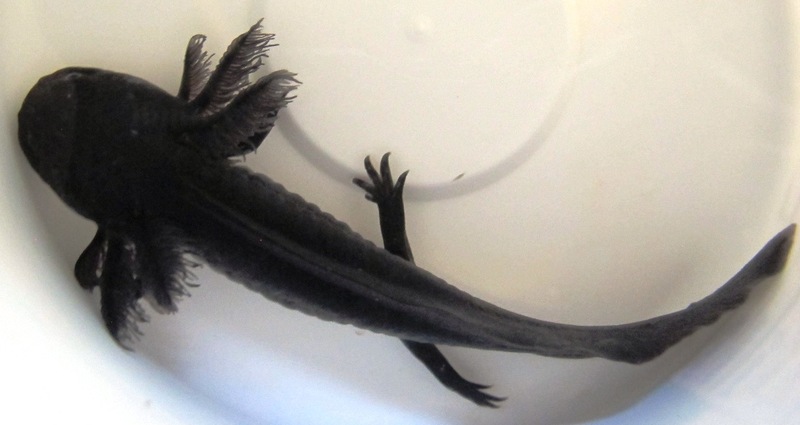 6 inches long, this juvenile has lots of black and extra long gills. Pretty! 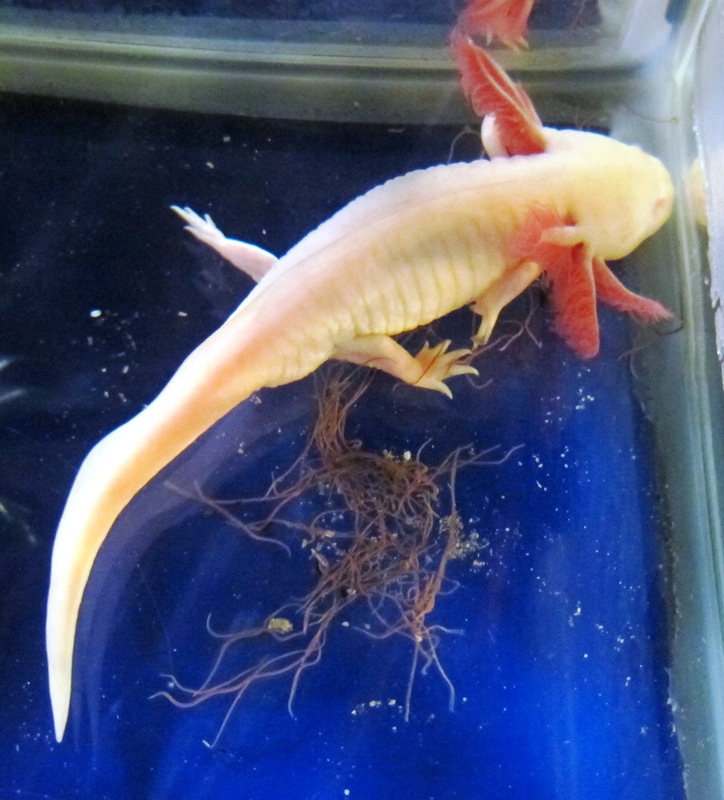 As always, keep it over a dark substrate to maintain the dark markings. 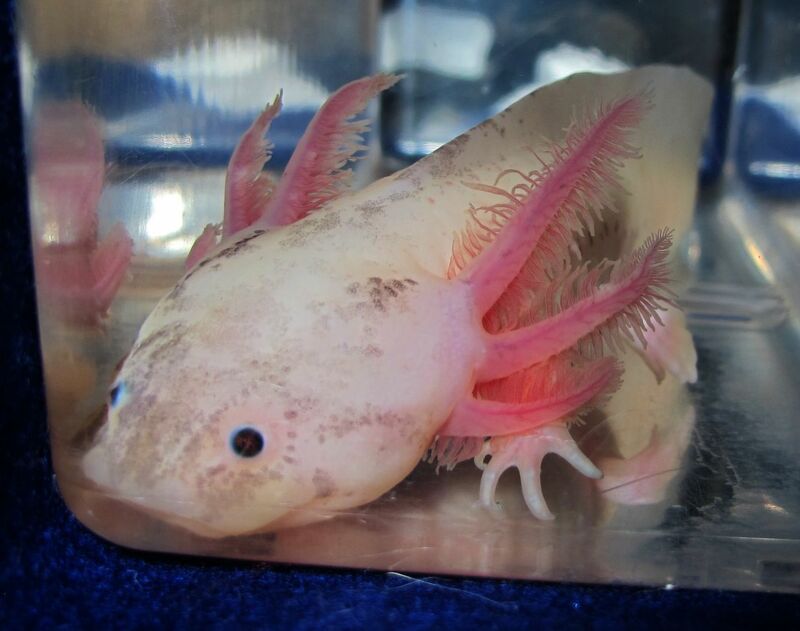 If kept over a light substrate, you can expect the markings to lighten up a lot. 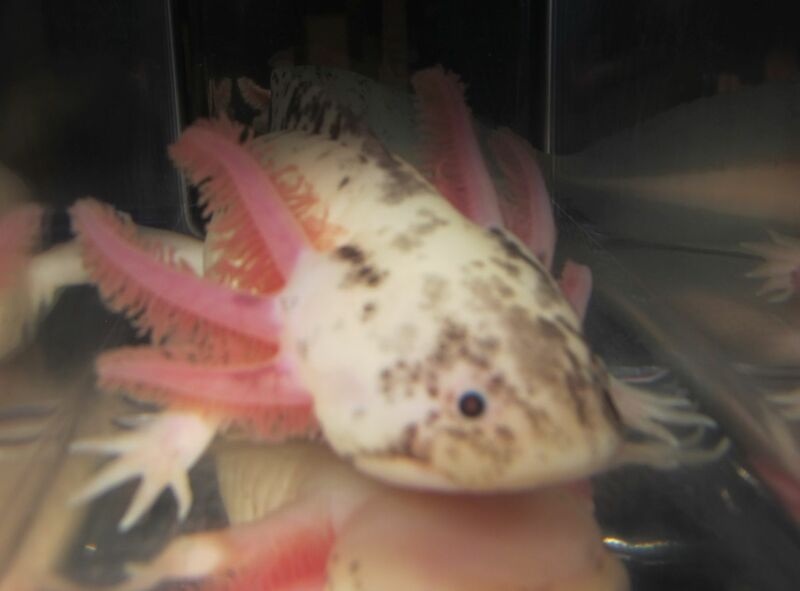 These pictures were taken with this guy housed over a black substrate. We're calling this one "Mud Belly" because he has so much black, it even shows up on his belly. Makes him look like he's been crawling through the mud! 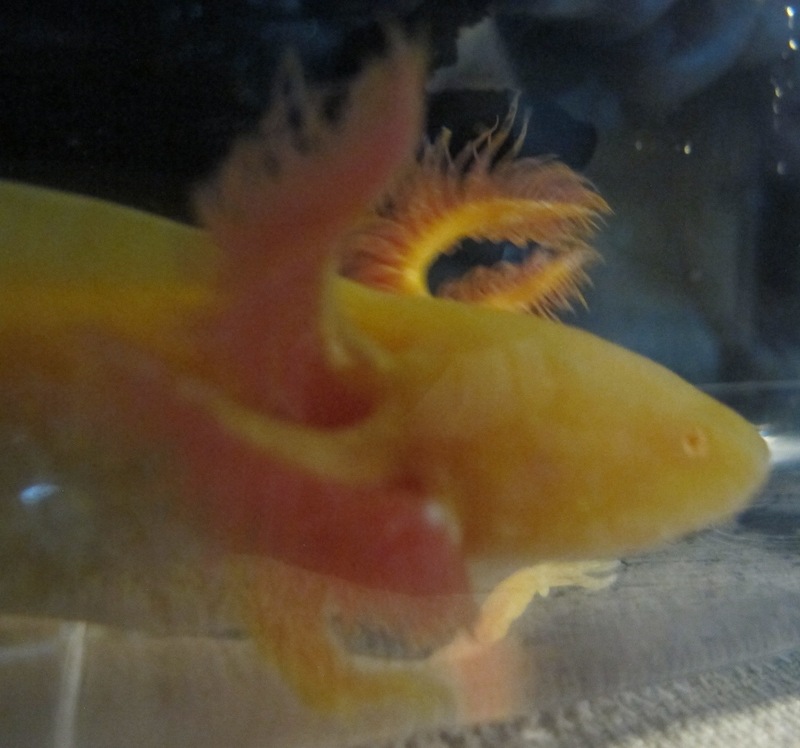 He/she is 6.75 inches long, approximately 7 months old. As always keep over a dark substrate if you want to maintain the dark markings. 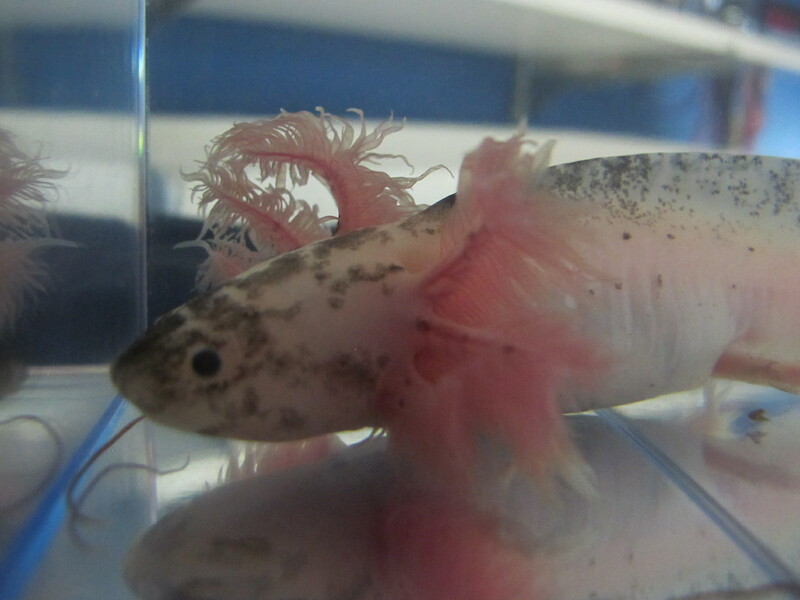 A 6 inch speckled leucistic that's a little more affordable. 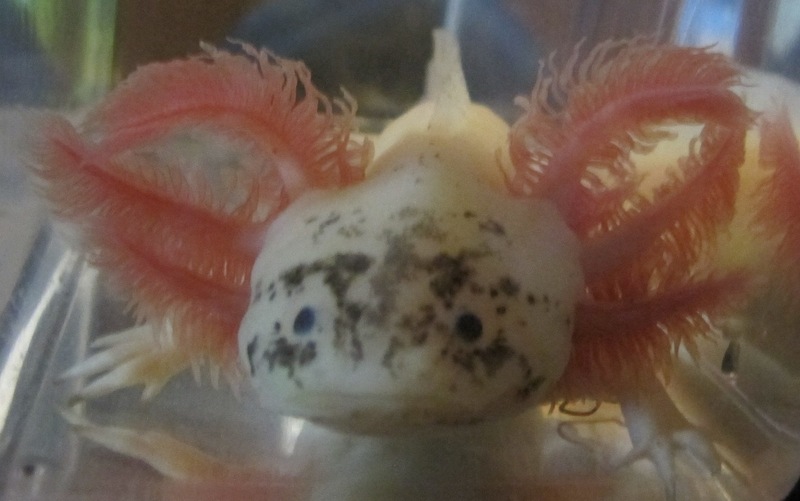 A nicely marked face and super gills. 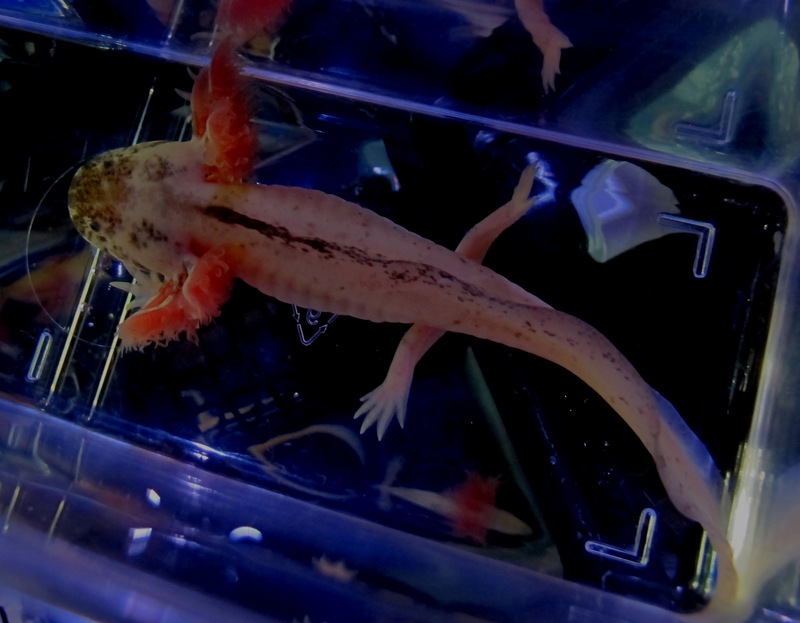 As always, keep it over a dark substrate to maintain the dark markings. This juvenile is 6 inches long. 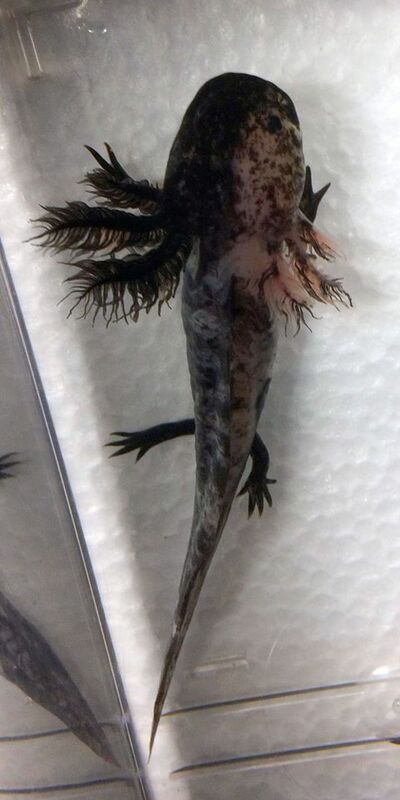 Lots of black on the face, gills, and top. Kind of a goth look! 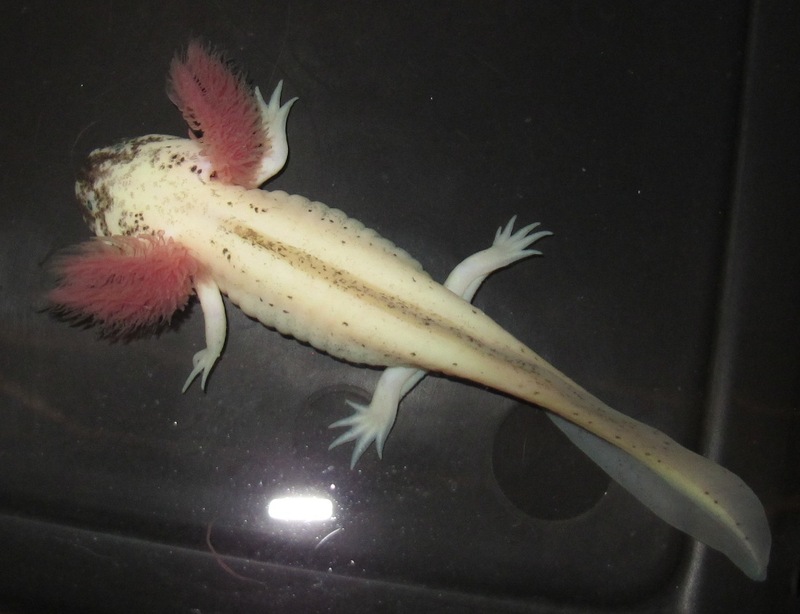 As always, if you keep this axolotl over a light substrate, the black will lighten up quite a bit. 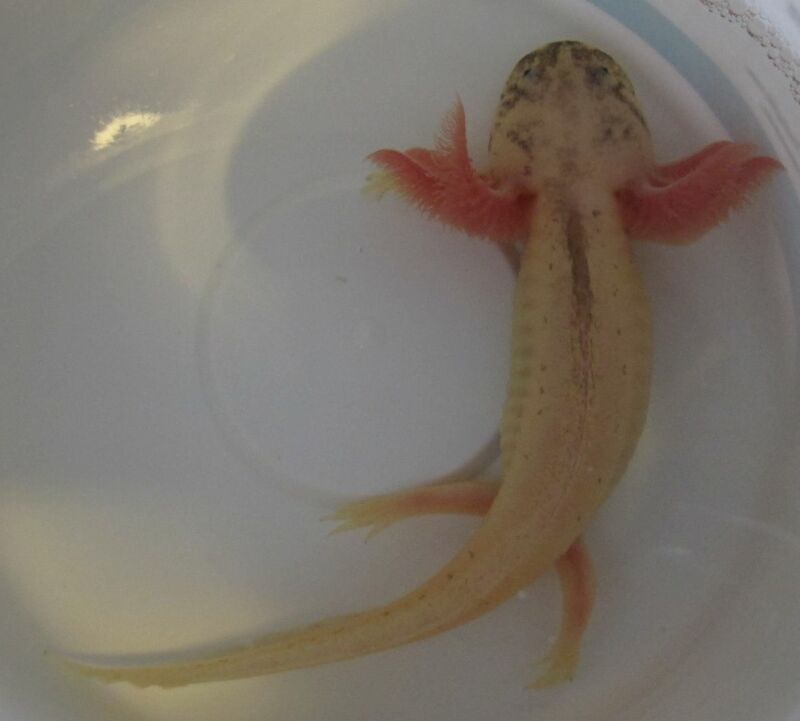 These pictures were taken with this guy housed over a black substrate. They say nice things come in small packages. 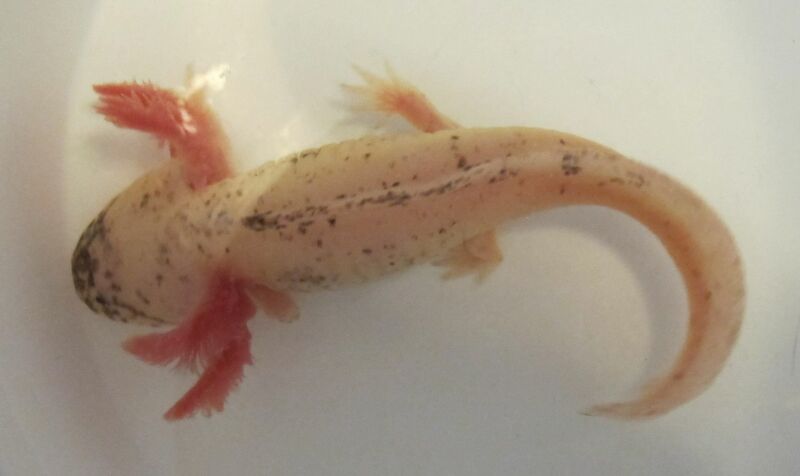 Here's a 4-inch RLG white albino. 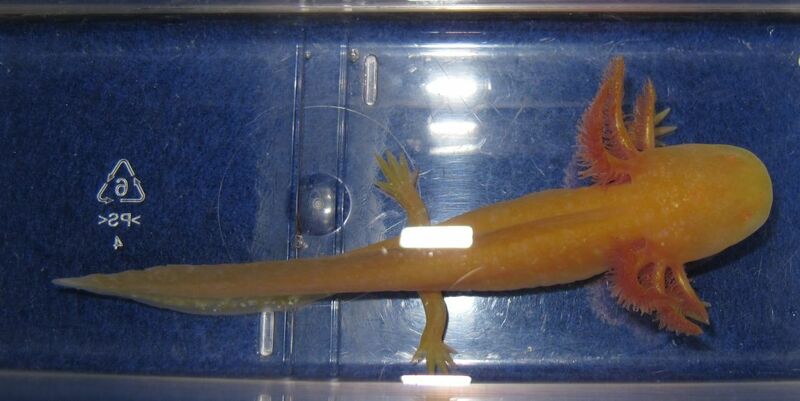 RLG = Ridiculously Long Gills. That's a lot of pretty packed into a little package! This 7-inch copper is not only beautiful, but he or she has a special feature. 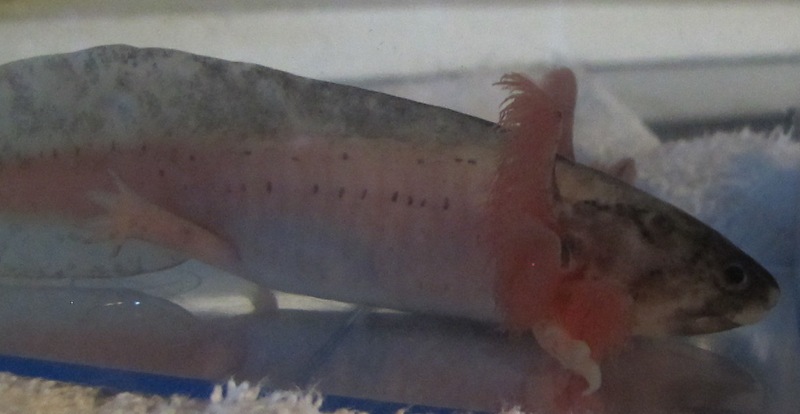 Namely, a "forked" gill (see picture). Not everyone's cup of tea, but we think it gives him/her extra character. 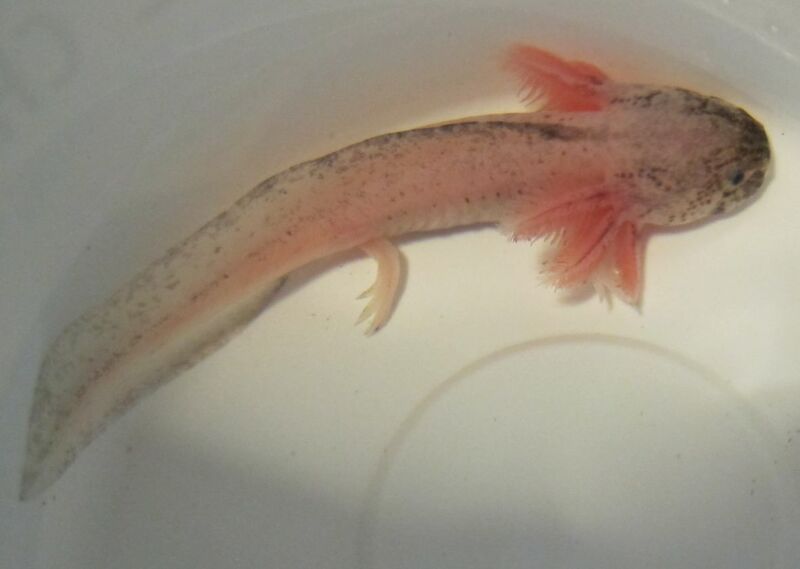 This 5-inch juvenile has a nice combination of facial markings and long gills. With black markings down the spine as well, it's nice all around. 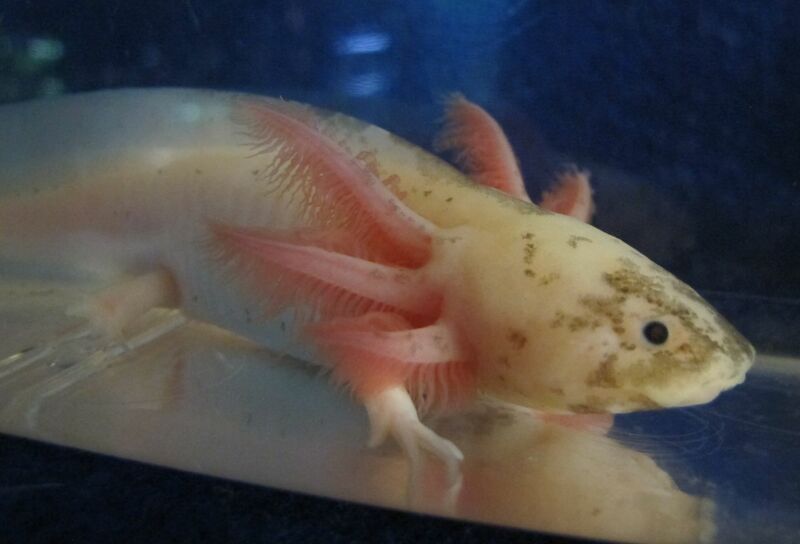 As always, keeping this type of axolotl over a light substrate will cause its markings to lighten up. 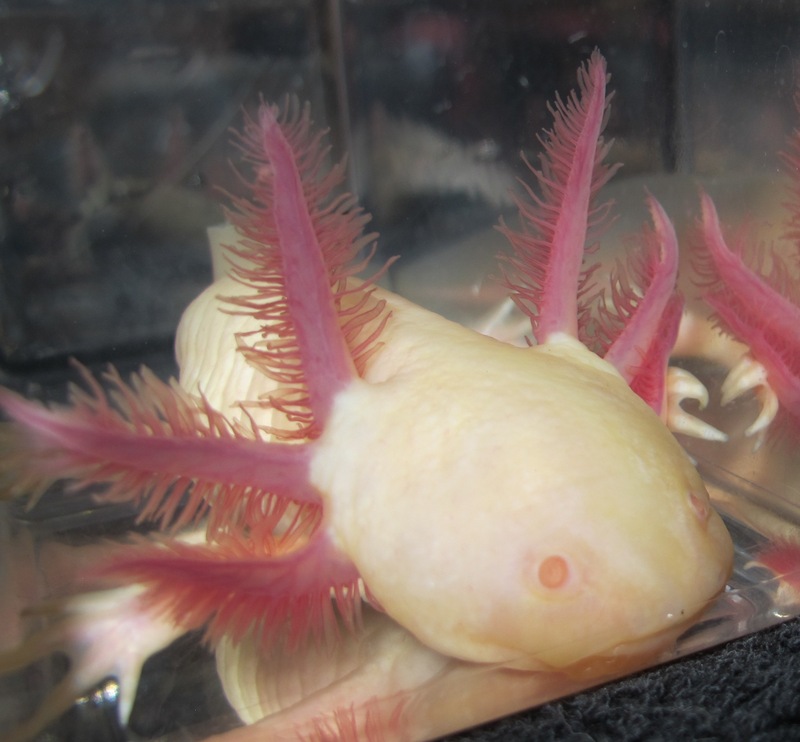 These pictures were taken with the axolotl housed over a black substrate. This 5 inch cutie is doing his best to tempt you! A nice dark face and some dark on the spine is hard to resist. 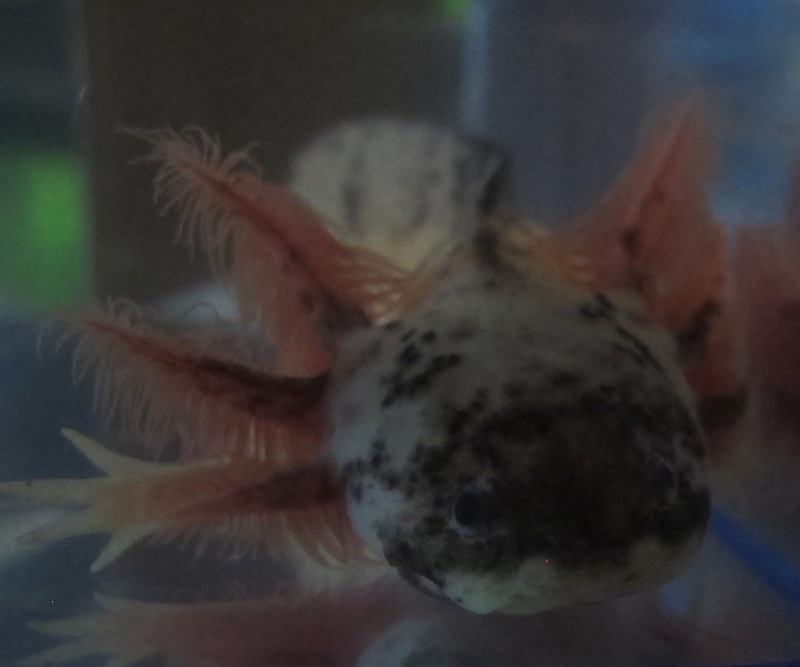 As always, keeping him over a light substrate will cause his markings to lighten up. 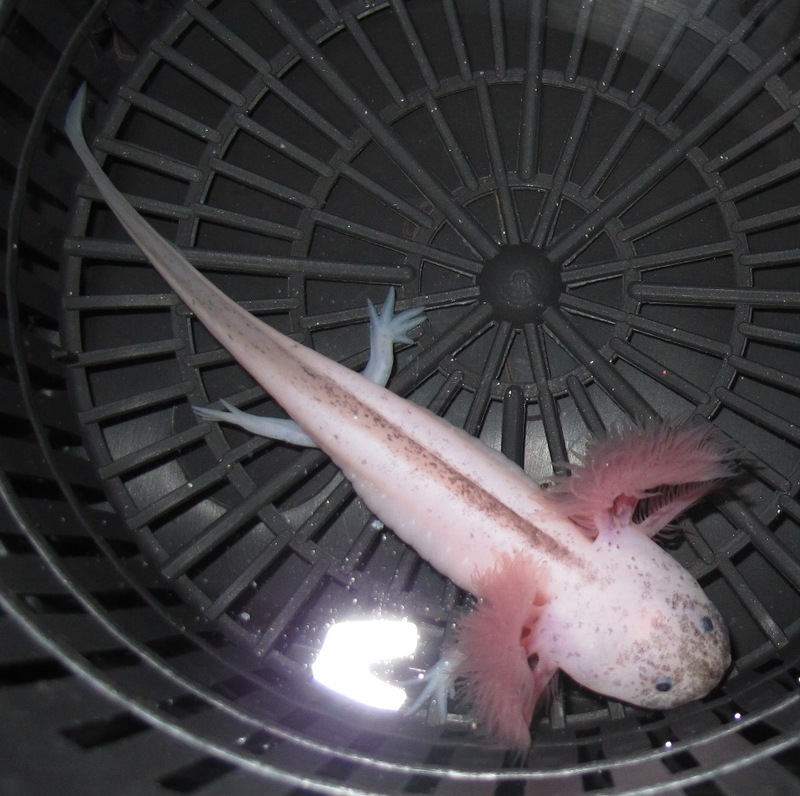 These pictures were taken with this axolotl housed over a black substrate. A nicely-marked face and spine make this lovely juvenile stand out from the rest. 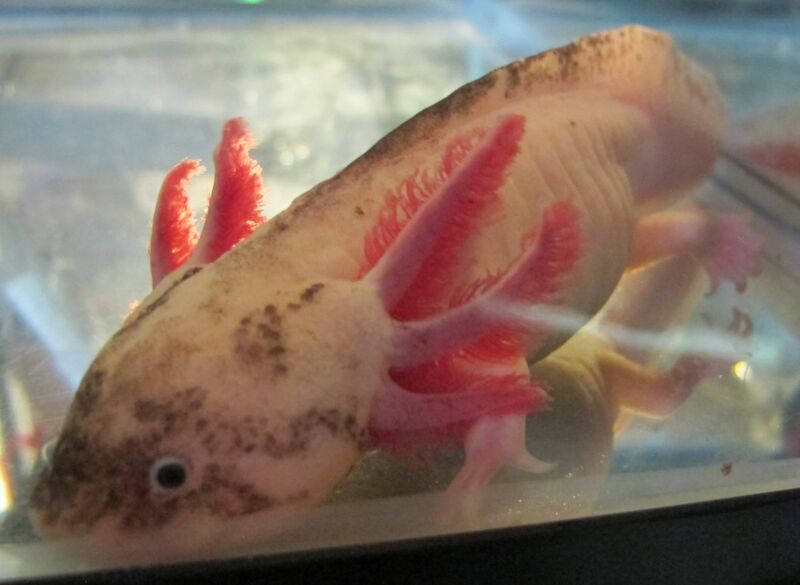 Approximately 6 months old, 5-6 inches long. 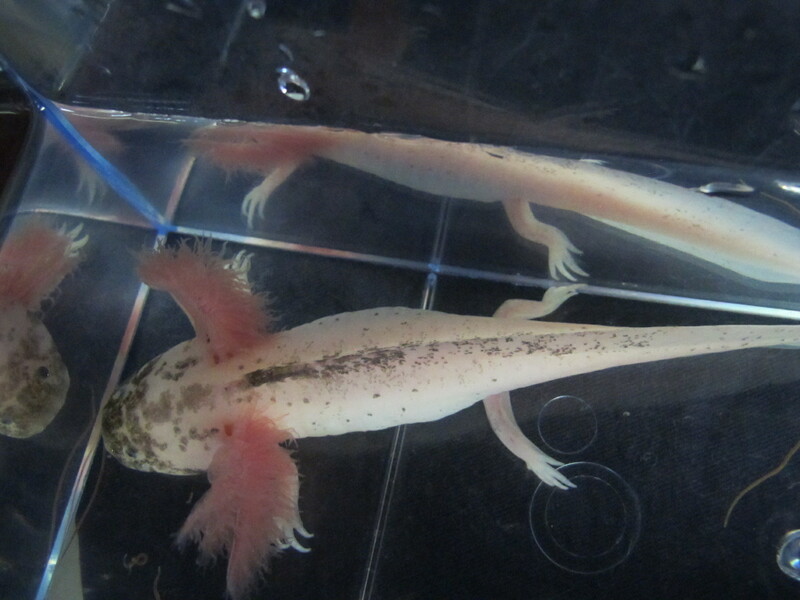 As always, the dark markings will be more pronounced if the axolotl is kept over a dark substrate, and they'll be less pronounced if kept over a light substrate. 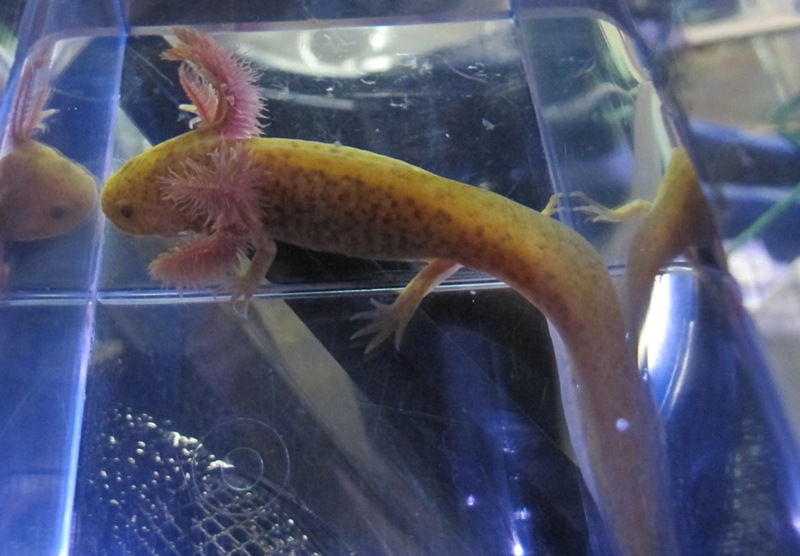 These pictures were taken with the axolotl housed over a black substrate. 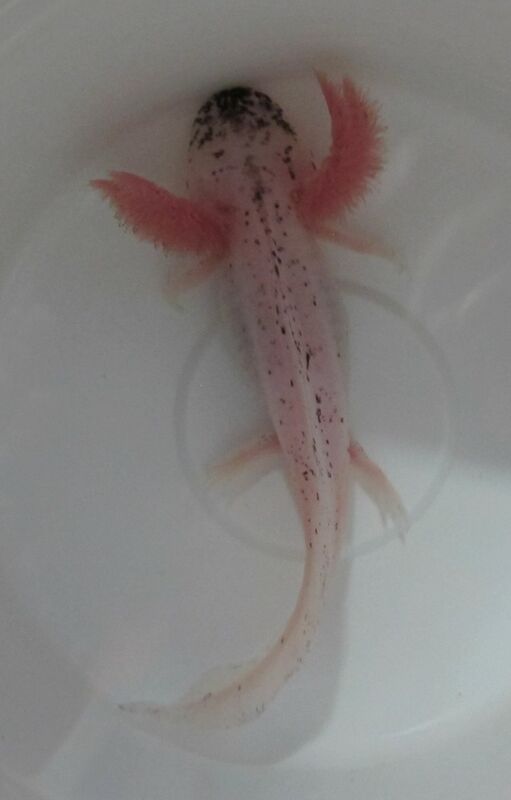 This 5-6 inch leucistic has a great face and looks even better in person than in the pictures. 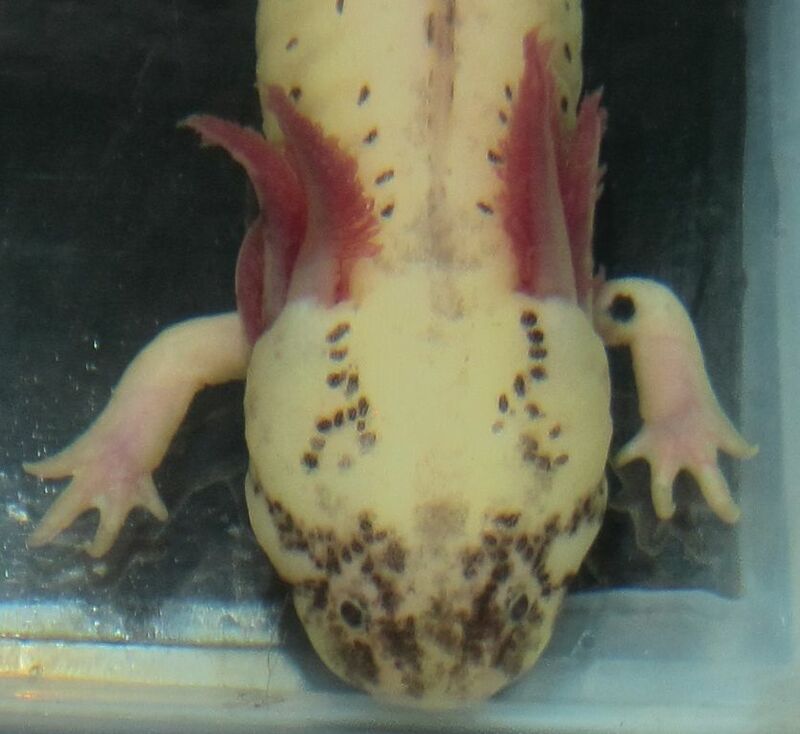 Please keep it over a dark substrate if you want to retain the dark markings. As always, the speckling is more pronounced when kept over a dark substrate and less pronounced when kept over a light substrate. This one has been developing more speckling as it grows, so it might have some great potential. 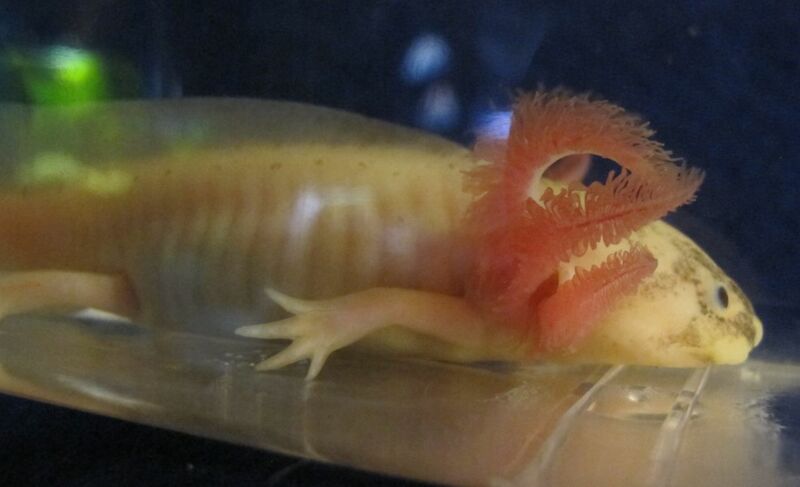 In any case, the gills are already fabulous! 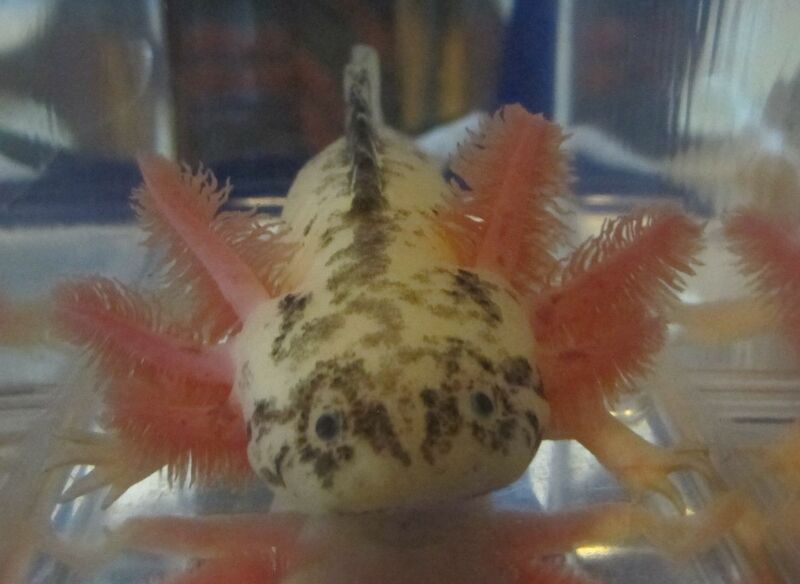 Here's a charming 6.5 inch lightly speckled leucistic. A pretty combination of red gills and white body with a lightly marked face. 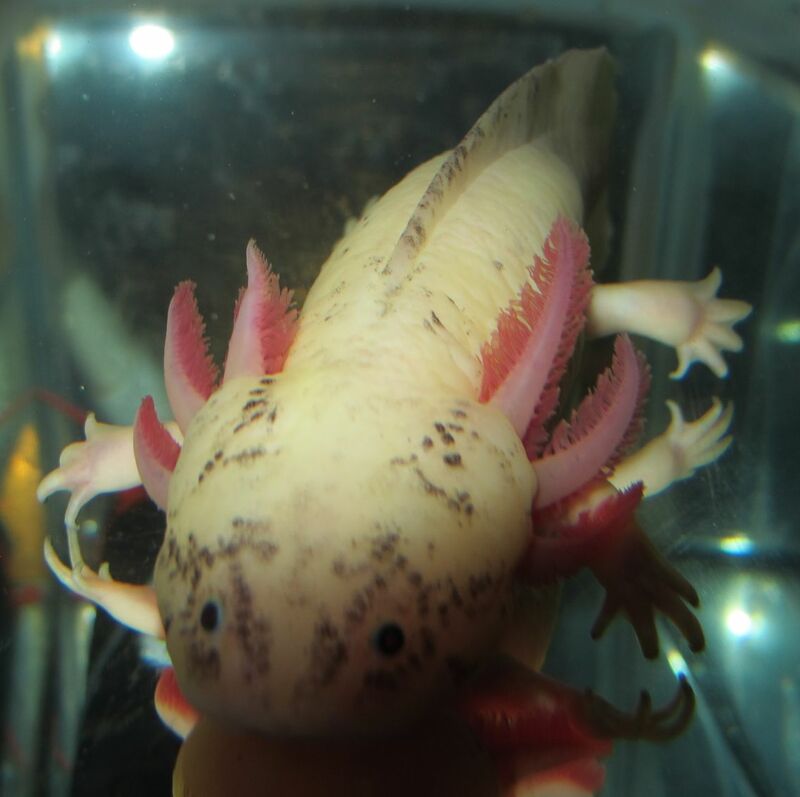 As usual, these markings will be more pronounced when the axolotl is kept over a dark substrate and much less pronounced when kept over a light substrate. Profile above. Closeup of spots to the right. 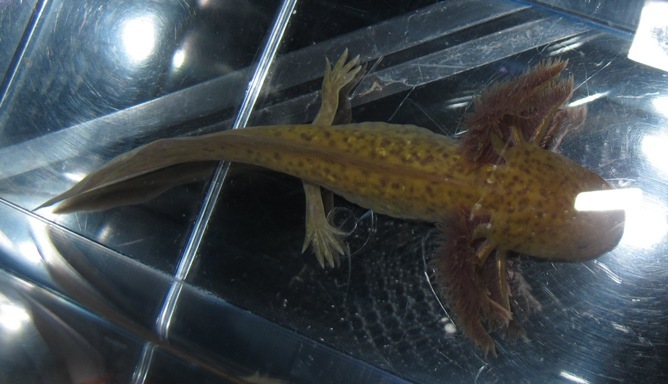 This juvenile is just over 5 inches long. He caught my eye when he was small because of all the markings on his face and sides. 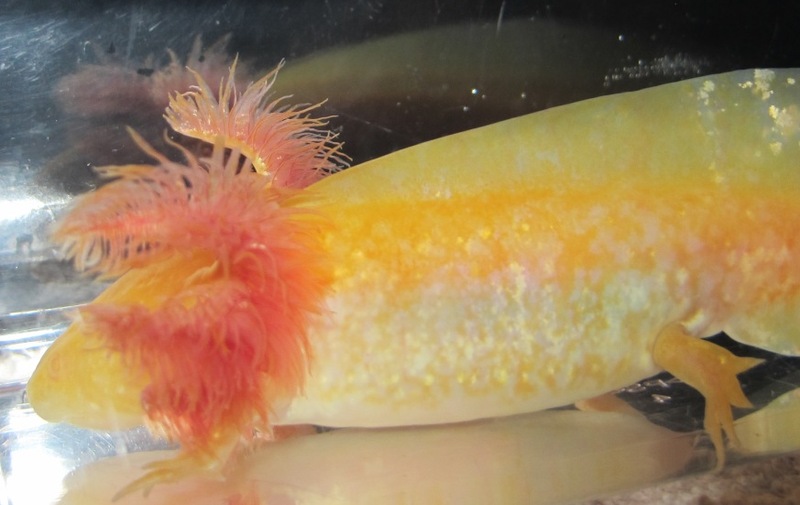 When checked with a magnifier, I can't see a shiny eye ring or any iridophores on his body, so I'm guessing it's a melanoid (no guarantee on that). 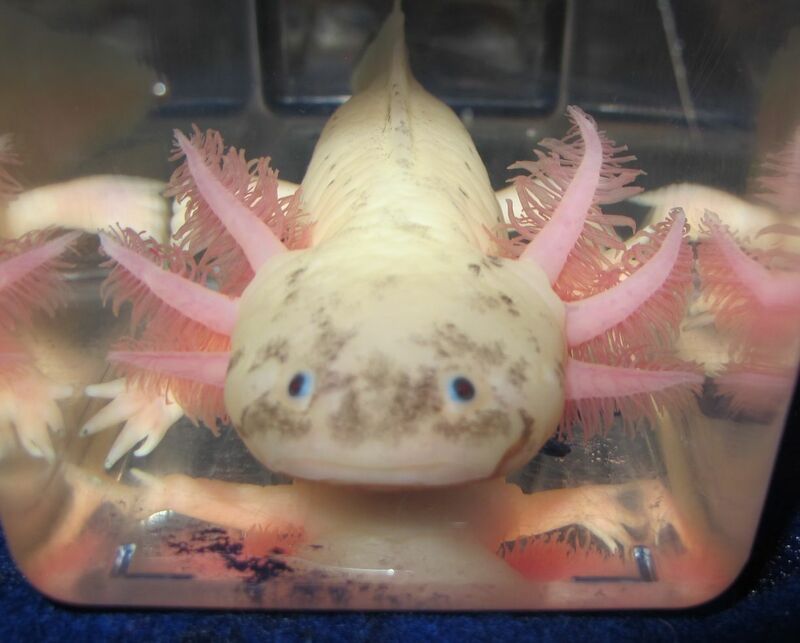 Because of his markings, he's been housed over a white substrate to cause him to lighten up. 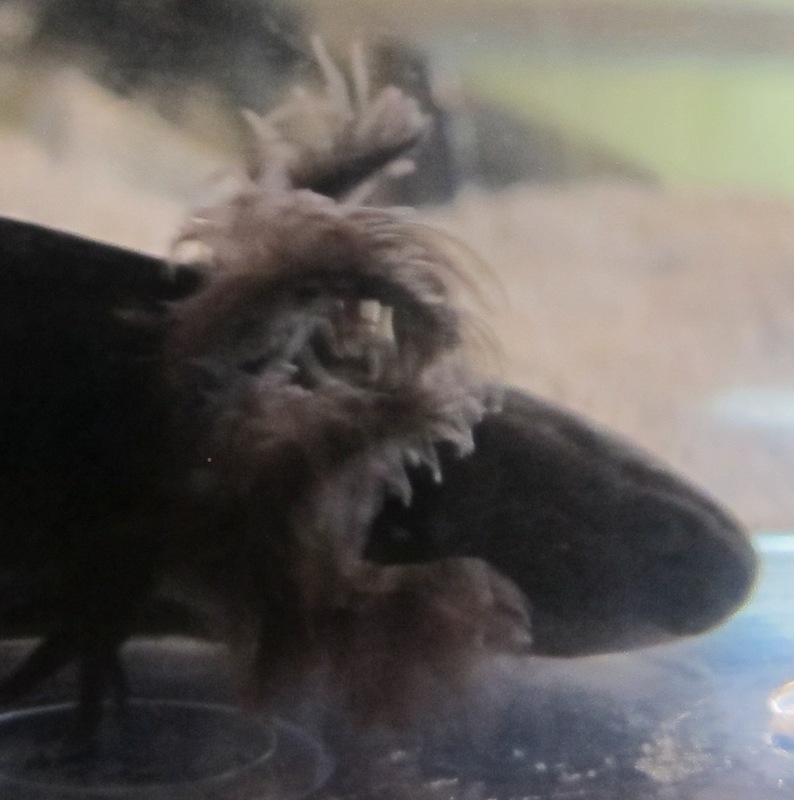 If he were housed over a black substrate, he would probably be rather dark. Under blue LED lighting he has a purplish look to him. Under normal fluorescent shop lighting he looks more grayish. I refer to him as "he" but he's really too young to tell gender. 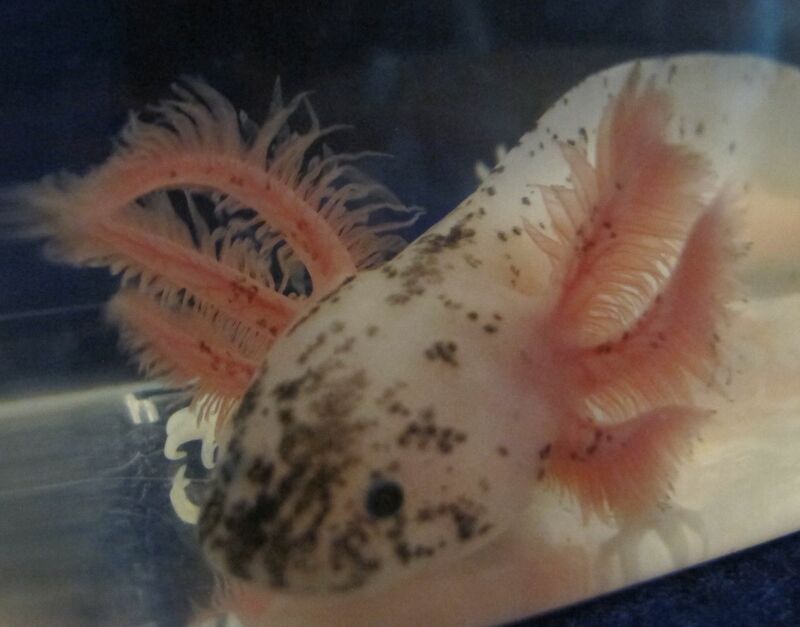 He's very interesting and I'm curious what he'll look like as he continues to grow. This RLG golden copper is a little under 6". 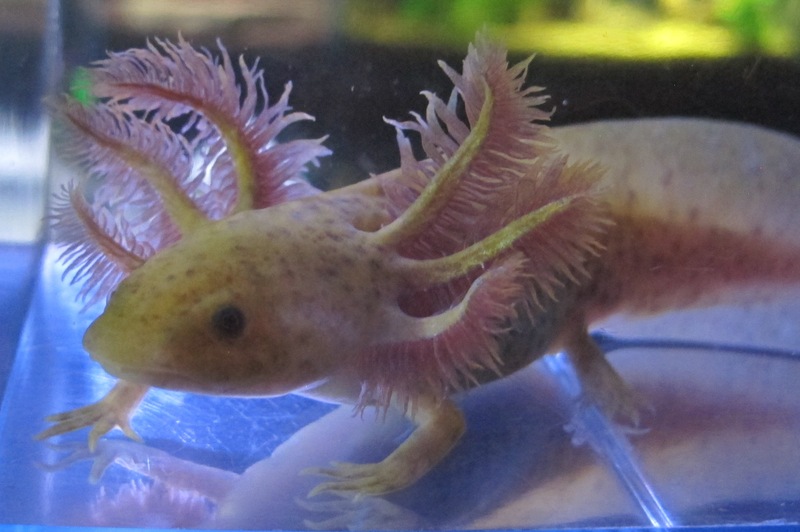 RLG is our term for axolotls that have Ridiculously Long Gills. 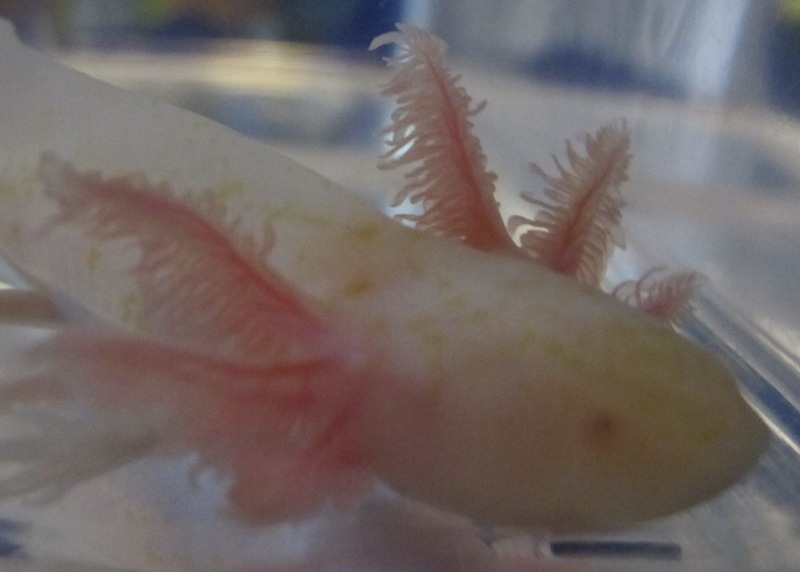 All pictures are of the same axolotl and this is the exact one that will ship with this offer. Truly a gorgeous animal! 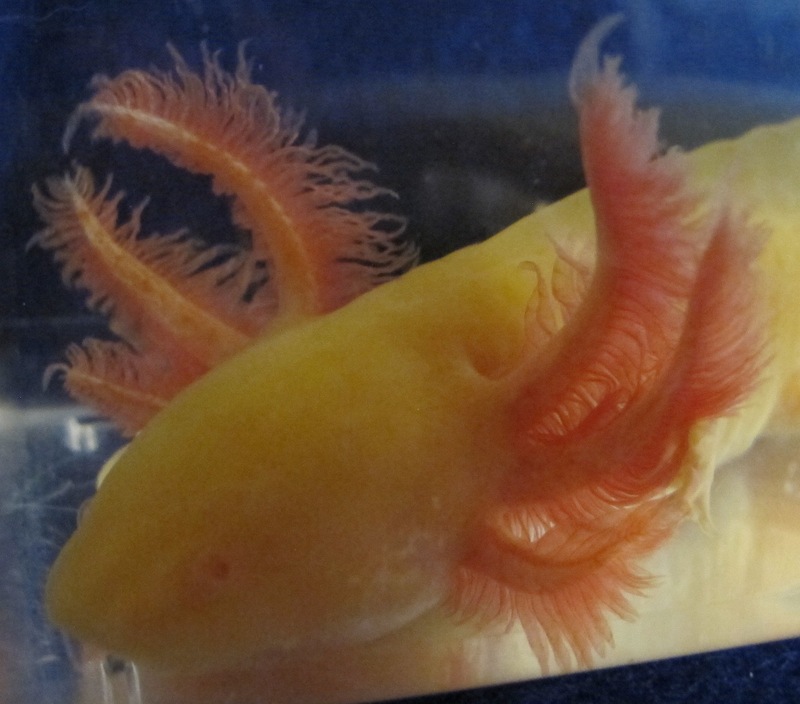 This golden albino has extra iridophores (the shiny white patches that occur on all axolotls except melanoids). 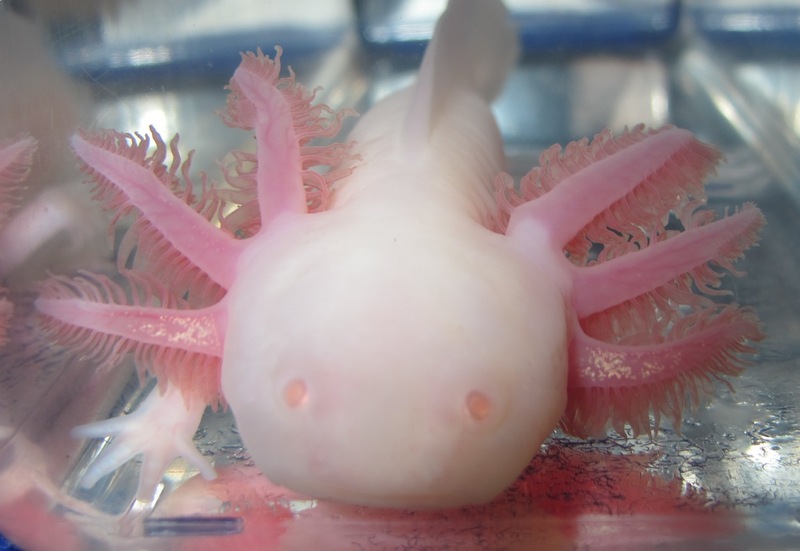 What's extra special is that the iridophores cover the gill stalks almost completely - making them look white and shiny. 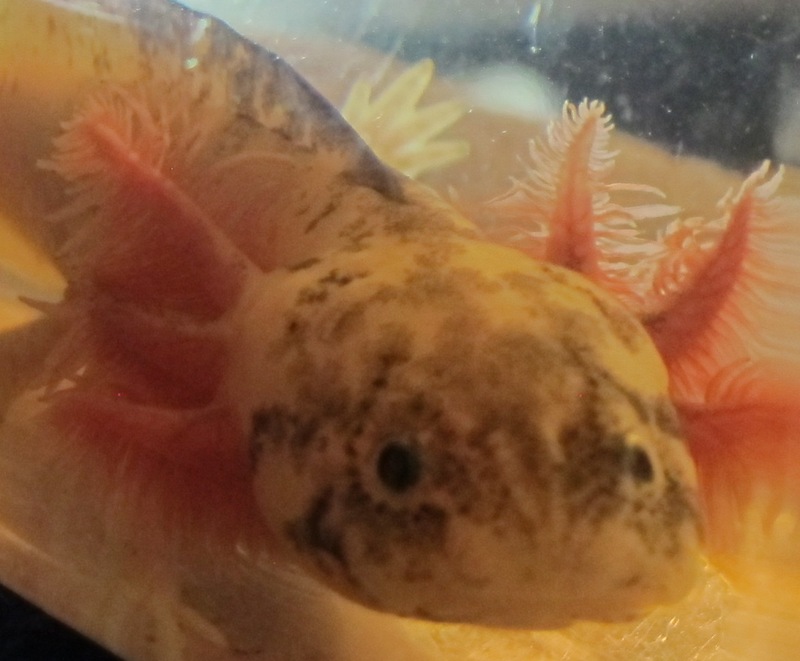 This beauty is approximately 6 inches long. 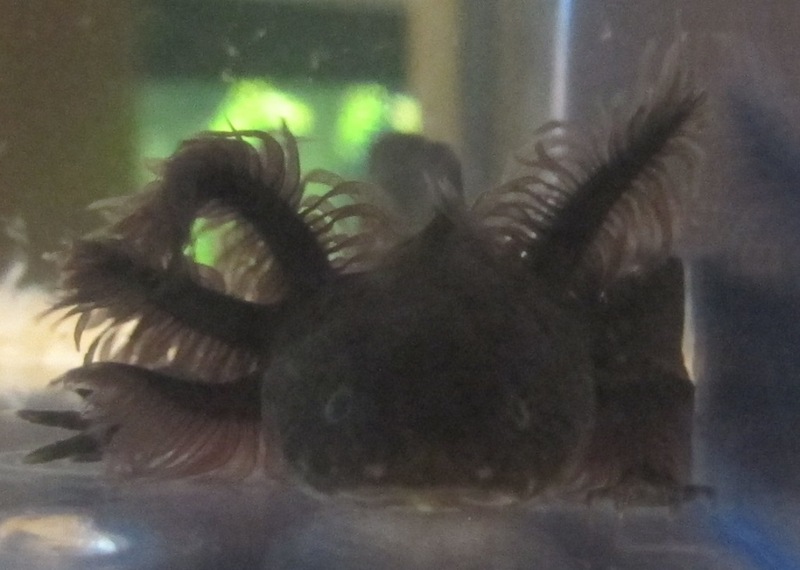 Those black markings almost look like horns! This is under fluorescent overhead lighting. 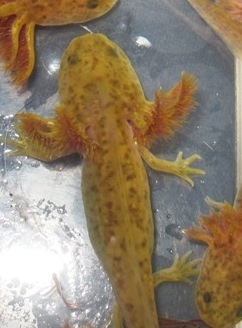 This juvenile is approximately 6 inches long. A little over 6 months old. 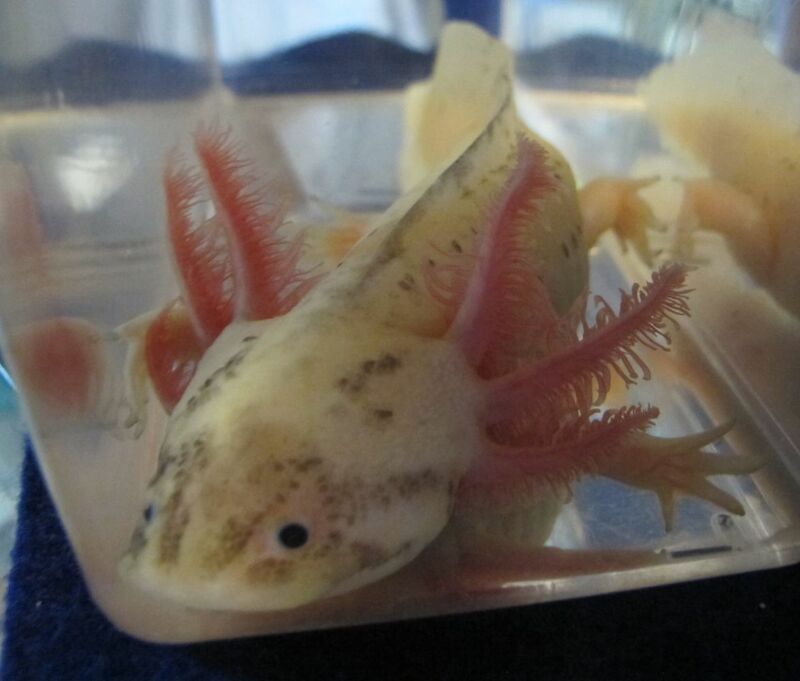 This is the exact axolotl that will ship for this offer. 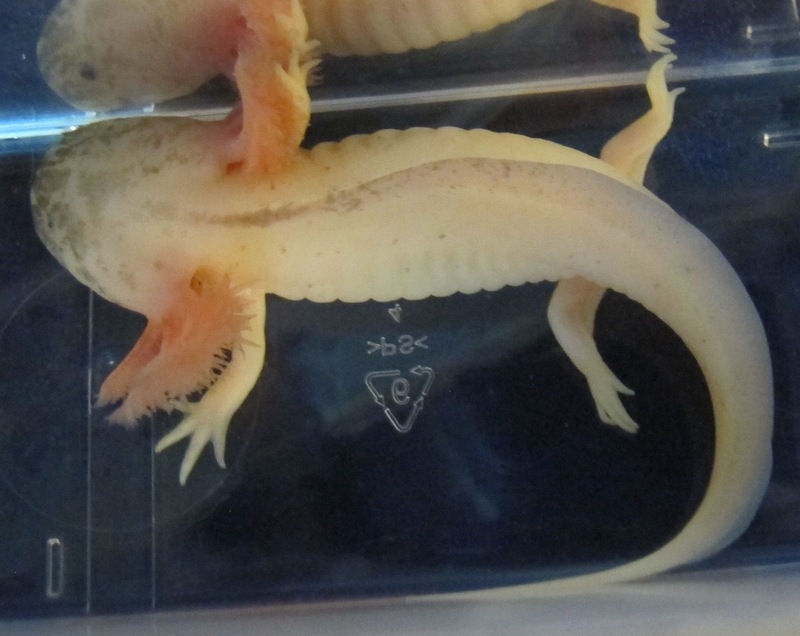 Please be aware that the dark markings will be more pronounced if you keep it over a dark substrate. The markings will be less pronounced if you keep it over a light substrate. The pictures shown were taken with the axolotl housed over a black substrate. 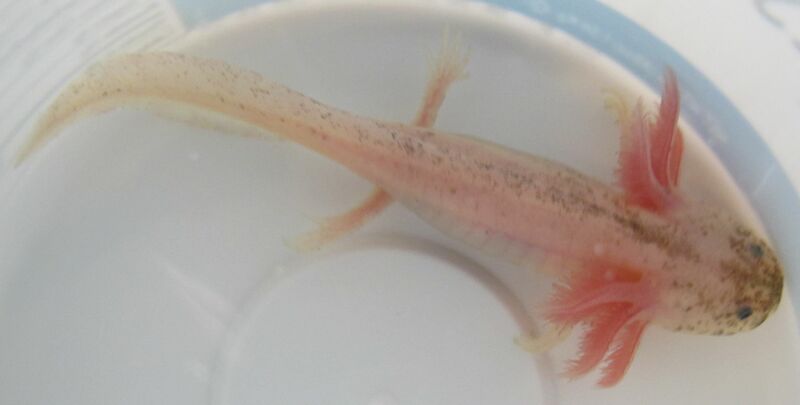 We have a limited number of light-colored copper juveniles available now. While quantities last.